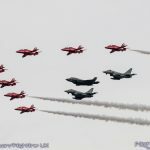 The 2016 edition of The Royal International Air Tattoo proved to be one of the most significant of recent years. 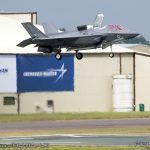 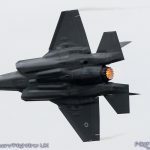 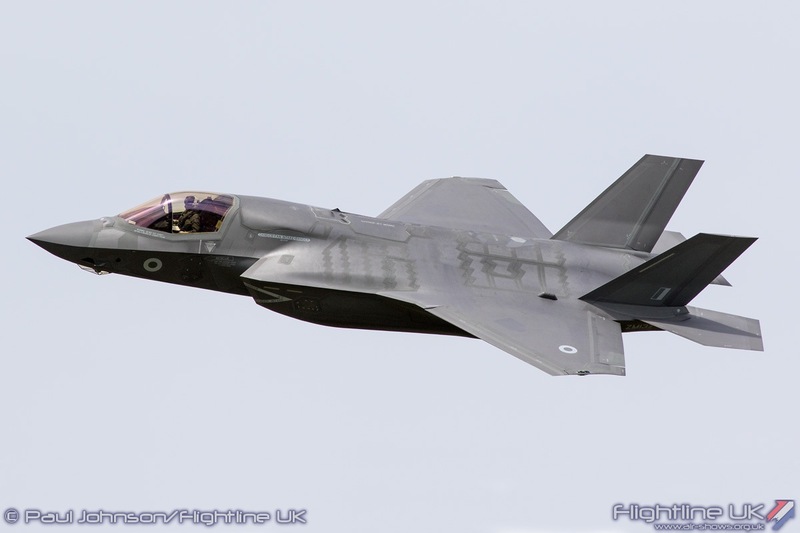 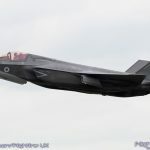 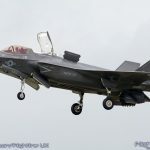 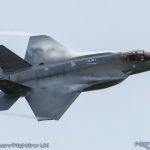 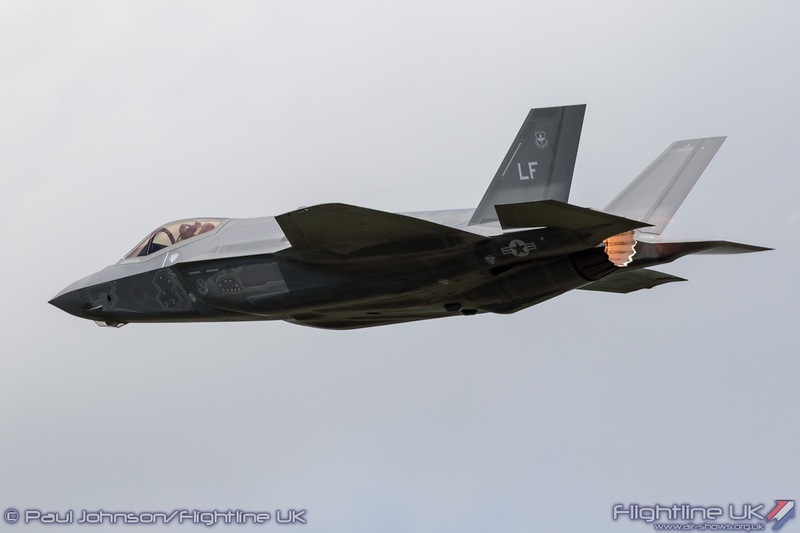 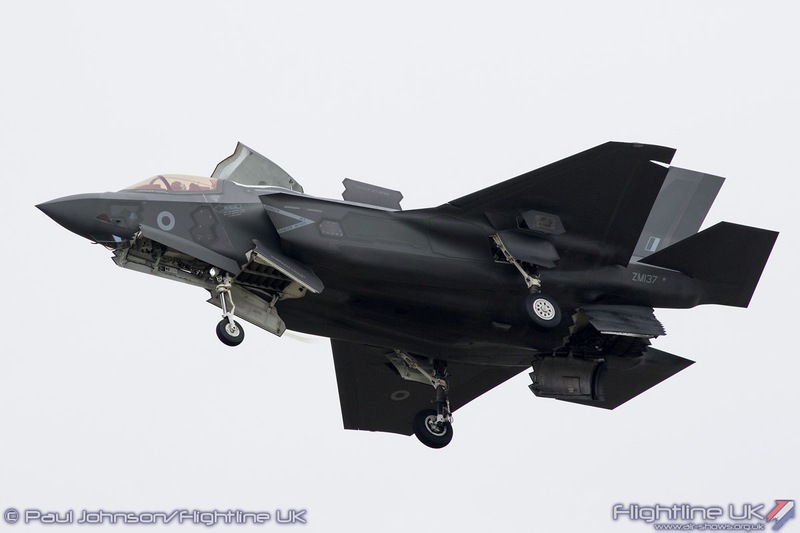 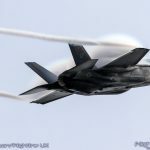 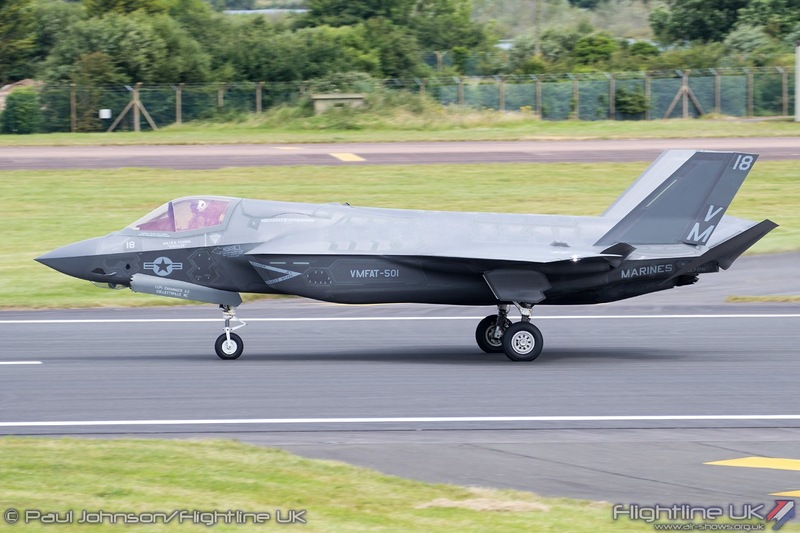 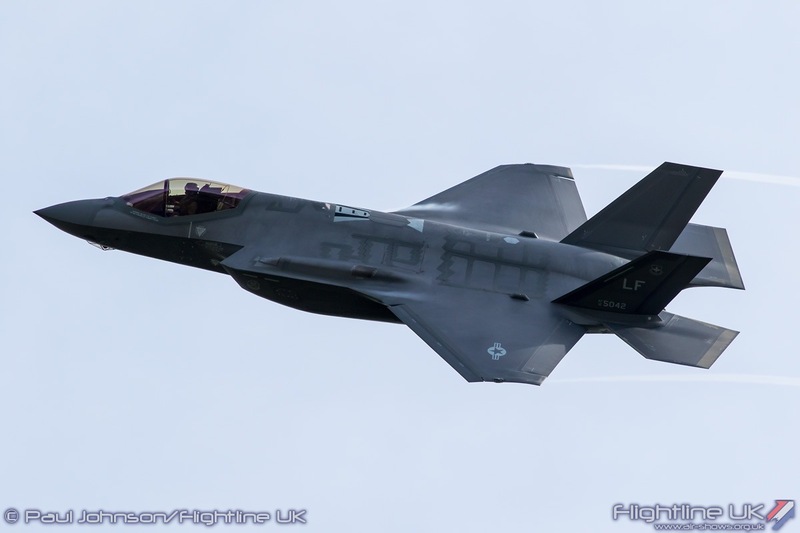 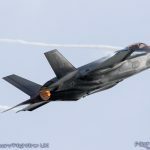 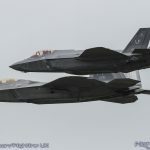 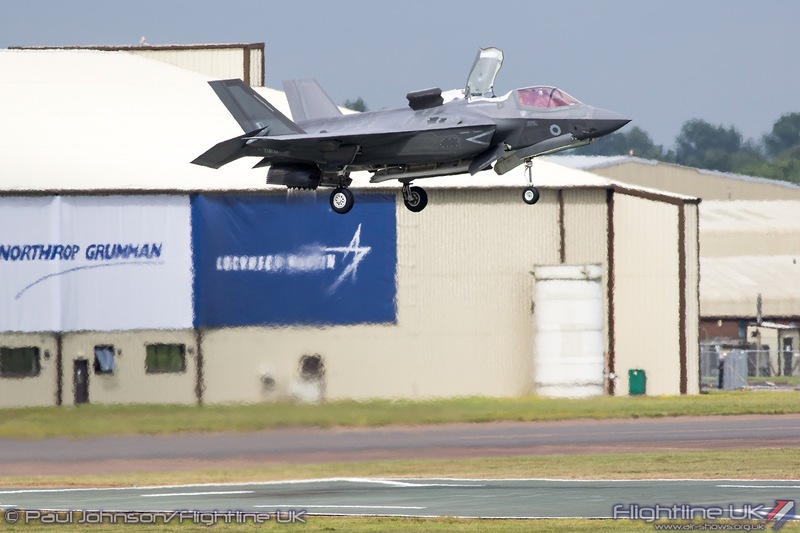 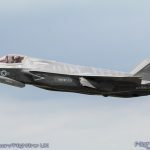 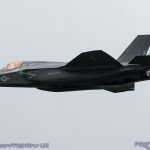 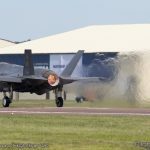 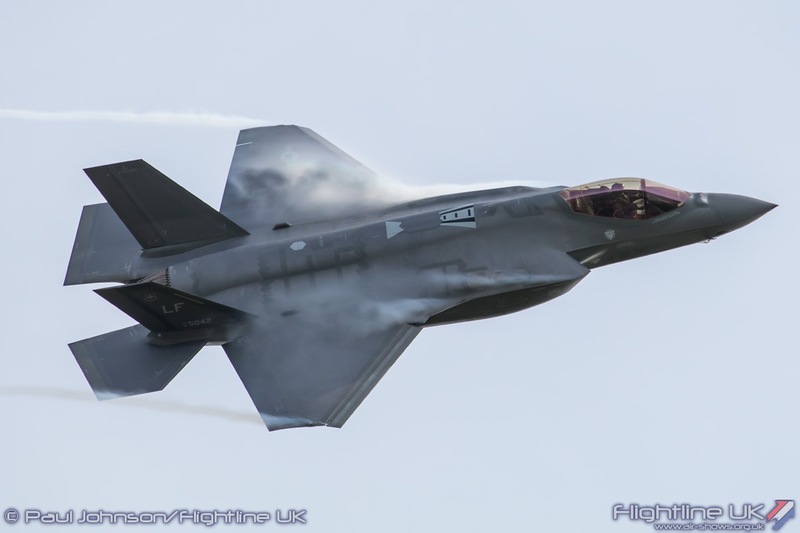 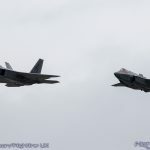 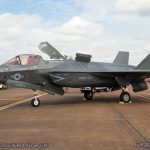 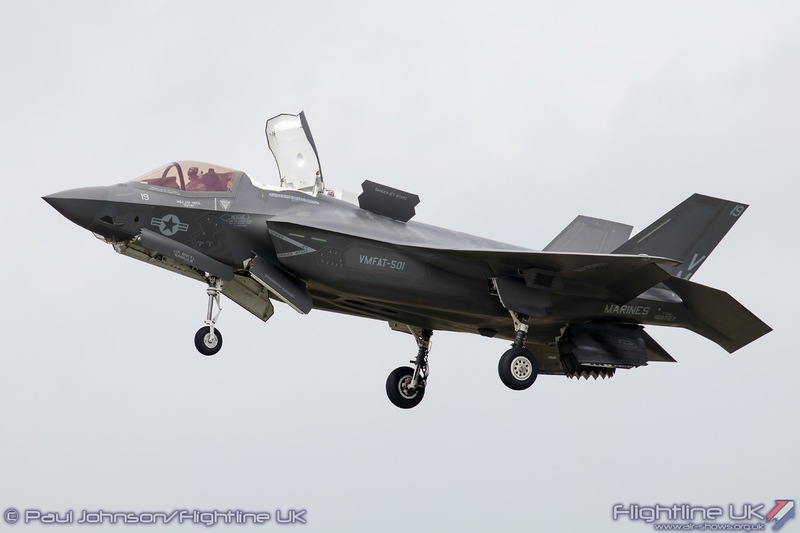 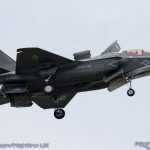 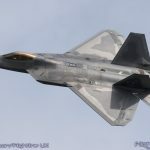 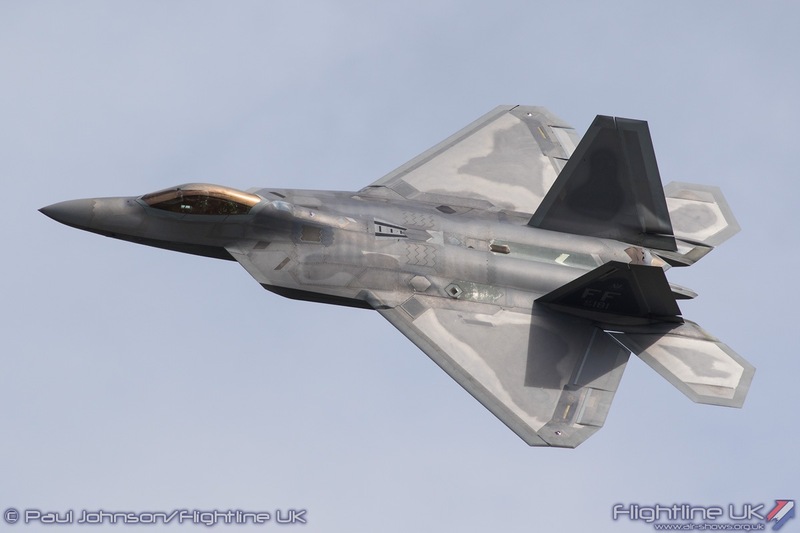 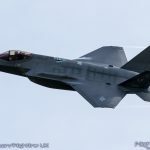 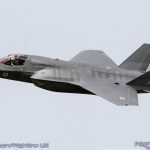 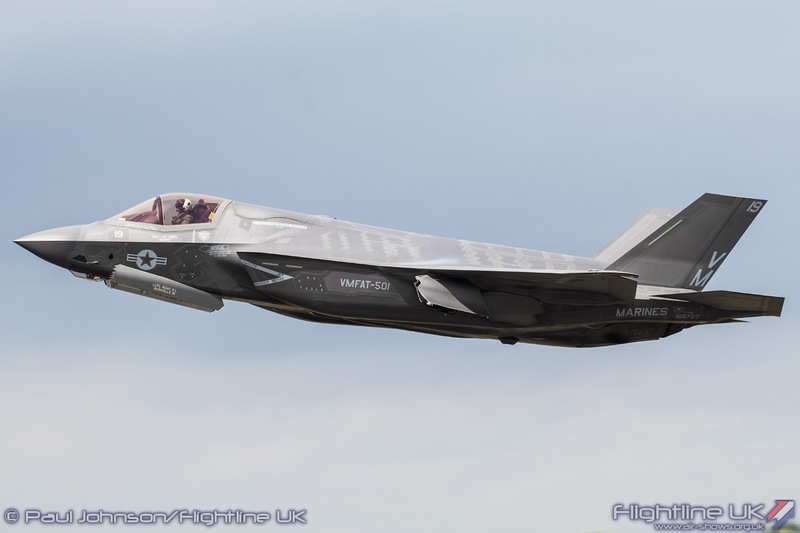 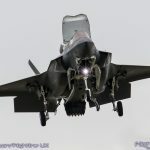 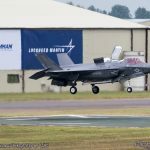 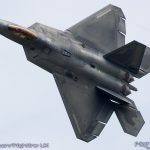 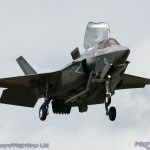 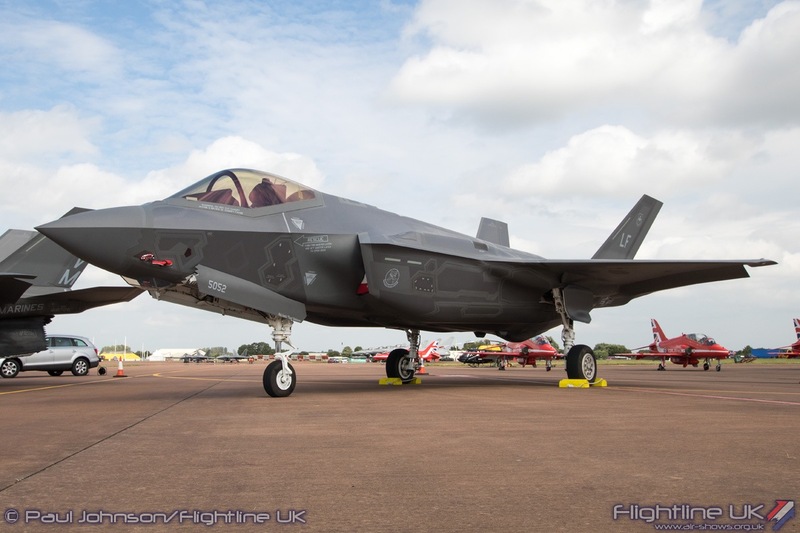 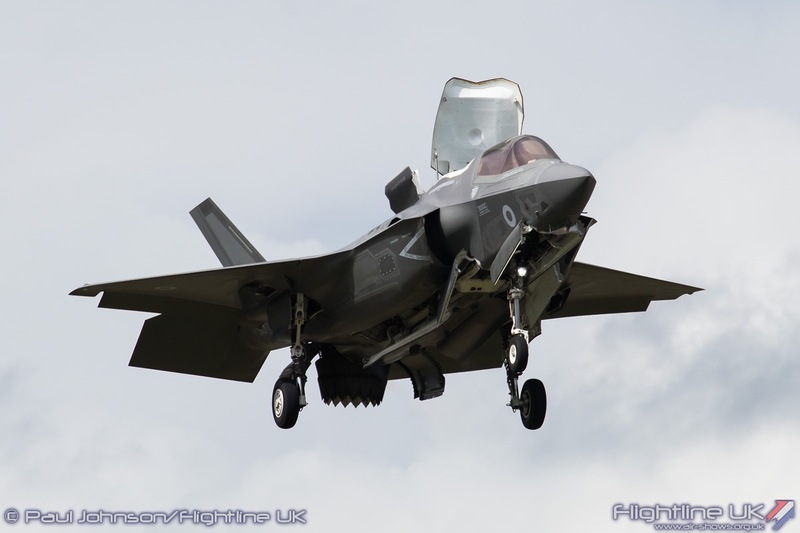 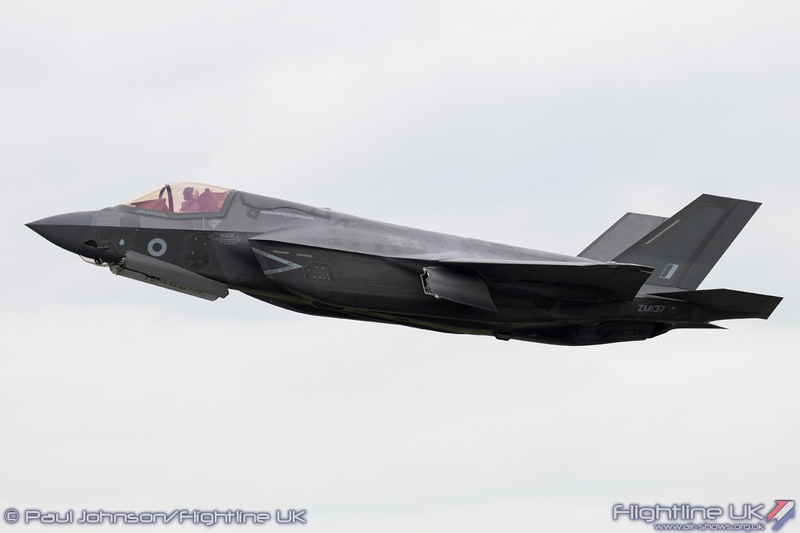 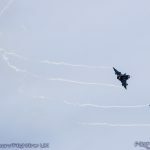 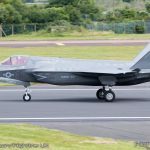 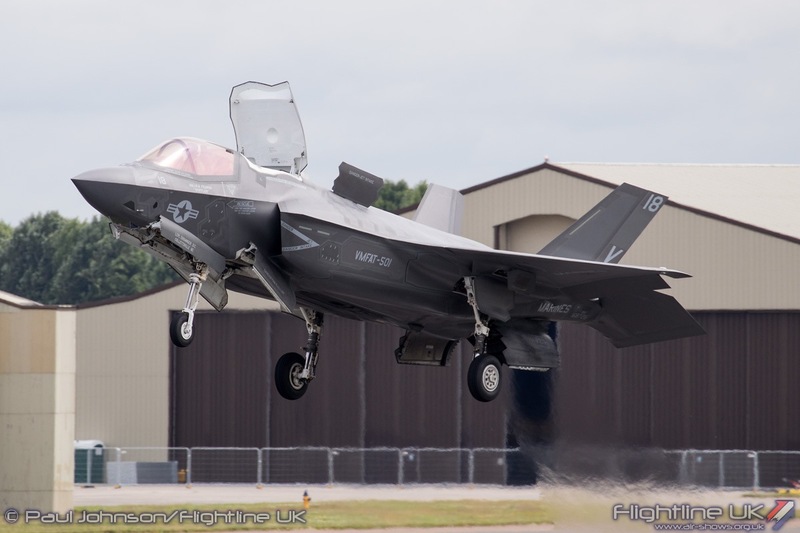 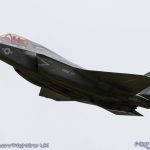 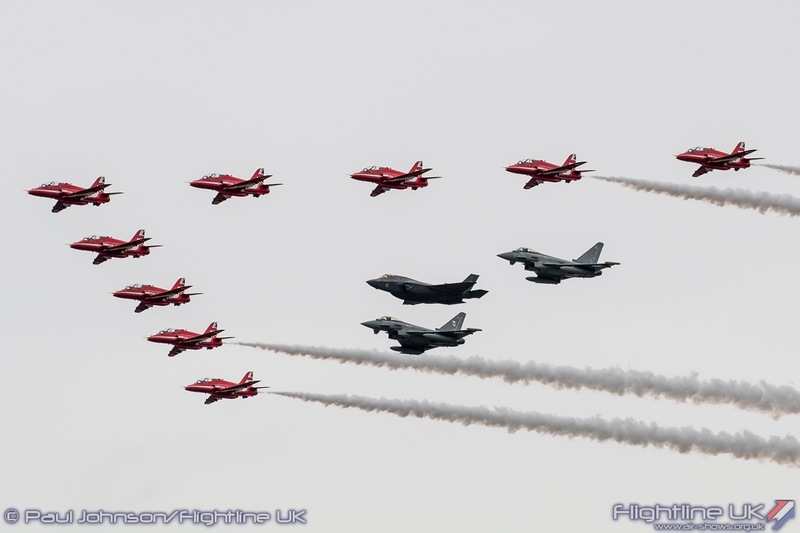 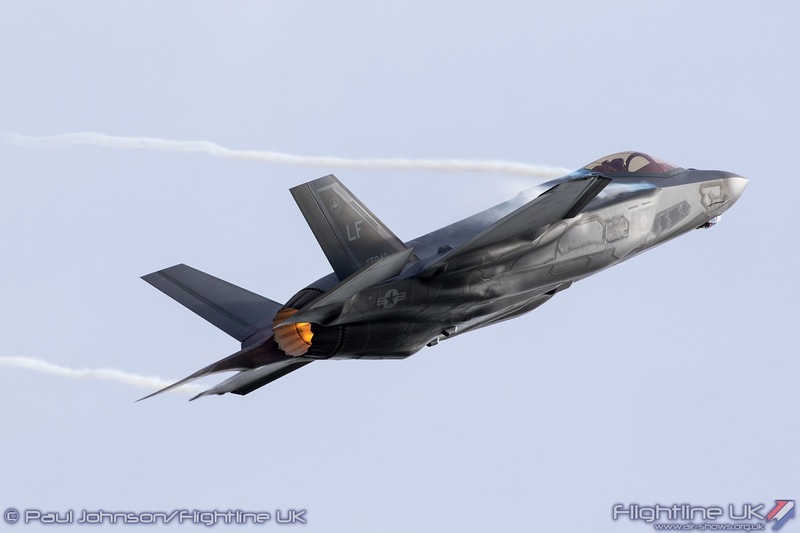 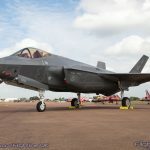 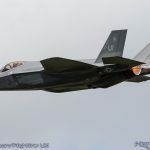 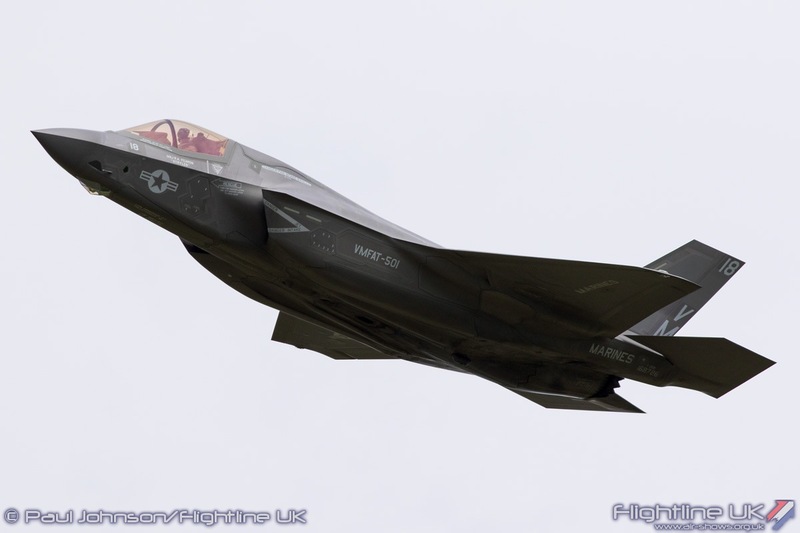 Held under the banner of the theme “The Next Generation,” the Air Tattoo welcomed the UK air display debut of the Lockheed Martin F-35 Lightning II with examples from the Royal Air Force, United States Marine Corps and United States Air Force in attendance. 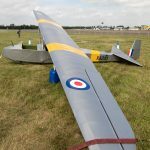 The theme also lent itself well to marking the 75th Anniversary of the Air Cadet who always provide much of the volunteer workforce that makes the event such a success each year. 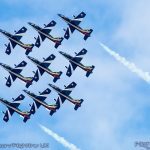 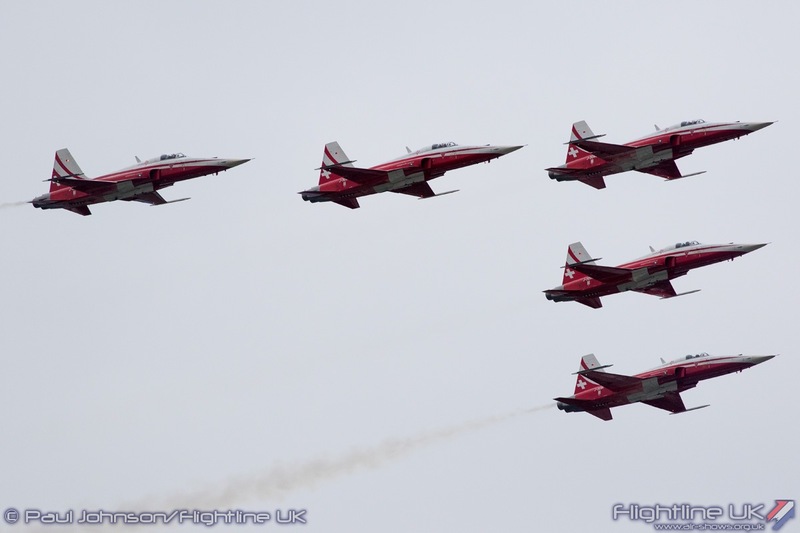 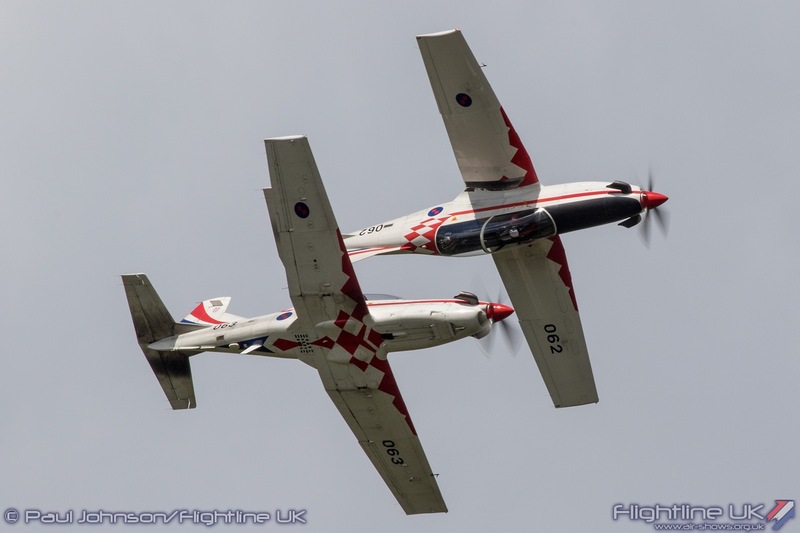 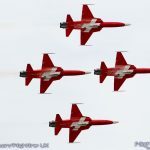 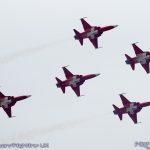 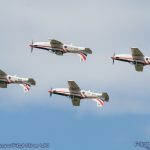 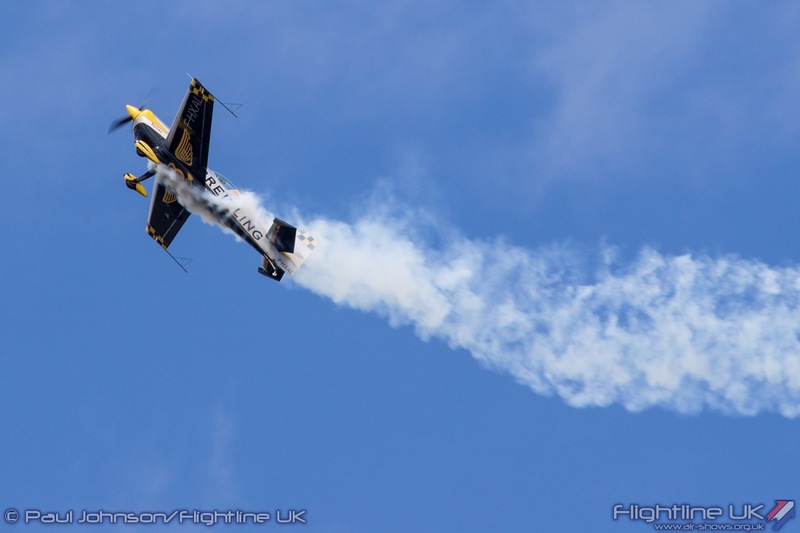 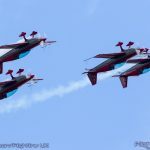 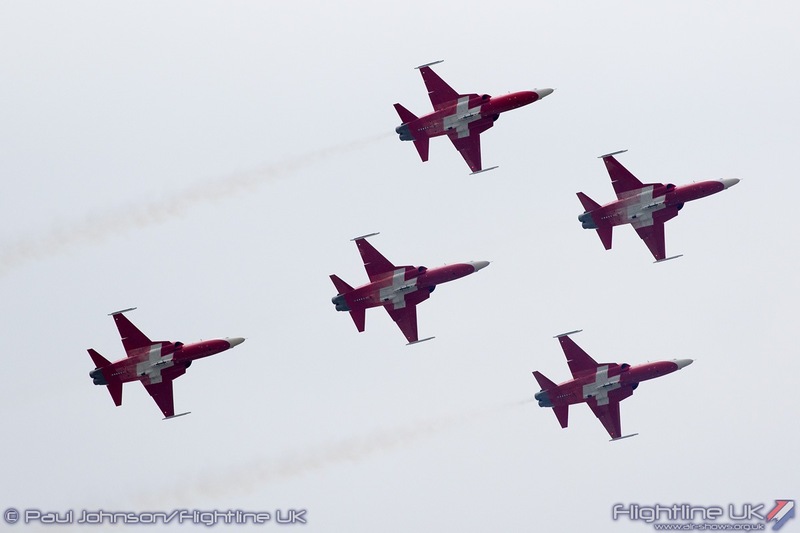 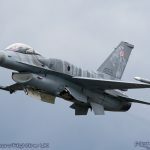 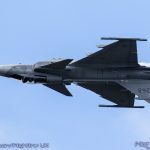 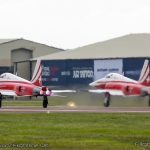 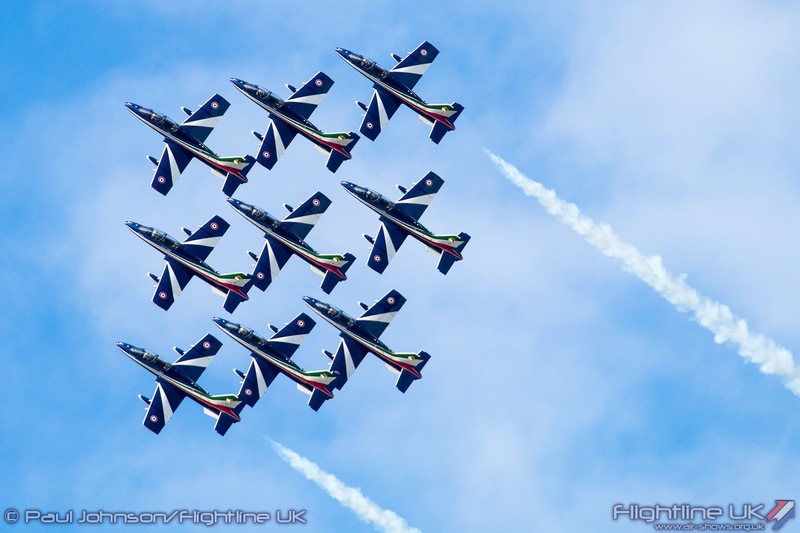 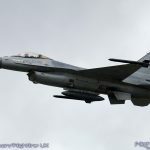 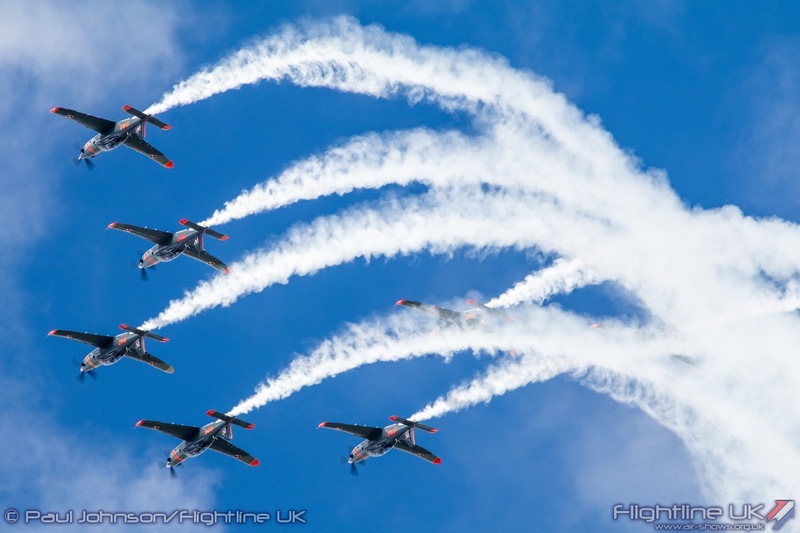 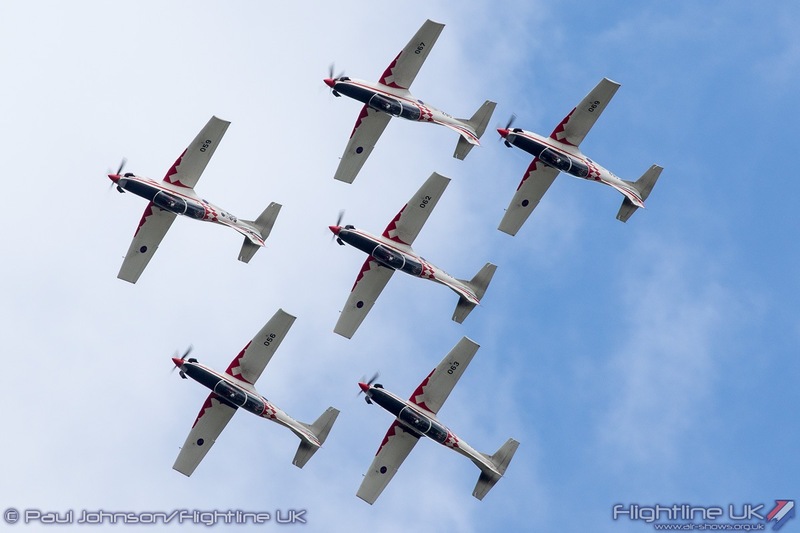 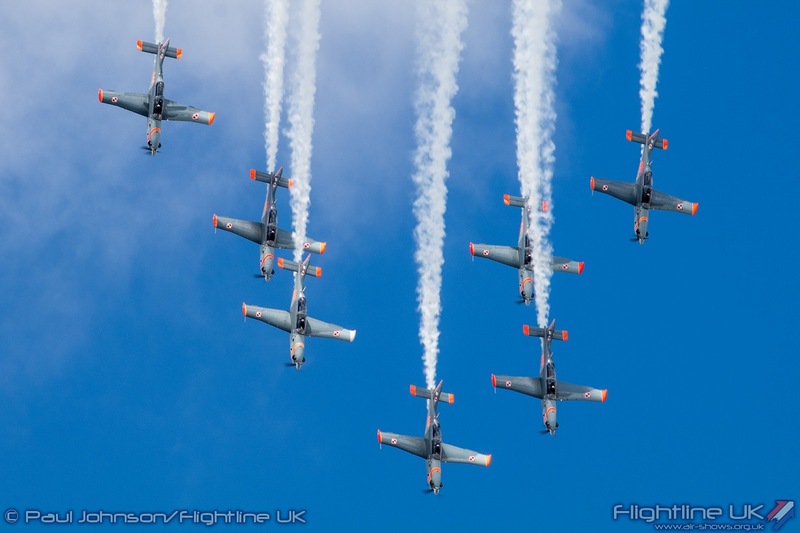 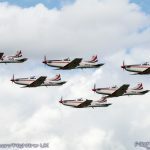 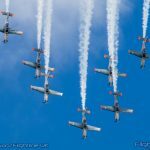 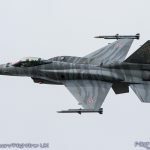 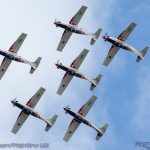 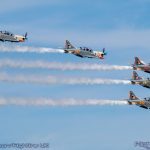 The event also hosted the Croatian Air Force for the first time with a UK debut by their national display team “Krila Oluje” amongst a line-up showcasing global military air power. 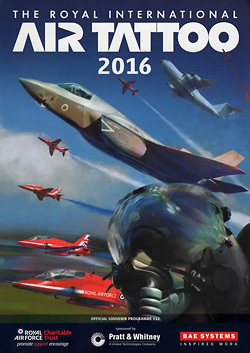 Any Air Tattoo comes with a huge sense of anticipation, but 2016 was particularly special. 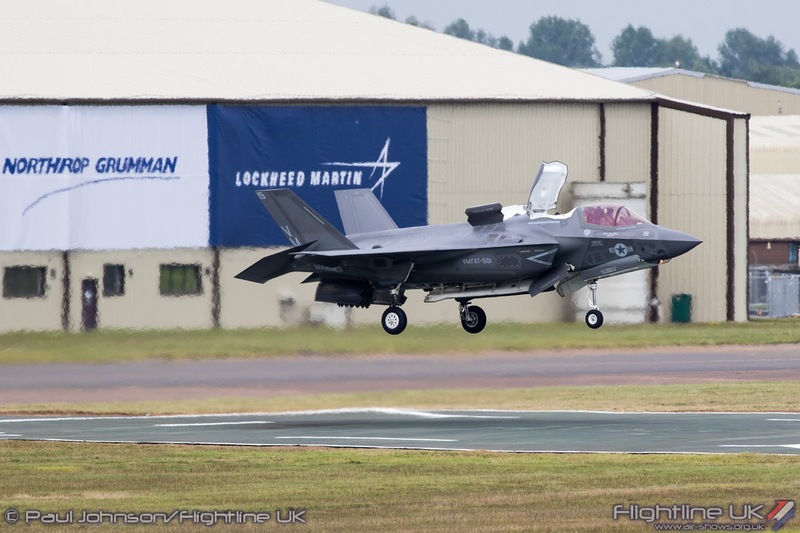 This was the year the Lockheed Martin F-35B Lightning II would be introduced to the British public at the Air Tattoo. 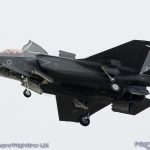 However, it was not just about the F-35. 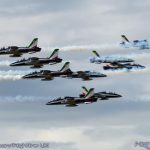 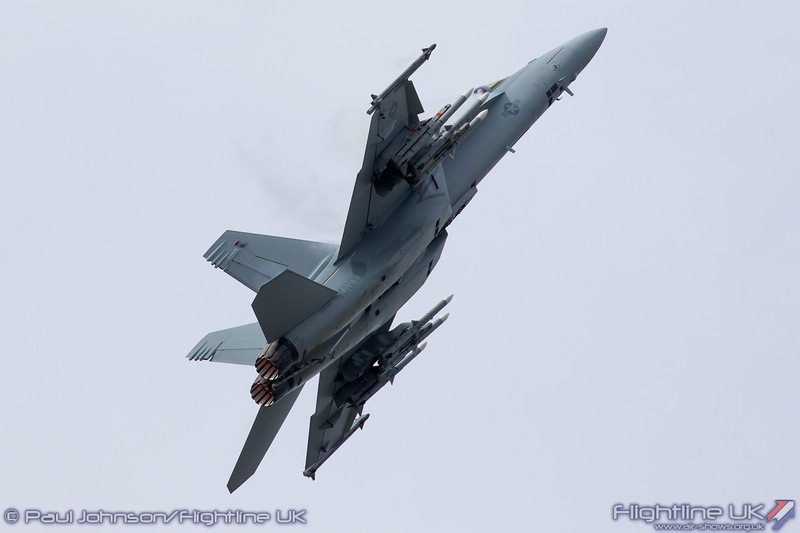 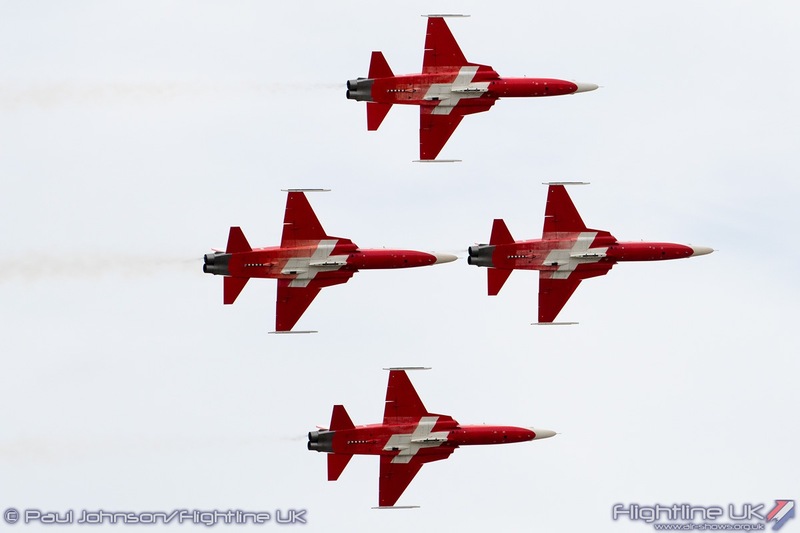 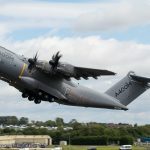 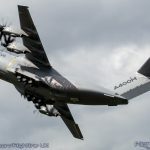 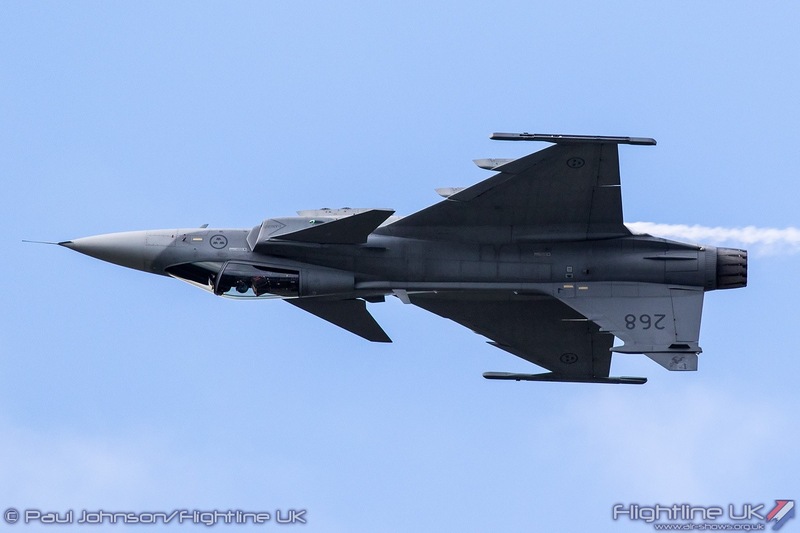 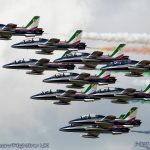 In all, more than 230 aircraft, from 37 air arms in 24 countries participated in the Air Tattoo which took place in warm, if a little cloudy weather conditions. 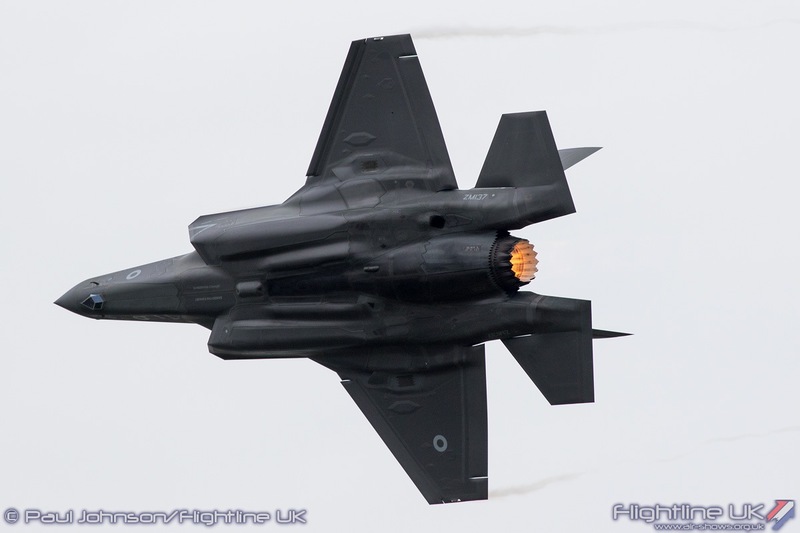 The promise of the F-35 drew in the crowds, with 153,000 people attending across the three days. 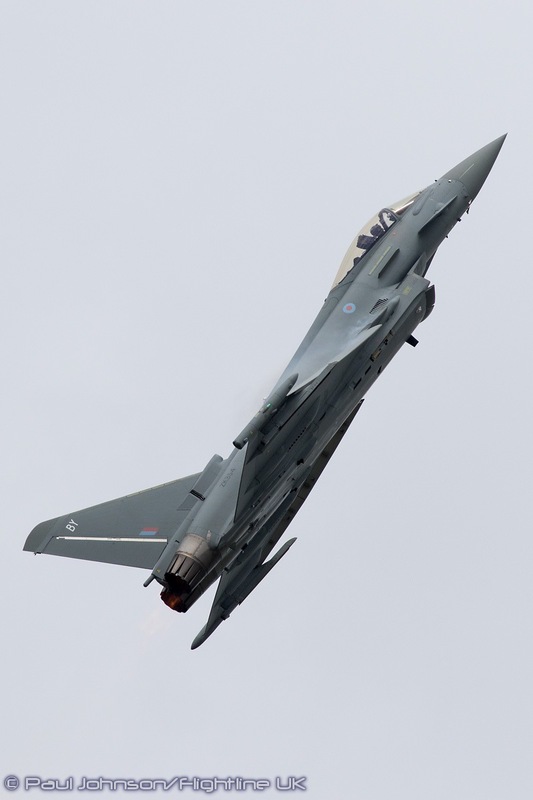 Saturday and Sunday were sell outs even before the Air Tattoo week has started. 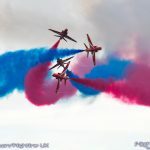 The show always attracts attention from the British Royal Family, but this year saw a very welcome visit by the Duke and Duchess of Cambridge with their son Prince George which saw even more international media coverage for the event. 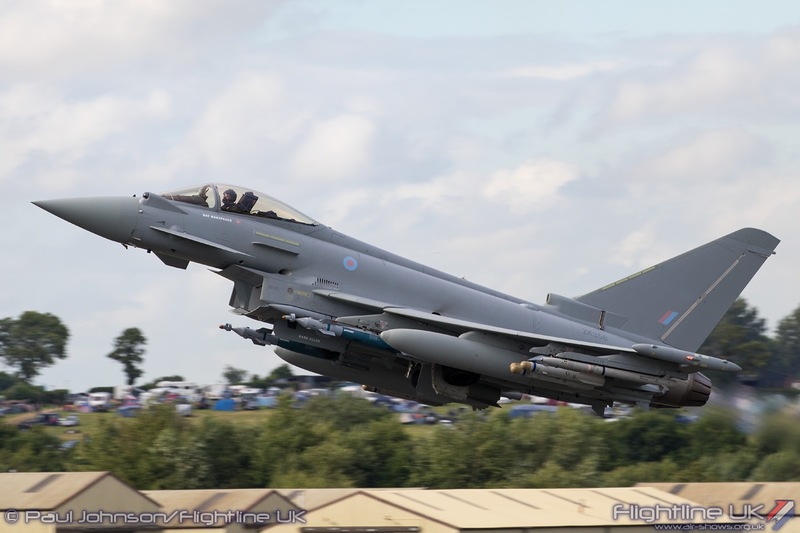 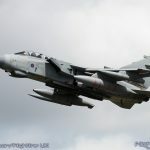 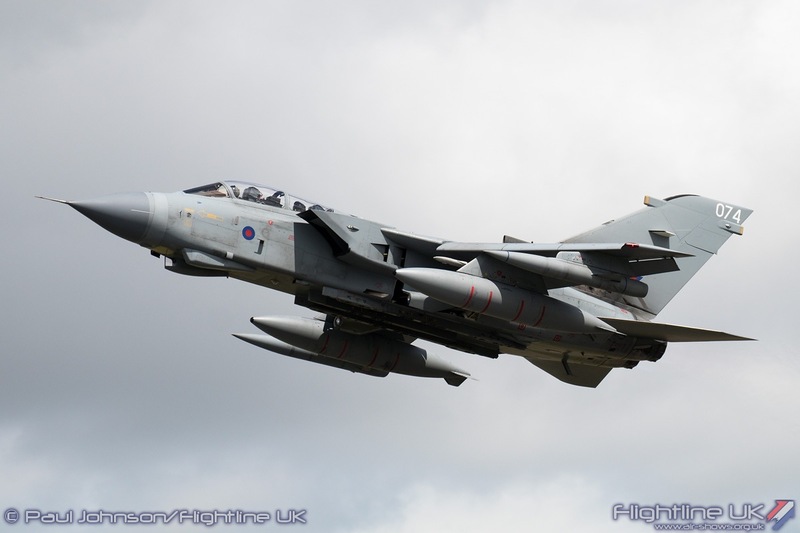 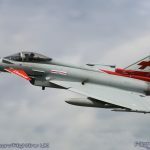 The Air Tattoo is a huge project, and the staff at the RAF Charitable Trust Enterprises have turned it in to one of the most important defence diplomacy events in the world as well as one of the most famous airshows. 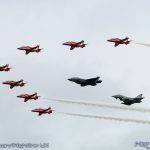 It goes without saying that planning and staging the Air Tattoo is a year round task for the full time staff. 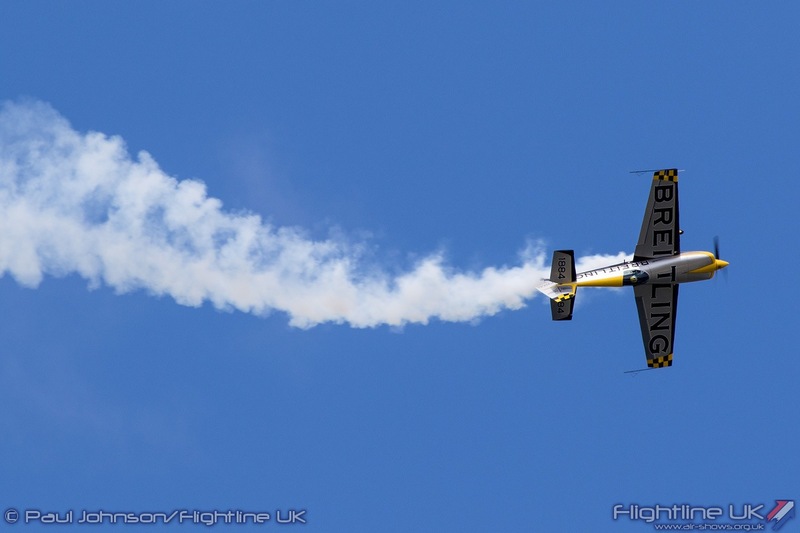 Indeed planning for future events in 2017 and 2018 has started well ahead of the 2016 event being held. 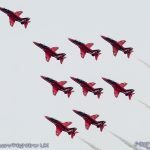 However, the success of the Air Tattoo would not happen with a huge cohort of volunteers. 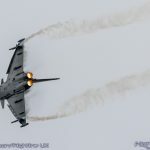 As well as all the operational aspects, they just make the whole event a much more pleasant place to be for both public and participants despite the huge size and corporate nature of the Air Tattoo. 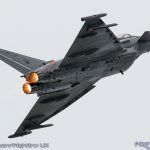 For the serious enthusiasts, the Air Tattoo is at least a six day marathon. 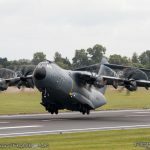 The Air Tattoo really gets going on the Wednesday when the bulk of the aircraft start to arrive. 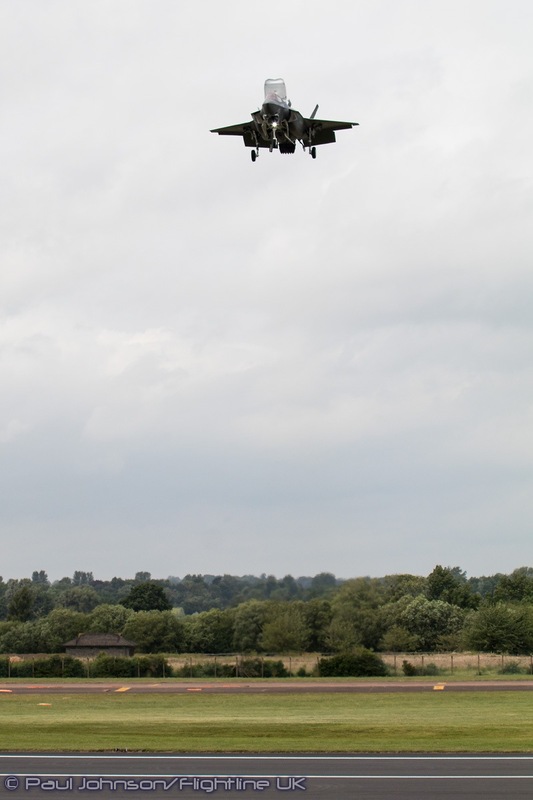 The Park and View enclosures open on the Wednesday, Thursday and Monday remain popular attractions. 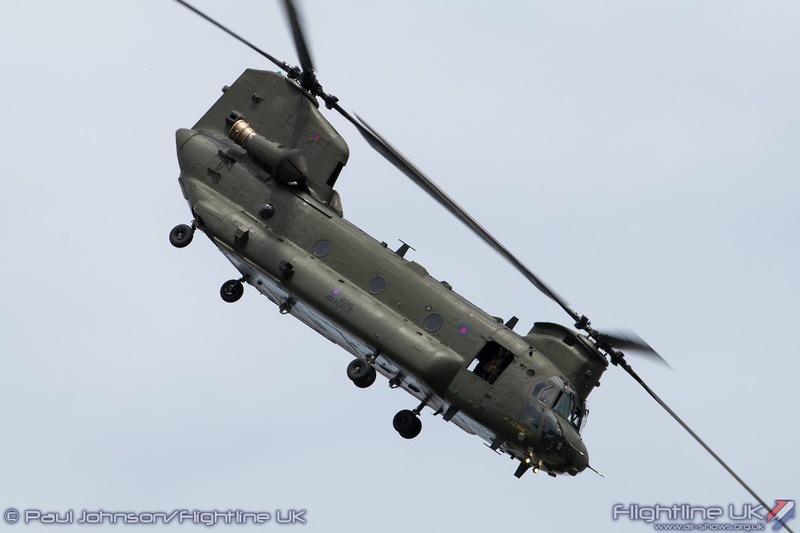 They offer the opportunity to see many of the flying display, static display and support aircraft arrive and depart. 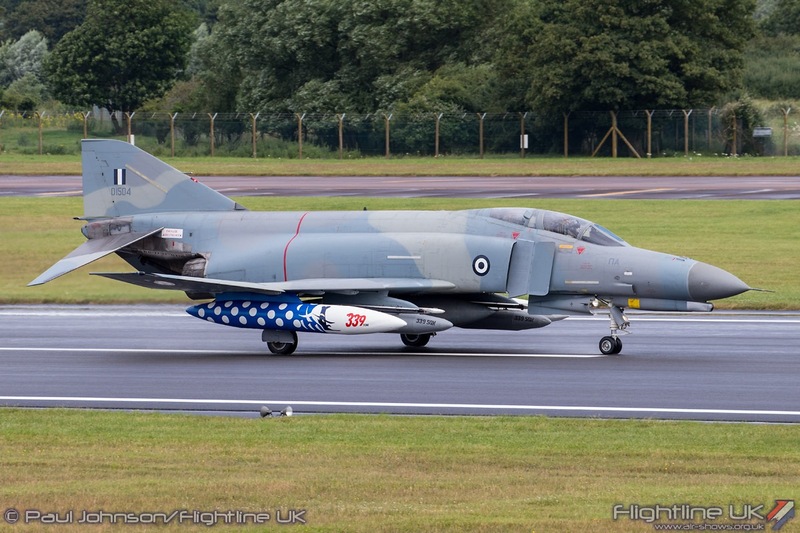 Wednesday, usually a quiet day turned out to be very busy. 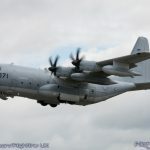 Indeed the first aircraft, a CP-140 Aurora from the Canada was orbiting in the clear skies overhead as the queue of enthusiasts built up to enter the enclosure. 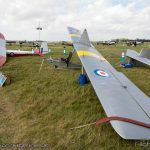 Unusually this year, some of the supporting aircraft that didn’t stay for the weekend provided some of the highlights for the enthusiast. 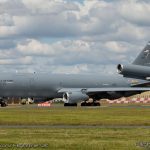 Early arrivals on Wednesday had the chance to catch one of the USAF McDonnell Douglas KC-10A Extenders depart having brought in the F-35Bs the week before. 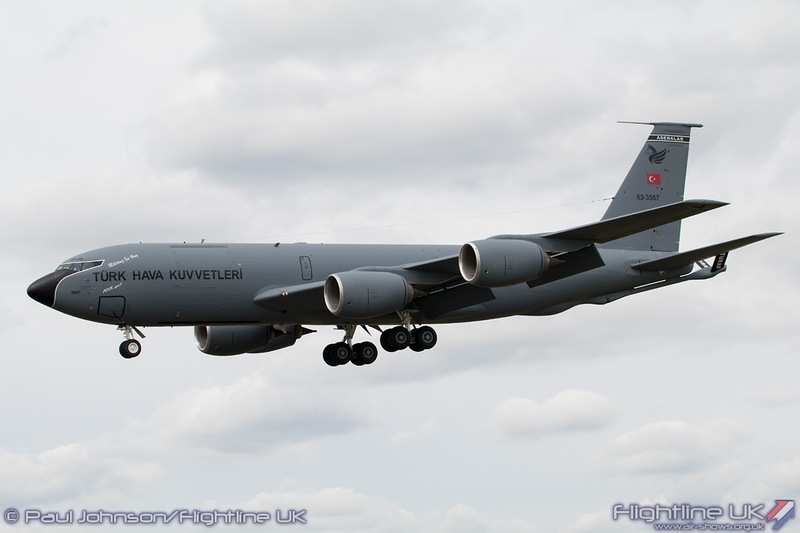 In support of SoloTurk, the Turkish Air Force sent Boeing KC-135R Stratotankers on the Wednesday and Monday. 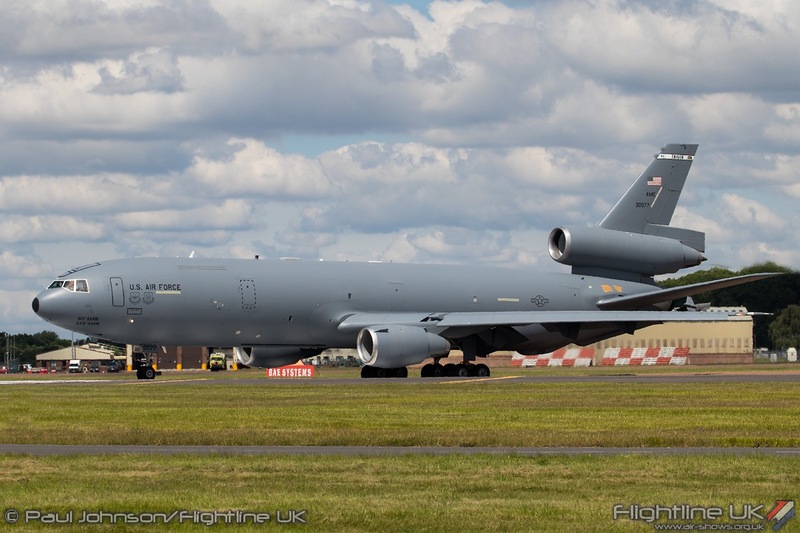 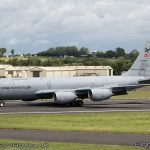 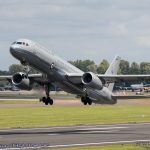 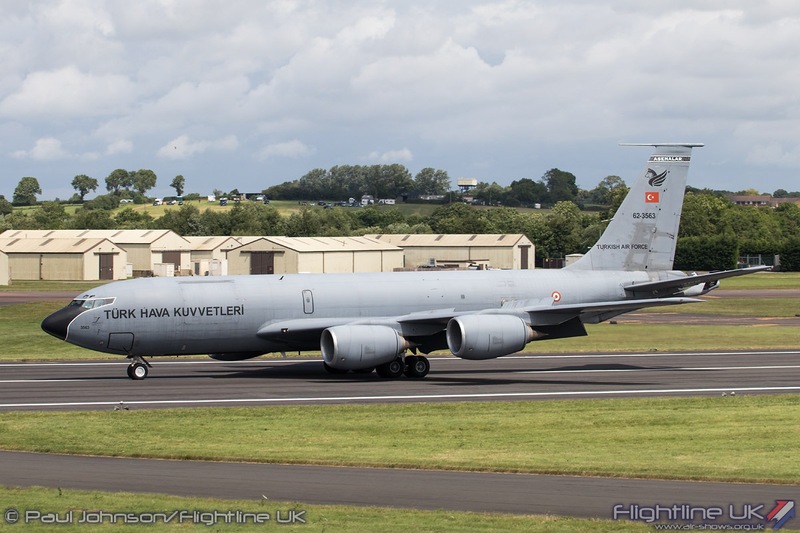 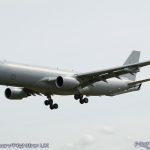 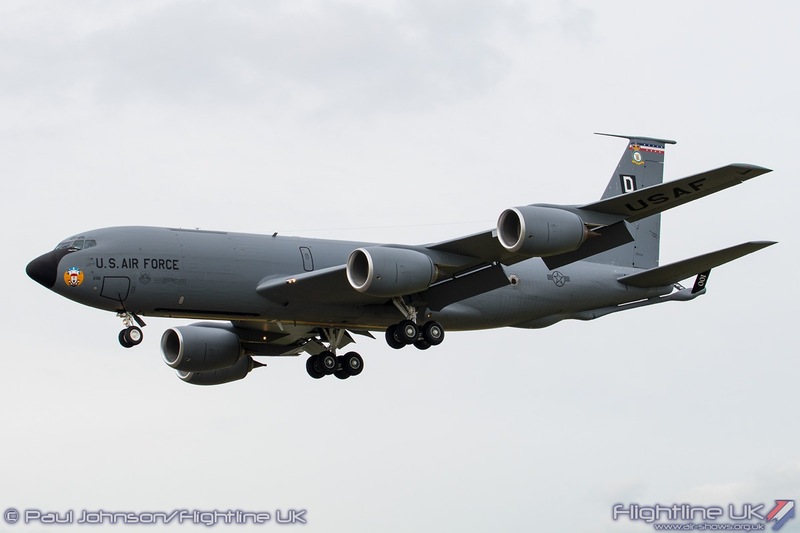 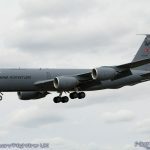 It has been a long-time since a Turkish KC-135R has been seen at a UK airshow so was a welcome surprise for those able to attend during the arrivals and departures. 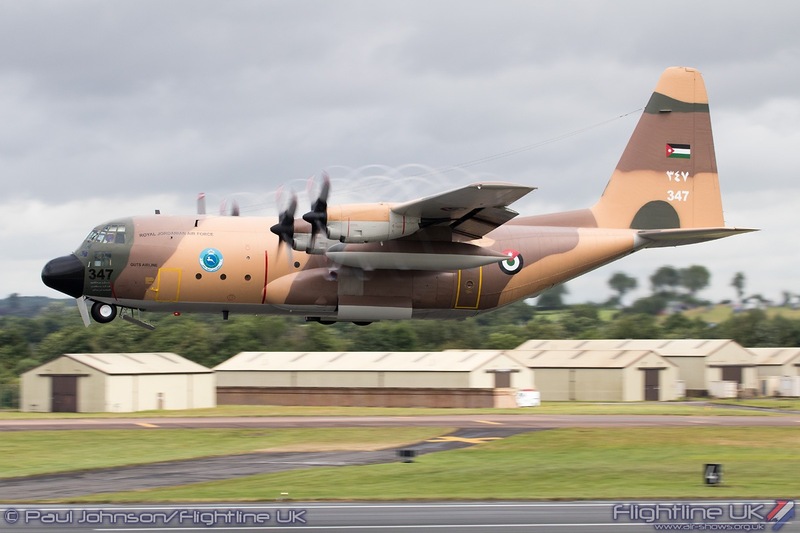 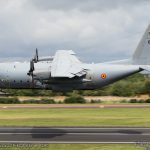 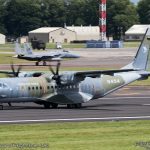 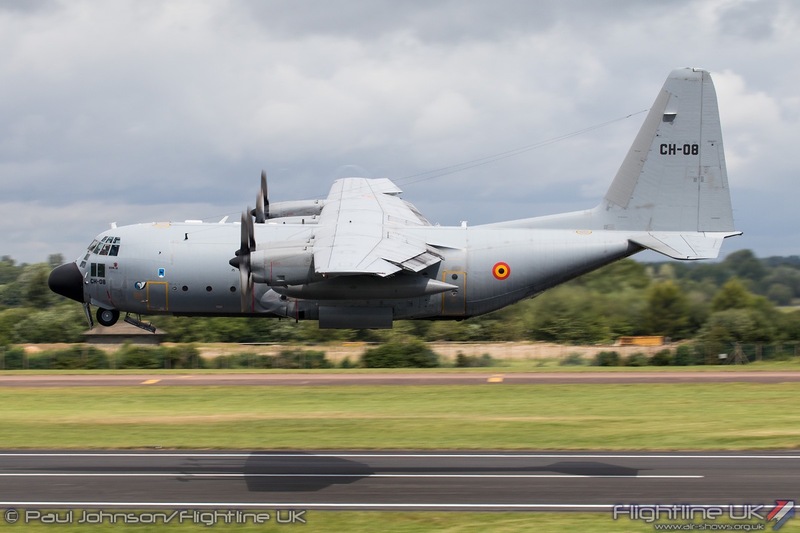 An equally rare surprise are Spanish Air Force Lockheed C-130H Hercules aircraft which supported the Typhoons in the flying and static displays. 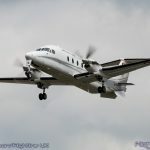 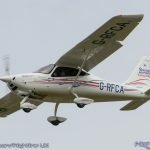 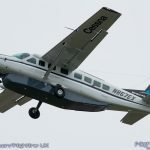 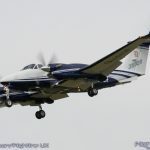 The numbers of static aircraft have reduced over the past few years which for those of us who remember the golden era of the mid-1990’s can be a little disappointing. 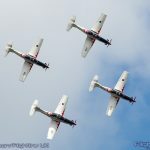 However, what cannot be overlooked is the quality of the participants. 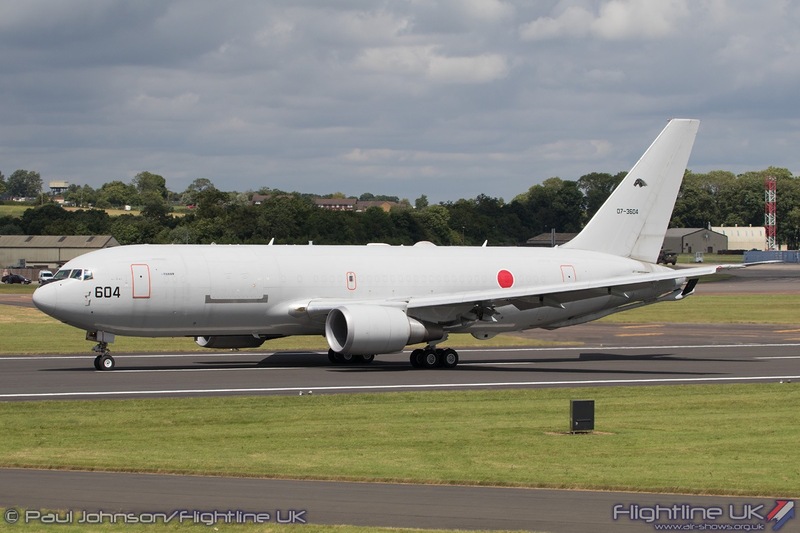 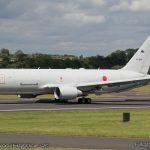 For instance, in the 1990’s we could only have dreamed that the Japanese Air Self Defence Force would become RIAT ‘regulars’ with the Boeing KC-767J tanker aircraft. 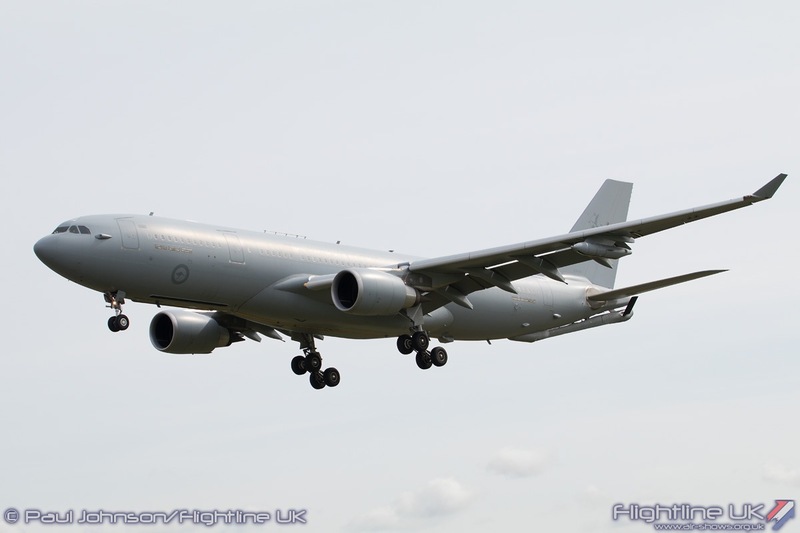 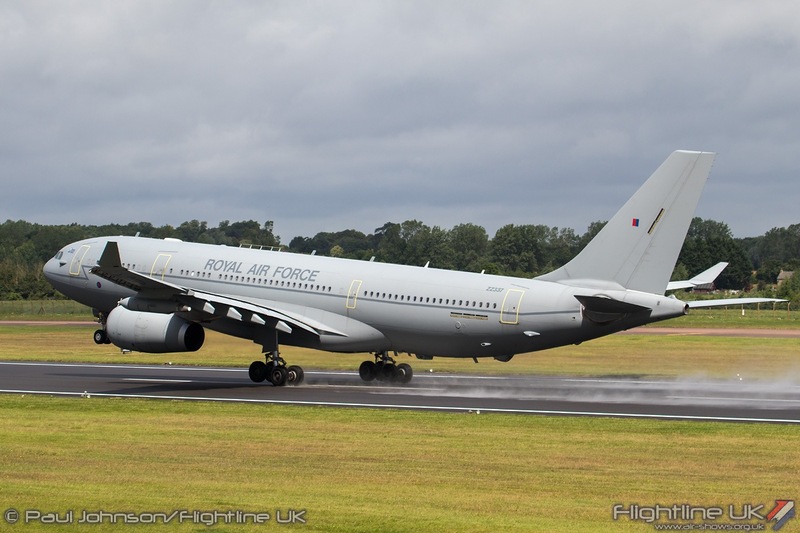 In 2016, they were joined by the Royal Air Force with an Airbus DS A330MRTT Voyager KC2, A Royal Australian Air Force Airbus DS A330MRTT and United States Air Force Boeing KC-135R Stratotanker as exponents of the aerial refuelling role. 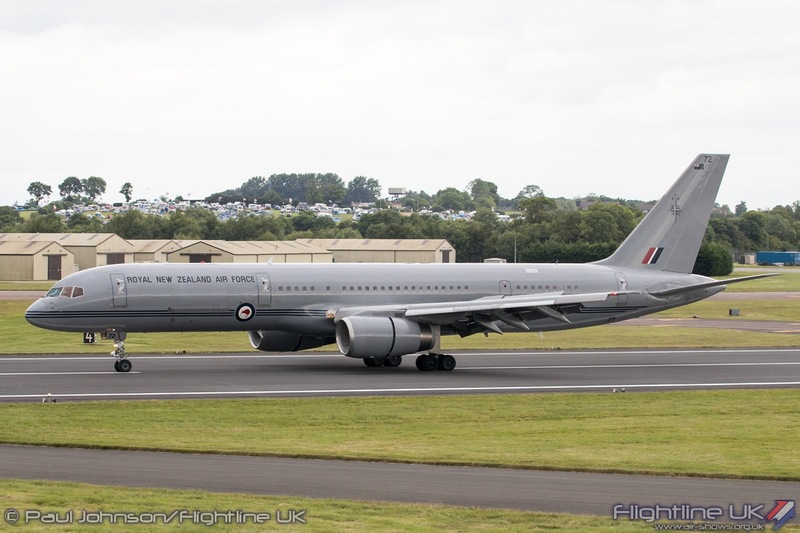 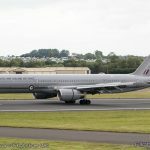 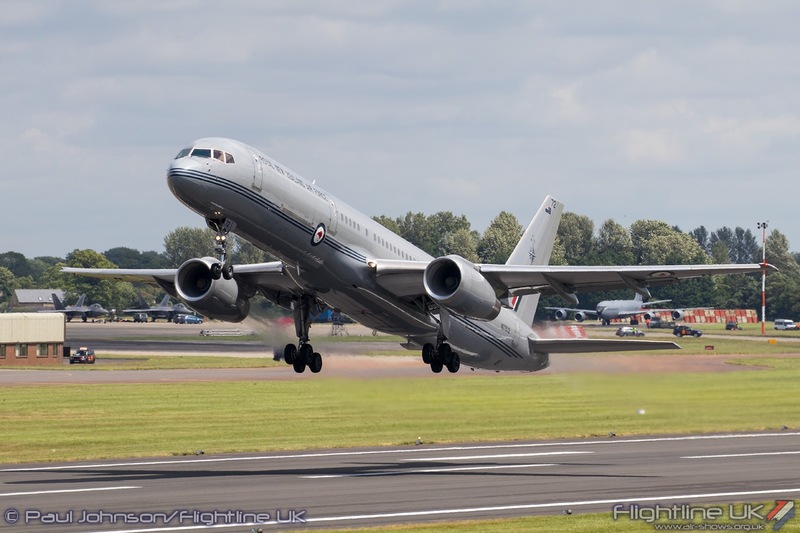 While it is not a tanker, another converted airliner on display came in the form of a Boeing 757-22QC from the Royal New Zealand Air Force. 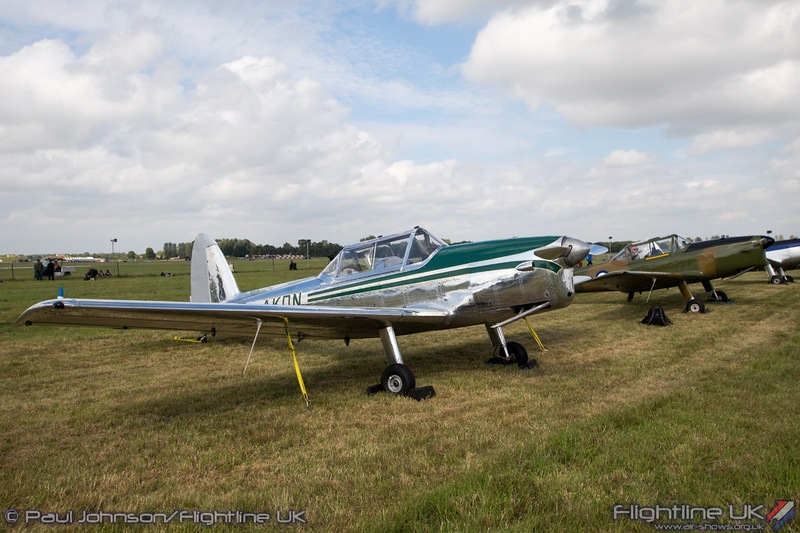 More general transport types also had a good showing. 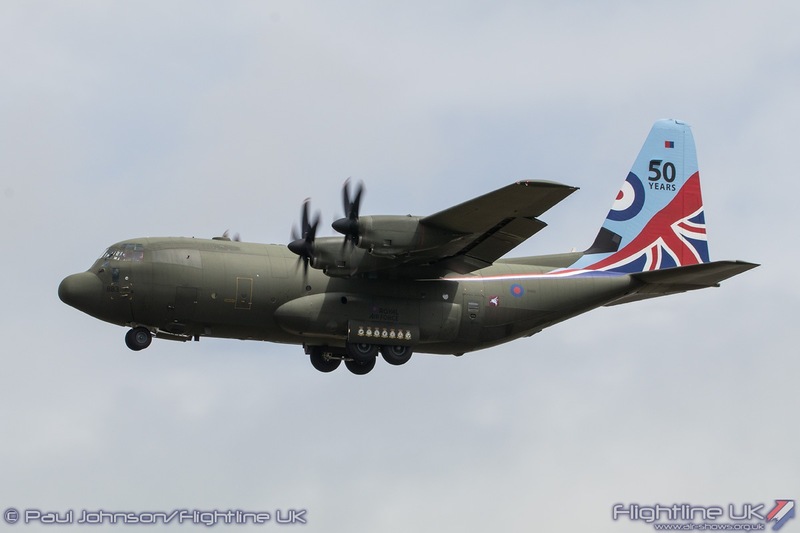 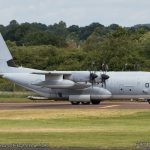 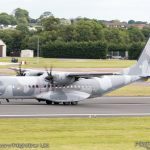 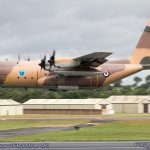 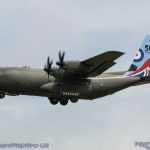 The Royal Air Force sent one of its C-130J Hercules C5s in special markings celebrating 50 years of RAF Hercules operations. 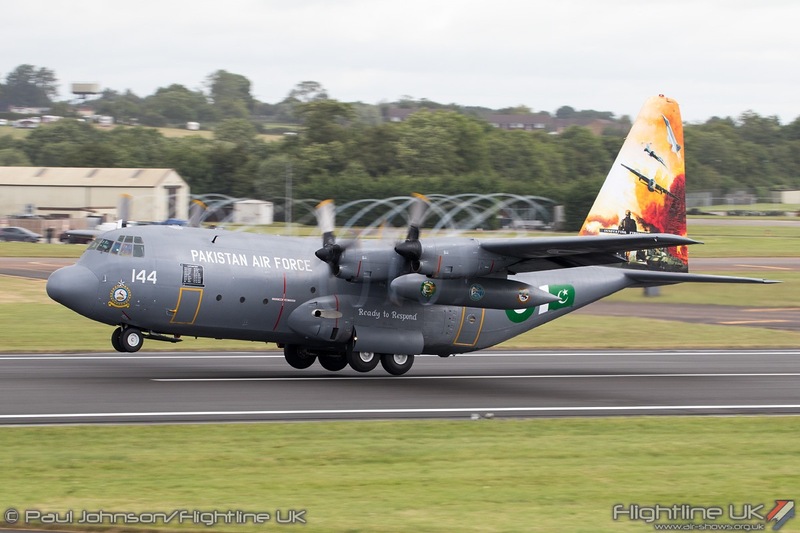 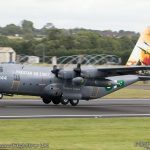 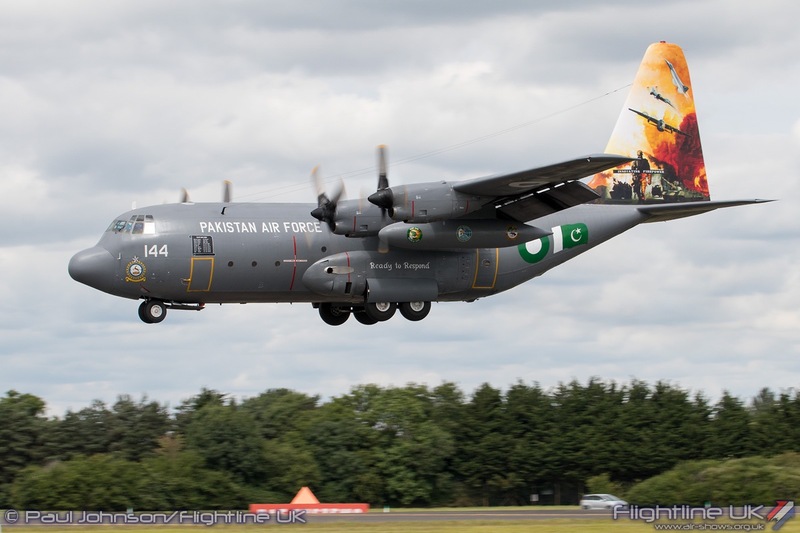 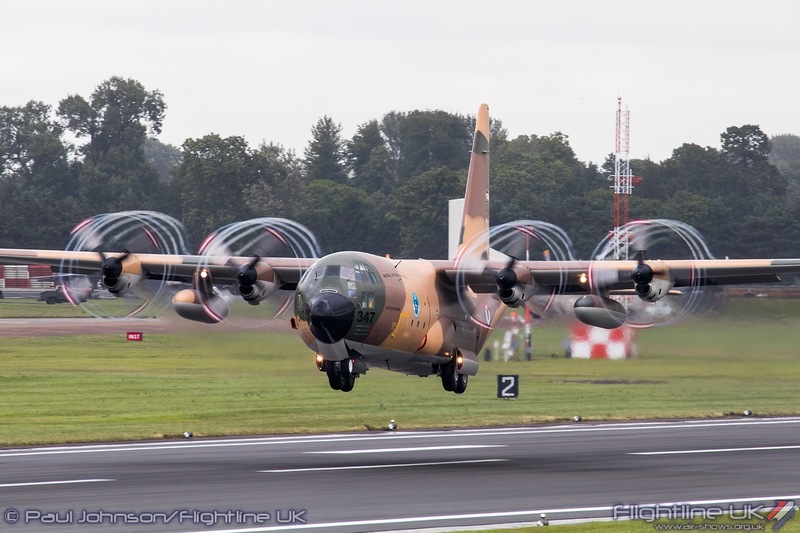 The Pakistan Air Force also made a very welcome return to the Air Tattoo with a strikingly painted C-130E Hercules. 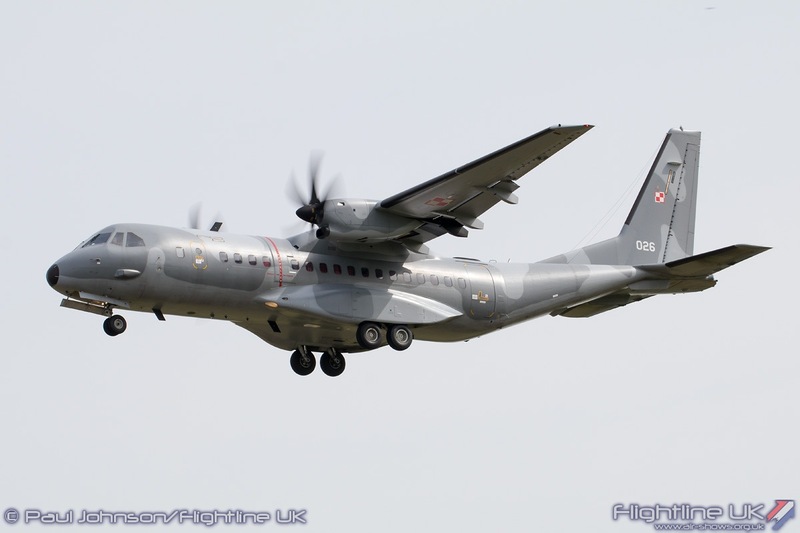 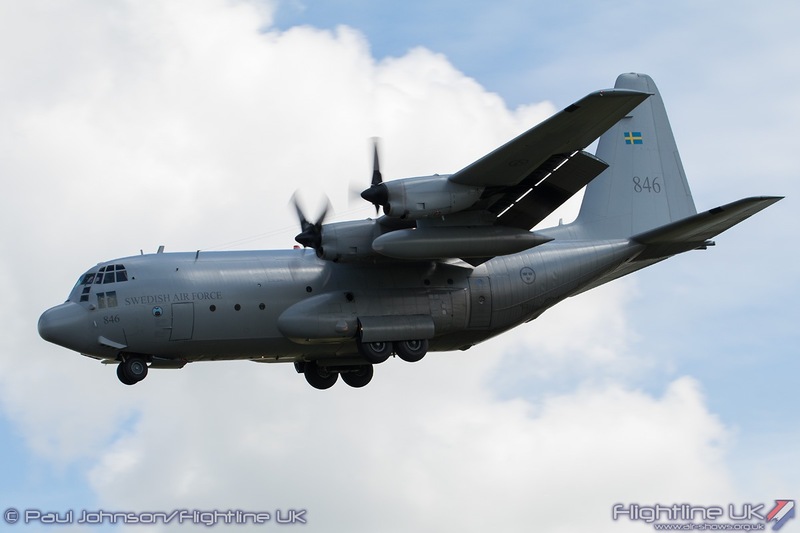 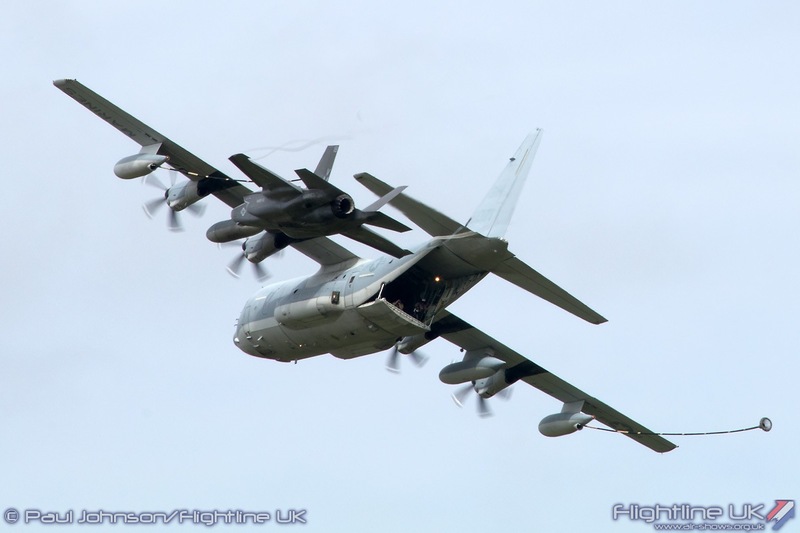 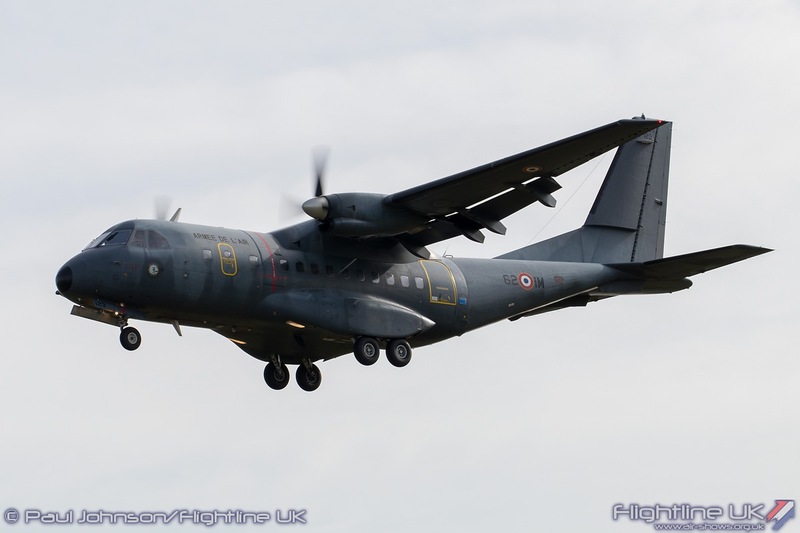 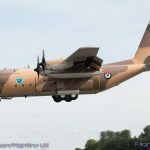 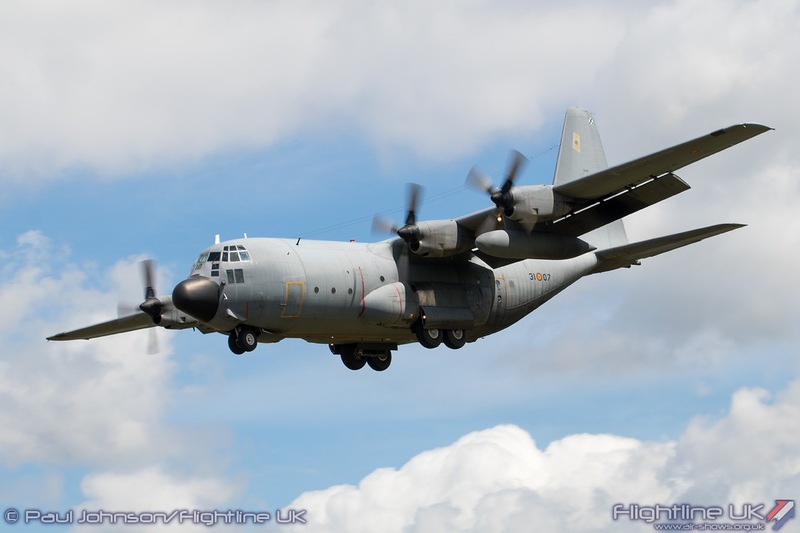 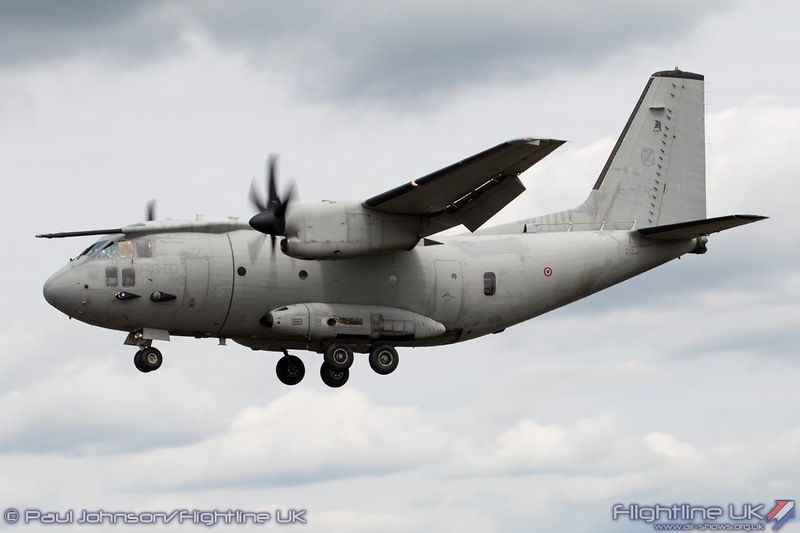 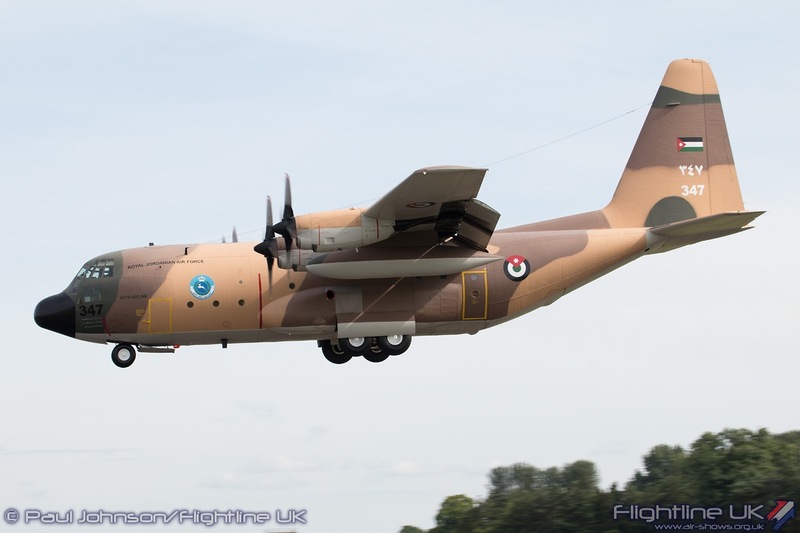 More familiar C-130Hs came from the Belgian and Royal Jordanian Air Forces. 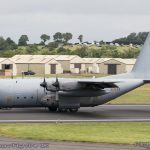 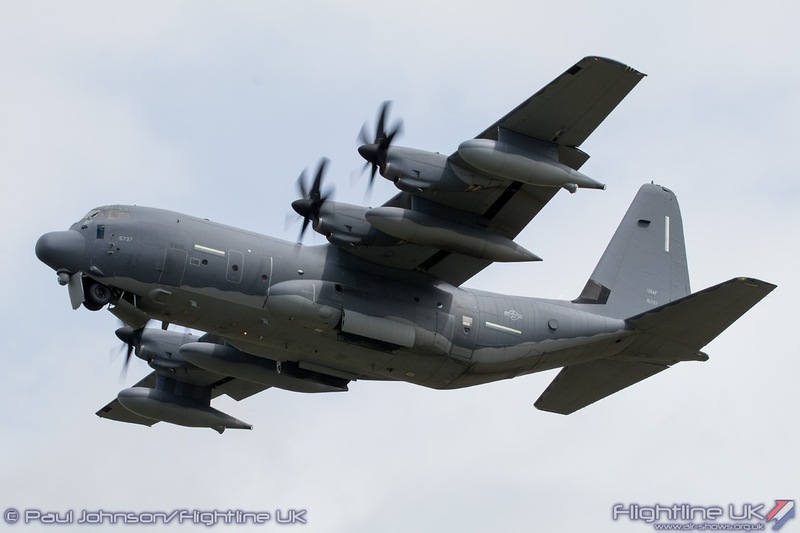 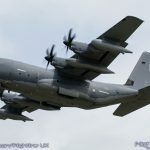 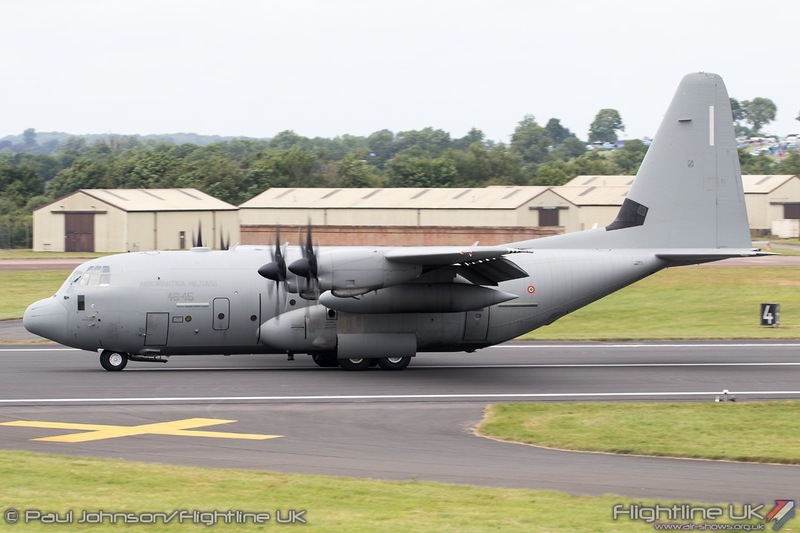 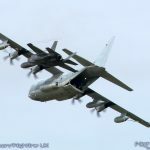 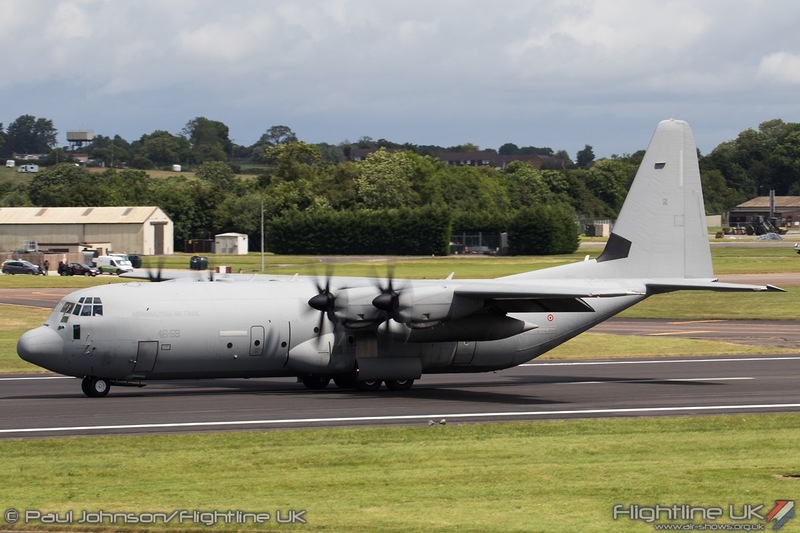 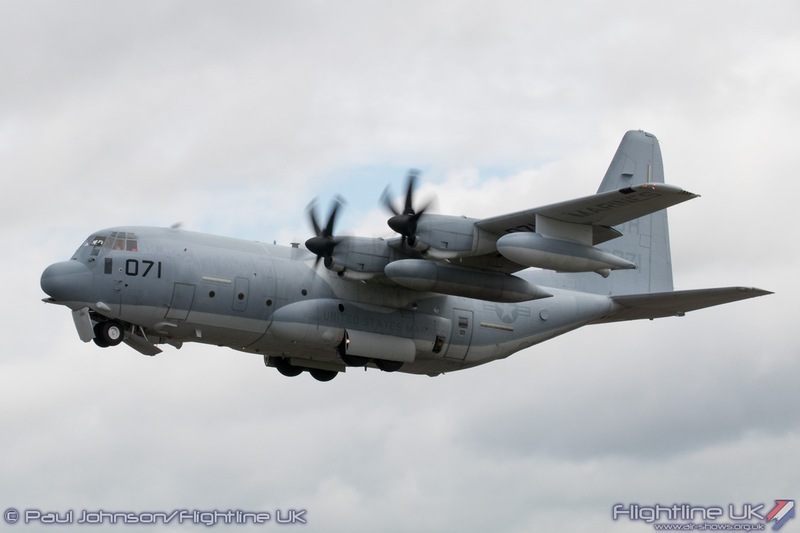 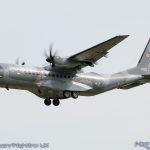 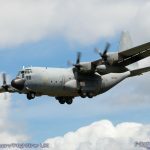 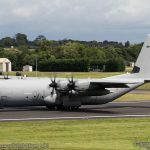 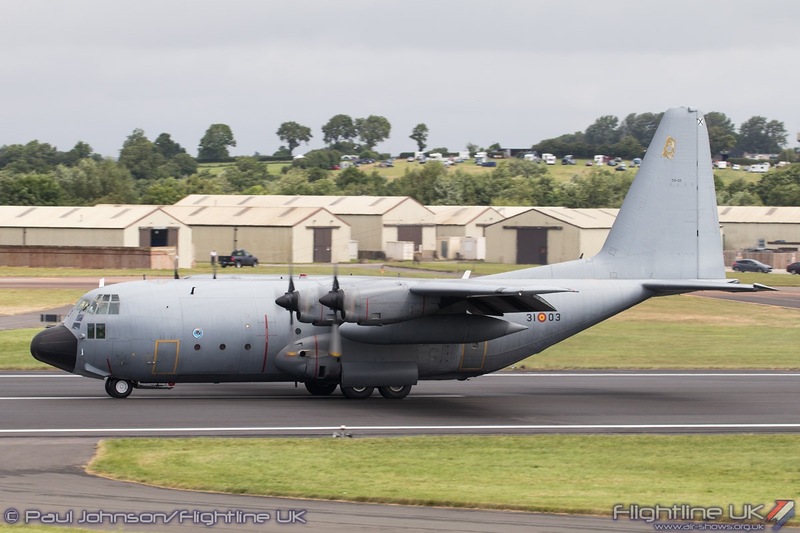 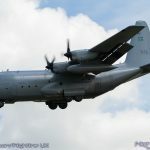 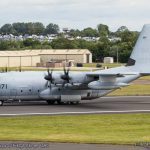 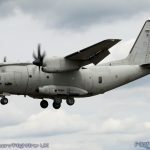 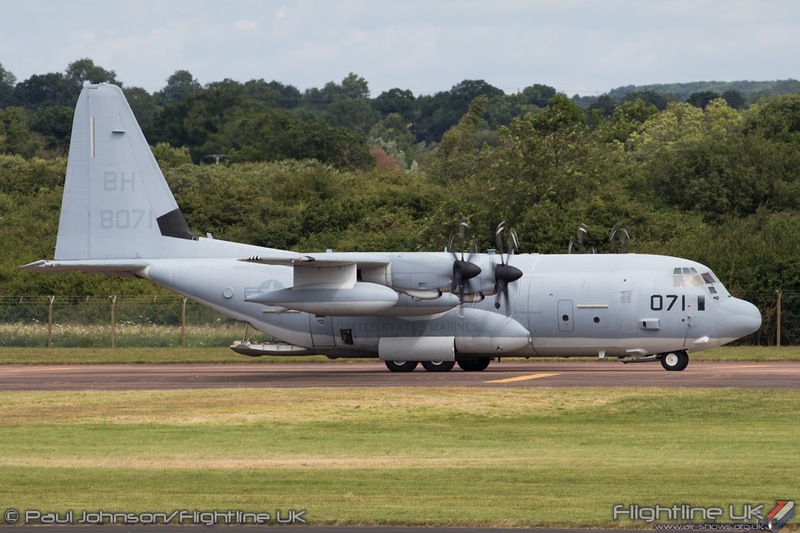 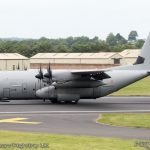 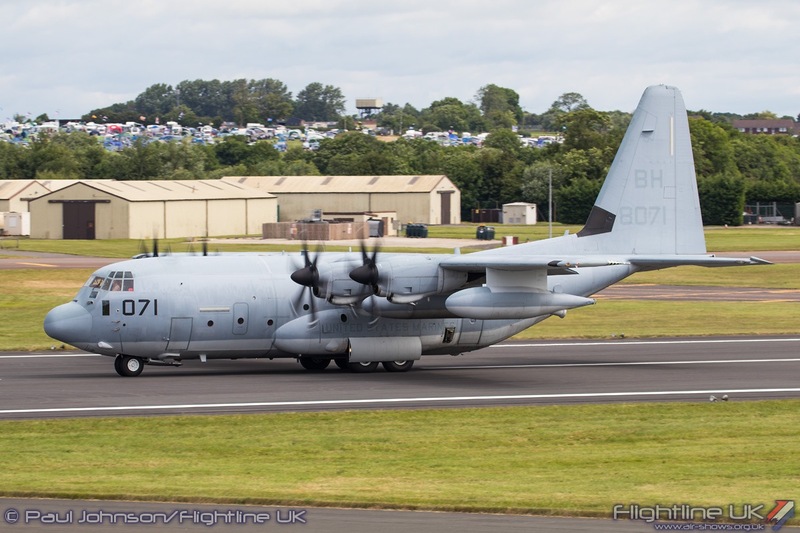 The only US Hercules in the static display was a Lockheed Martin MC-130J Commando Solo II from the 352nd Special Operations Group based at RAF Mildenhall. 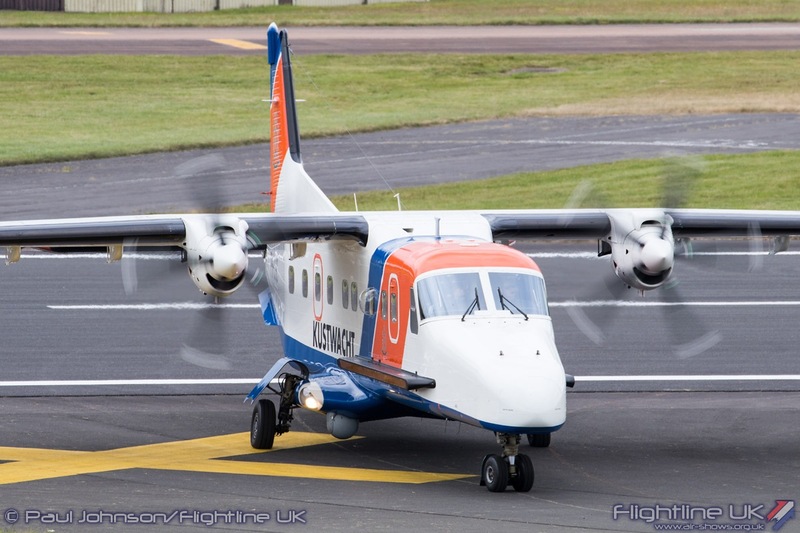 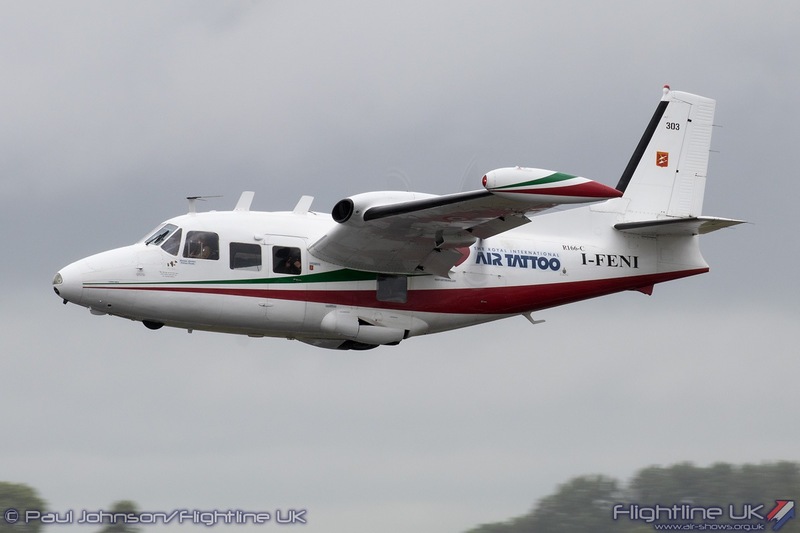 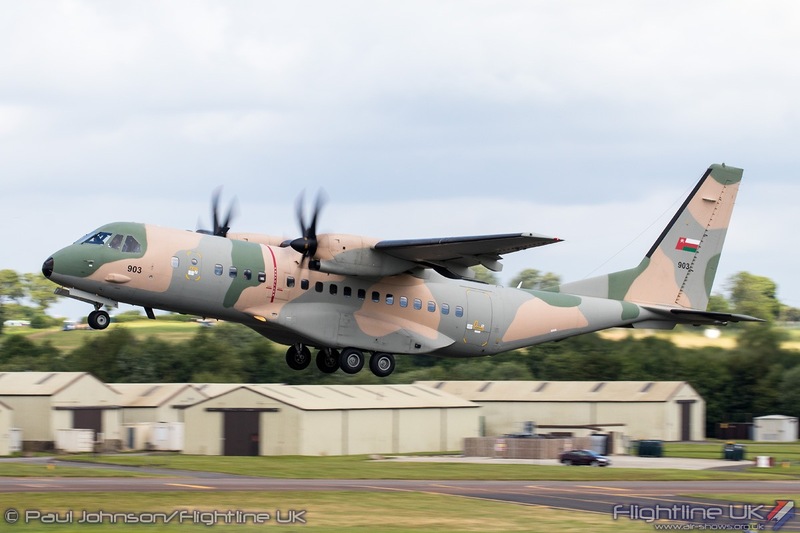 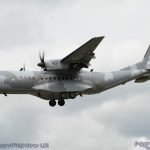 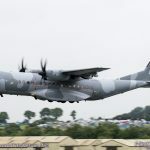 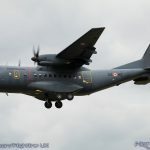 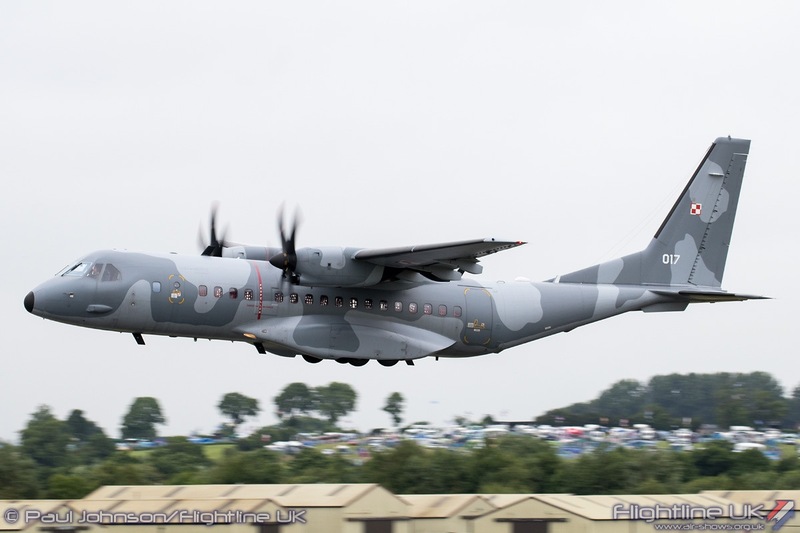 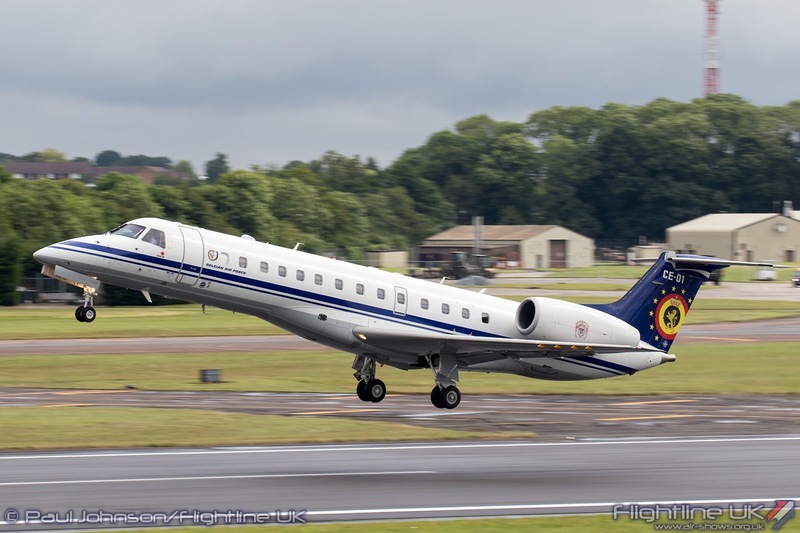 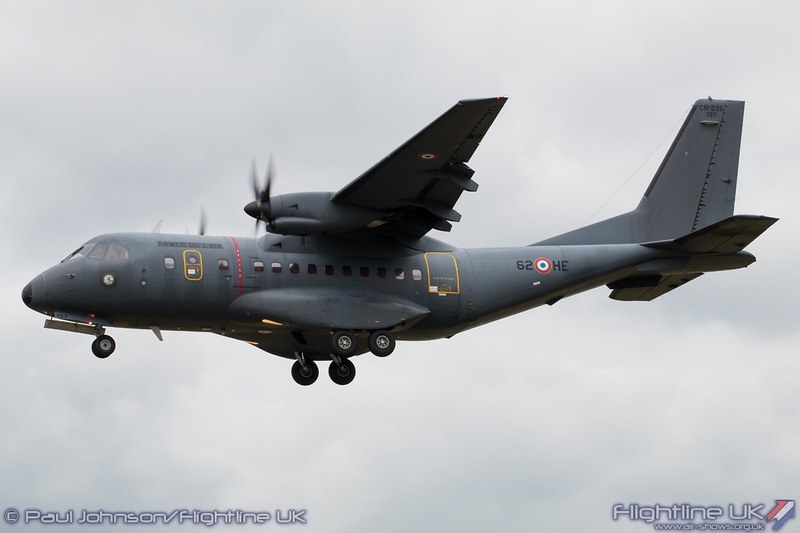 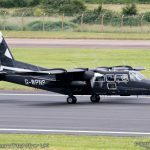 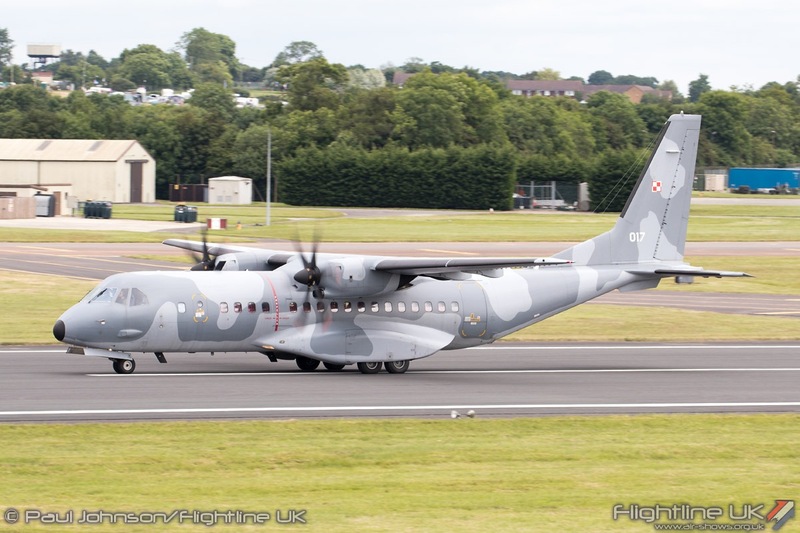 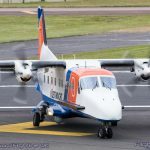 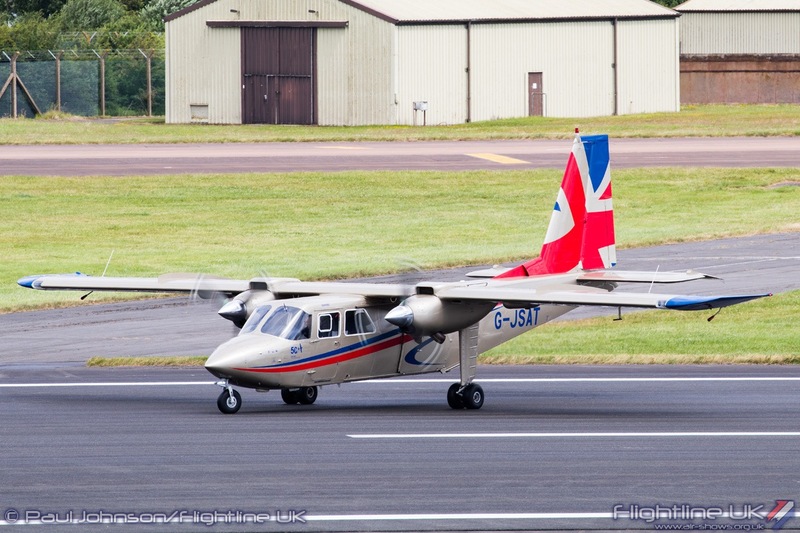 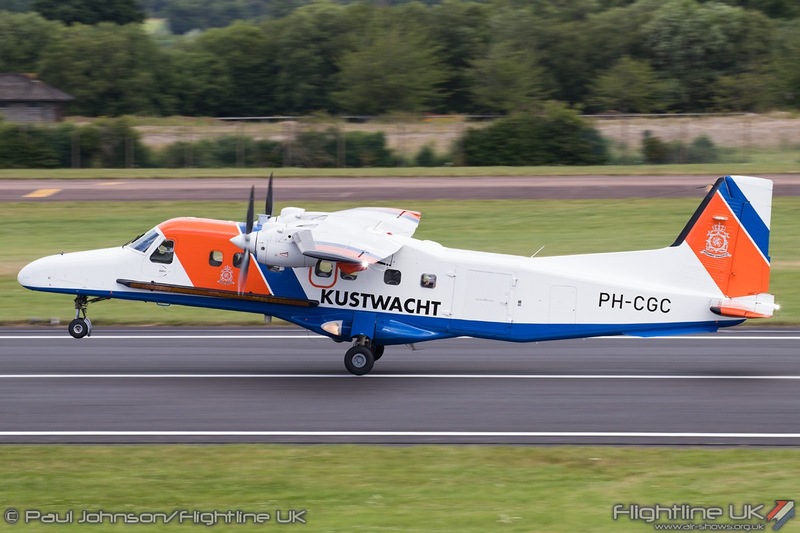 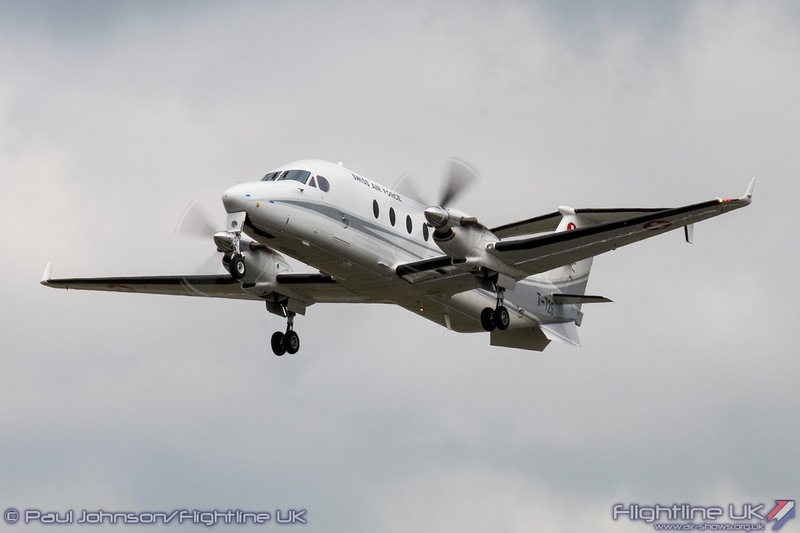 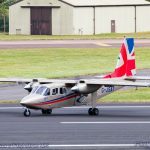 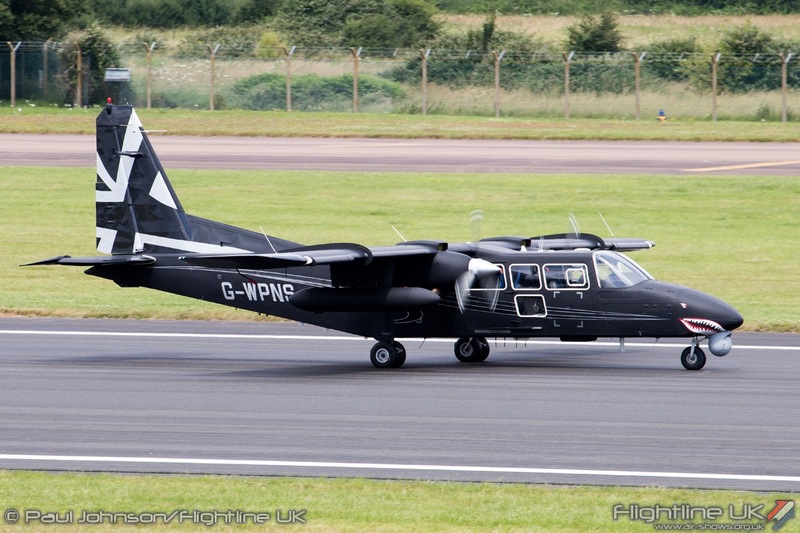 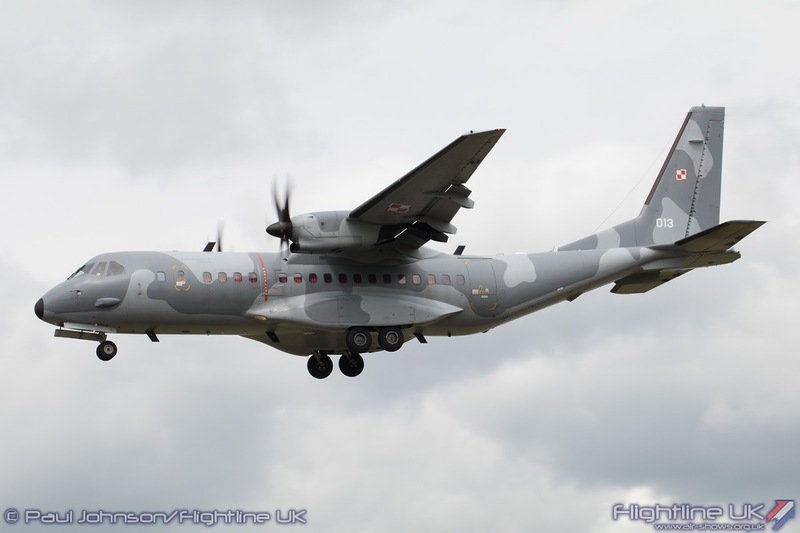 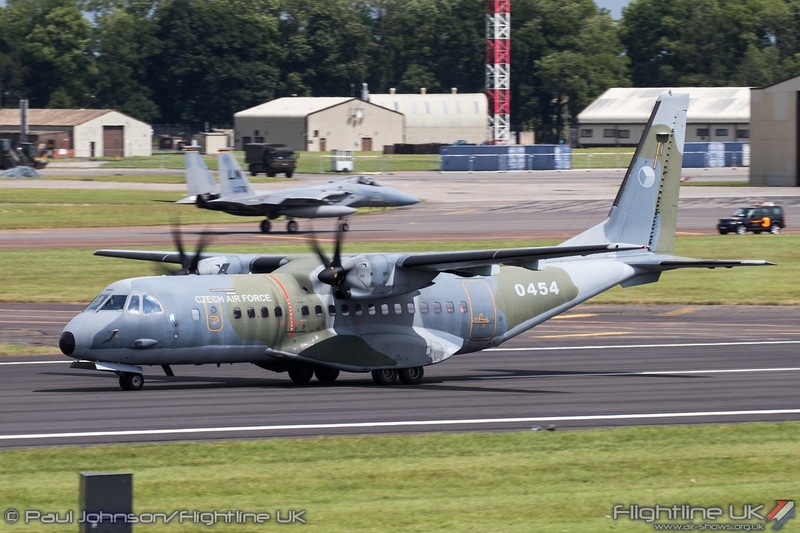 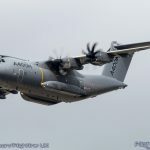 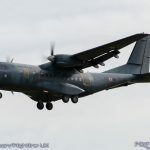 The Airbus DS (CASA) CN295M and associated family of aircraft has become more and more popular with Air Forces around the world and the Air Tattoo is almost guaranteed to see multiple examples. 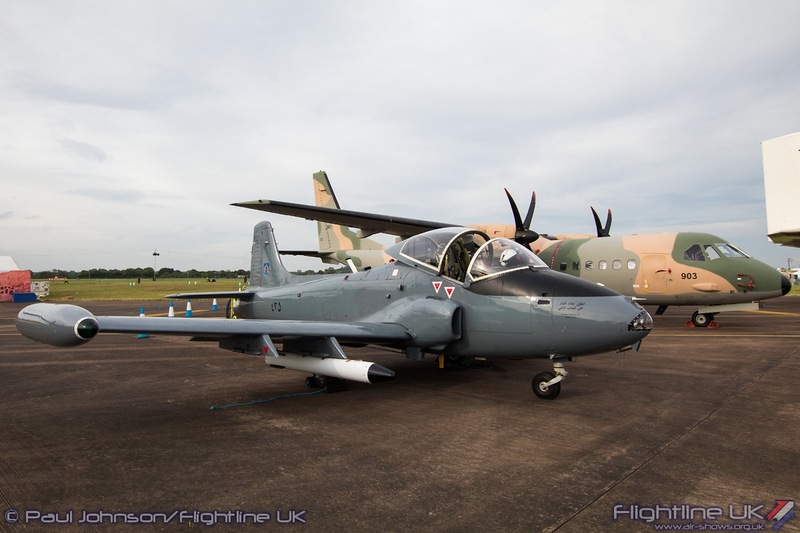 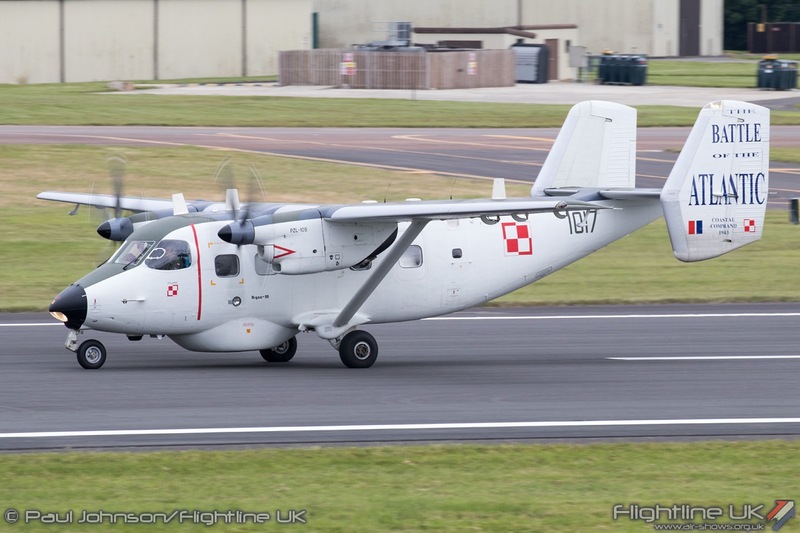 The Polish Air Force had two on static display while the Royal Air Force of Oman displayed one it’s very new examples alongside Mark Petrie’s former RAFO BAC Strikemaster Mk82a. 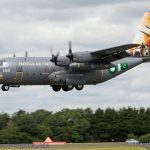 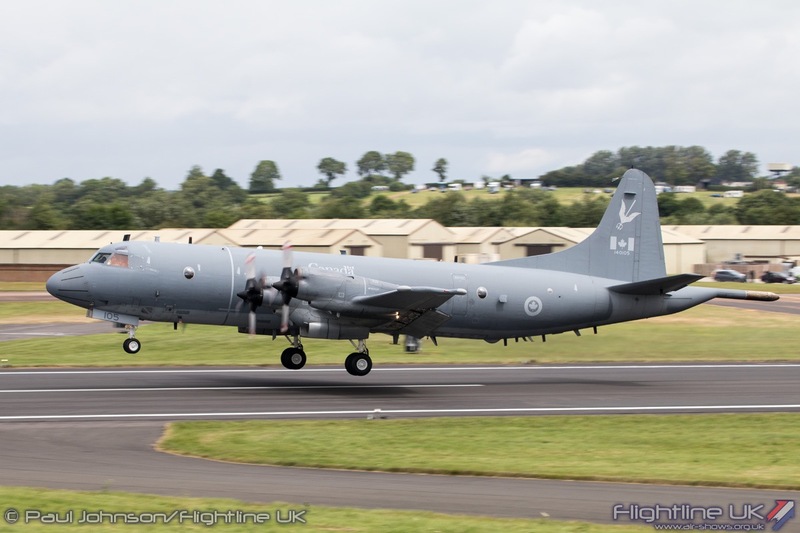 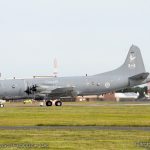 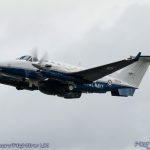 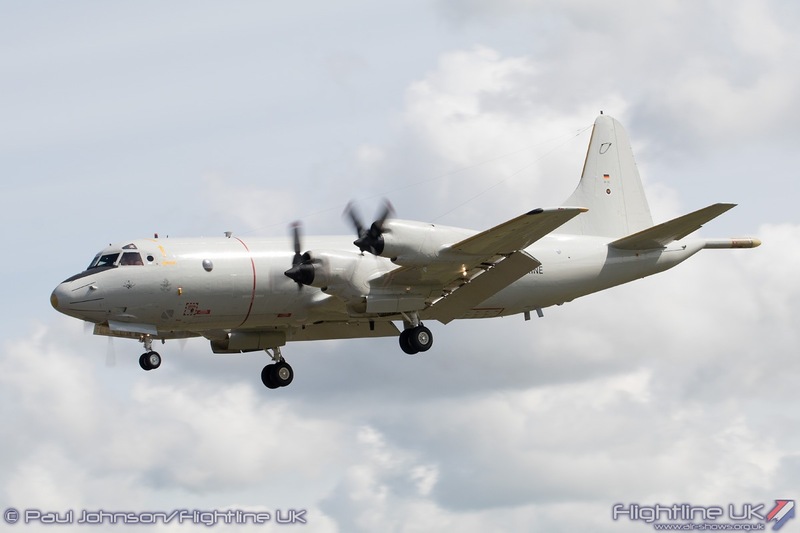 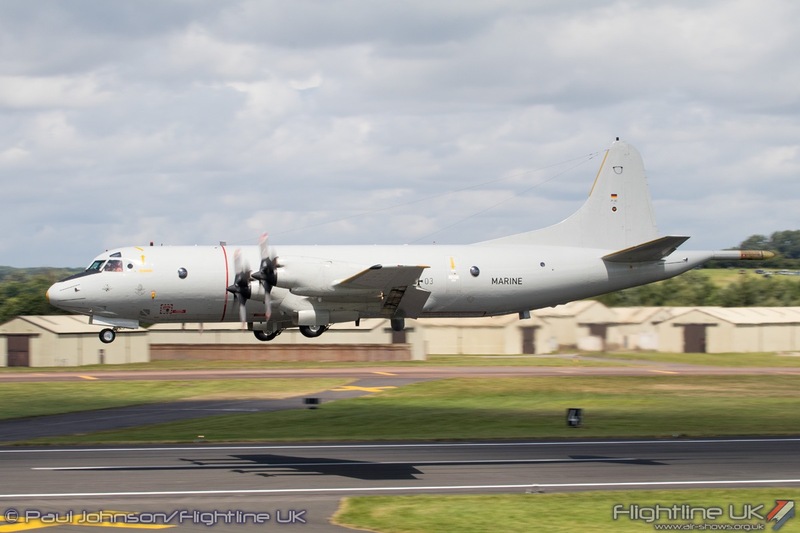 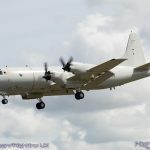 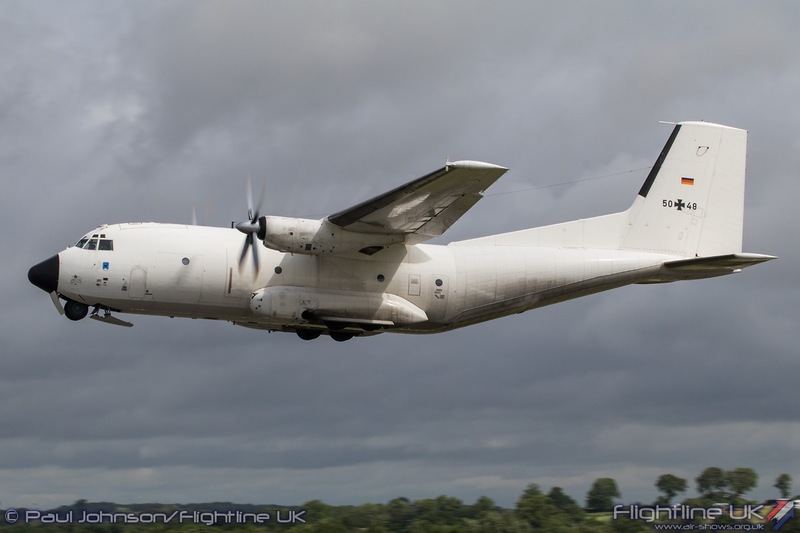 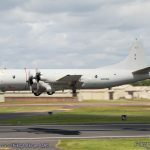 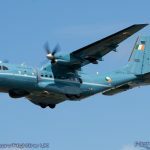 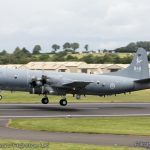 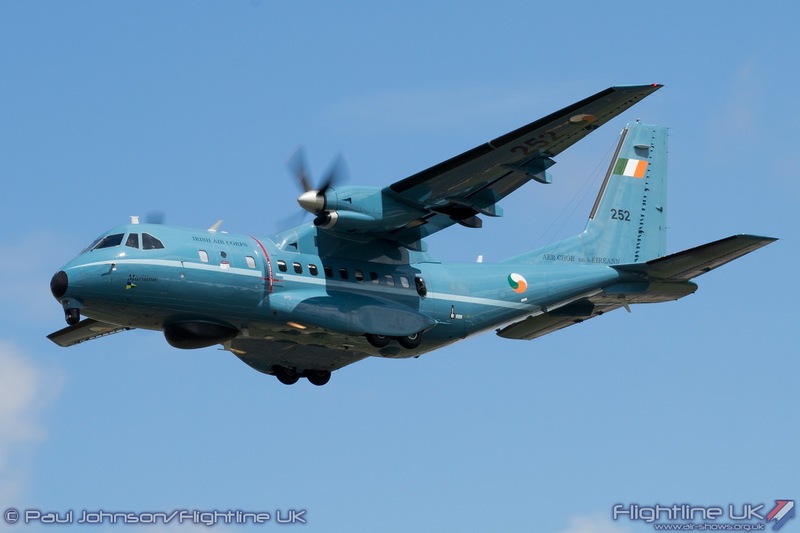 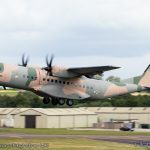 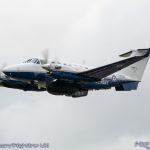 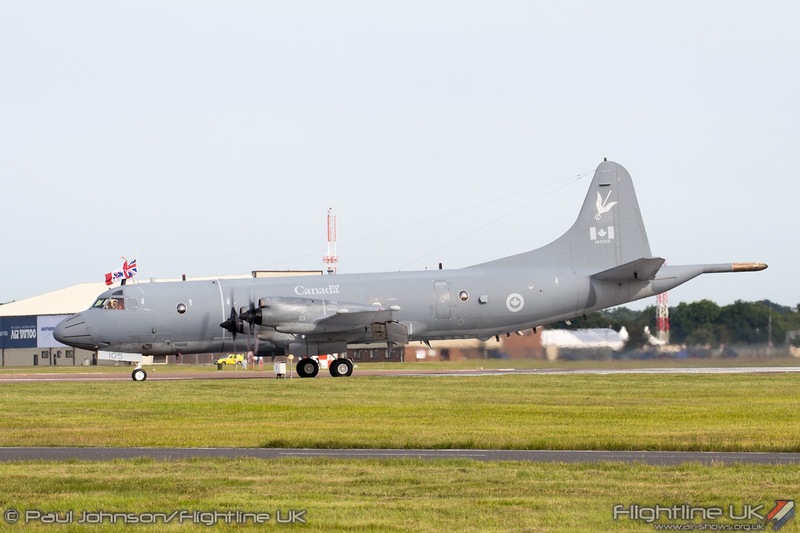 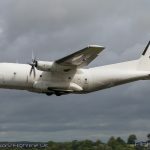 The Irish Air Corps also added to the CASA line-up with a CN235MP Persuader on show joining the Canadian CP-140 Aurora and German Navy P-3C Orion to highlight Martime Patrol Aircraft (MPA). 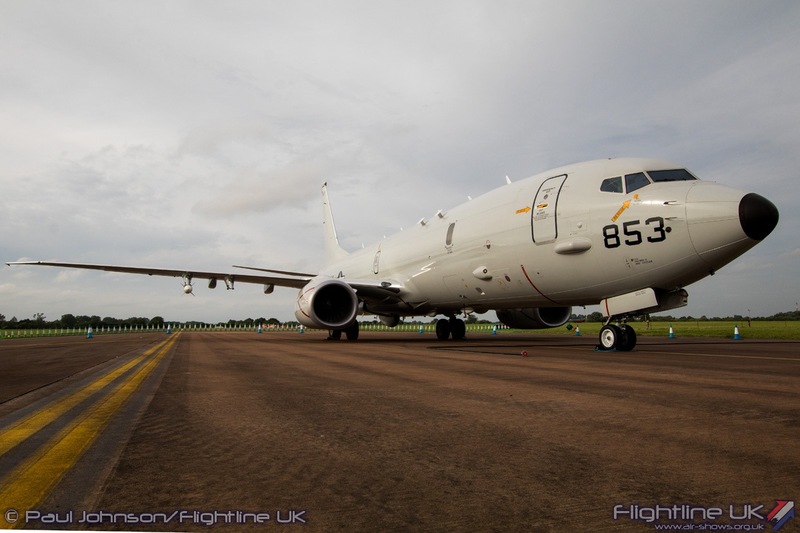 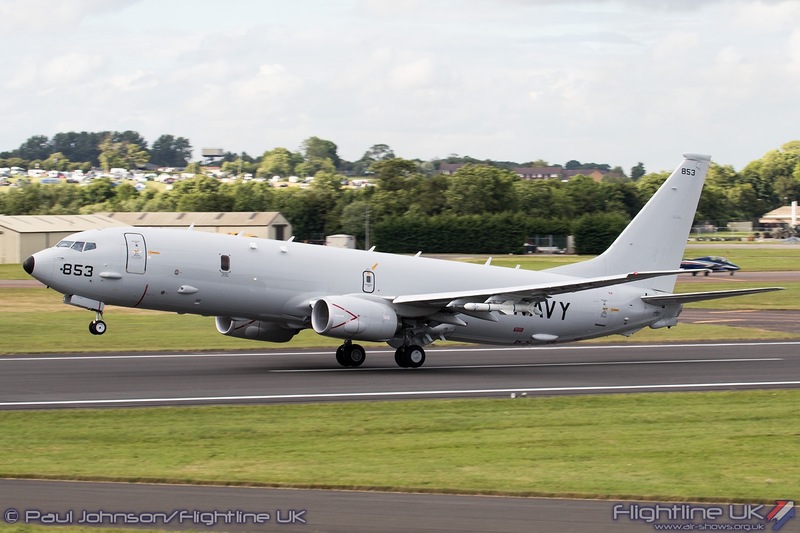 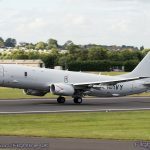 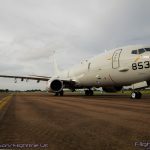 The RAF’s future MPA was also present in the form of a Boeing P-8A Posiedon from the US Navy. 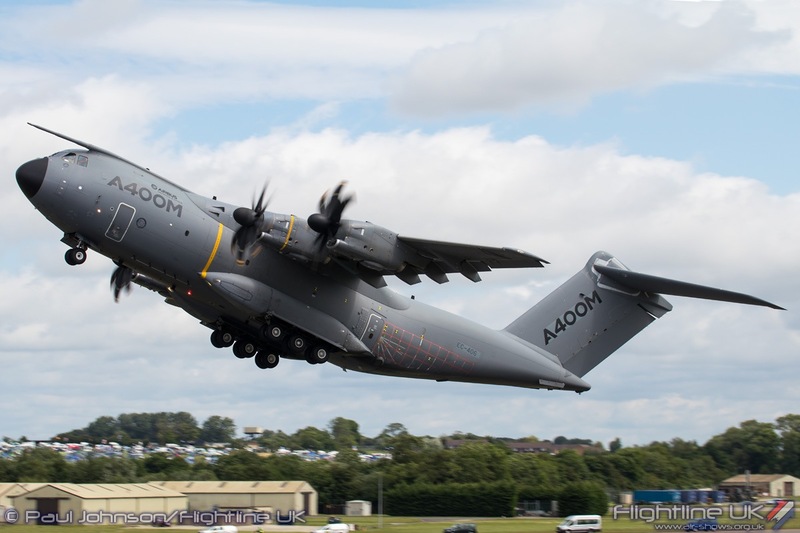 Effectively book-ending the static line were examples of the Airbus DS A400M Atlas. 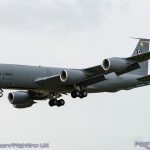 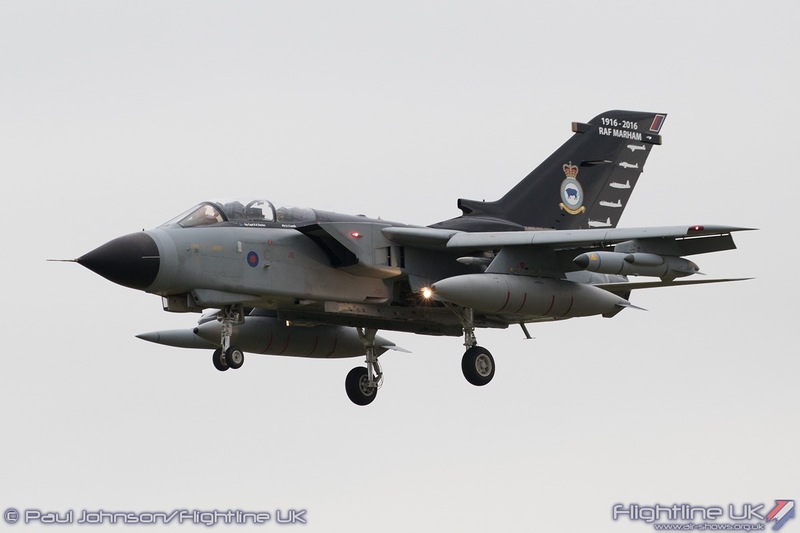 The Royal Air Force once again centred its ‘RAF Village’ around an aircraft from 70 Squadron based at nearby RAF Brize Norton. 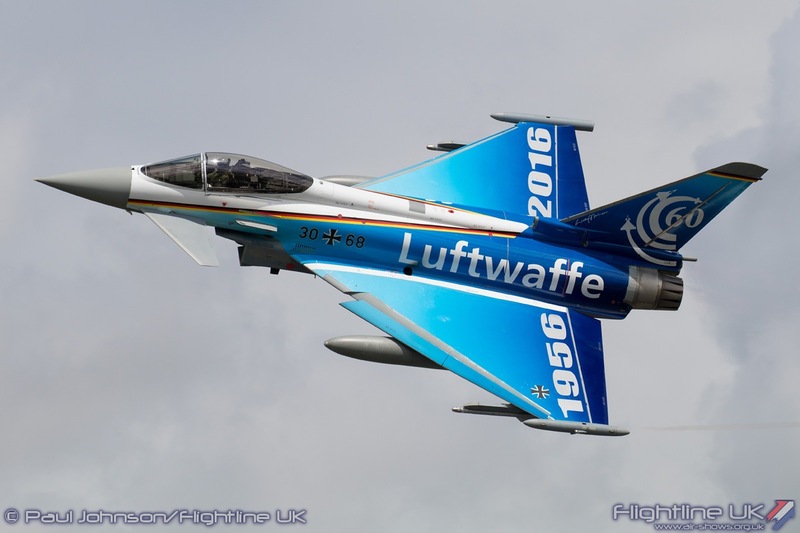 At the opposite end of the static line, the Luftwaffe provided the first overseas example to be officially on display at a UK airshow. 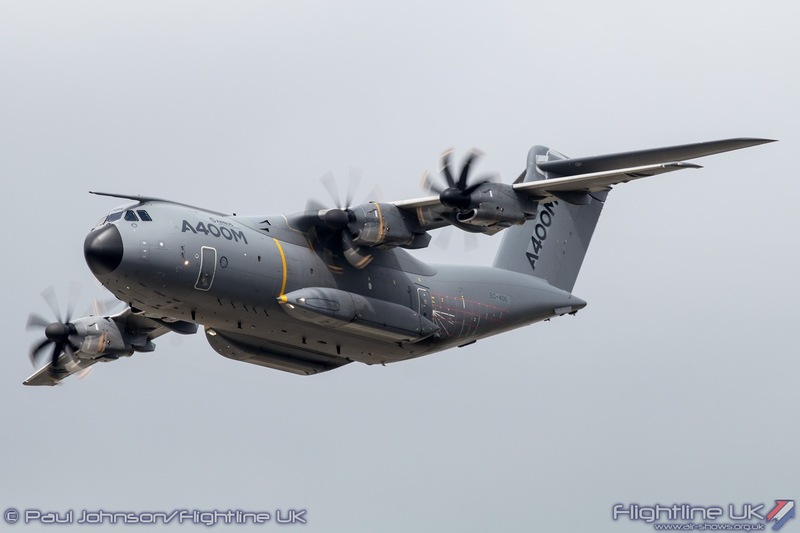 Alongside the Luftwaffe Atlas was one of the air arm’s Transall C-160Ds in an all-white UN scheme which the A400M will eventually replace. 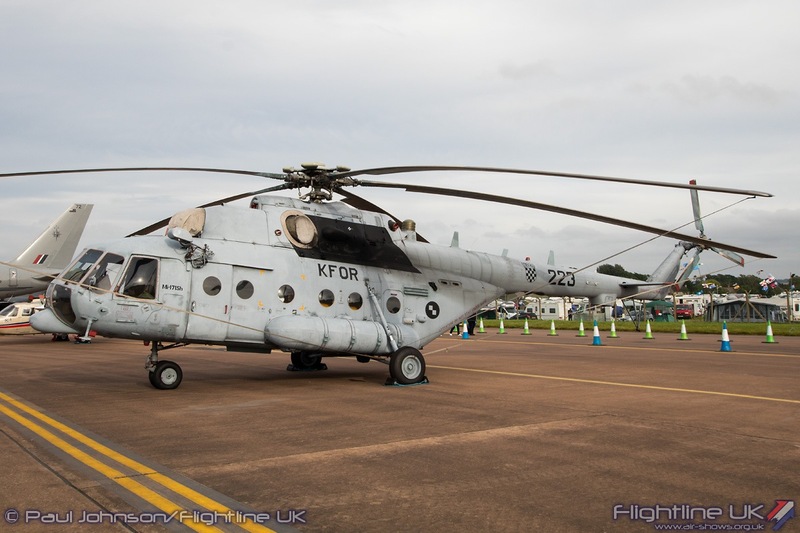 The Rotary content of the static display was notably down on previous years. 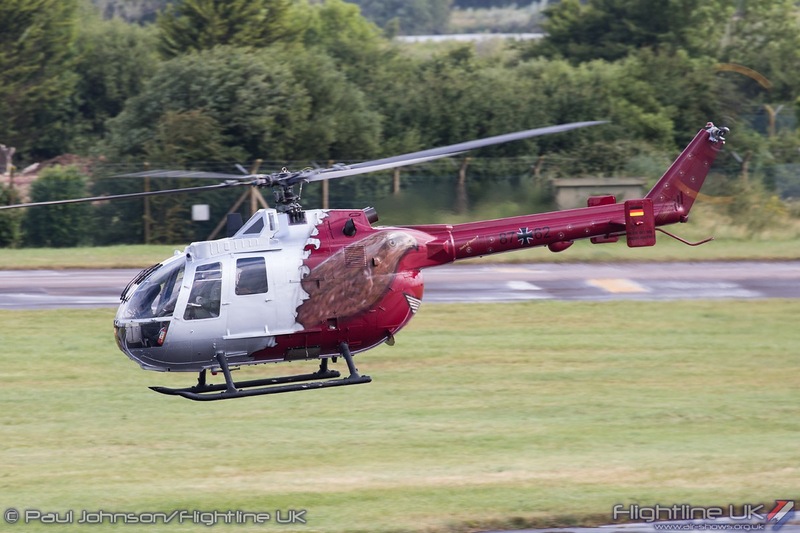 Just a sole example of the Airbus Helicopters Squirrel HT1 came from the Royal Air Force while the Army Air Corps just had a single AgustaWestland WAH-64D Apache AH1 on display. 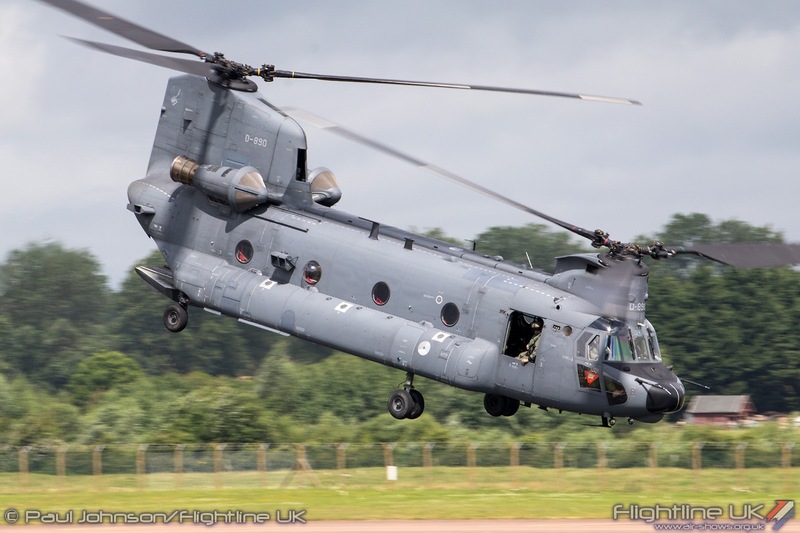 From overseas came the likes of the Royal Netherlands Air Force with a Boeing CH-47F Chinook, the German Army with a MBB Bo-105P1, the German Navy with an Airbus Helicopters H-135P2+ and the United States Air Force with a Bell/Boeing CV-22B Osprey from RAF Mildenhall. 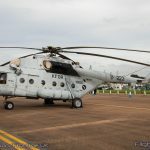 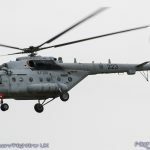 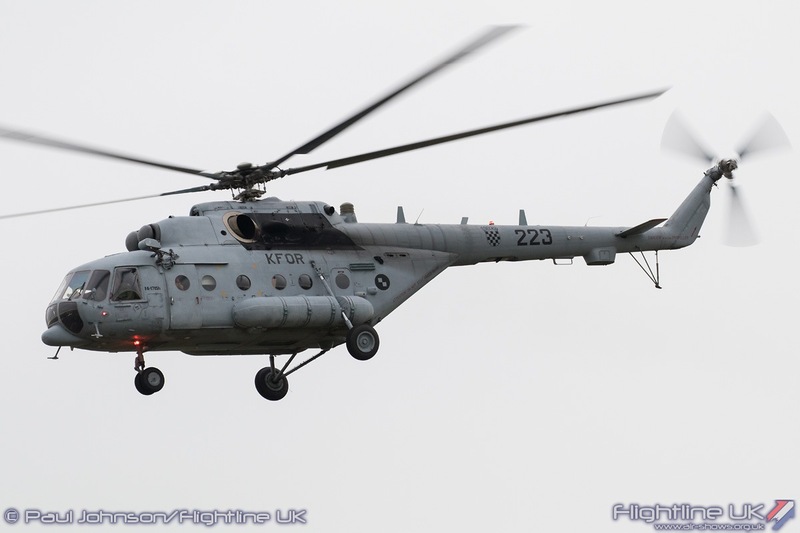 However, the star helicopter came from RIAT debutants, the Croatian Air Force with the Mil Mi-171Sh ‘Hip.’ This was actually the support aircraft for the Krila Oluje team and was a welcome piece of eastern-bloc machinery for the static display. 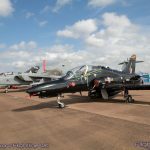 It is not just modern hardware on show in the RIAT static display. 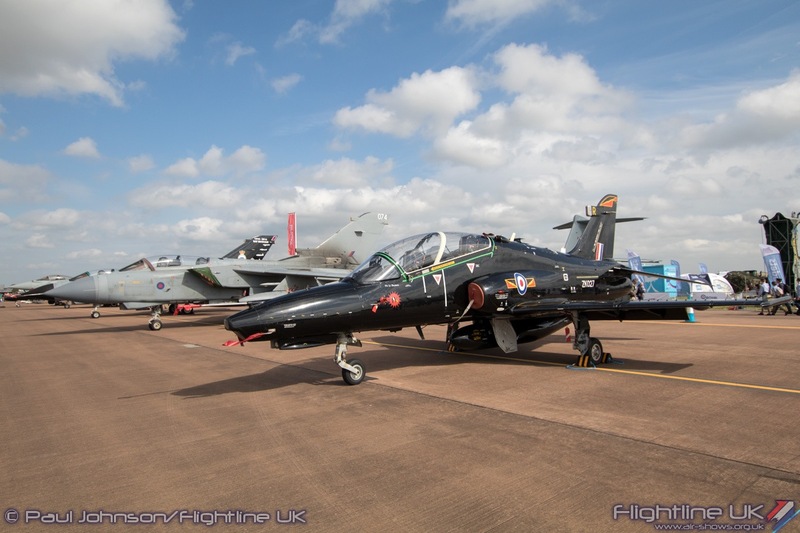 The ‘Vintage Village’ area became a focal point for two of the smaller historical themes that RIAT celebrated. 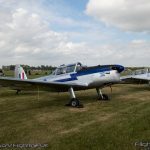 There was a lovely collection of de Havilland Canada DHC-1 Chipmunks lined up to celebrate the 70th Anniversary of the type. 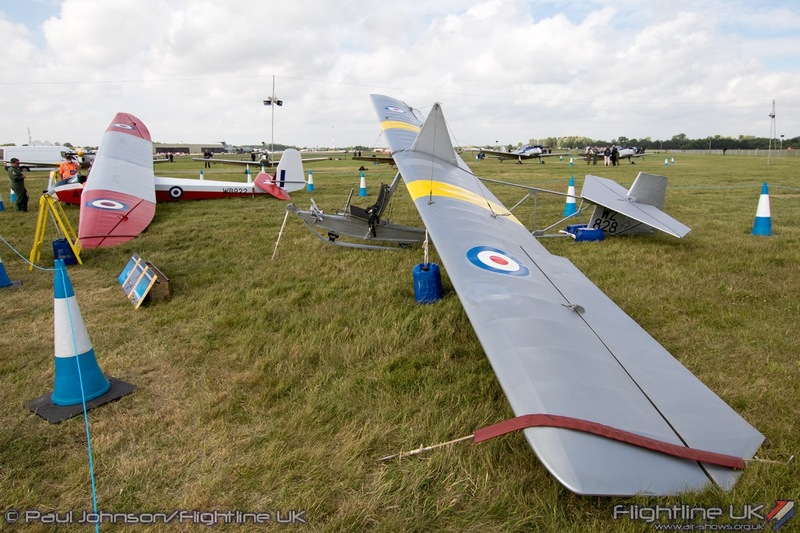 There was also a superb collection of vintage gliders alongside them supporting the Air Cadat 75th celebrations. 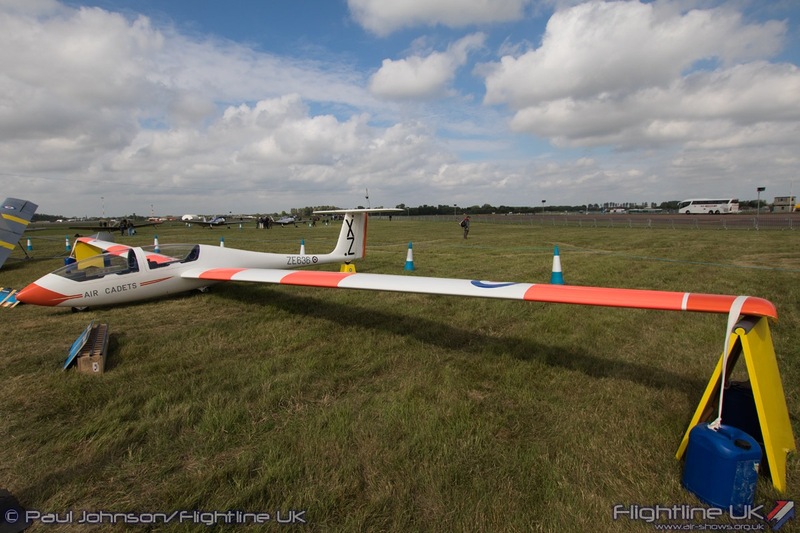 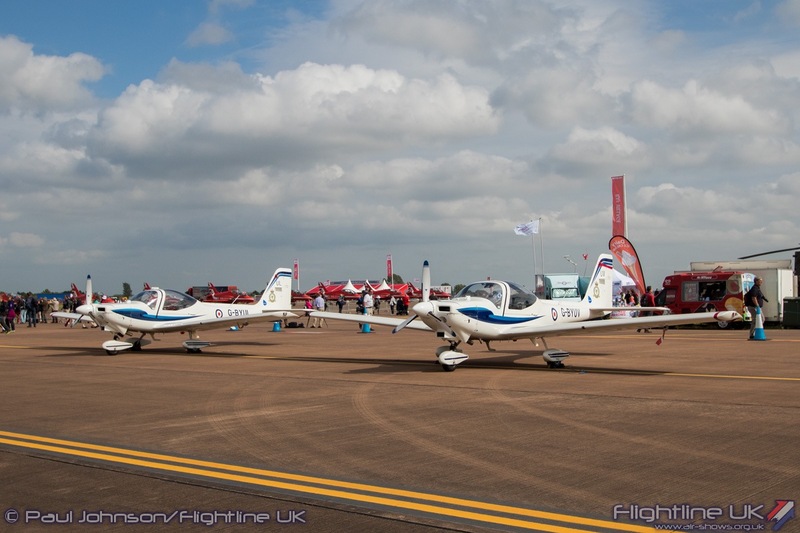 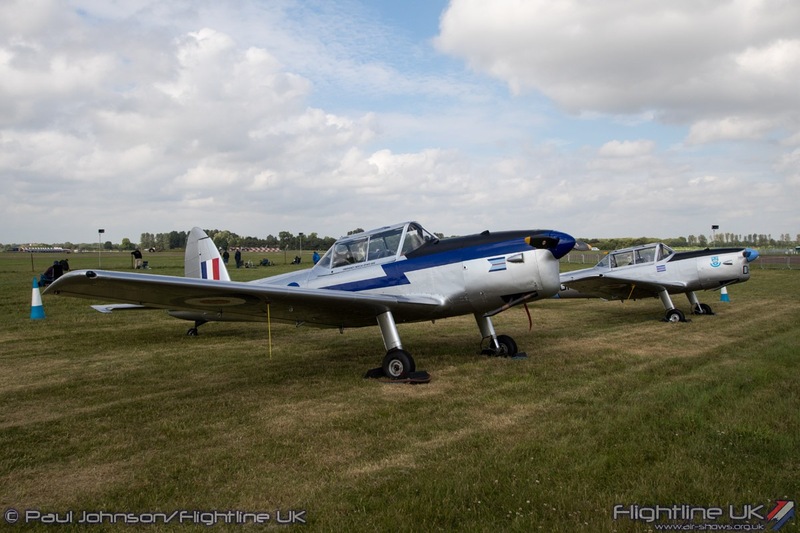 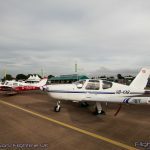 Examples of the Slingsby Venture T1, Kirby Kadet, Slingsby Sedburgh and Slingsby Grasshopper were on show alongside the modern Grob Viking T1 and Vigilant T1. 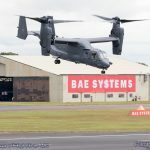 Main event sponsors BAE Systems made a big contribution to the historic side with their own Heritage Village. 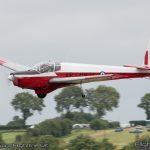 This area again celebrated Air Cadets and pilot training with examples of de Havilland DH60 Cirrus Moth, Blackburn B2, Avro C19 Anson, Chipmunk T10 and SA Bulldog T1. 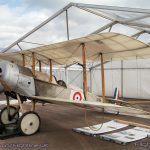 There was also a nod to the development of naval air power with the Bremner Brother’s Bristol Scout alongside the Shuttleworth Collection’s Hawker Sea Hurricane Ib. 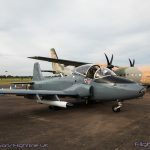 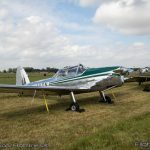 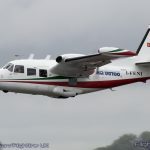 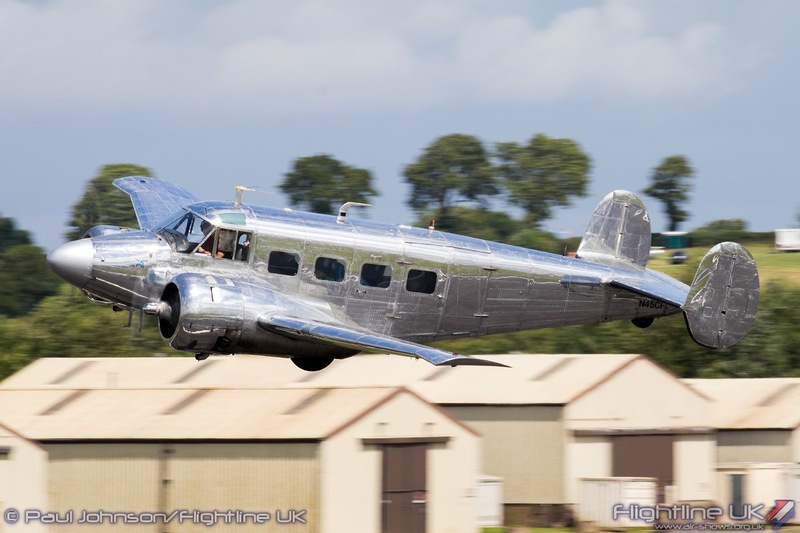 Other historic airframes in the static displays included Jeff Bell’s BAC Jet Provost T5, Carlo Ferrari’s Beech 18S, the Bronco Demo Team’s North American OV-10B Bronco and Shorts SC7 Skyvan plus I Fenicotteri’s Piaggio P166C. 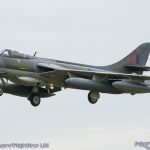 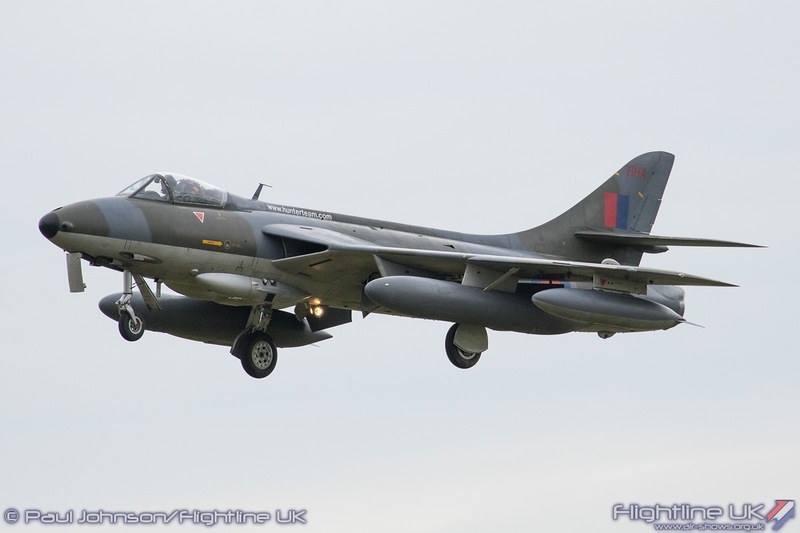 Defence contractor Hawker Hunter Aviation made a very rare public appearance at the show with one of their Hawker Hunter F58a aircraft. 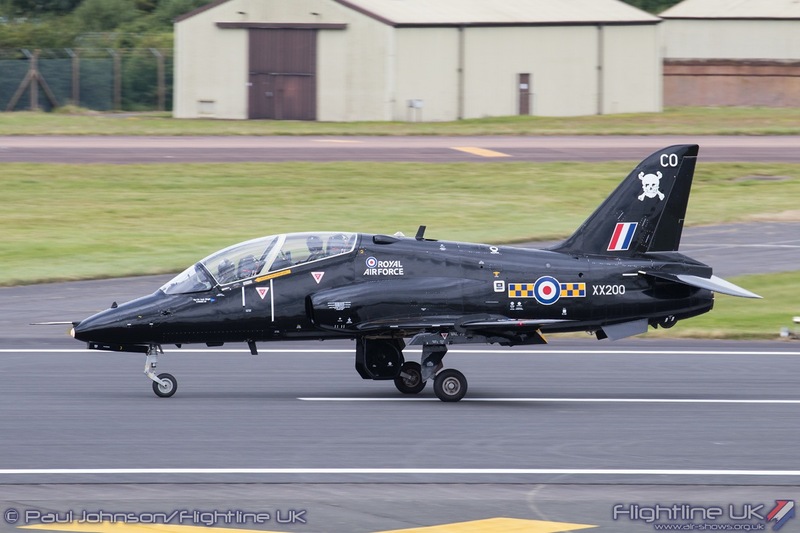 Kept on the military register, these aircraft are used for a wide variety of contracts with the Ministry of Defence and HAA had a range of equipment on display around the Hunter to highlight the various roles they perform. 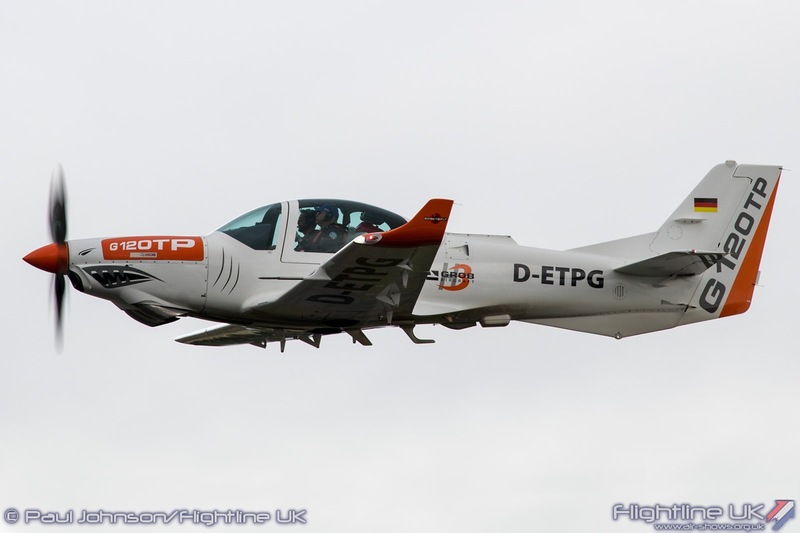 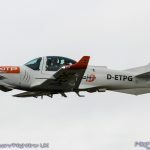 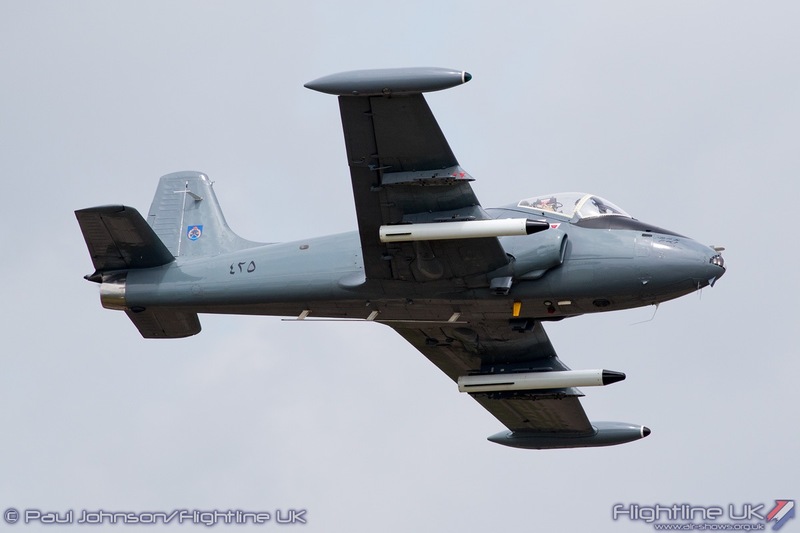 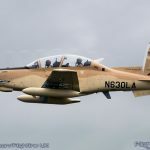 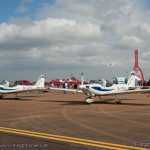 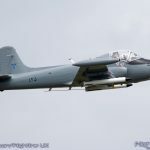 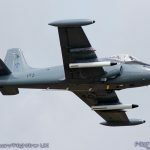 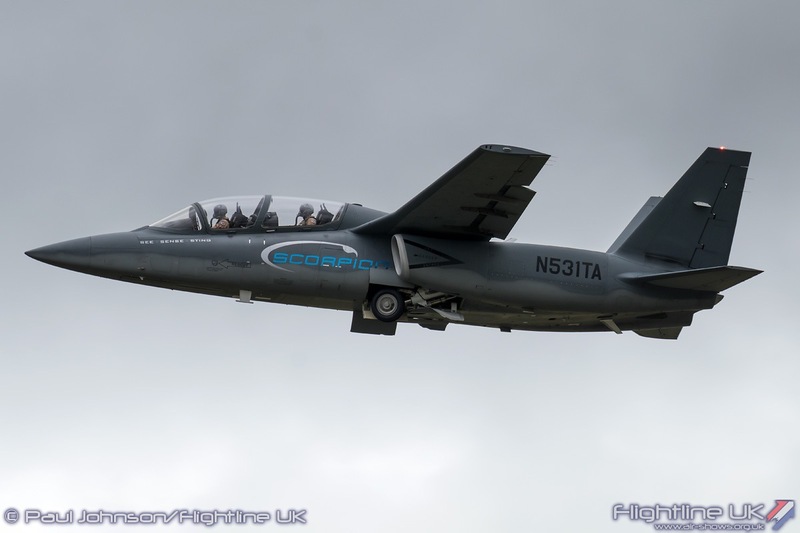 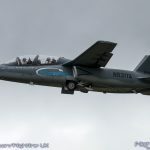 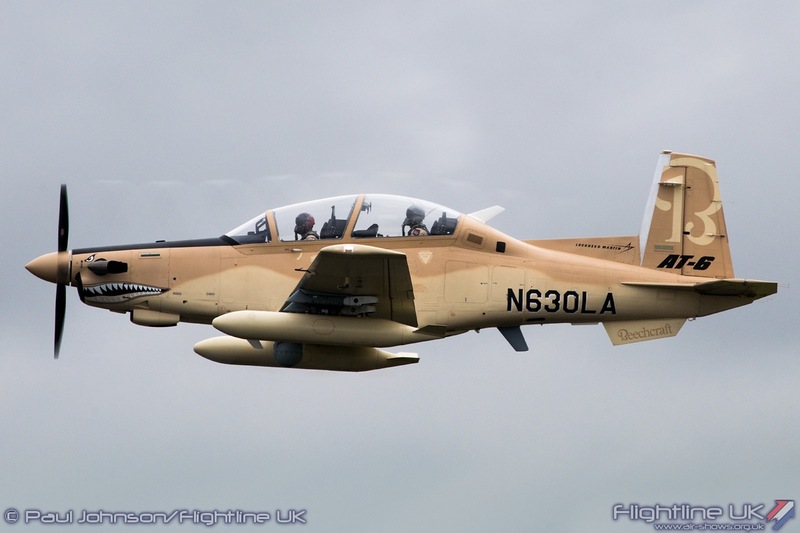 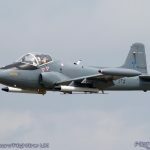 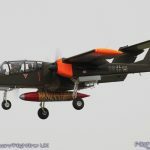 The future of the Military Flying Training System contract was also represented with examples of the Grob 120TP and Hawker Beechcraft AT-6C in the static. 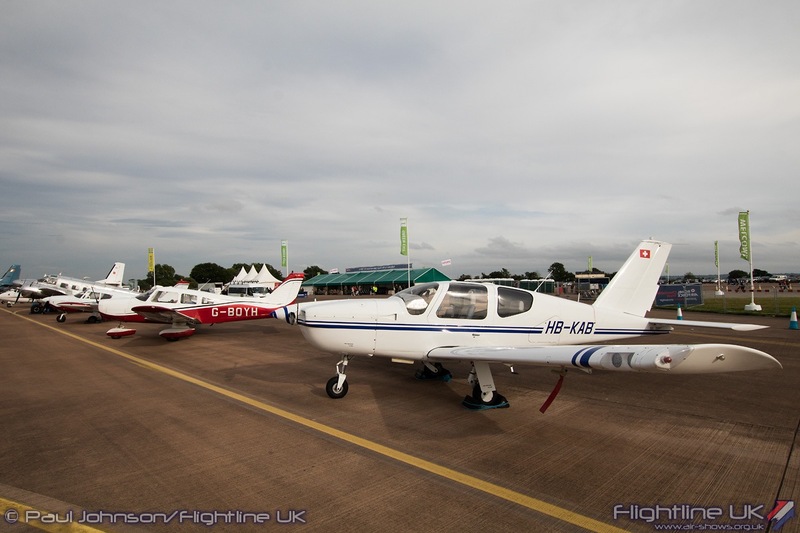 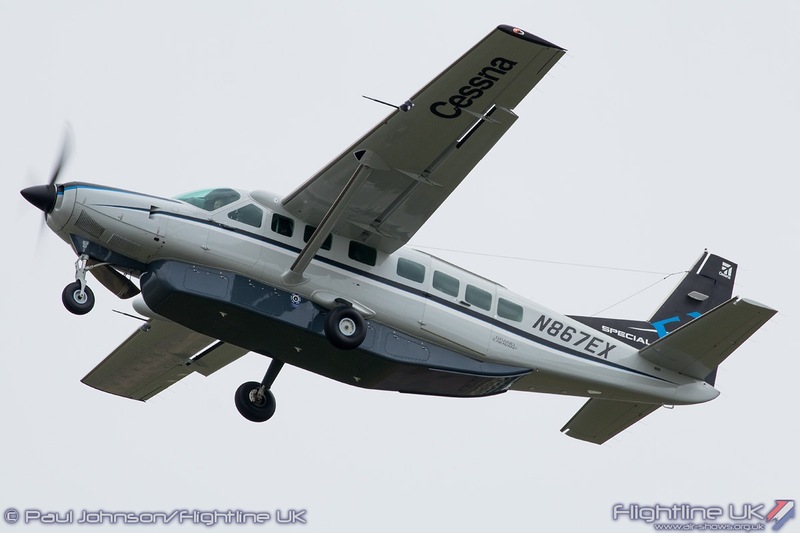 Hawker Beechcraft also showed off their special missions Cessna 208 and King Air 350i. 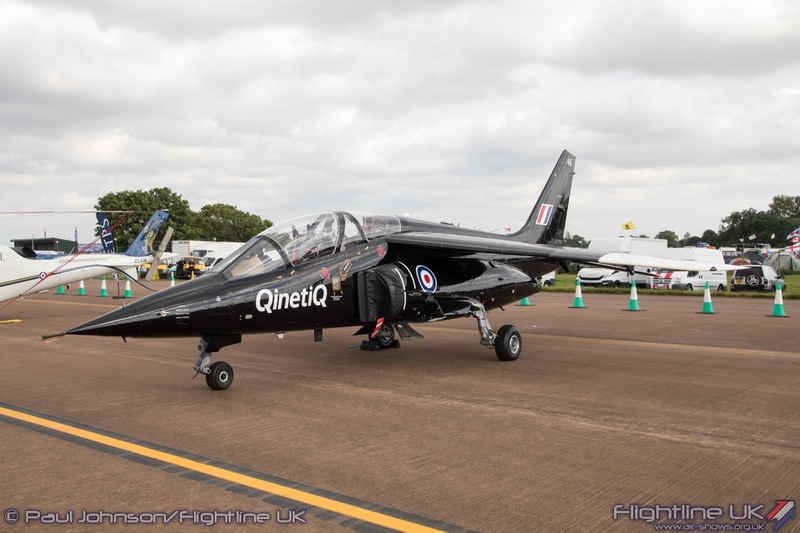 QinetiQ, based at Boscombe Down just a few miles south of Fairford are always good supportes of the Tattoo. 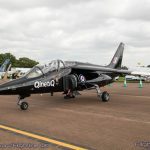 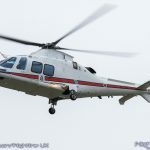 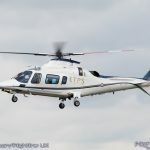 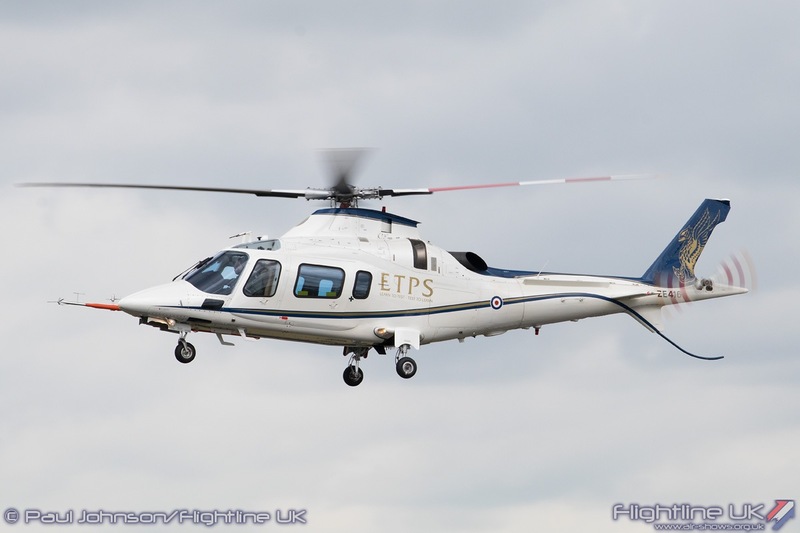 Representing the important work they do for military flight testing, they displayed an Agusta A109E Power and Dassault-Dornier Alpha Jet A as part of the static displays. 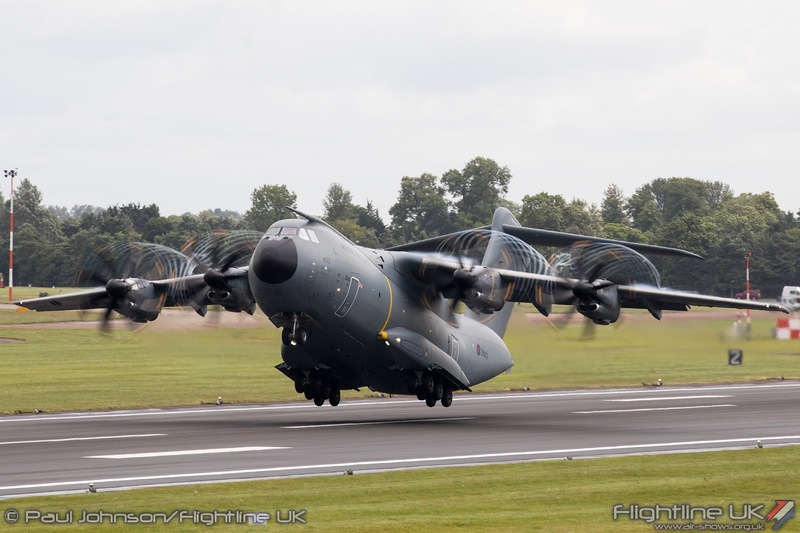 While the A400M Atlas was the centrepiece of the RAF Village, immediately outside were a number of current RAF types. 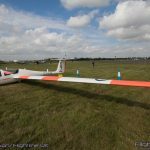 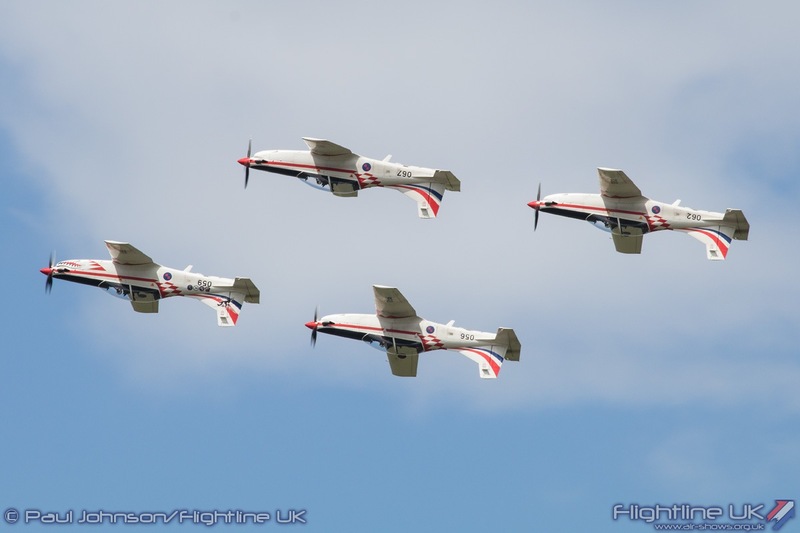 Current training was represented by a pair of Southampton UAS Grob Tutor T1s, a No 72[R] Squadron Shorts Tucano T1, 100 Squadron BAE Systems Hawk T1, IV[R] Squadron BAE Systems Hawk T2 and a 45[R] Squadron Beechcraft King Air B200. 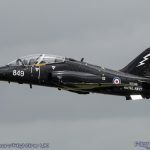 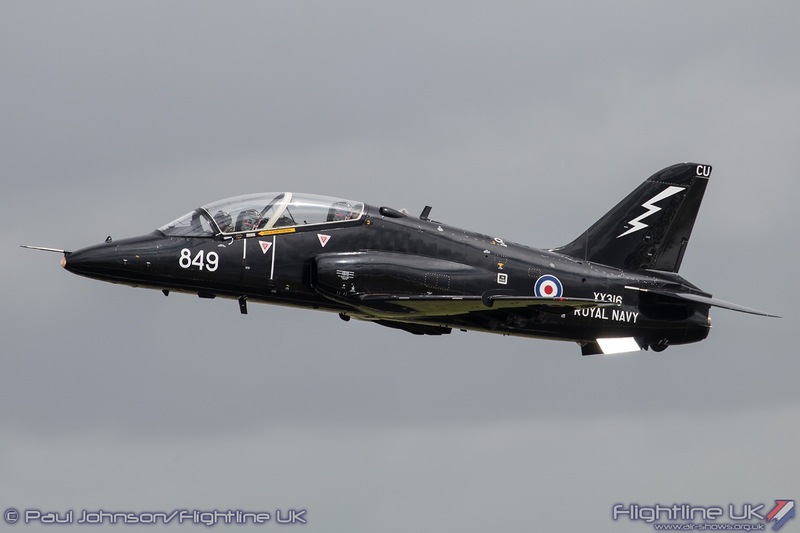 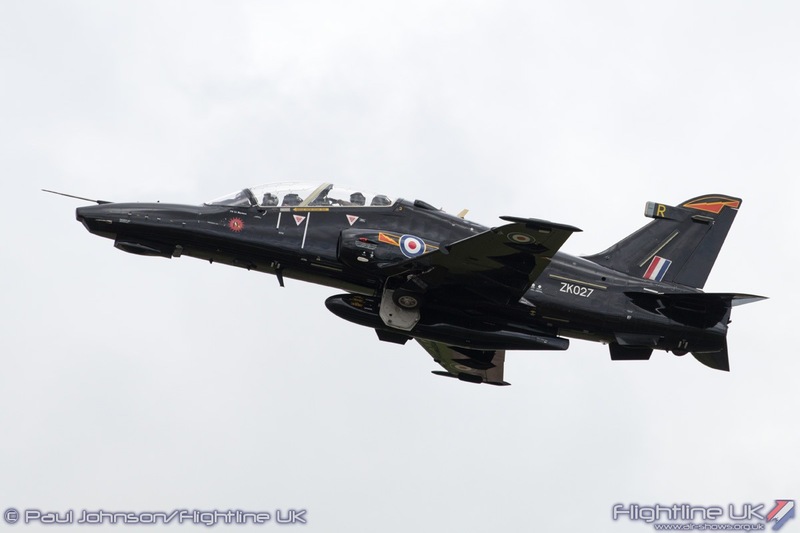 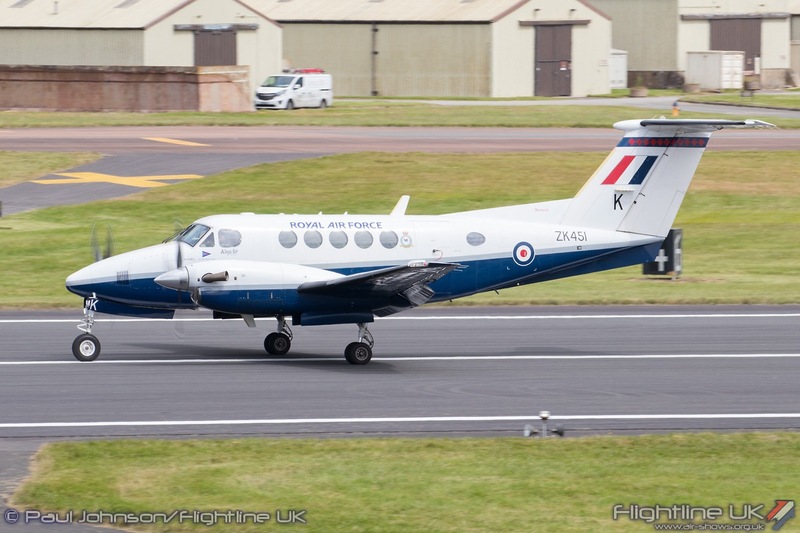 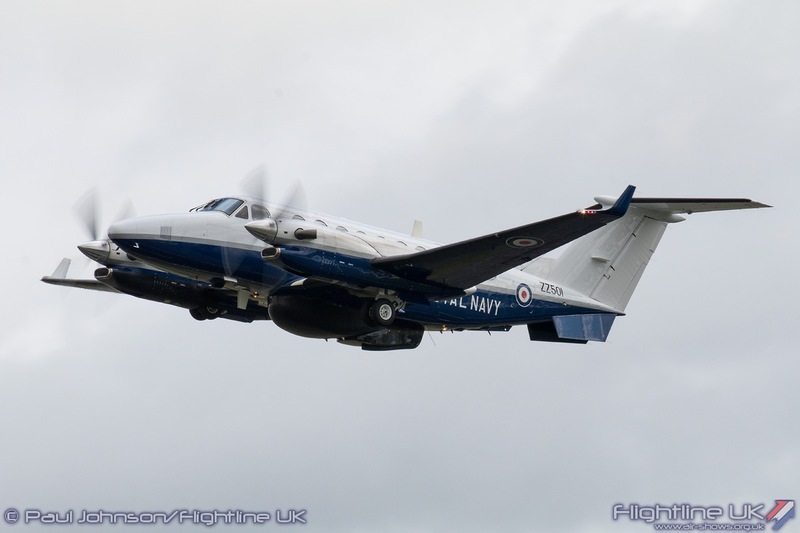 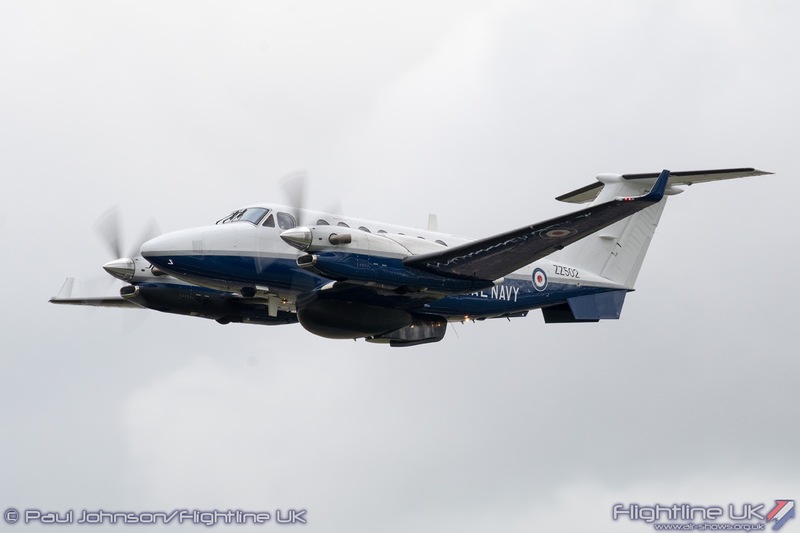 The Royal Navy also had a pair of fixed wing training aircraft alongside their RAF equivalents with a 736NAS BAE Systems Hawk T1 and 750NAS Beechcraft Avenger T1 in the eastern static display area. 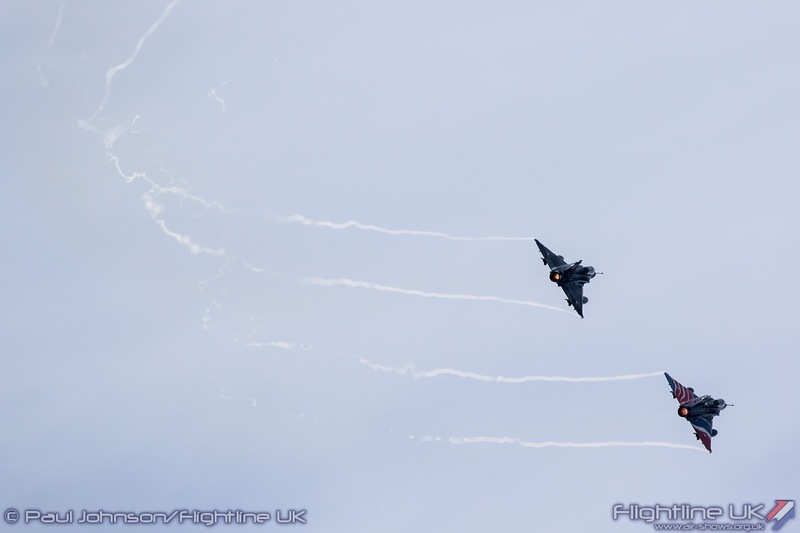 The frontline fast jets were well represented with a pair of Panavia Tornado GR4s from Nos XV and 31 Squadrons plus a 41[R] Squadron Eurofighter Typhoon FGR4 in elegant centenary markings. 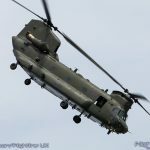 Slightly letting the side down however was the absence of any RAF assets from Joint Helicopter Command in the static area. 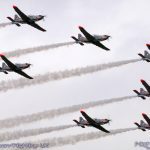 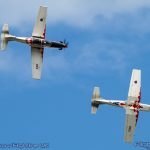 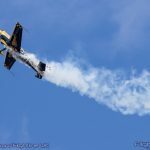 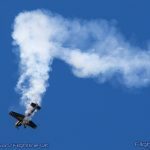 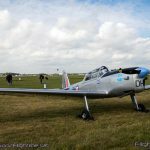 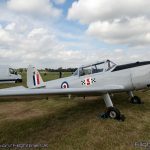 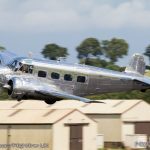 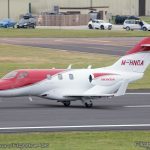 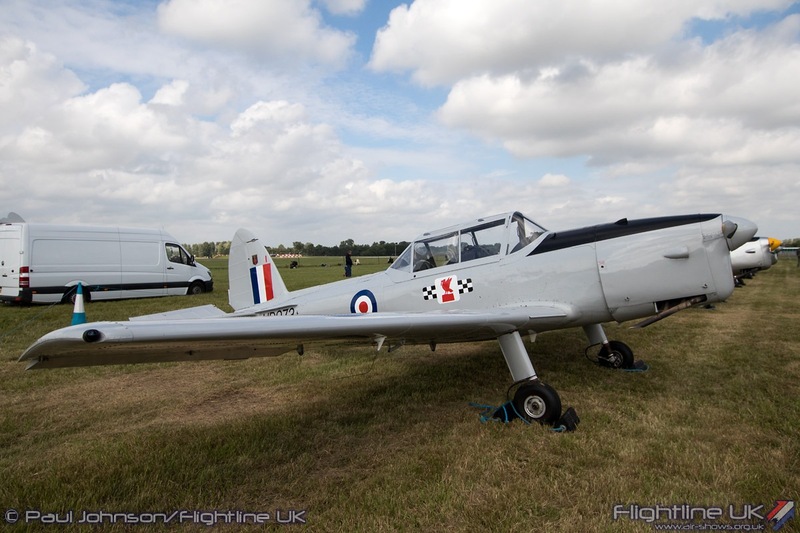 JHC airshow participation in 2016 has been somewhat chaotic to a bizarre pricing structure and paperwork issues that had led to many airshows being unable to support them. 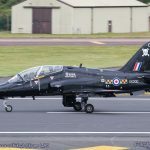 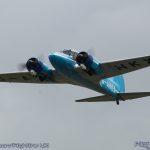 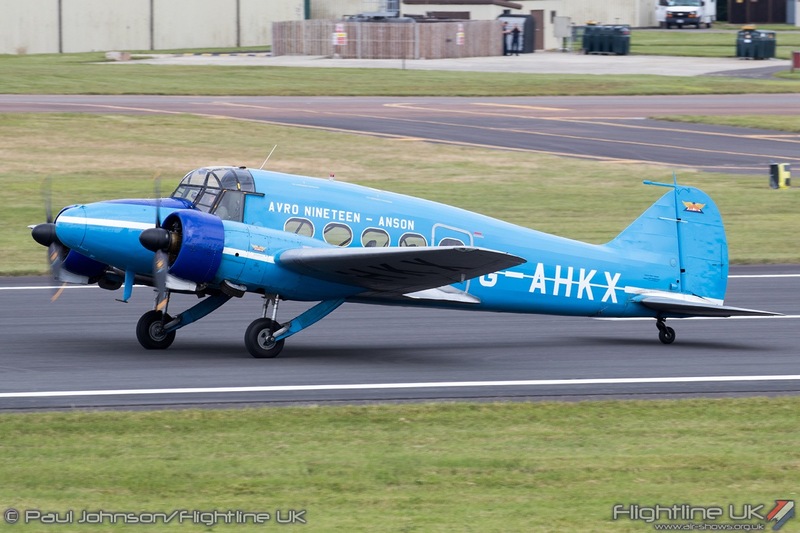 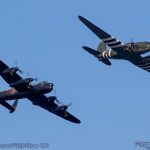 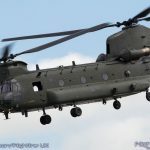 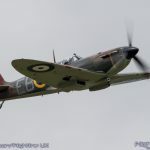 Though RIAT somehow managed to pull together one JHC flying asset and a single aircraft from the Army Air Corps, the lack of JHC aircraft was one of the contribting factors to a lower than normal RAF, Royal Navy and Army Air Corps presence at the show. 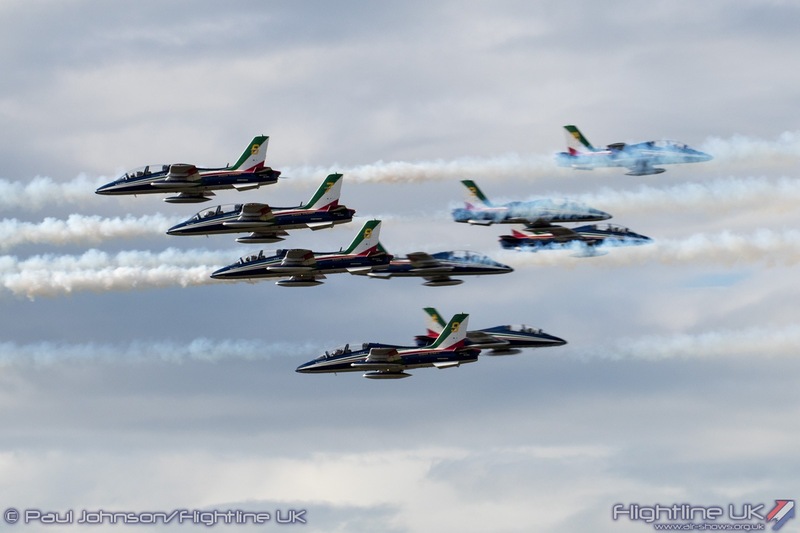 The central static area provided a feast of international fast jets. 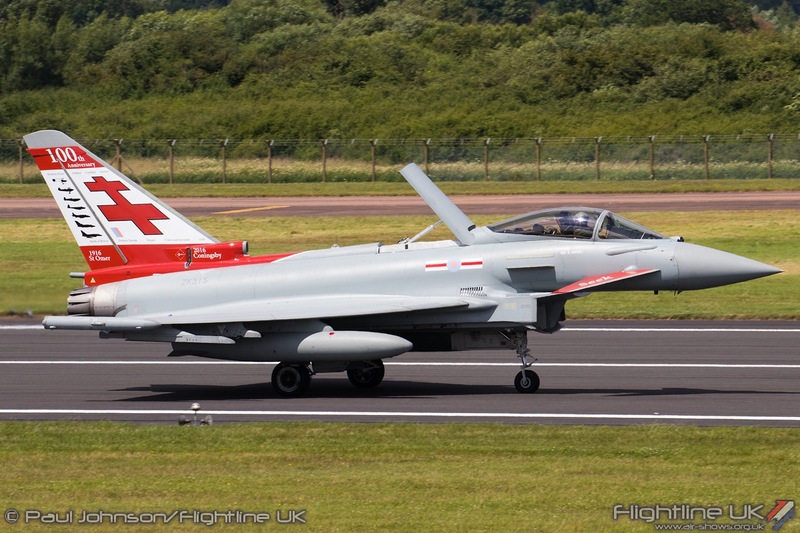 Alongside the static RAF Typhoon were seven more Typhoons or EF2000s representing all the original partner nations. 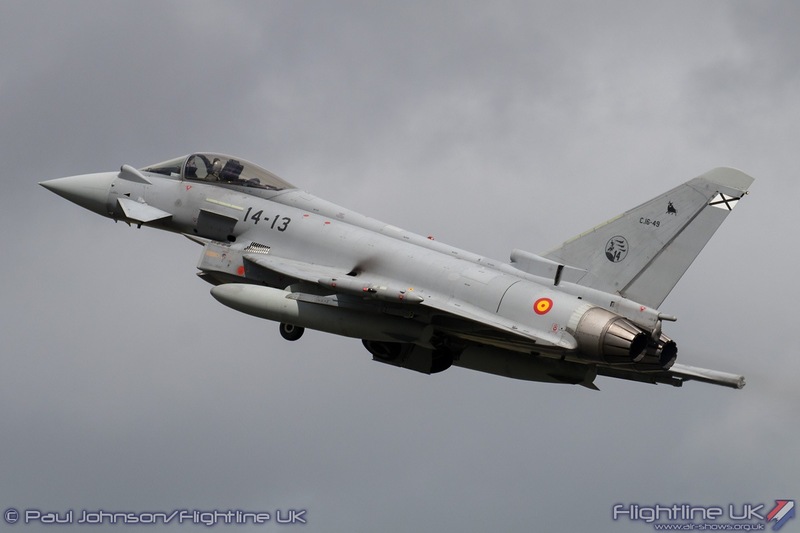 Spain and Italy has single examples of C.16 Typhoon and F-2000A Typhoon respectively. 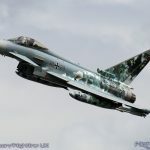 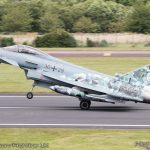 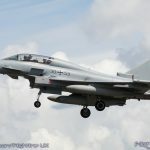 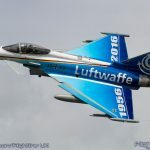 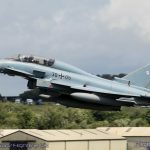 The Luftwaffe however had no less than four EF2000 or EF2000Ts in the display helping to mark the 60th Anniversary of the modern day air arm. 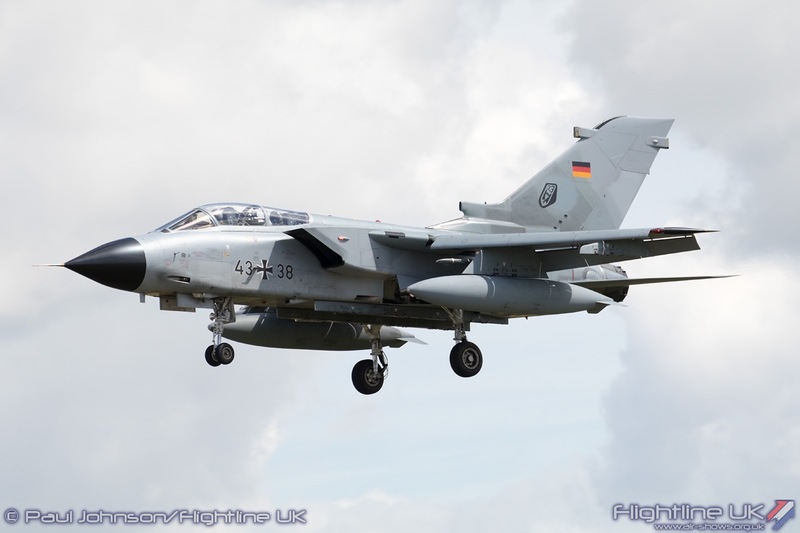 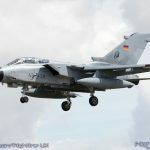 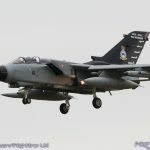 In particular, there was the blue and white 60 years aircraft plus ‘The Cyber Tiger.’ Adding to the Luftwaffe jet contribution were a pair of Panavia Tornado IDS. 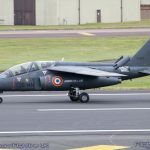 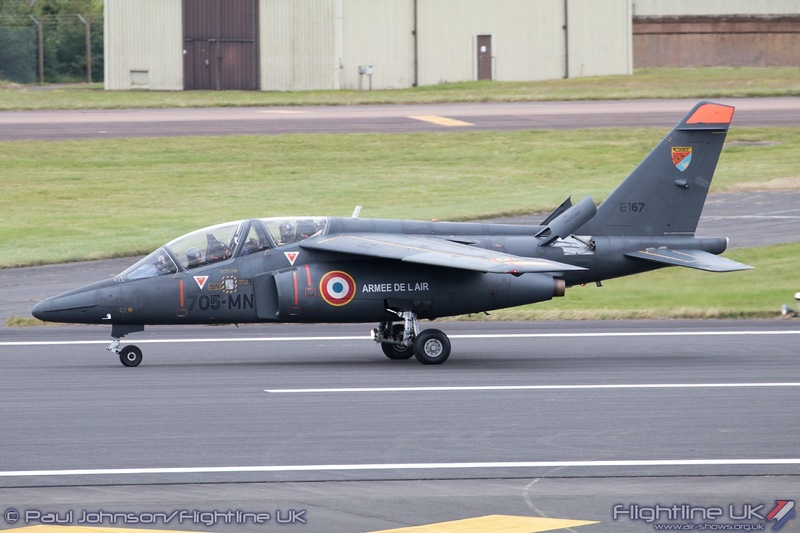 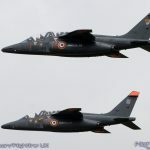 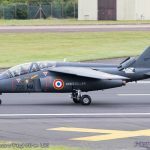 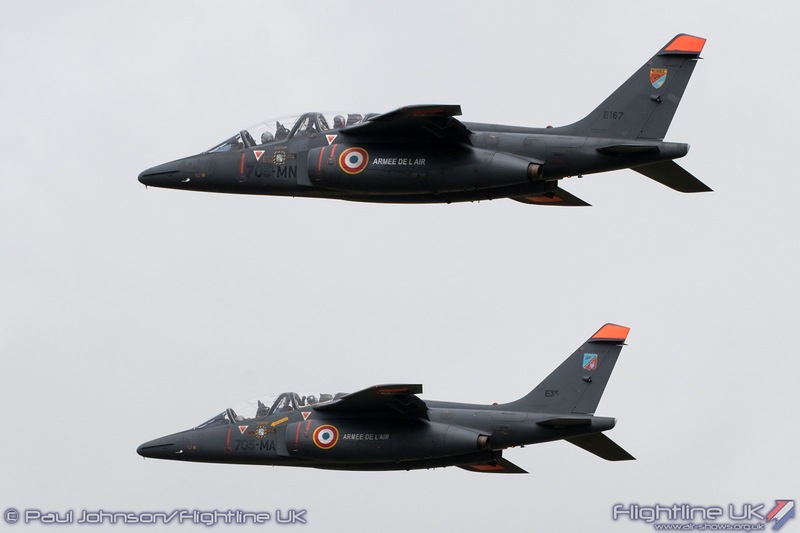 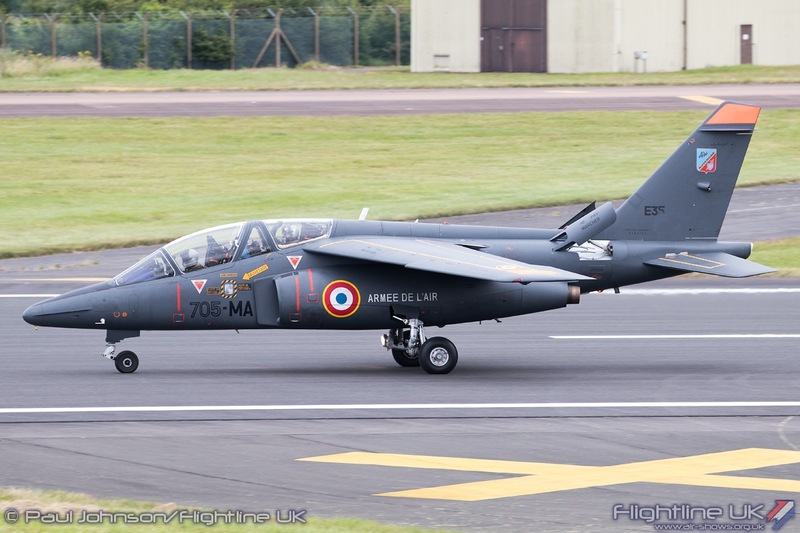 The European theme of jets was continued with a pair of Dassault Alpha Jet Es from the French Air Force. 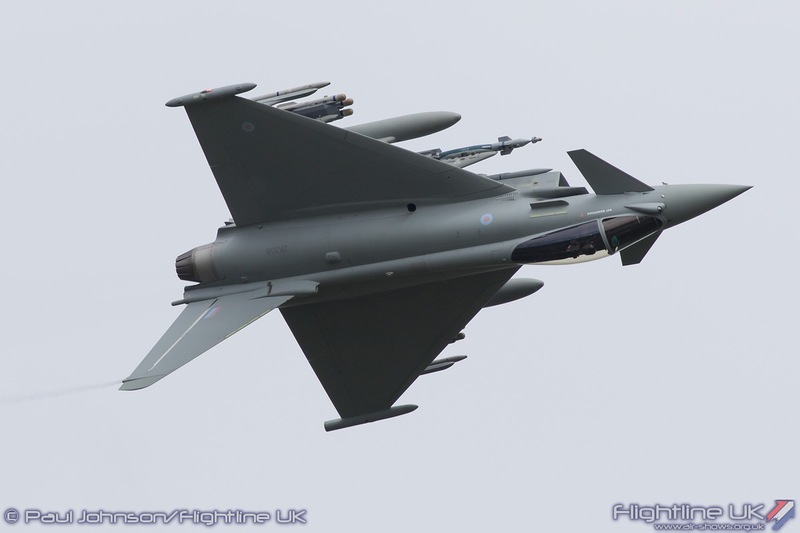 Opposite the Typhoons was a line-up of US designed fighters. 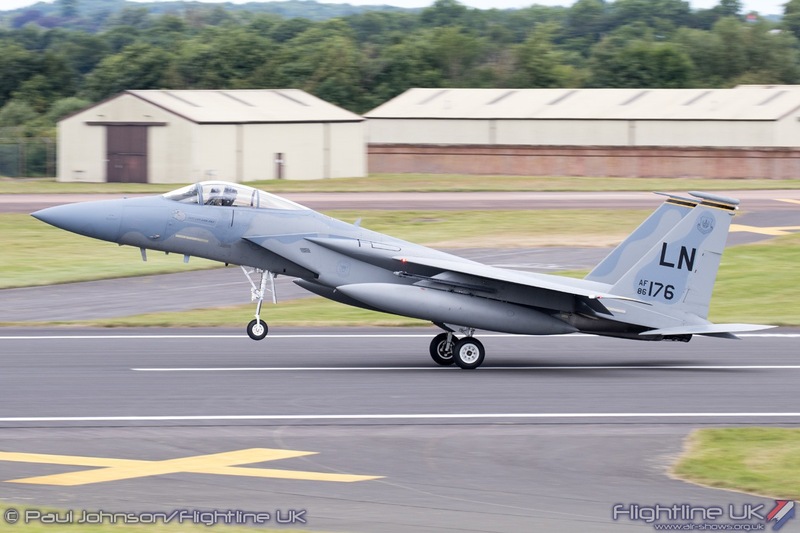 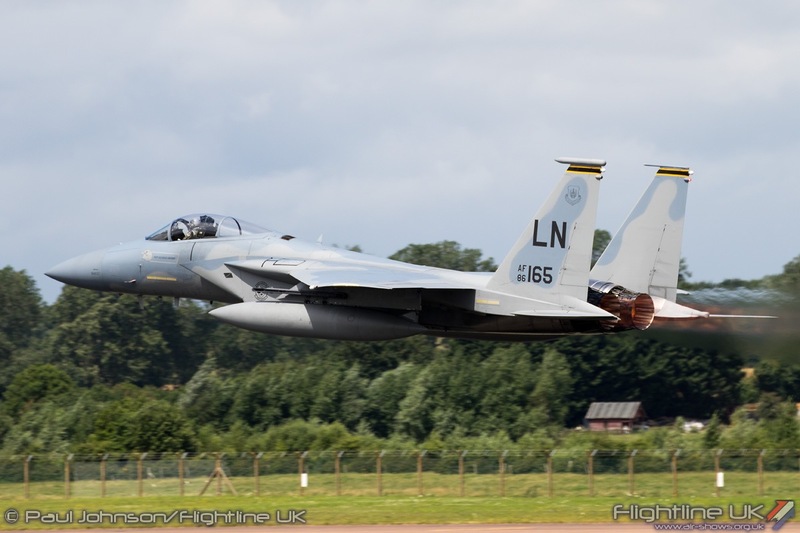 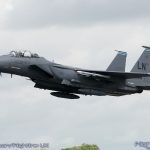 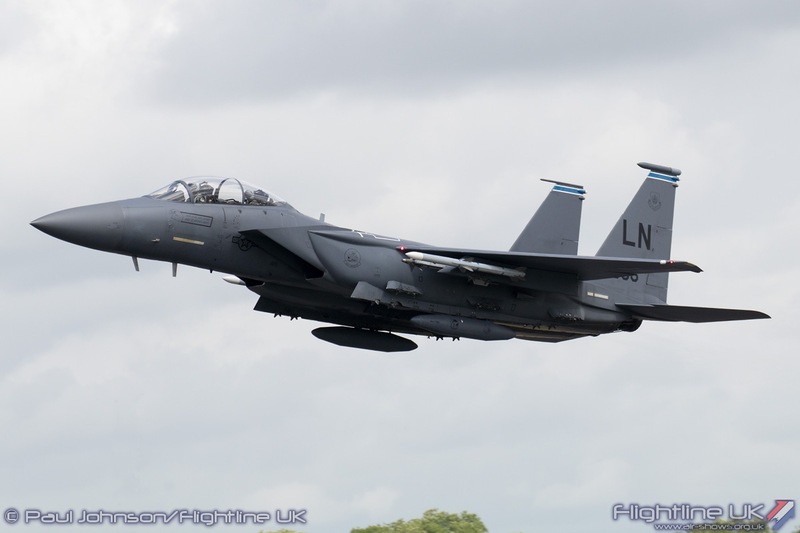 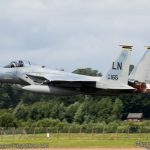 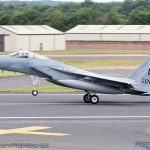 The 48th Fighter Wing at RAF Lakenheath contributed a pair of McDonnell Douglas F-15C Eagles and a single example of the F-15E Strike Eagle. 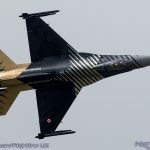 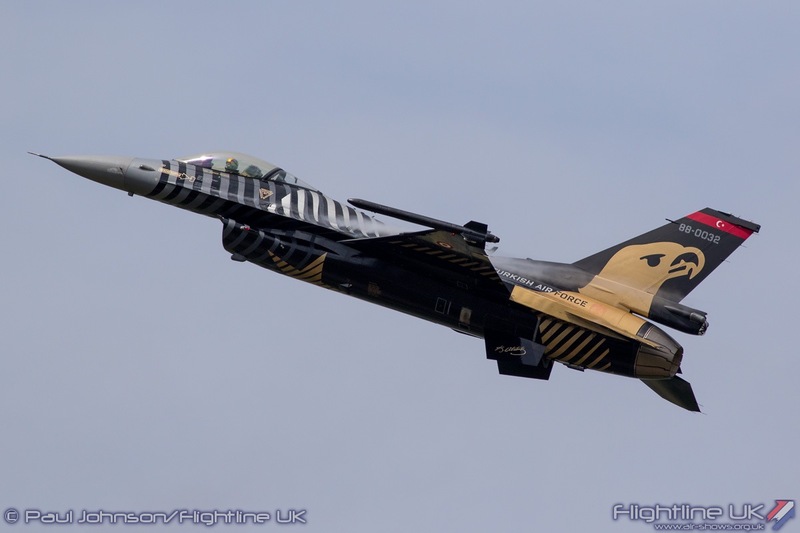 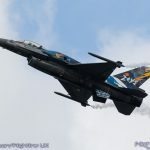 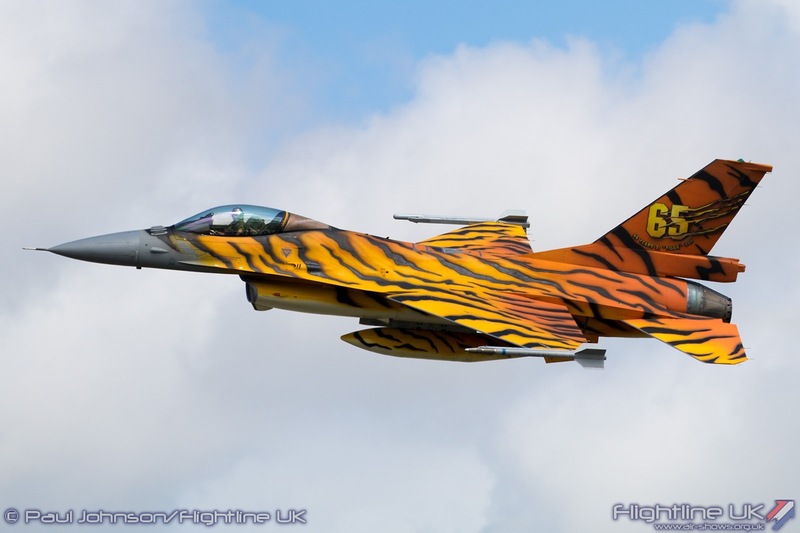 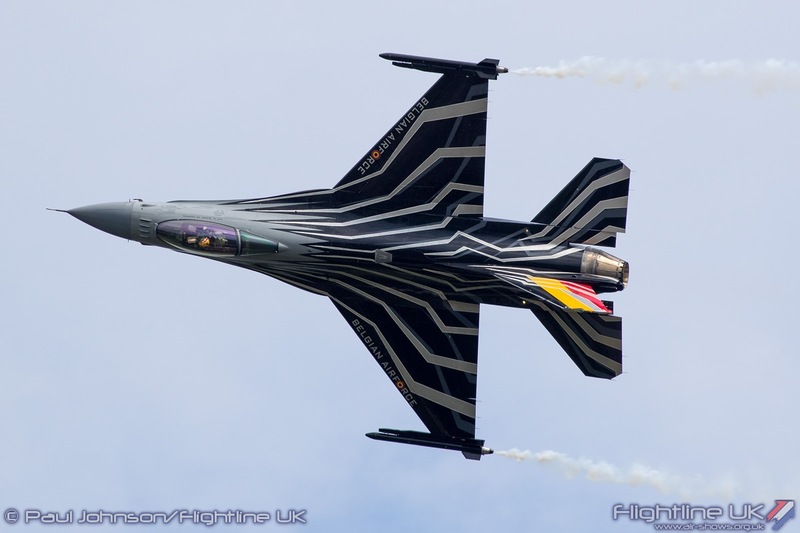 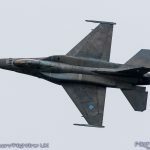 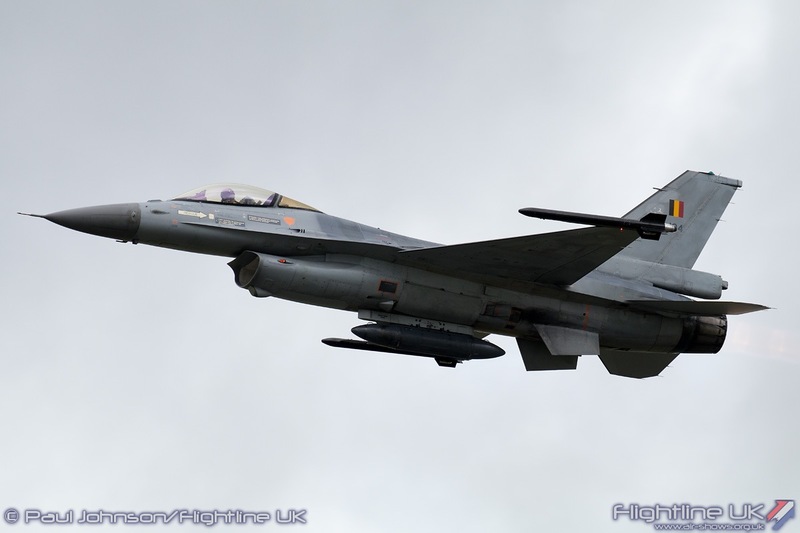 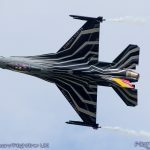 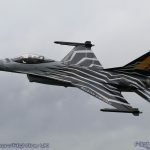 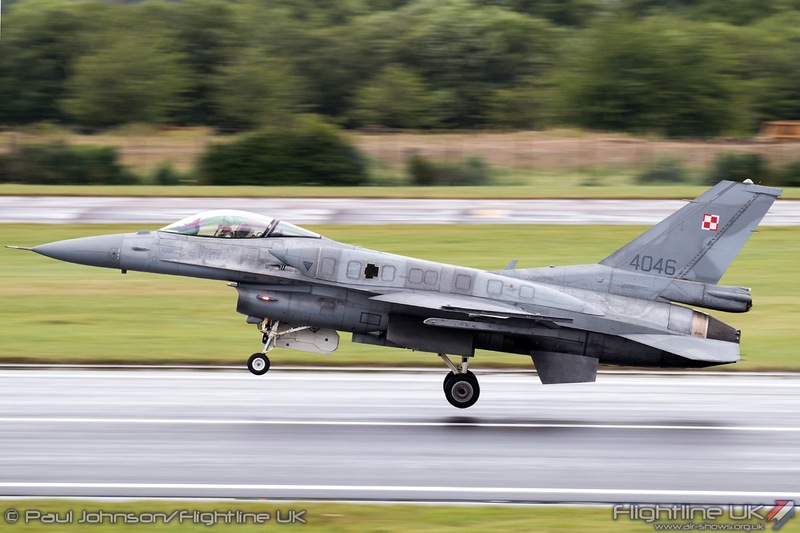 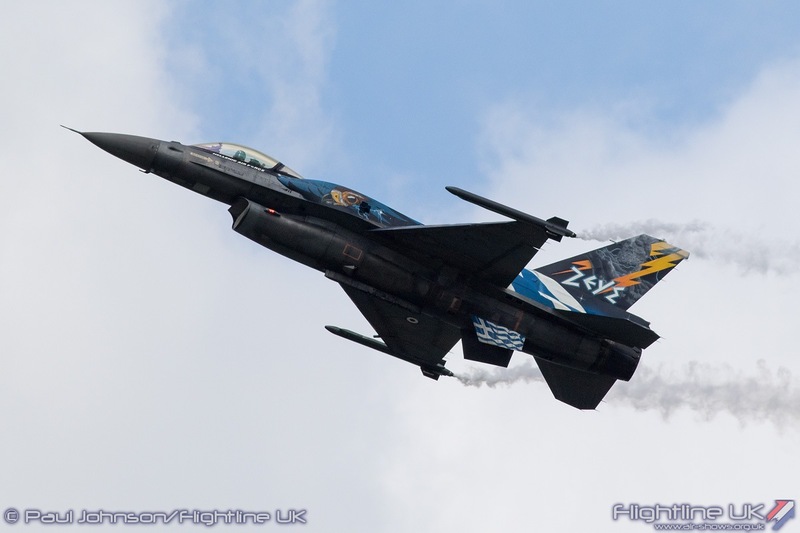 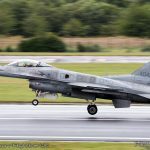 Alongside was the only Lockheed Martin F-16AM Fighting Falcon in the static display, but it was the very colourful tiger-schemed aircraft from No 31 Squadron of the Belgian Air Force based at Kliene Brogel. 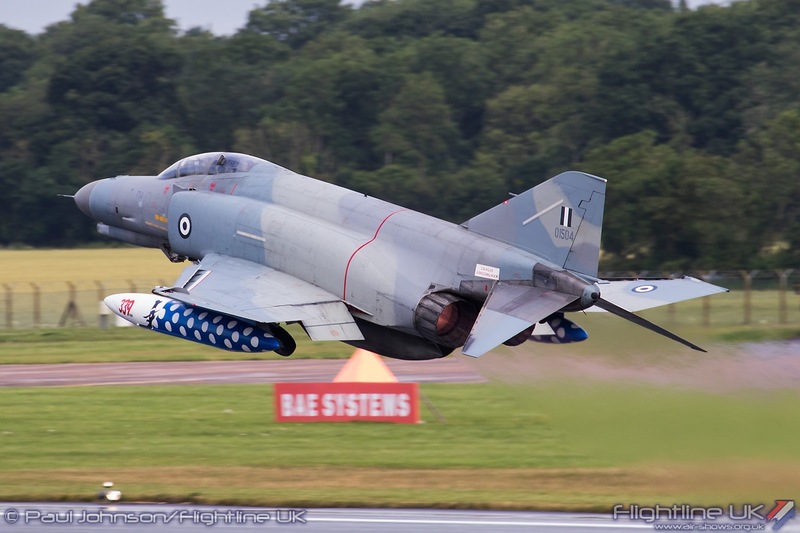 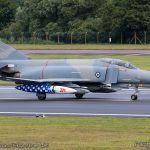 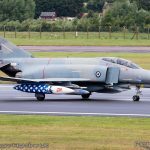 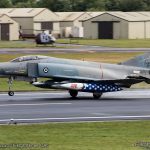 However the stars of the static display were a pair of McDonnell Douglas F-4E(AUP) Phantom IIs from the Hellenic Air Force. 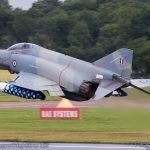 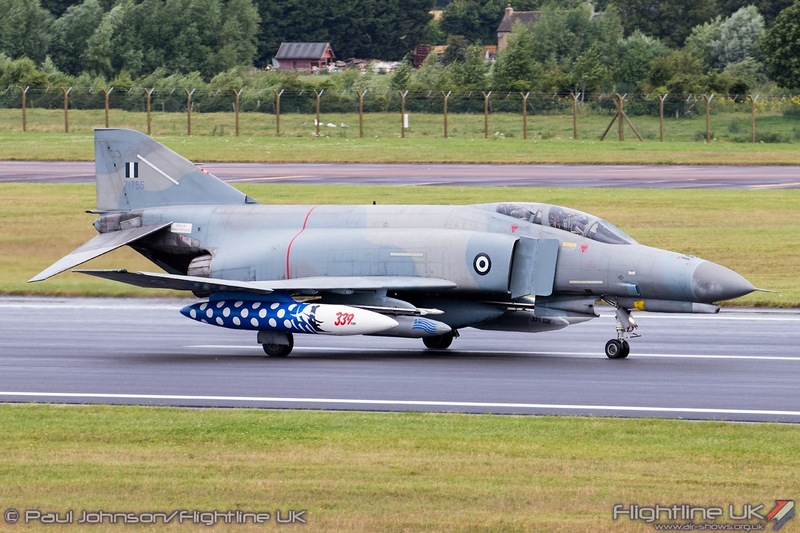 Numbers of the charismatic F-4 Phantom in frontline European service have been dwindling in previous years with just Greece and Turkey left. 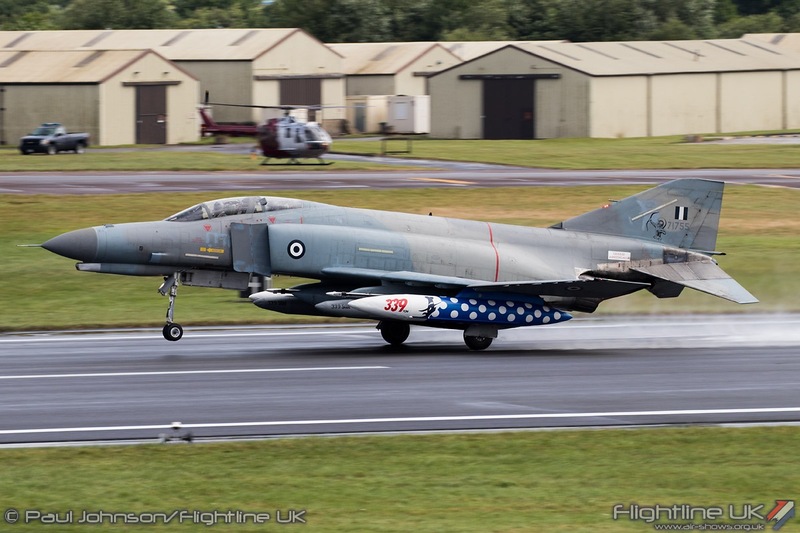 The F-4 remains one of the most imposing fighter designs of all time, even if just seen on static display. 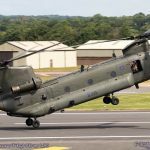 There is nothing lean about them, they are all about brute force and always look spectacular in the circuit whether arriving or departing. 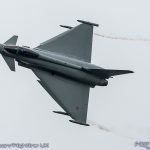 While the static displays are getting smaller, the Air Tattoo flying displays remain burgeoning at the seams. 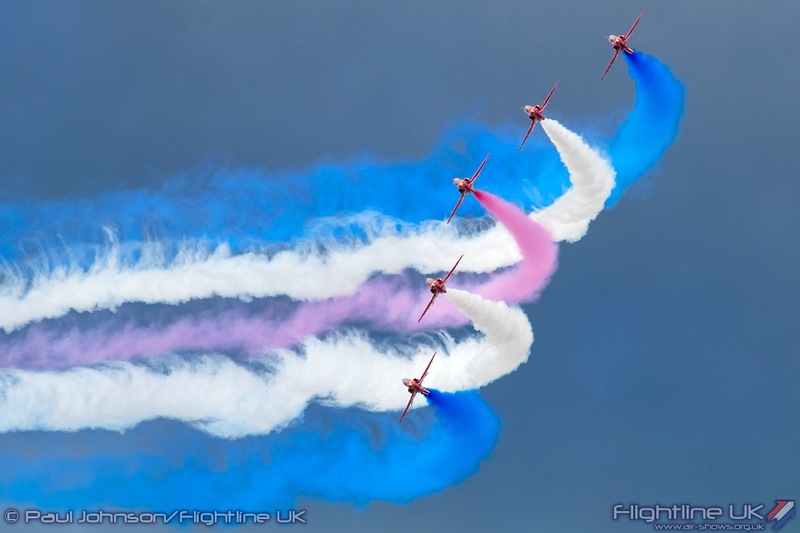 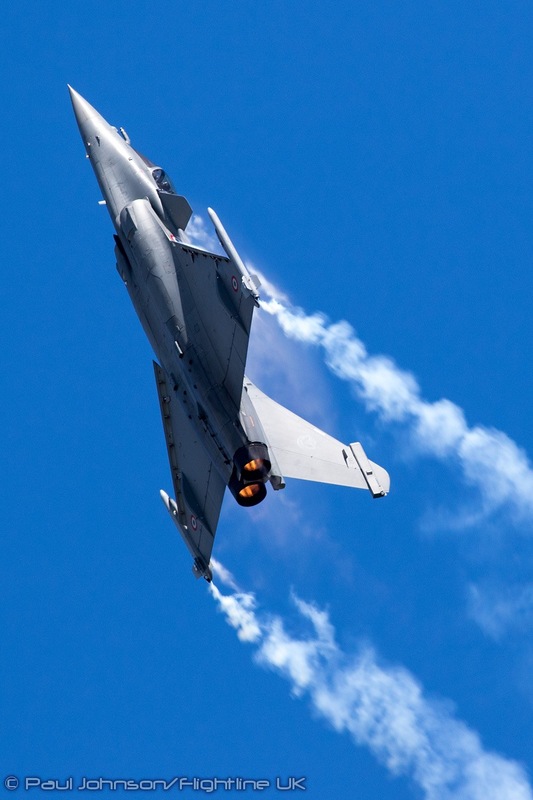 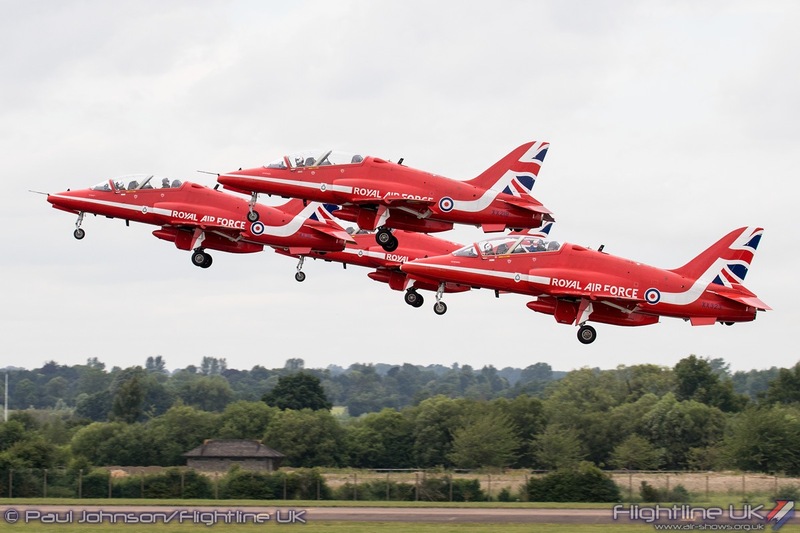 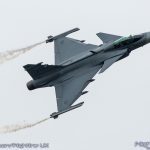 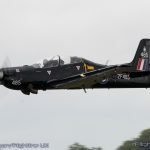 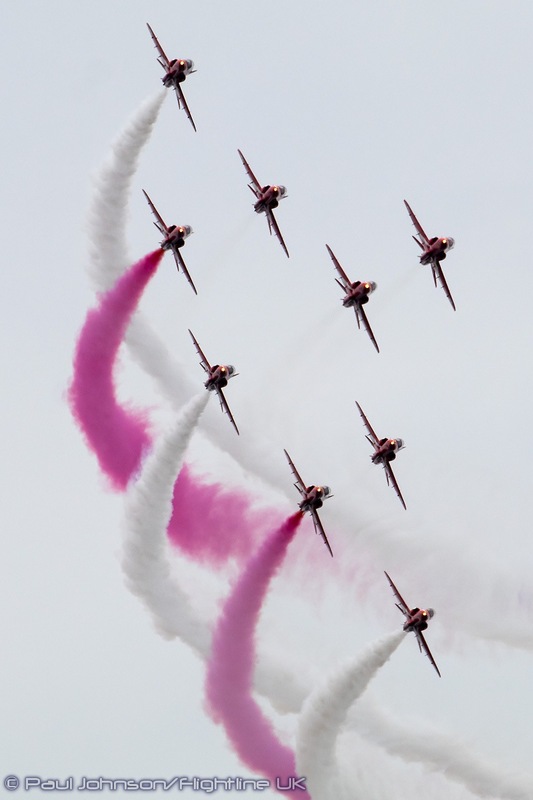 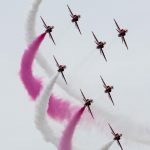 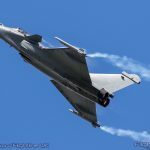 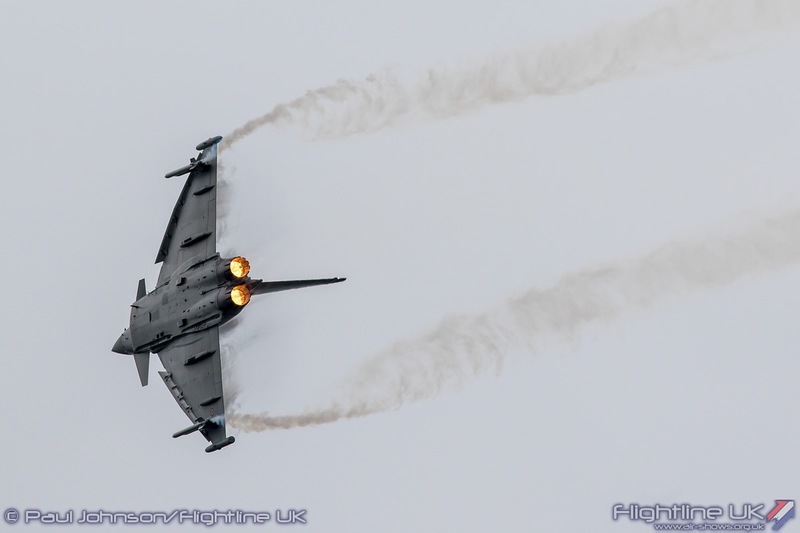 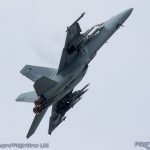 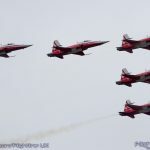 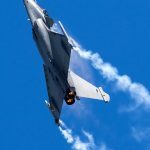 The weekend saw three flying displays, a shorter four hour affair on the opening Friday plus two marathon eight hour displays on the Saturday and Sunday. 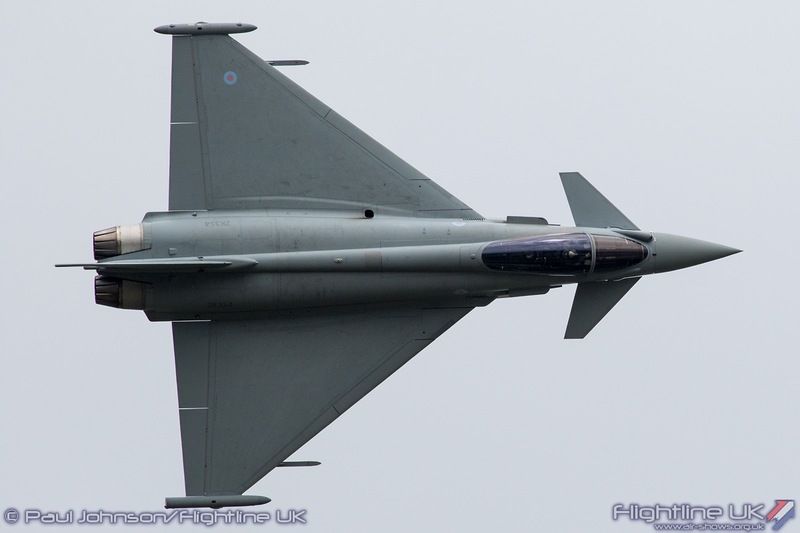 For the most part, the weather was kind during the display periods with at worst grey overcast. 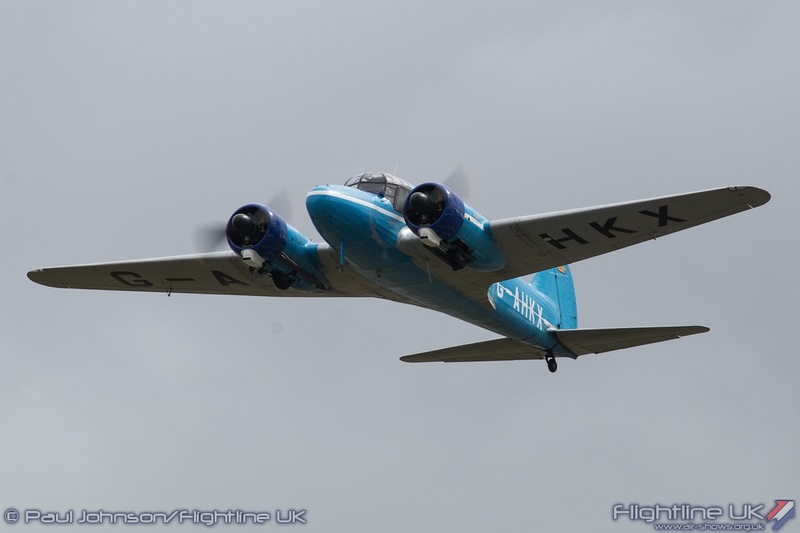 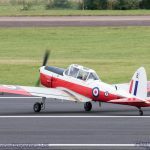 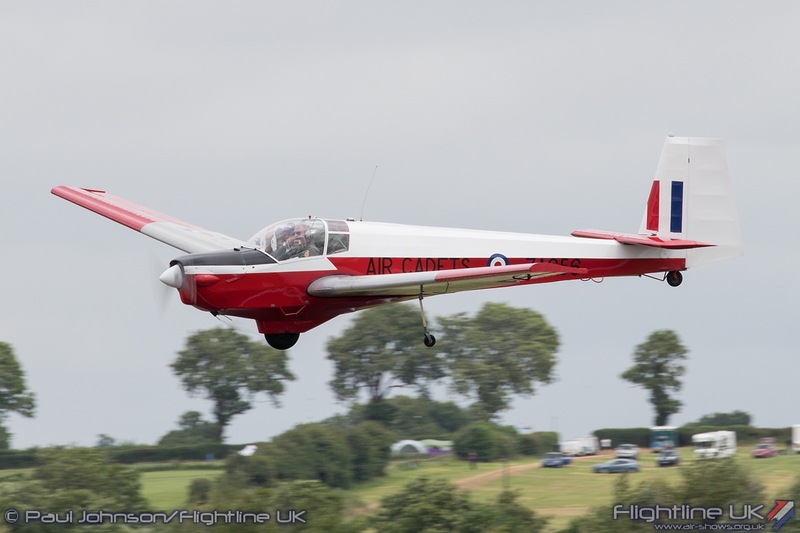 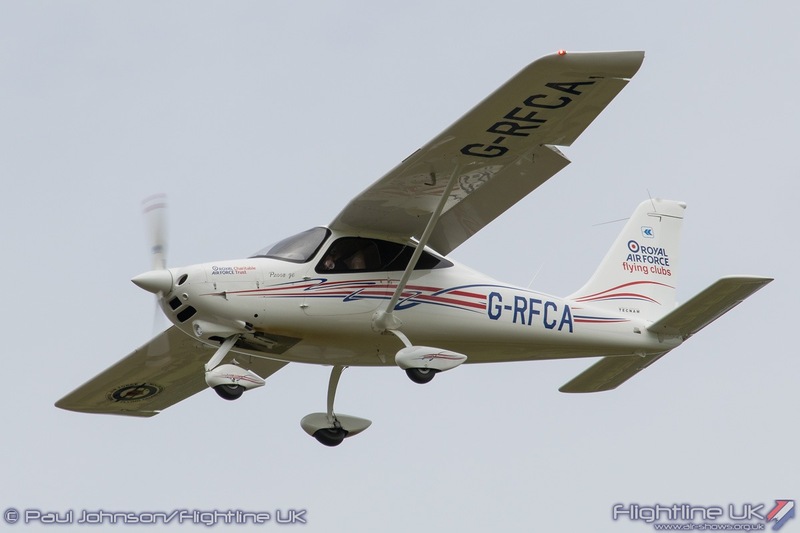 Sunday however highlighted the disadvantage of big flying displays with the overnight rain and low cloud being slow to budge causing the first few acts to cancel. 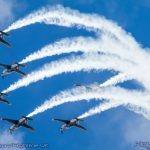 The 2016 flying display certainly saw a huge collection of European fast jet displays. 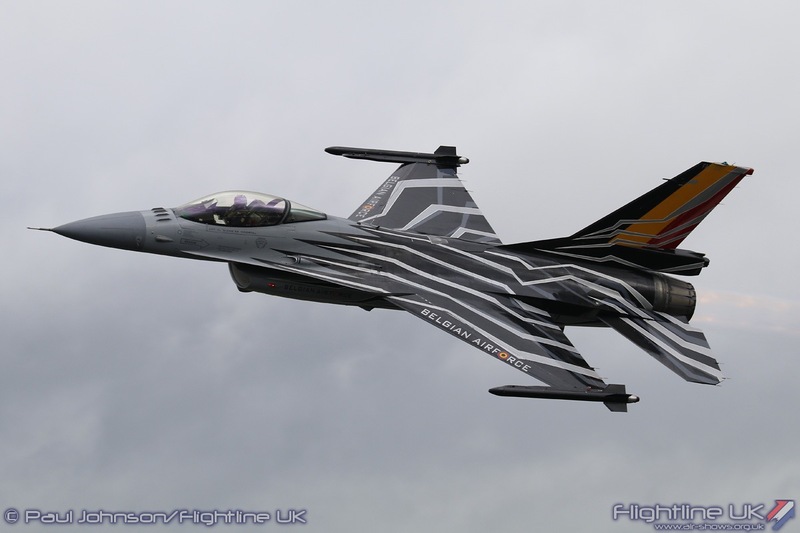 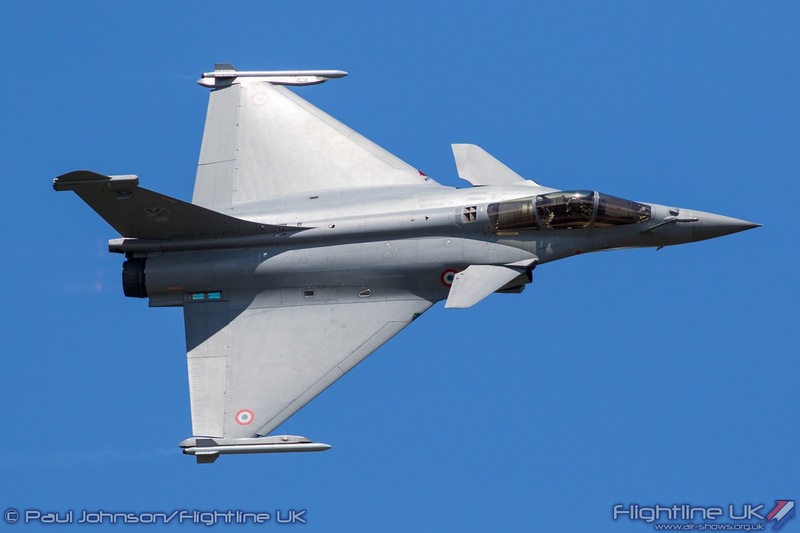 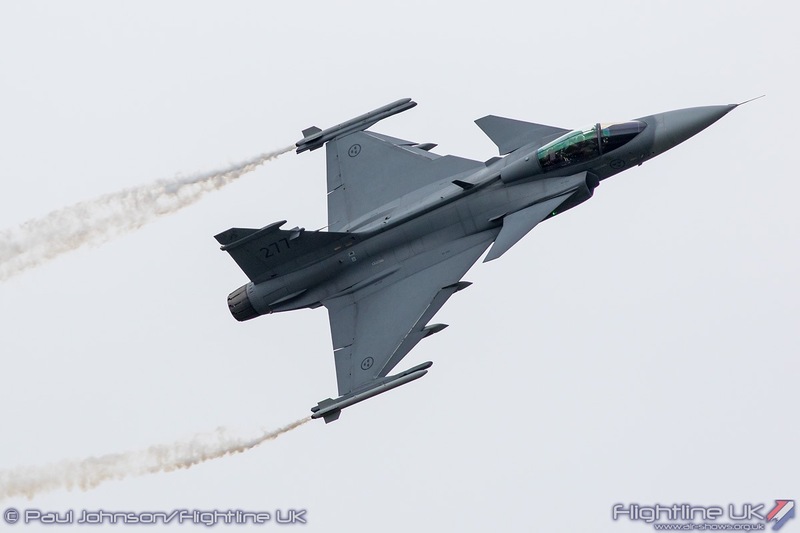 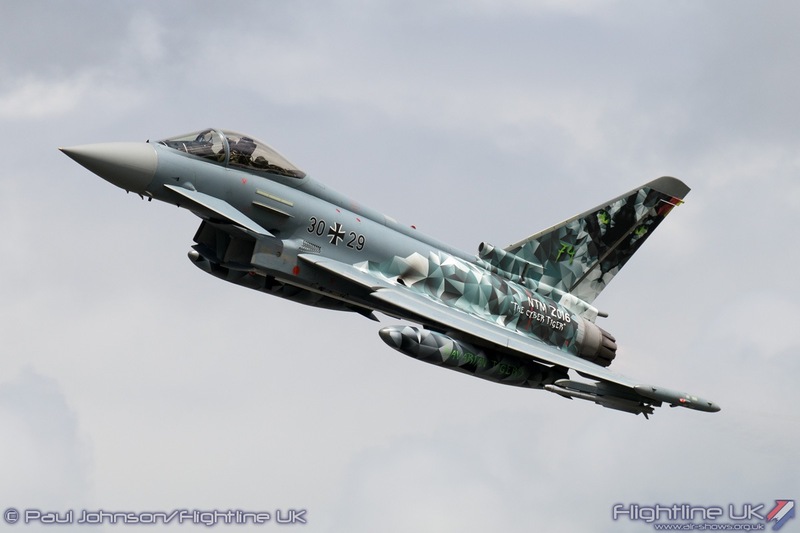 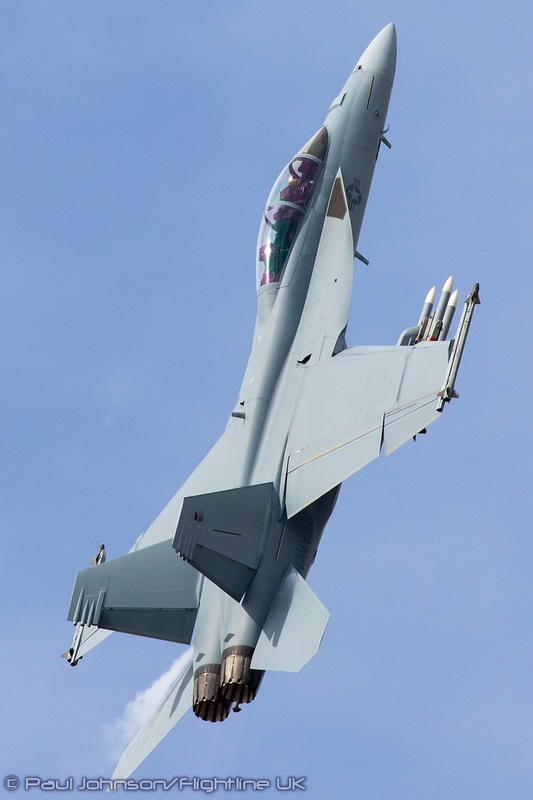 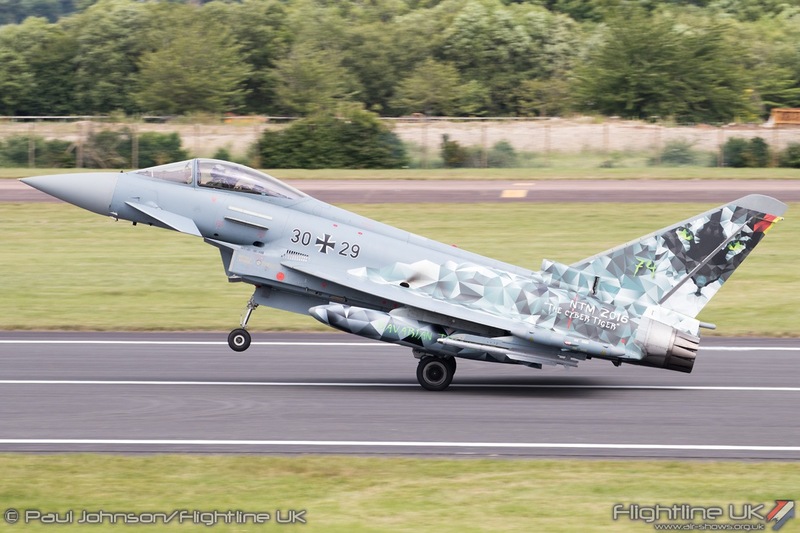 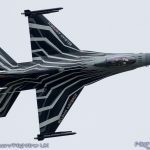 Eight displays however were covered by just two designs; the F-16 and Eurofighter Typhoon. 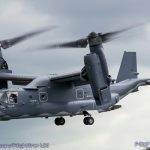 In some ways, it a sign of just how far aircraft design has come in that where two or more designs were needed in the past to cover all missions, now it can all be accomplished by one! 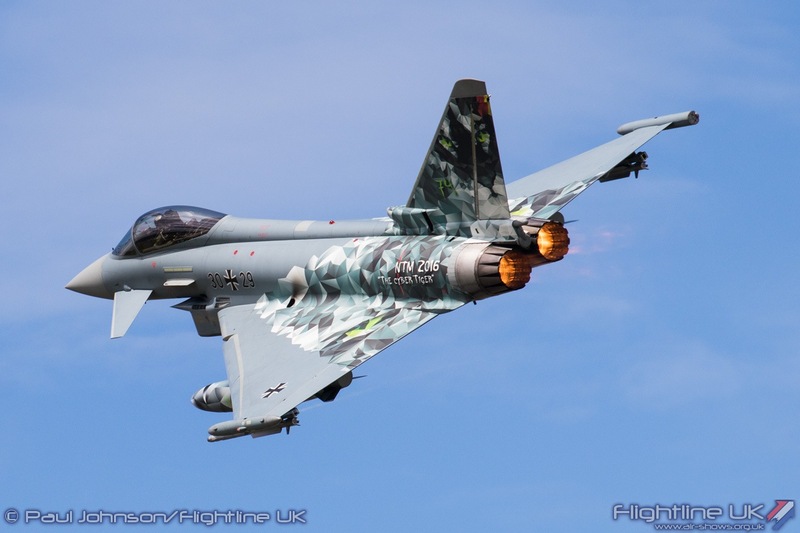 That is certainly the case of the Eurofighter Typhoon. 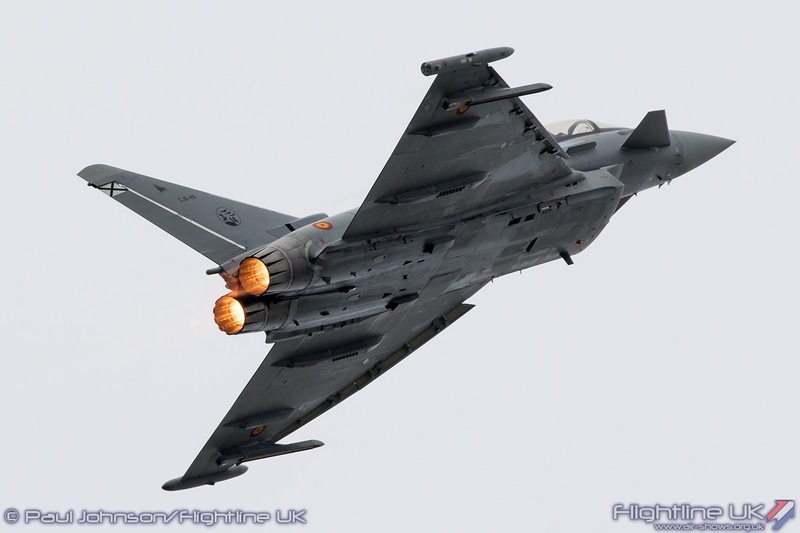 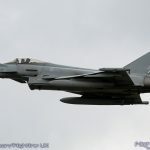 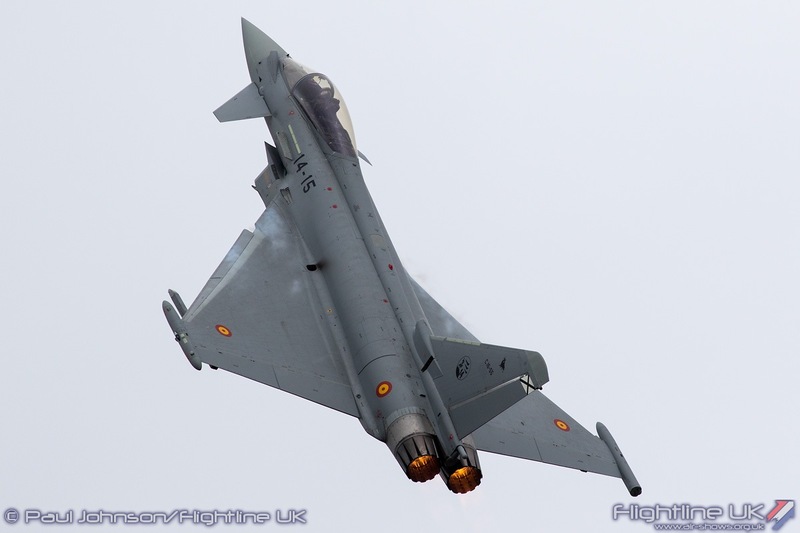 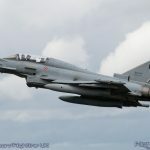 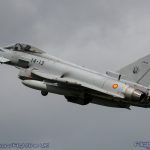 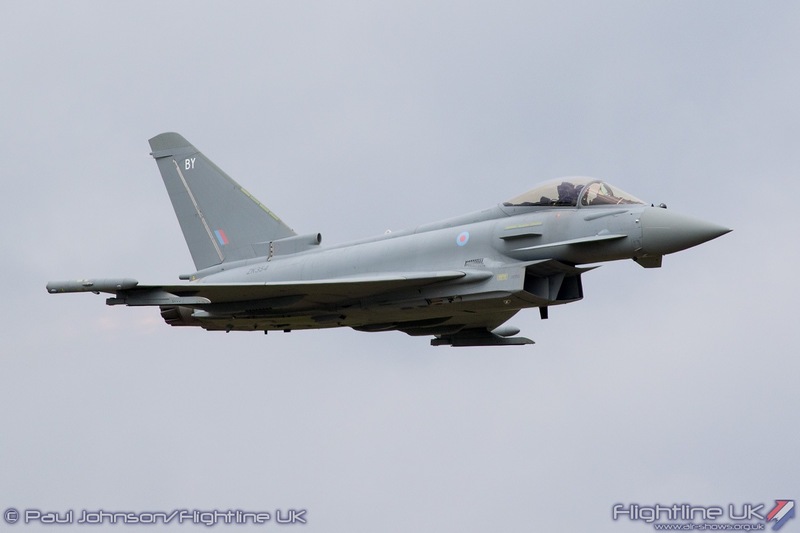 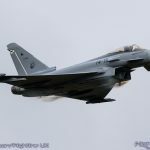 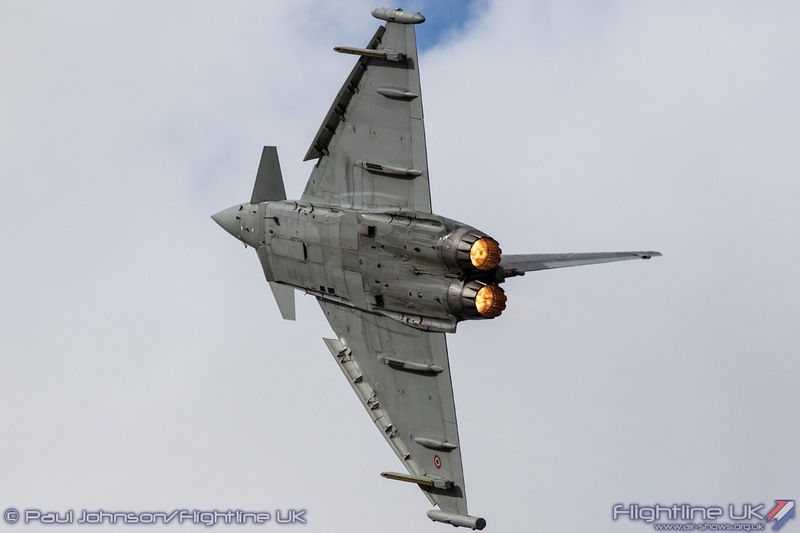 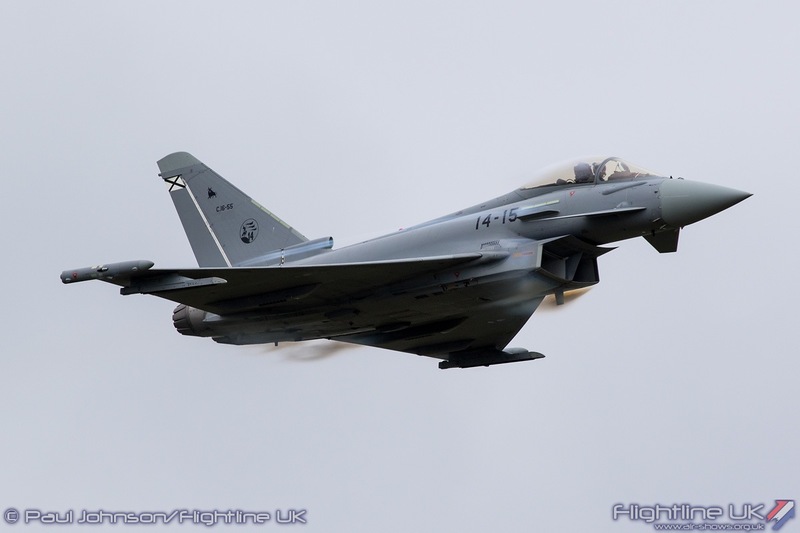 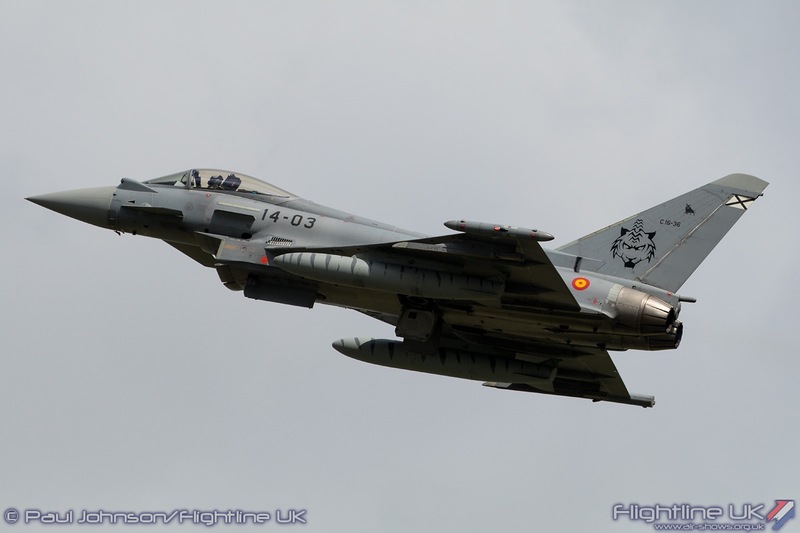 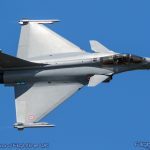 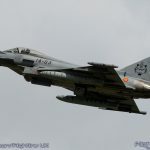 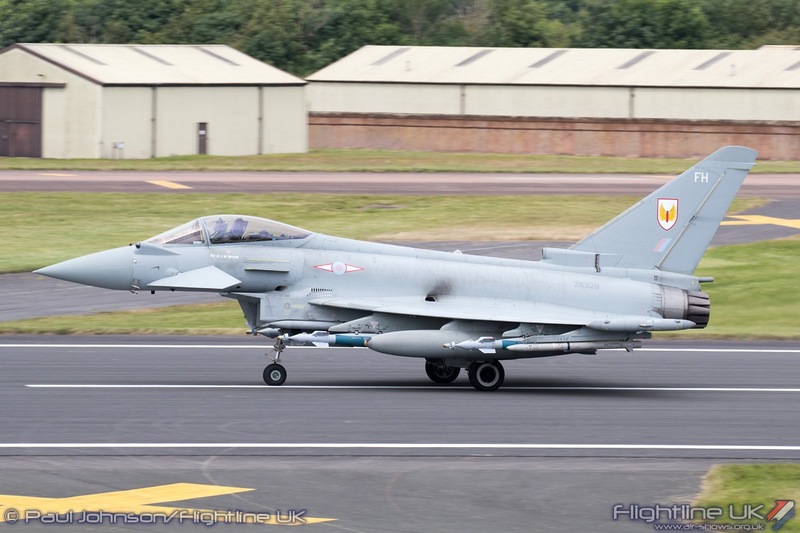 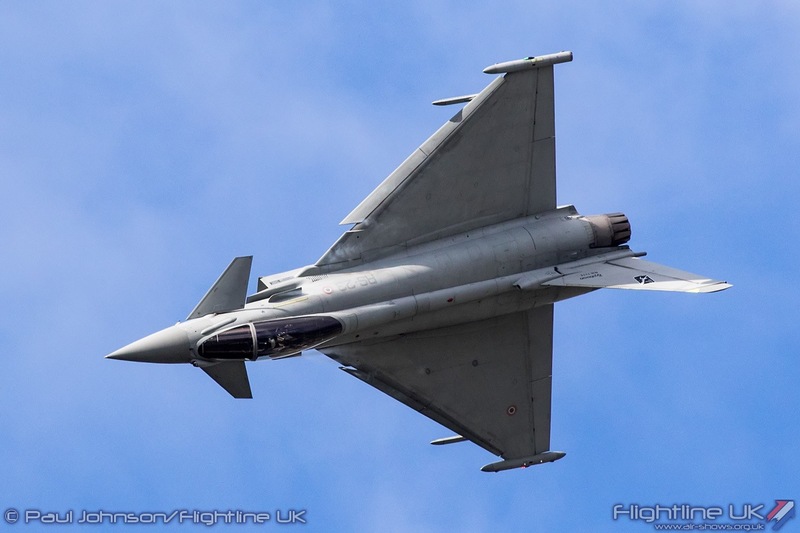 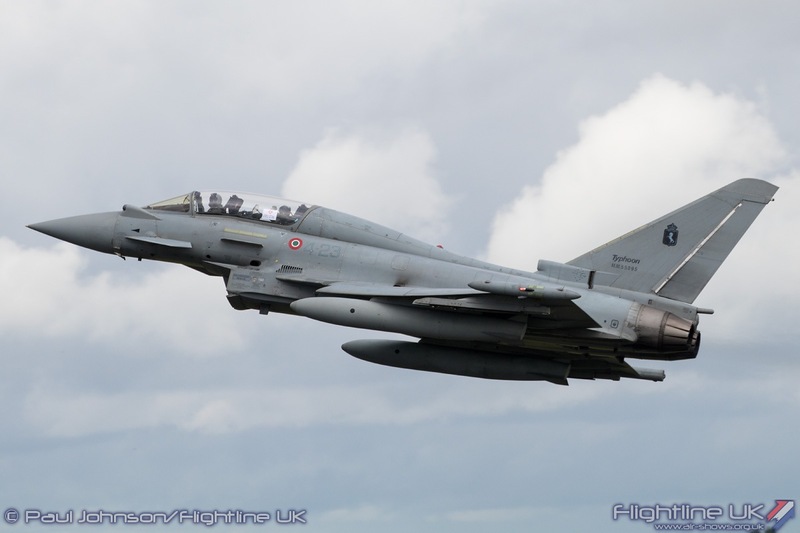 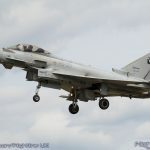 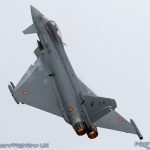 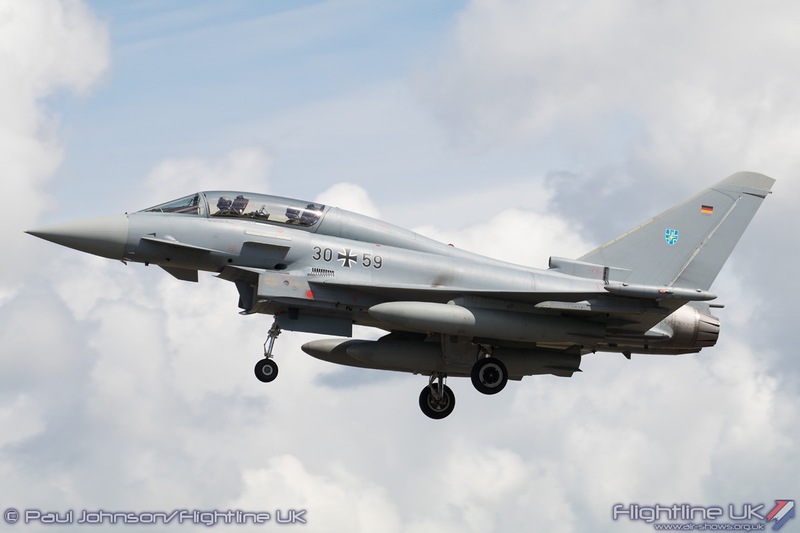 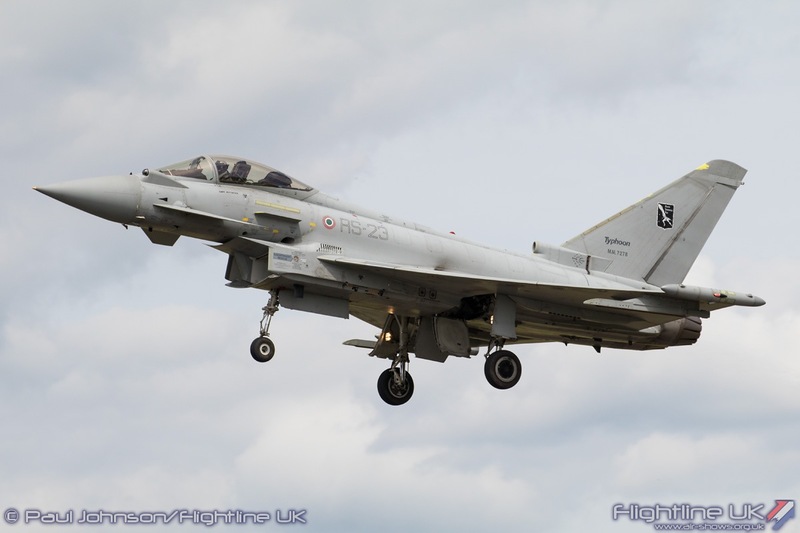 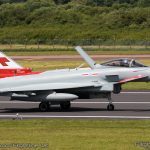 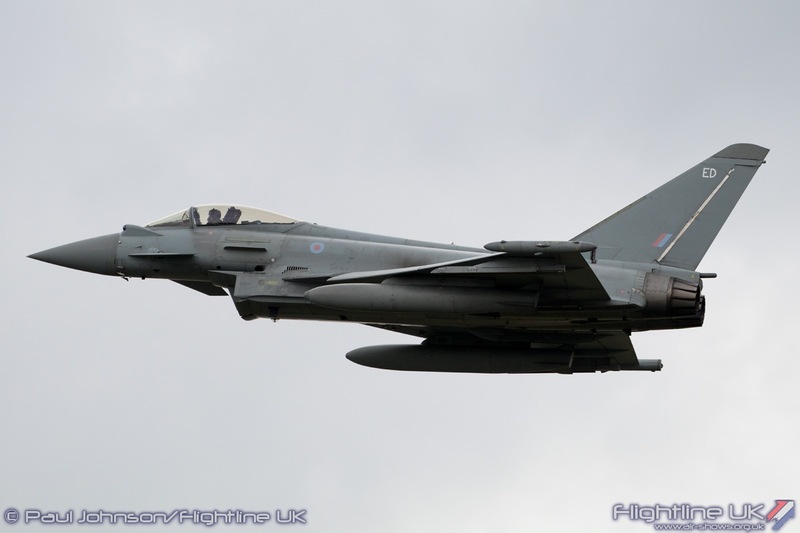 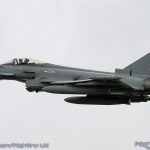 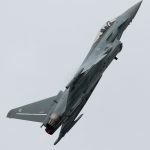 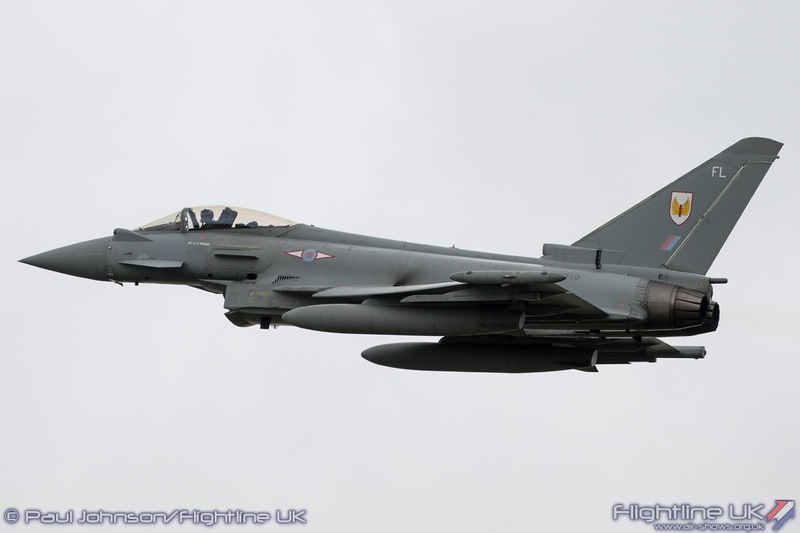 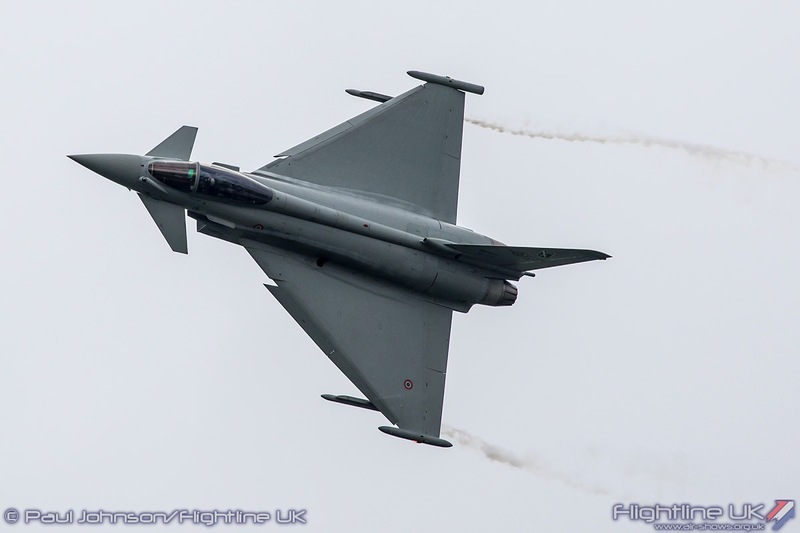 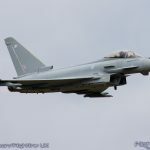 The Royal Air Force solo Typhoon FGR4 display flown by Flt Lt Mark Long was joined in the programme by solos from the Italian Air Force Reparto Sperimentale Volo (RSV) F-2000A Typhoon and the Spanish Air Force C.16 Typhoon. 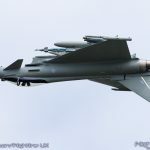 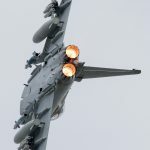 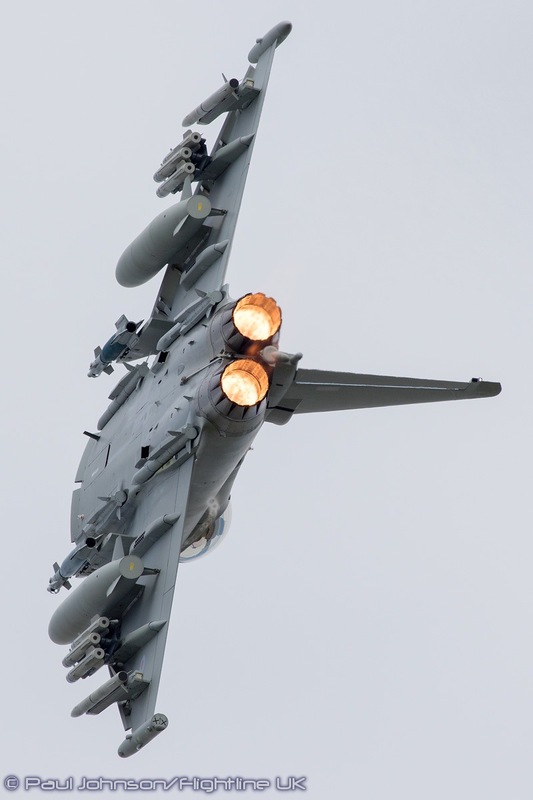 The fourth Typhoon display marked the future of the type, at least in RAF and Kuwaiti Air Force service with BAE System’s demonstrating Typhoon IPA7 fitted with the ‘P3E’ payload. 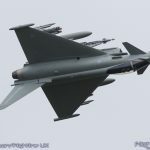 P3E stands for Phase 3 Enhancements and allows Typhoon to carry four Meteor medium range air-to-air missiles, two racks of Brimstone II air-to-ground missle, two drop-tanks, two Paveway IV precision guided bombs and two ASRAAM short range air-to-air missiles. 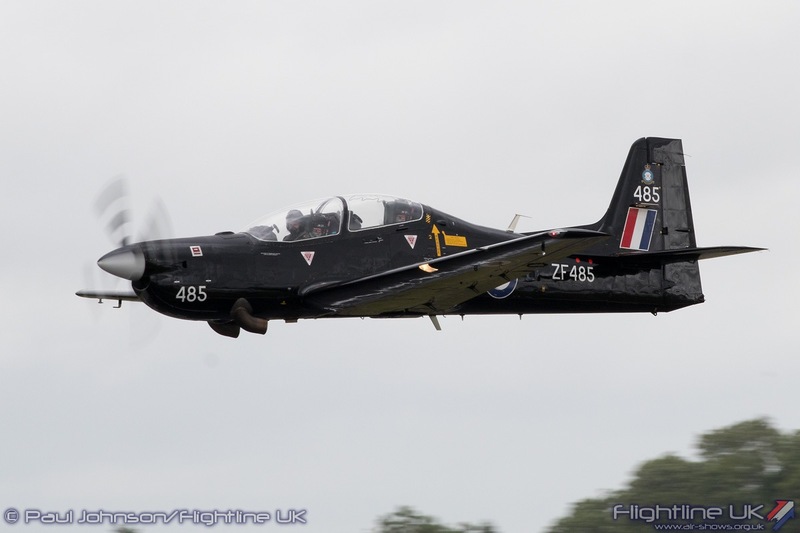 Test pilot Nat Makepeace flew a powerful routine with the payload fitted to the aircraft which lost none of its agility or acceleration. 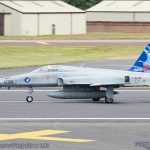 It was a display that certainly got the attention of the Flying Control Committee who awarded Nat the Steedman Display Sword is presented by the Royal International Air Tattoo in memory of the late Air Chief Marshal Sir Alasdair Steedman, chairman of the International Air Tattoo (1981-1988) for the best flying demonstration by a UK participant. 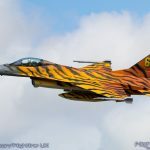 Four different nations contributed Lockheed Martin F-16 solo displays. 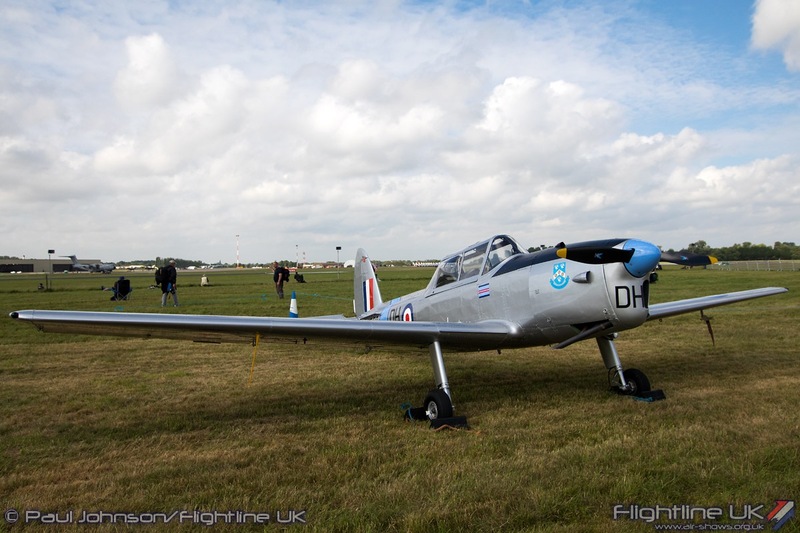 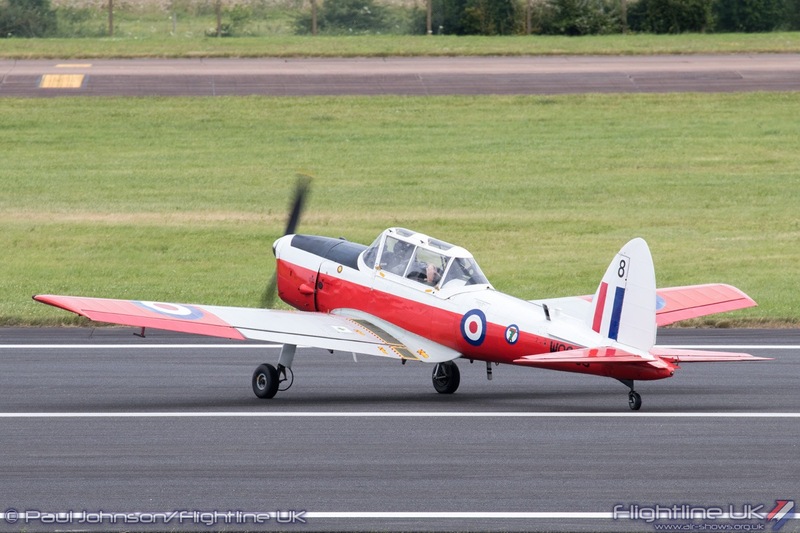 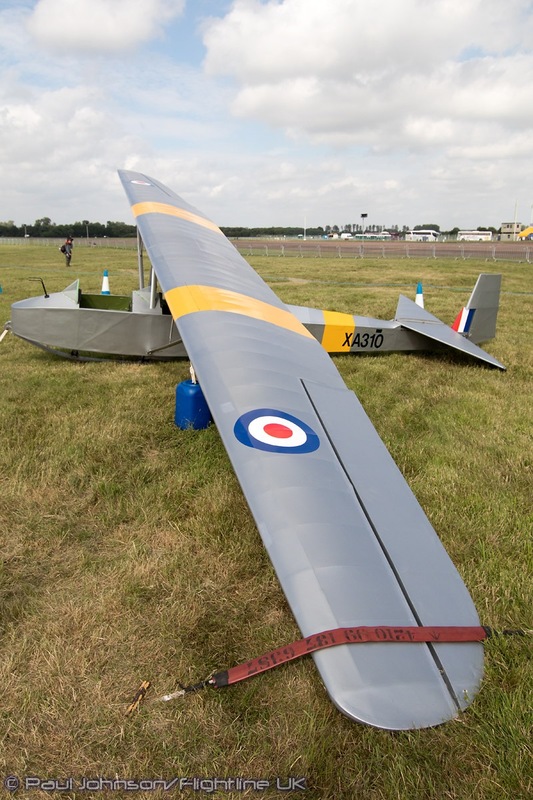 Cdt Tom ‘Gizmo’ de Moortel from the Belgian Air Force flew the only ‘A’ model in the flying display. 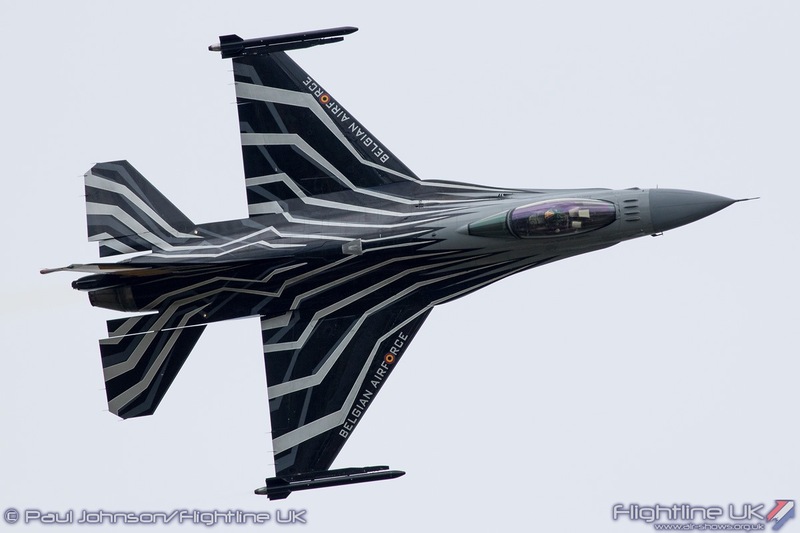 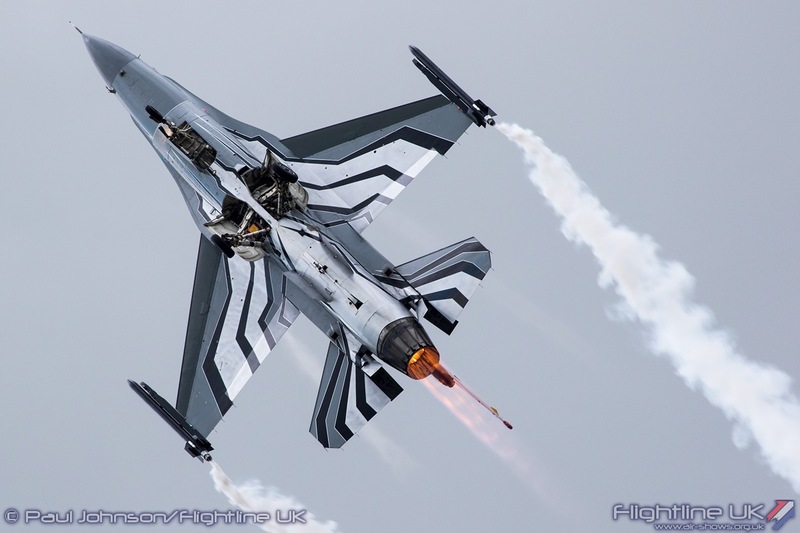 His display is one of the very best F-16 displays with a precise yet smooth flowing routine. 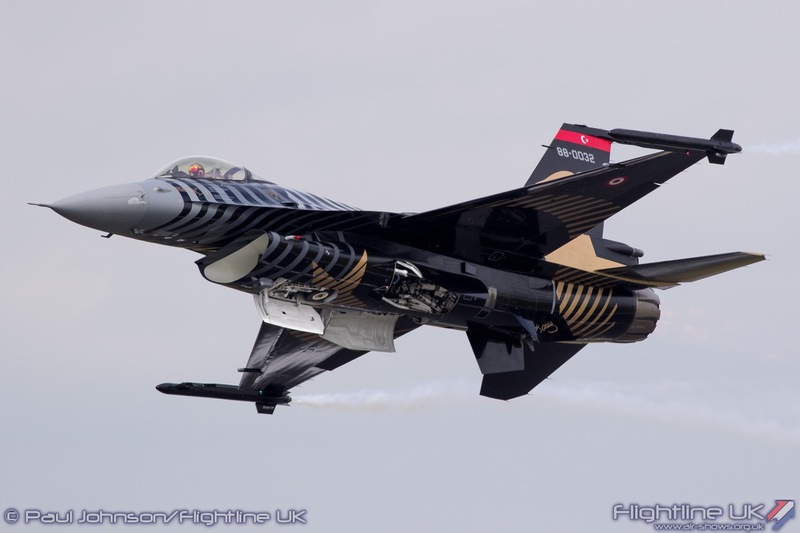 Another well-established F-16 display making a welcome return was the Turkish Air Force F-16C solo display team, SoloTurk. 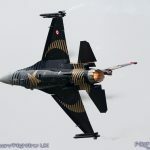 Sadly, the poor weather meant only that only the Saturday crowds got to enjoy this energetic and fast paced F-16 display. 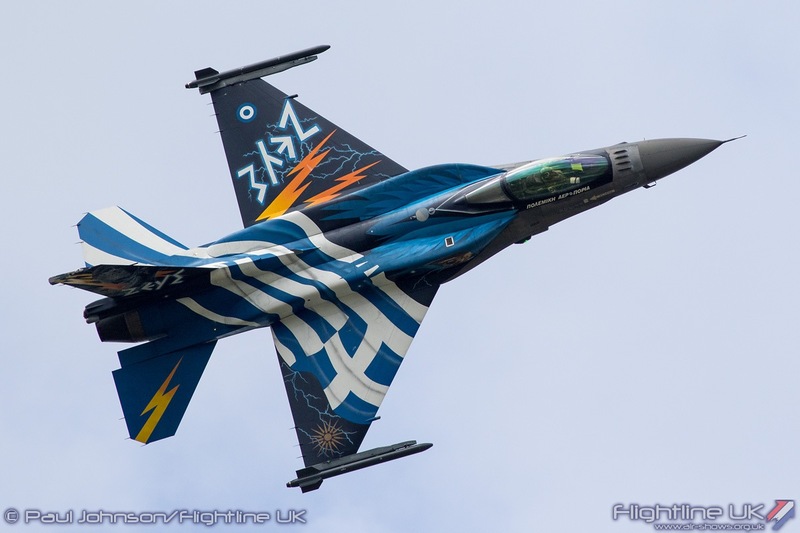 The Hellenic Air Force F-16C Solo Display Team ‘Zeus’ make their UK at RIAT 2015 and returned this year. The Hellenic display is very different to the Belgian and Turkish displays as not only do the Hellenic F-16s carry conformal fuel tanks which give the F-16 a much more aggressive stance, but the display is based upon USAF F-16 displays. 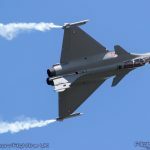 This brings a far more regimented display of set piece passes rather than a flowing routine, but is nevertheless impressive. 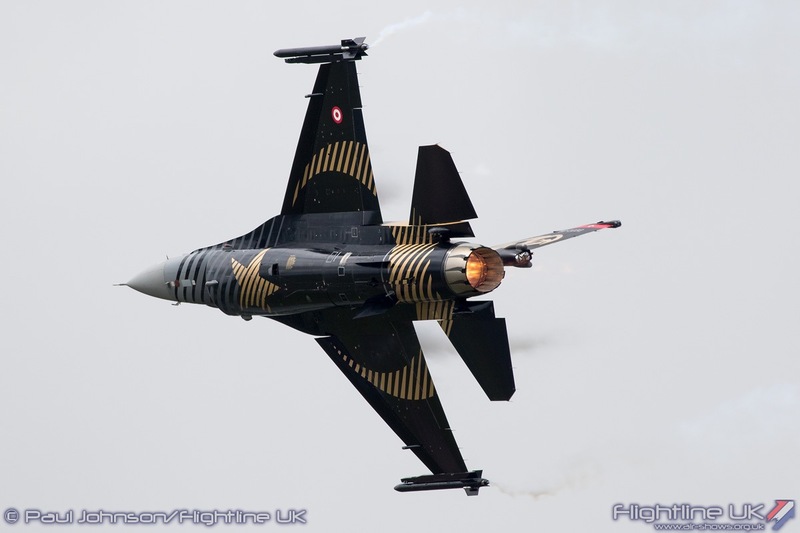 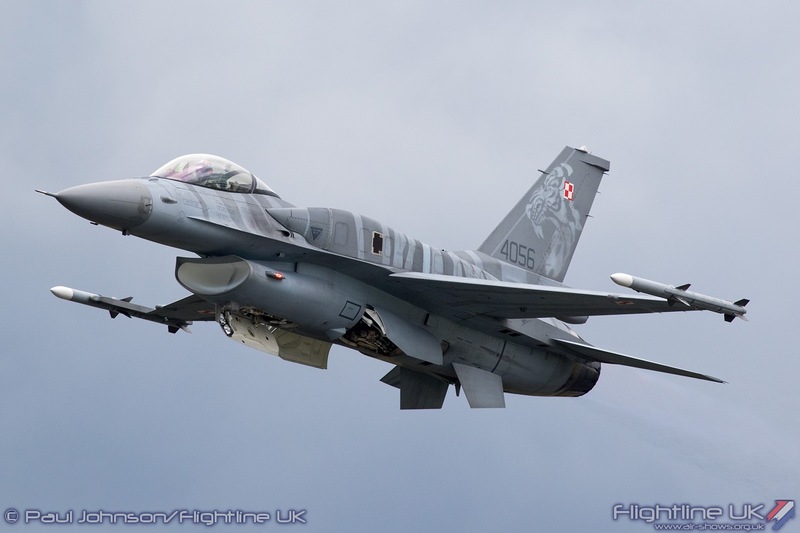 Making their UK debut was the Polish Air Force F-16C ‘Tiger’ Demo Team. 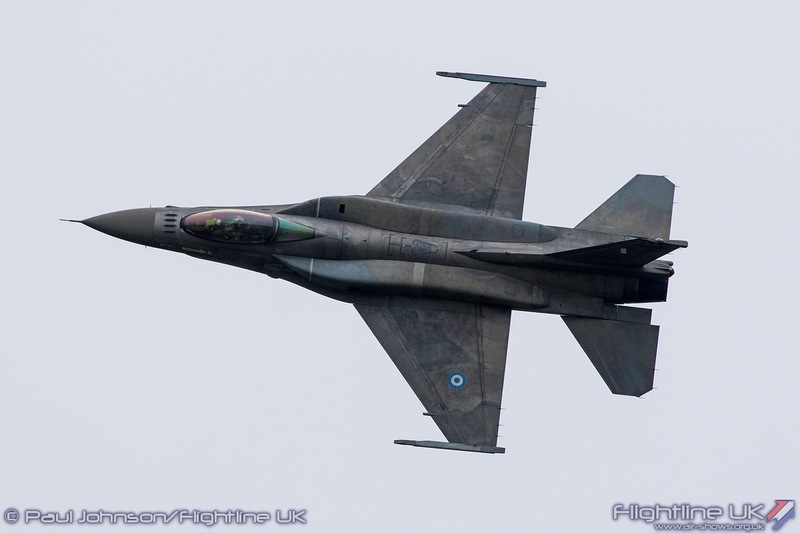 They fly a very similar version of the F-16 to the Hellenic Air Force and also have conformal tanks fitted to their machines. 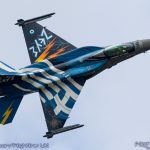 It is therefore no surprise they worked with the Hellenic Air Force when putting together this display and that he two displays are quite similar. 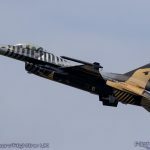 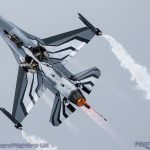 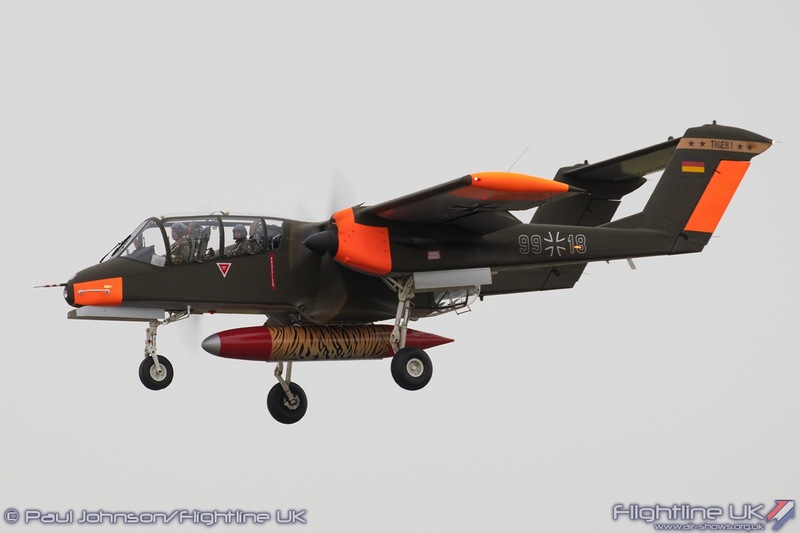 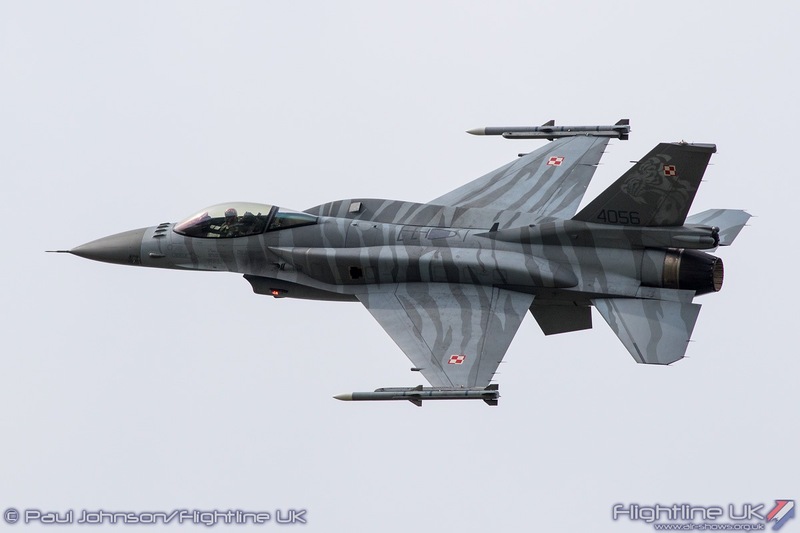 The Polish display aircraft wears a very pleasing low-vis Tiger paint scheme and is certainly a very welcome addition to the display circuit in Europe. 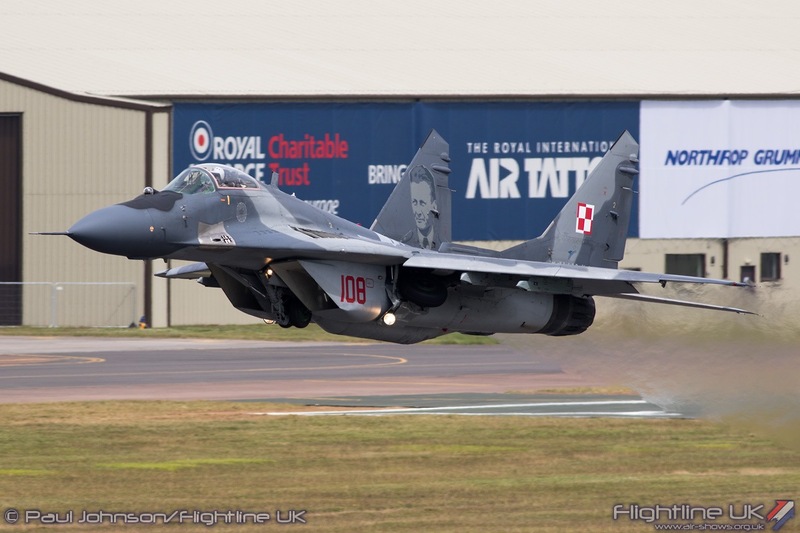 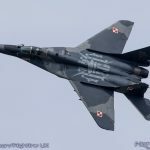 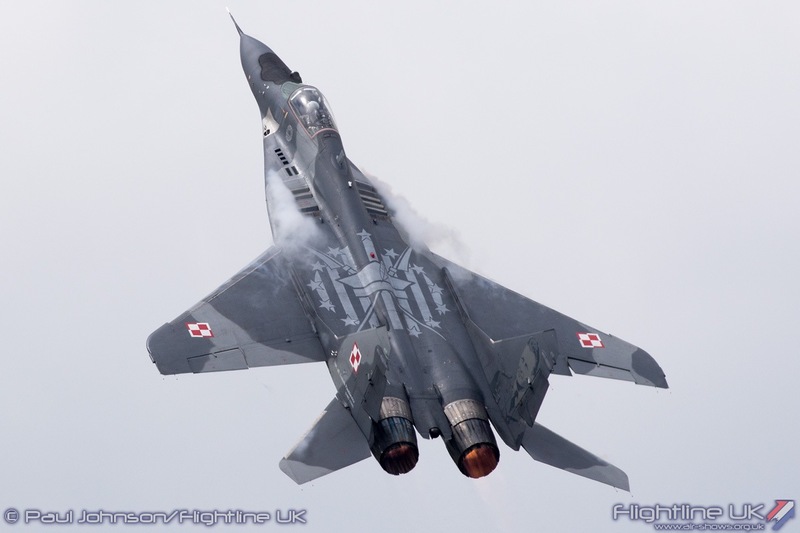 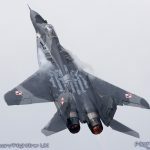 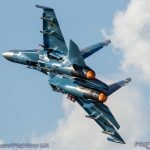 The Polish Air Force also sent their Mikoyan-Gurevich MiG-29A Fulcrum solo display to RIAT. 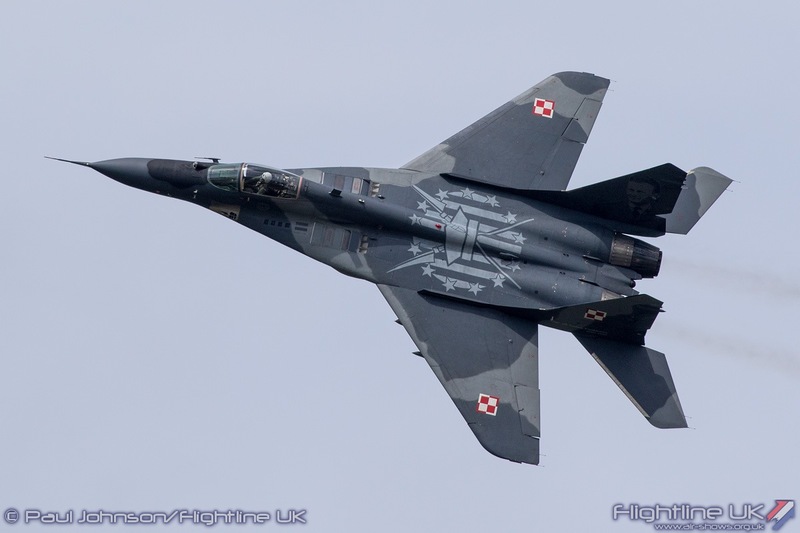 The Mig-29 is a complete contrast to the ‘Gucci’ F-16s and Typhoons. 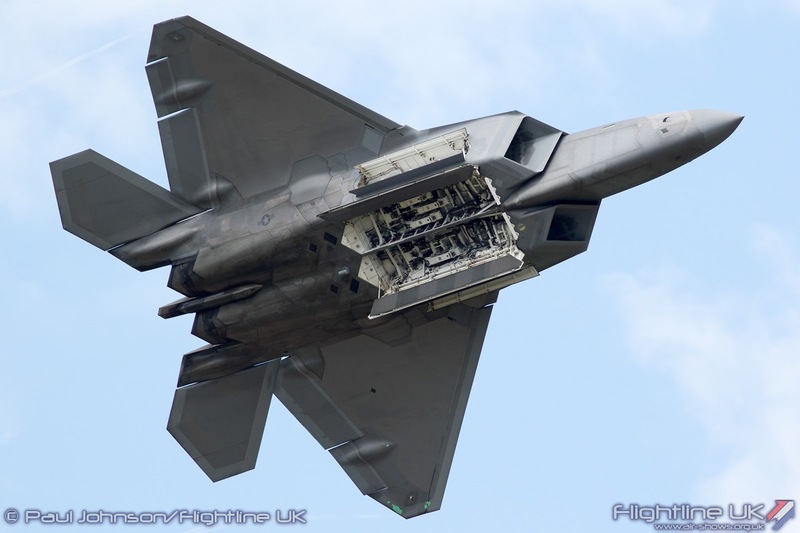 It is designed to be a rugged fighter, and close up its engineering is certainly rugged. 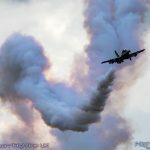 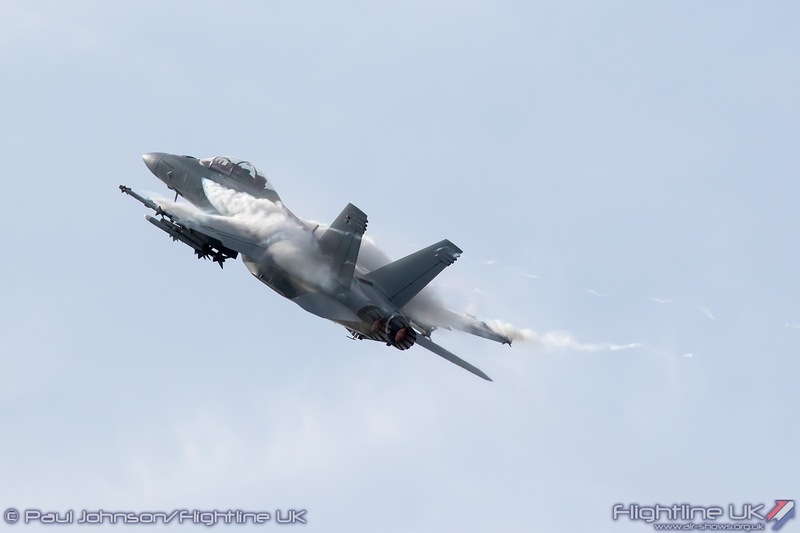 The engines too don’t burn fuel cleanly and the MiG leaves characteristic block smoke trails as it powers its way through the skies. 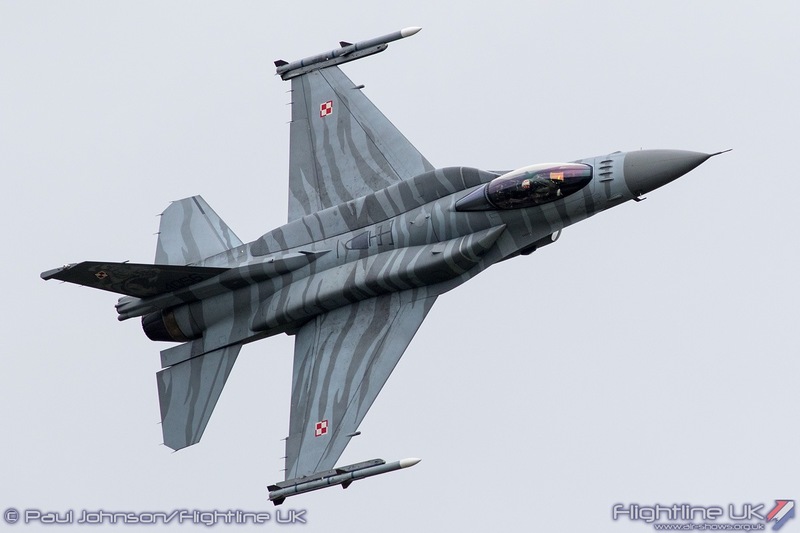 It is however an incredible effective fighter and is a superb airshow performer which was demonstrated admirably by the Polish pilots. 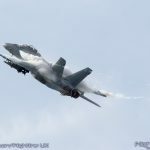 The only representative of the F/A-18 Hornet at the show was a US Navy Boeing F/A-18F Super Hornet demonstrated by Boeing test pilots. 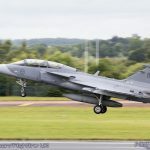 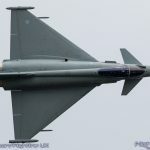 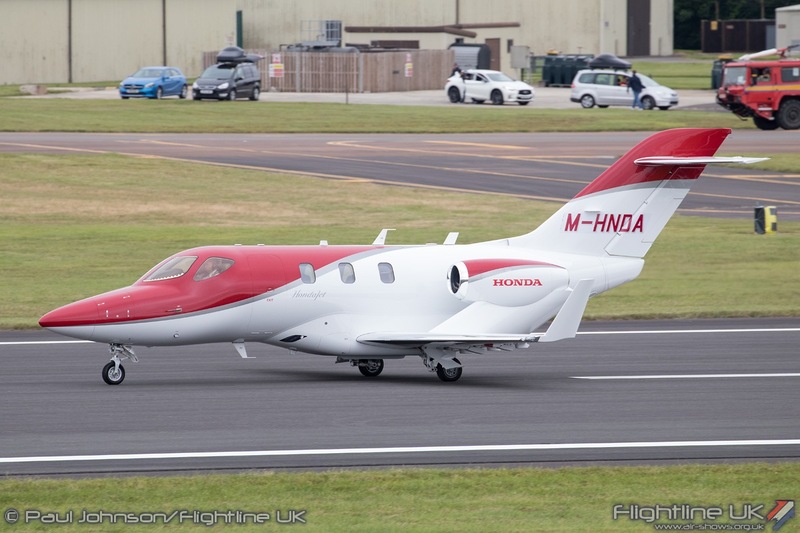 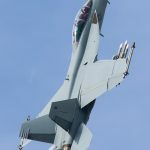 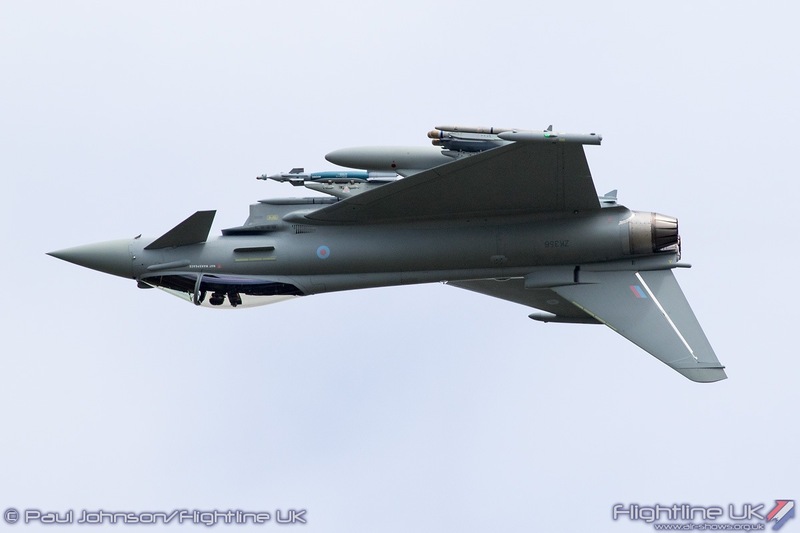 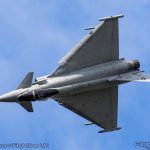 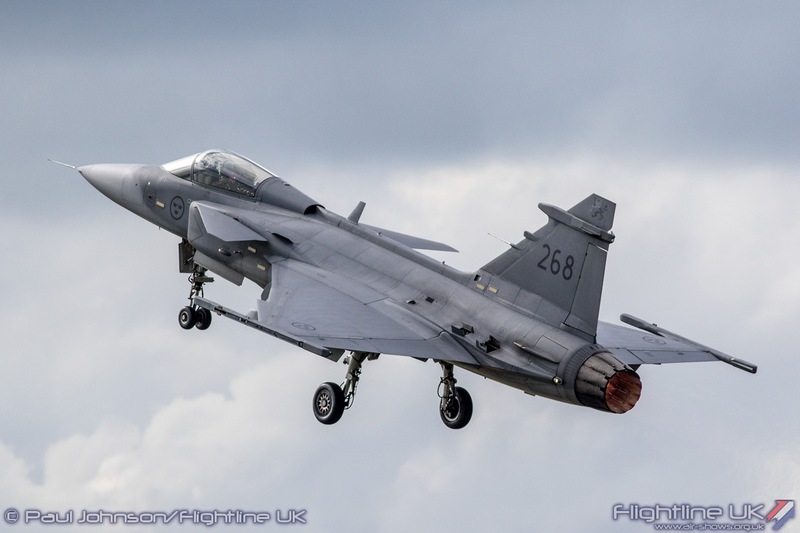 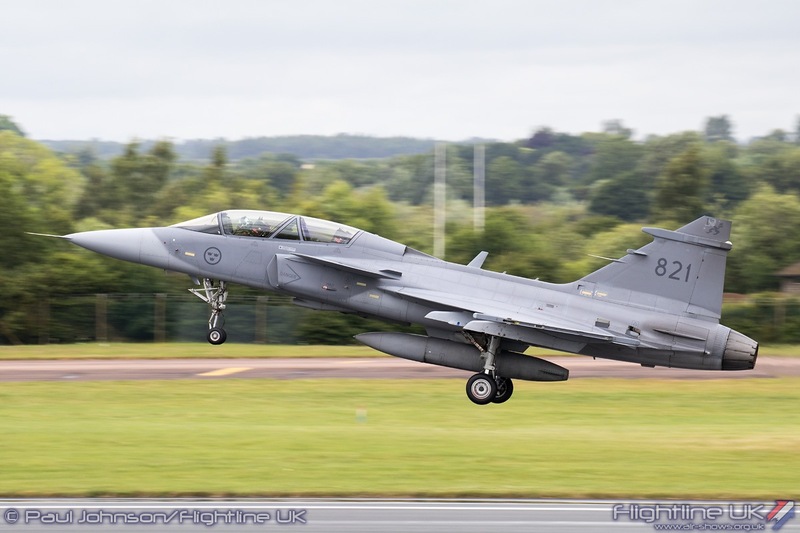 This aircraft was making its usual visit in ‘even’ years to cover RIAT and Farnborough airshows as the type is very much in contention for a number of future fighter contracts. 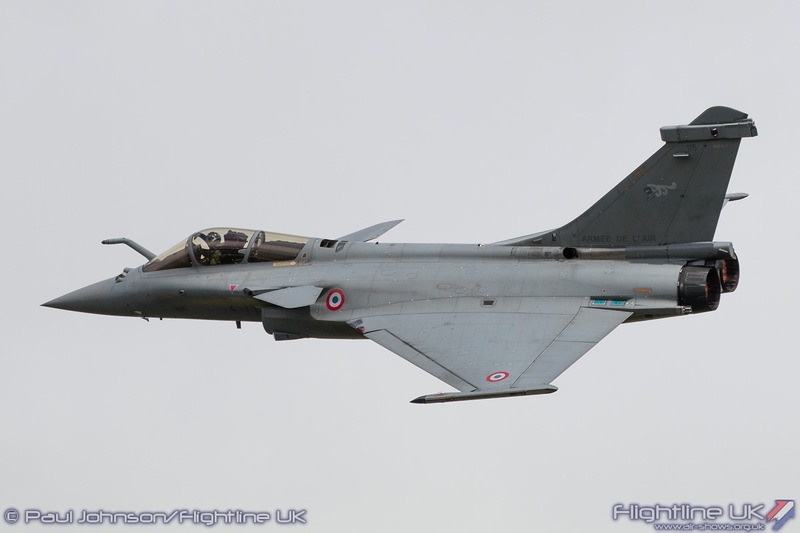 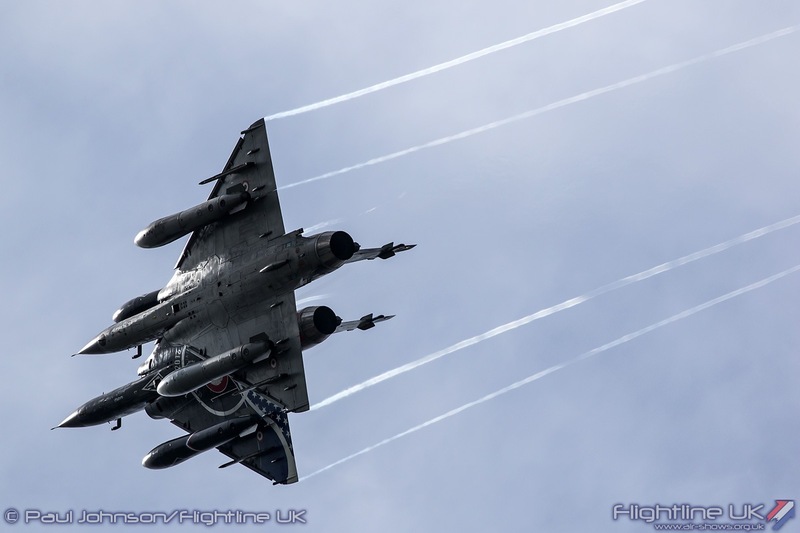 Complementing the Rafale were Ramex Delta, the French Air Force’s tactical role demonstration team flying a pair of Dassault Mirage 2000Ns. 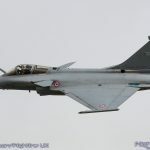 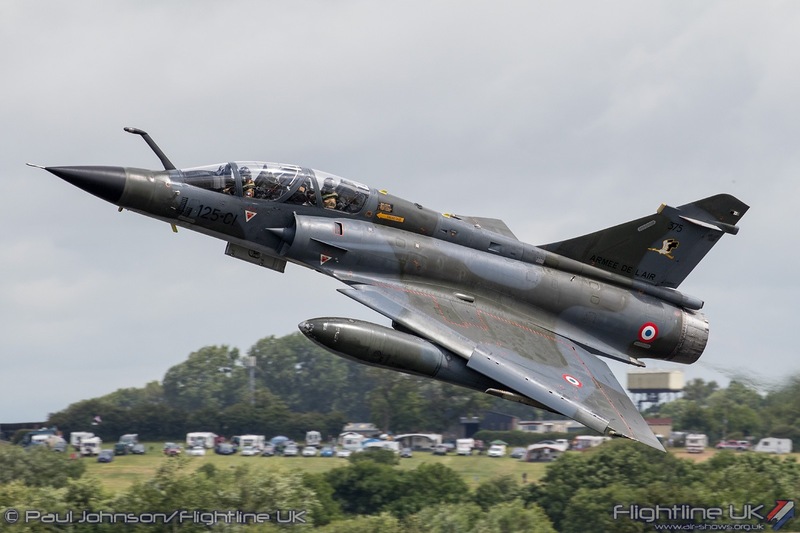 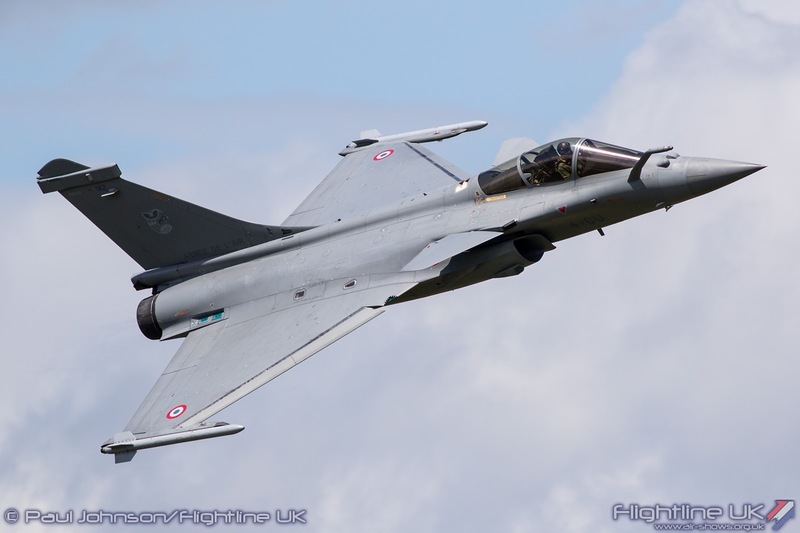 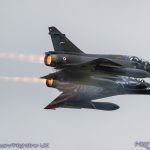 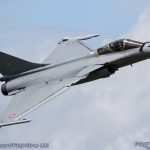 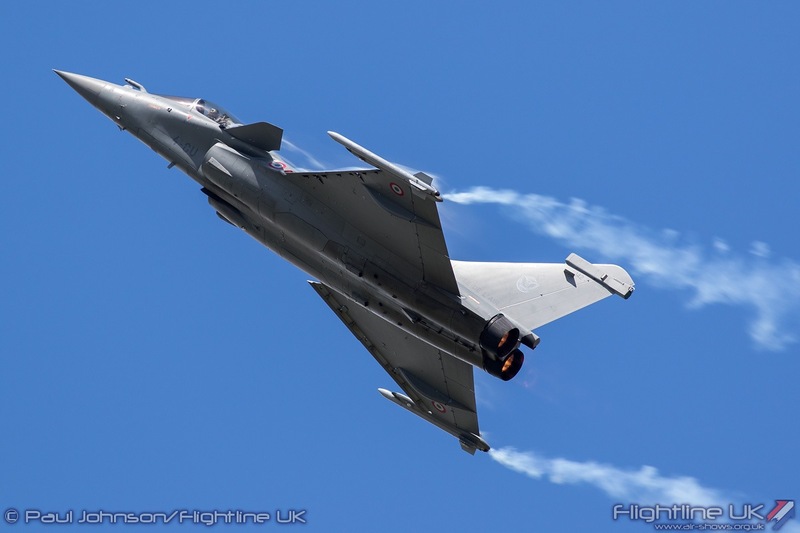 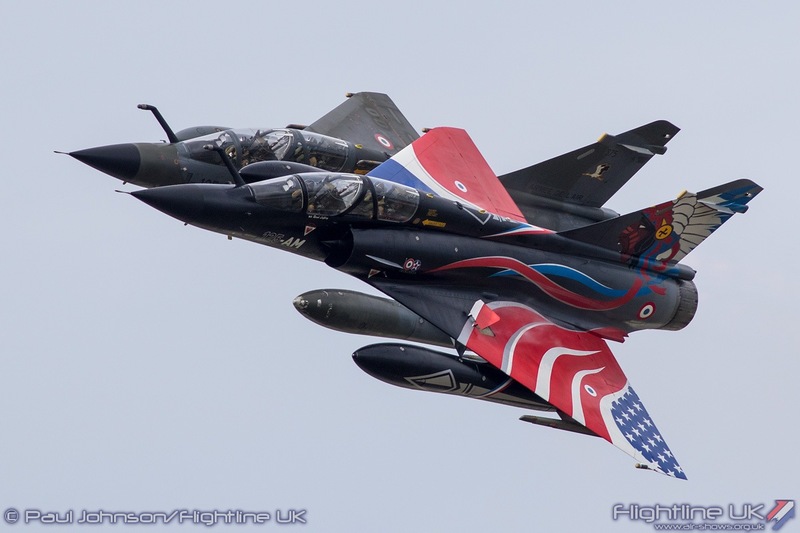 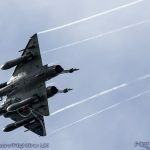 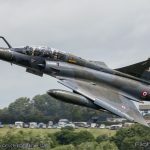 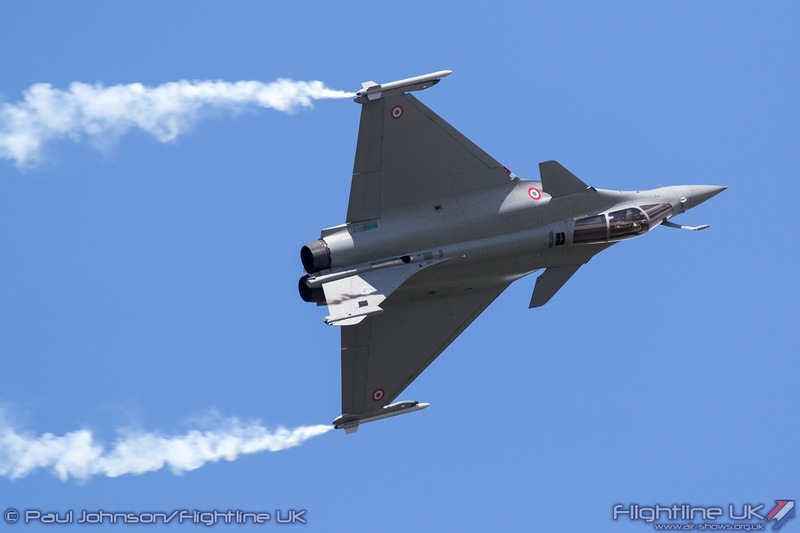 They are a firm favourite with airshow crowds in France and across Europe presenting a superbly well-choreographed routine of the various tactics employed by Mirage 2000Ns on operations in the likes Afghanistan and Libya. 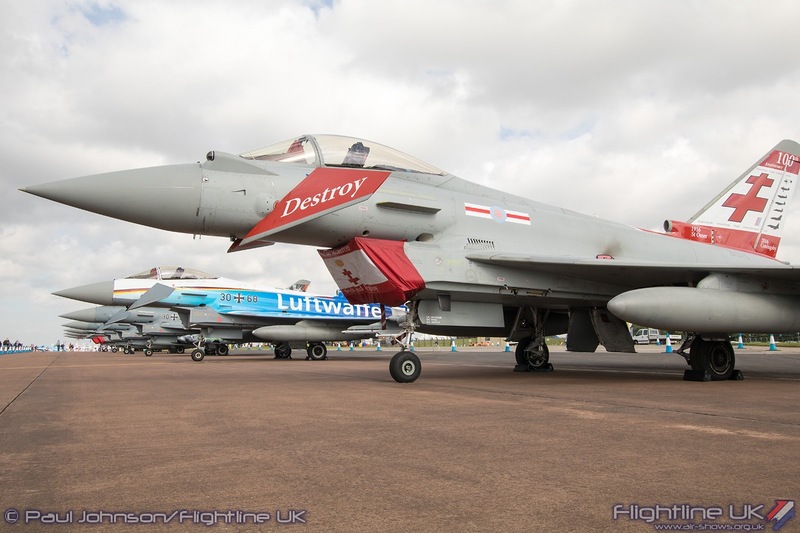 Their displays however were tinged with just a little sadness as RIAT was their last ever public performance. 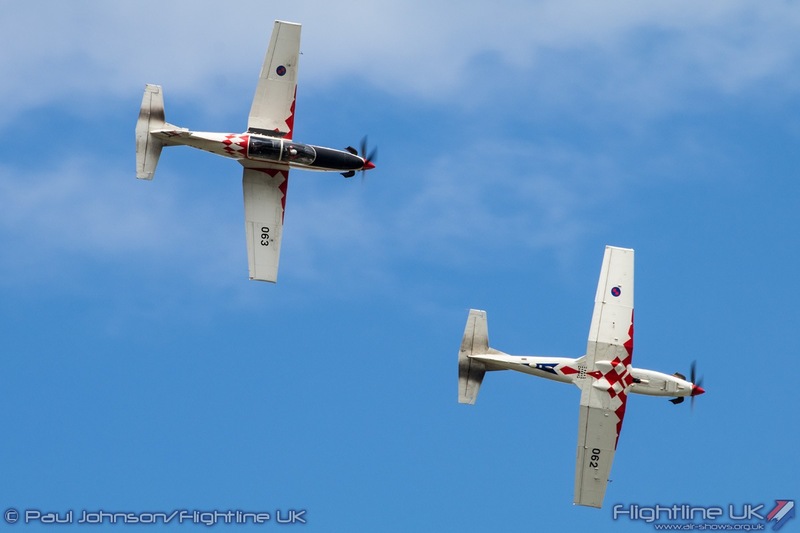 They were double award winners. 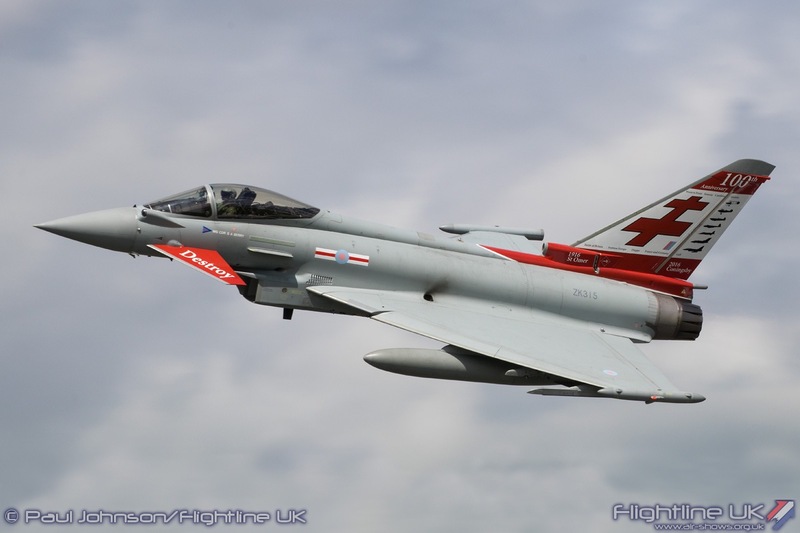 For their flying, they won the RAFCTE Trophy, presented for the best flying demonstration by an overseas participant. 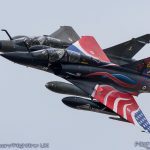 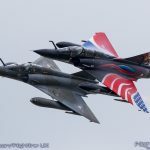 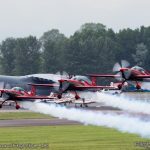 One of the pilots, ‘Pierrot’, said afterwards: “We are very proud, because it was very special to attend this year’s RIAT. 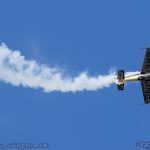 This was our last airshow ever, and it was a great deal of pleasure for us to fly today. 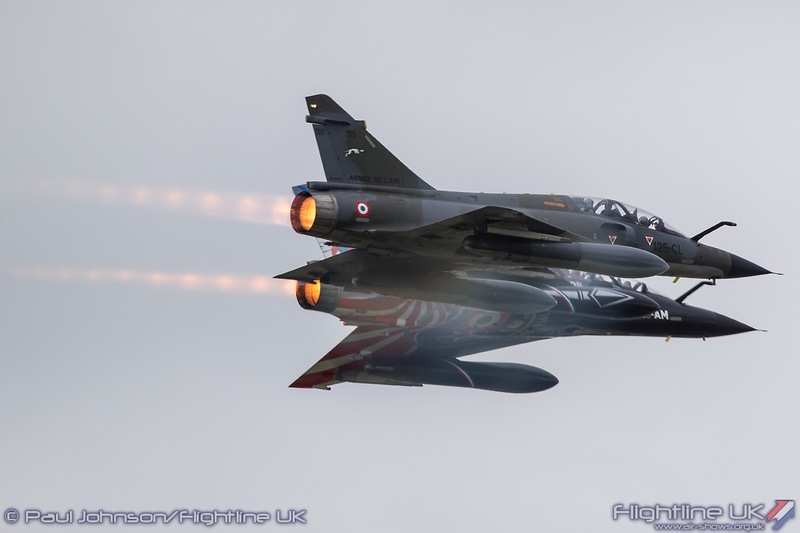 For us — the pilots, the team, the squadron — it’s a special honour because this year is the 100th anniversary of our squadron, the ‘La Fayette’ squadron. 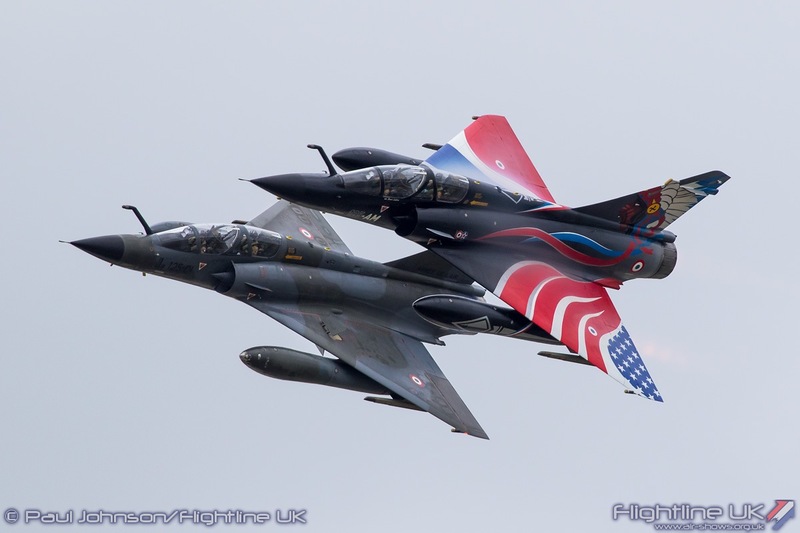 It’s a good ending to the incredible experience that was Ramex Delta.” The night was a double success for Ramex Delta, as the Mirage 2000N they displayed in, which featured a special colour scheme to mark the ‘La Fayette’ squadron centenary, won the award for best livery as voted for by the Friends of the Royal International Air Tattoo (FRIAT). 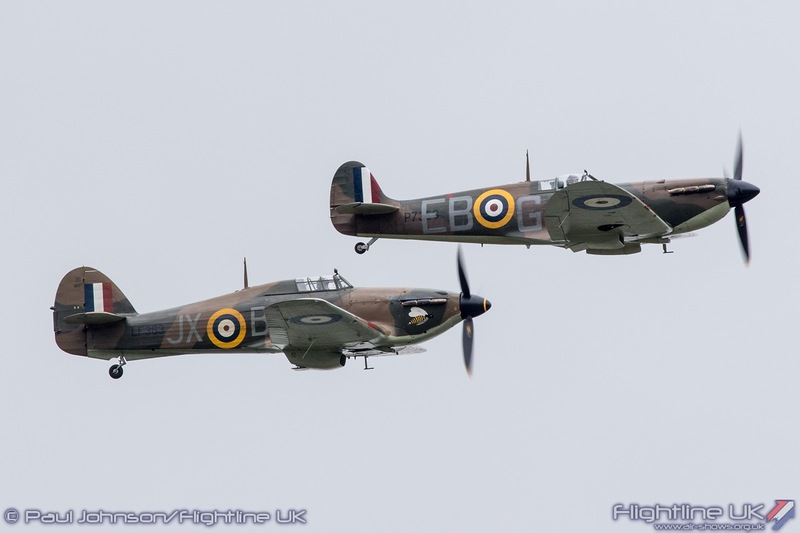 The only warbird content within the flying display came from the fighters of the Battle of Britain Memorial Flight. 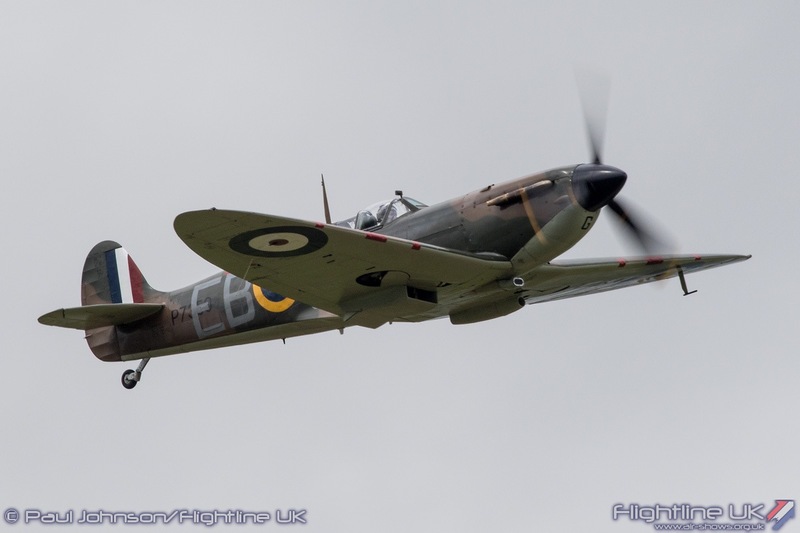 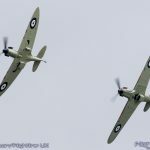 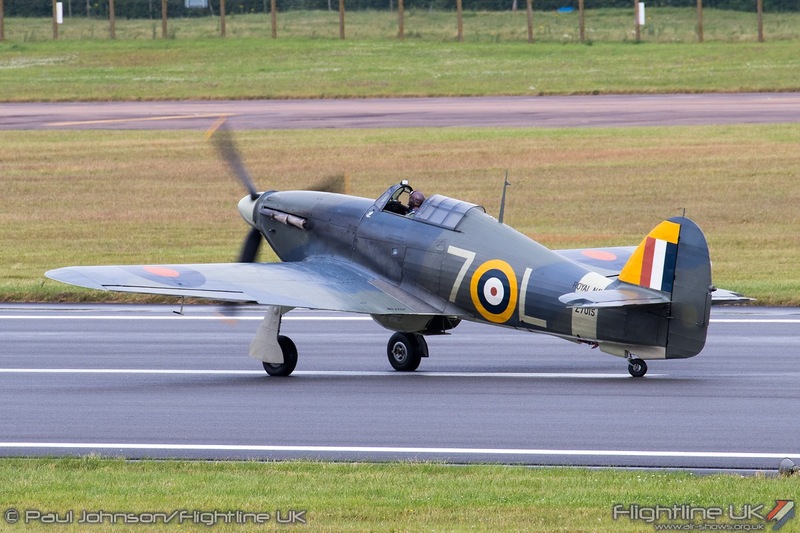 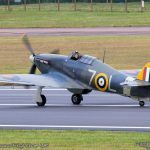 For RIAT they had their Supermarine Spitfire IIa P7350 and Hawker Hurricane IIc LF363. 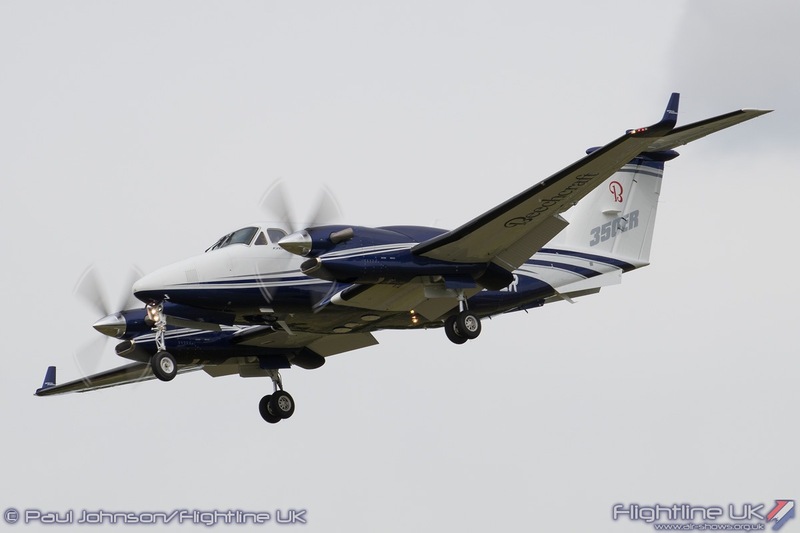 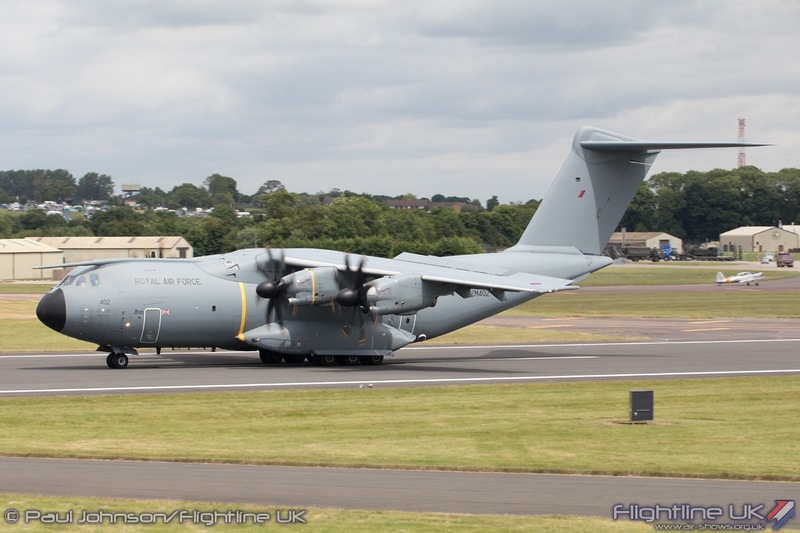 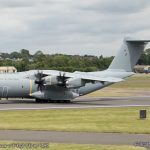 Winds prevented the team from landing at RAF Fairford, but they operated from nearby Gloucestershire Airport. 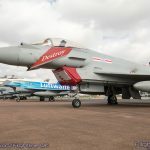 Friday saw a futher historic display marking the history of the Royal Air Force of Oman. 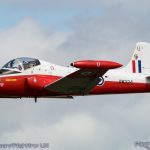 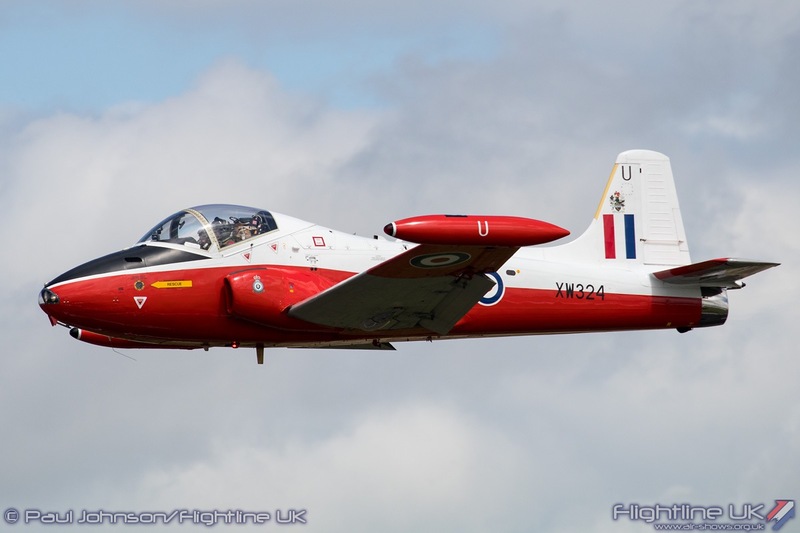 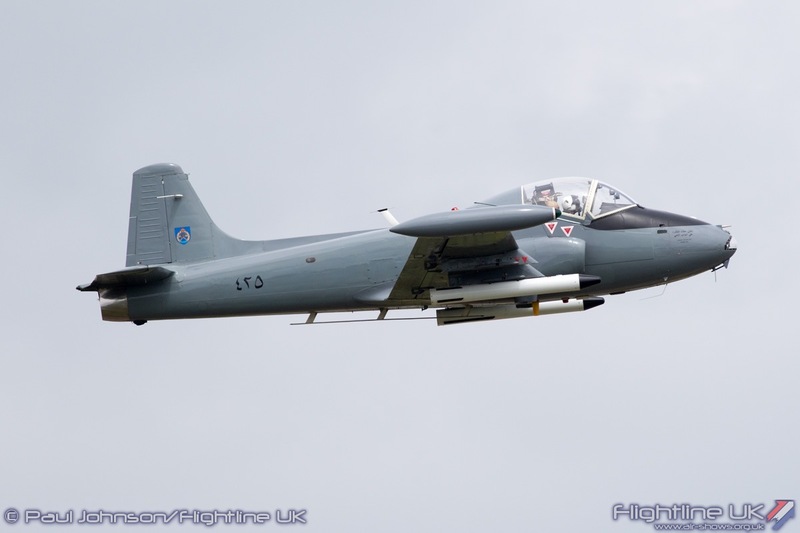 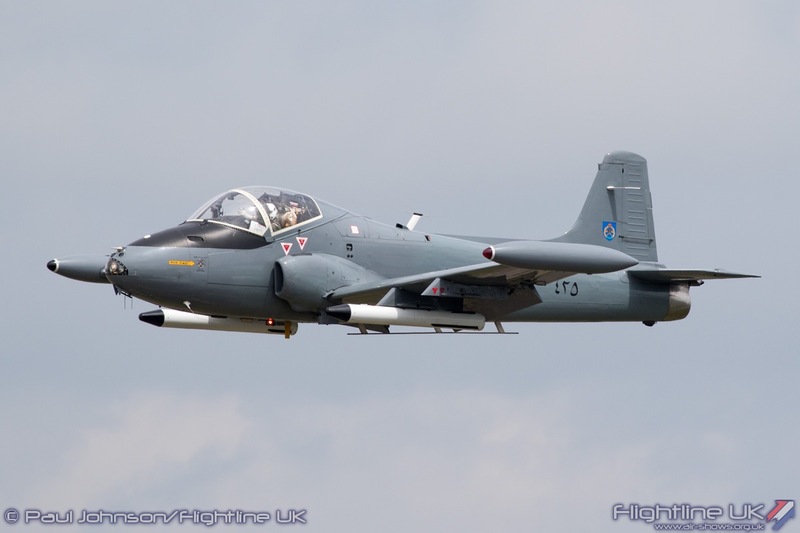 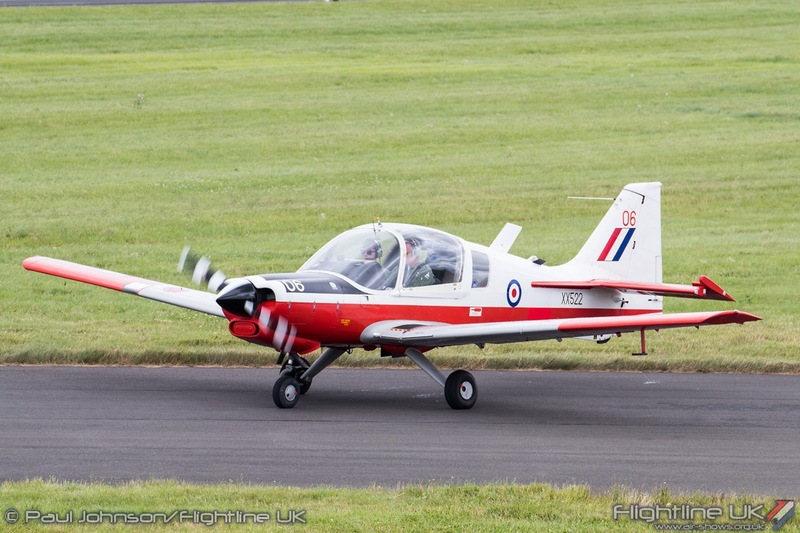 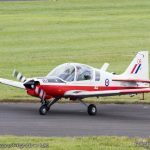 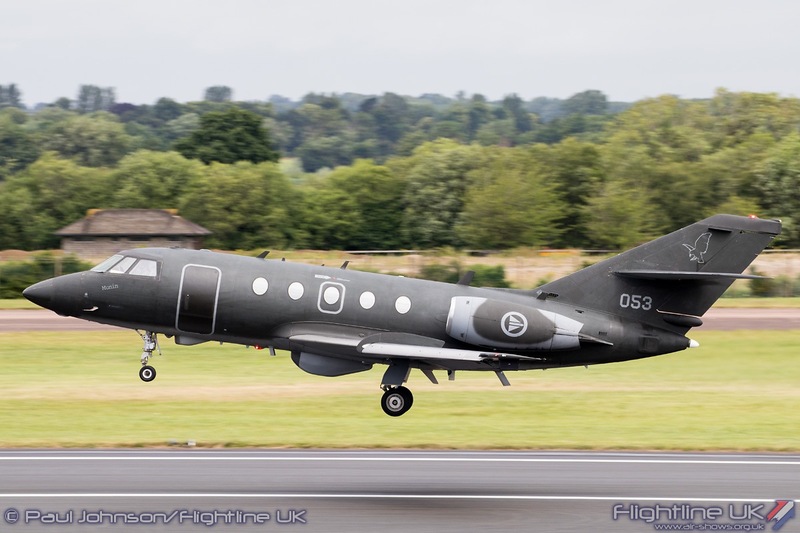 Mark Petrie displayed his BAC Strikemaster Mk82a which had served with Oman and is kept pristine condition by his company, North Wales Military Air Services based at Hawarden Airport. 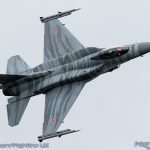 While the fast jets steal the glory, there were other types of military aircraft in the display. 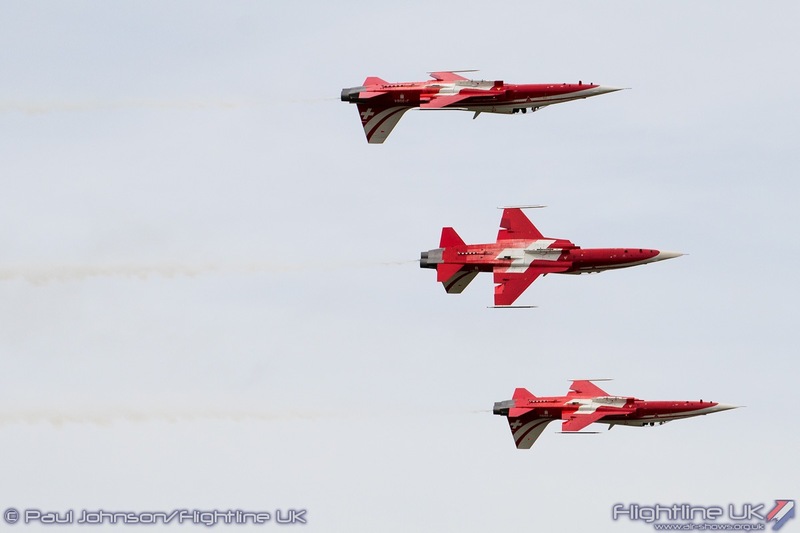 Four very different rotary acts provided some respite from the jet noise. 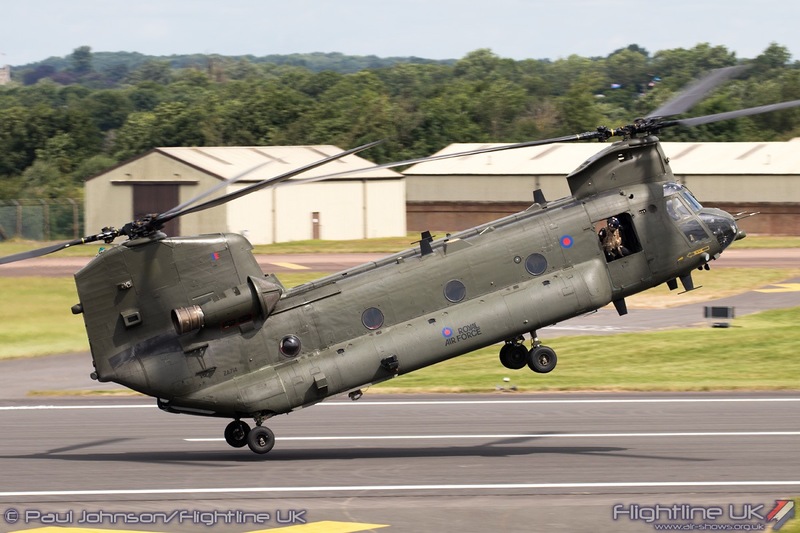 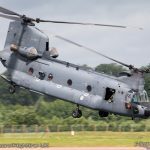 The Royal Air Force’s own Boeing Chinook HC4 display is always a highlight of the display. 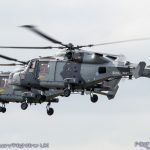 It was also good to see the Royal Navy’s Helicopter Display Team, the Black Cats back at the Air Tattoo after several year’s absence. 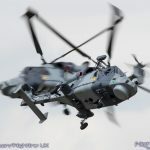 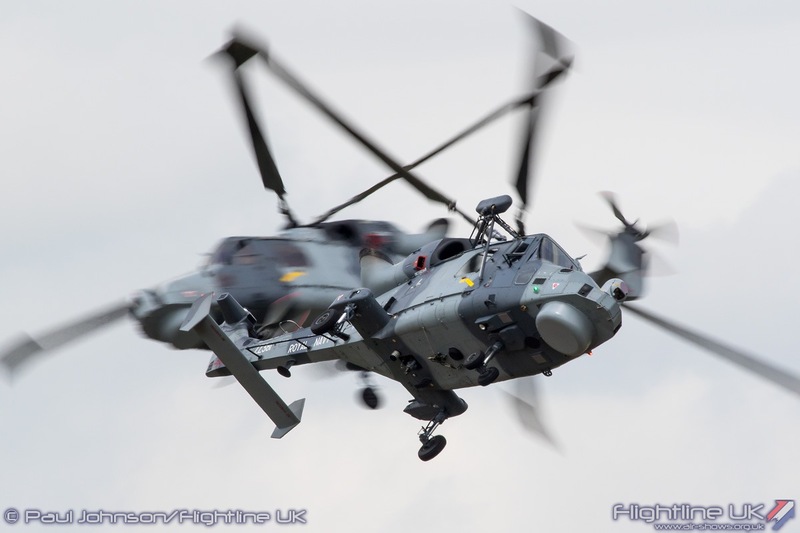 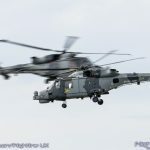 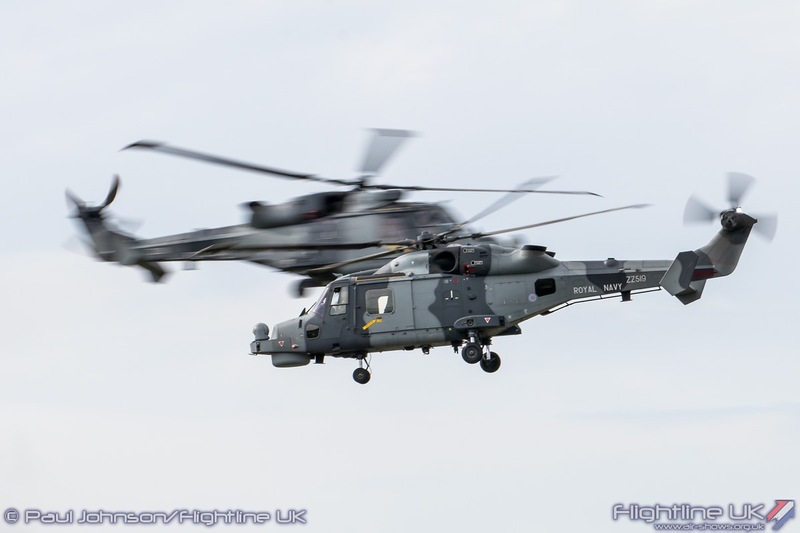 The last time they flew at RIAT they were flying a pair of Lynx HMA8 helicopters. 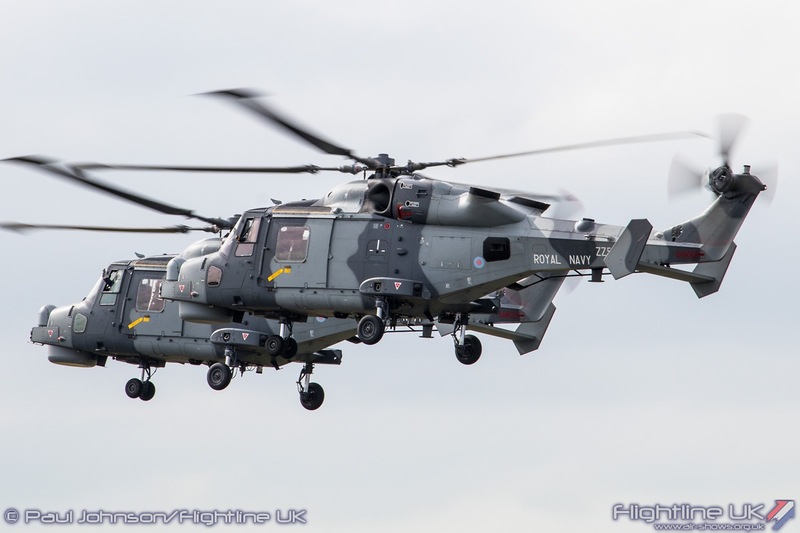 Now they fly the AgustaWestland AW159 Wildcat HMA2 which was the perfect fit for “The Next Generation” theme of the event. 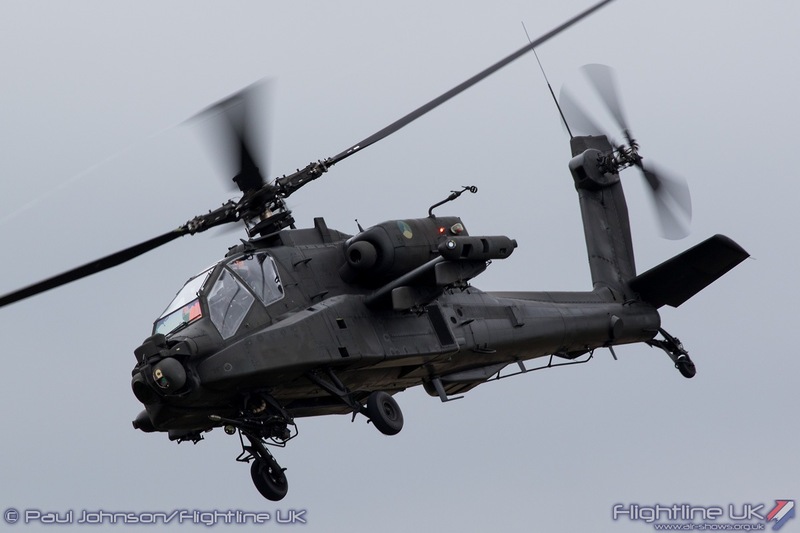 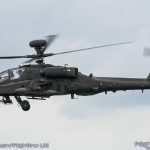 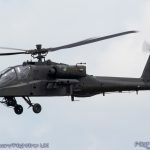 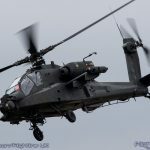 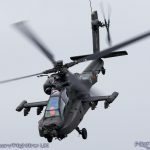 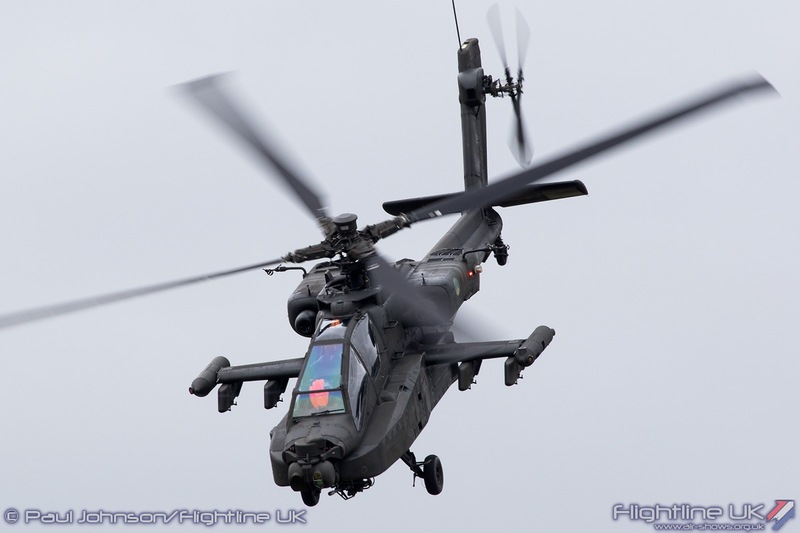 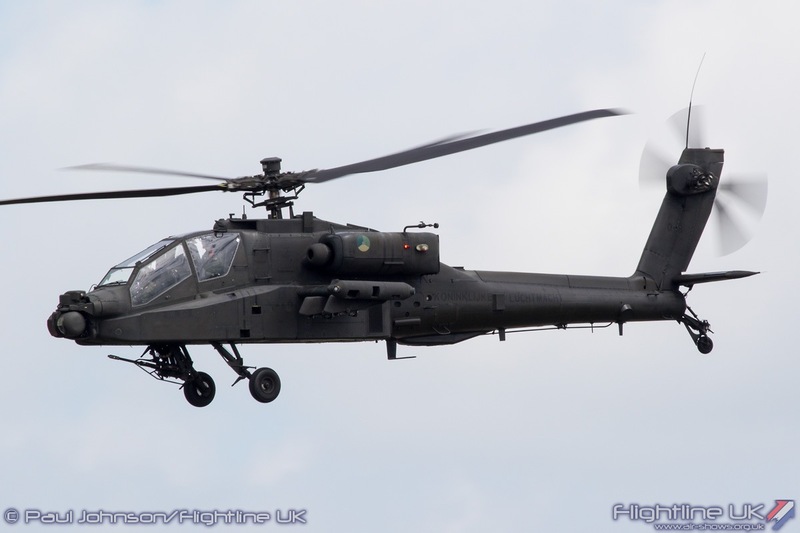 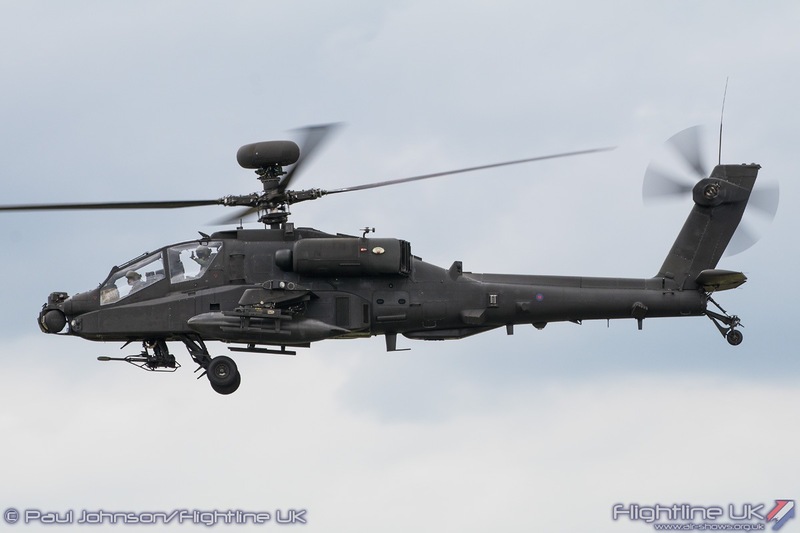 The solo contribution of the Royal Netherlands Air Force to the flying was the Boeing AH-64D Apache display. 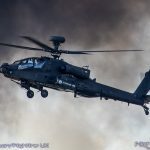 Sadly, the Apache Demo Team are unable to use their flares at RIAT, but their routine is still very impressive showing just how aerobatic such a large, heavy helicopter can be. 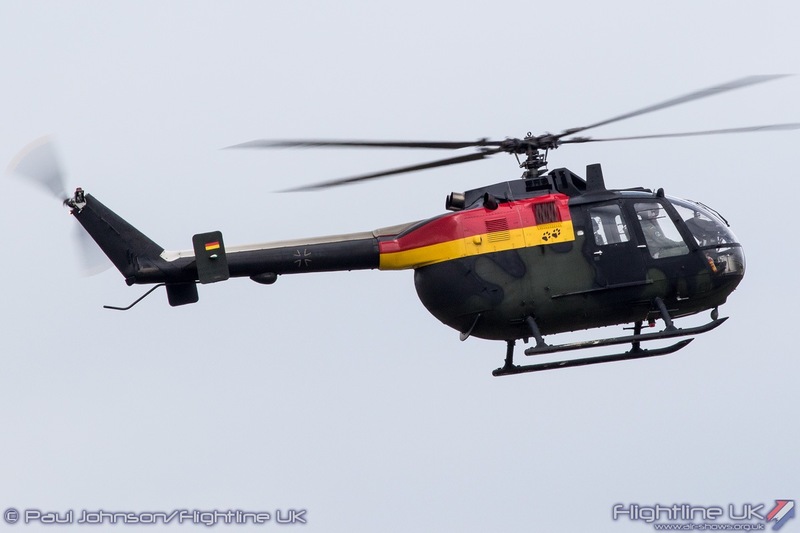 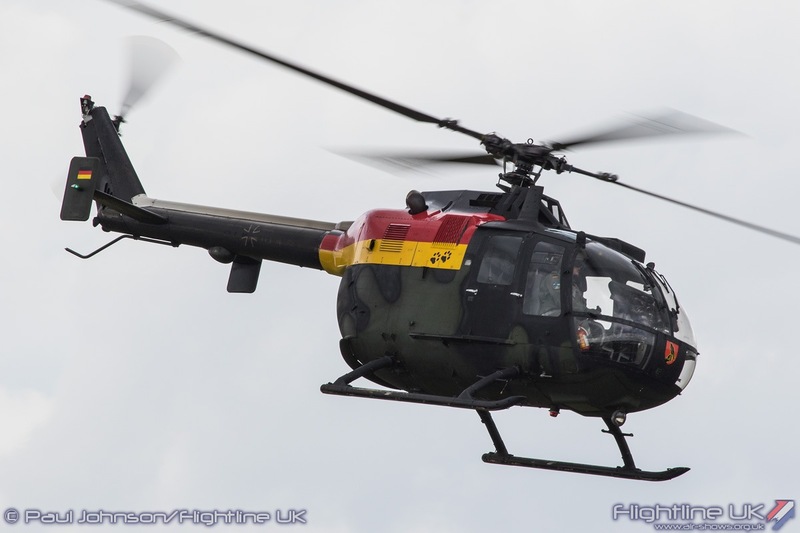 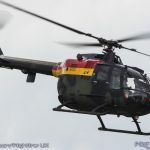 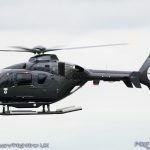 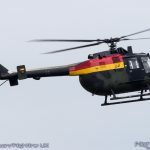 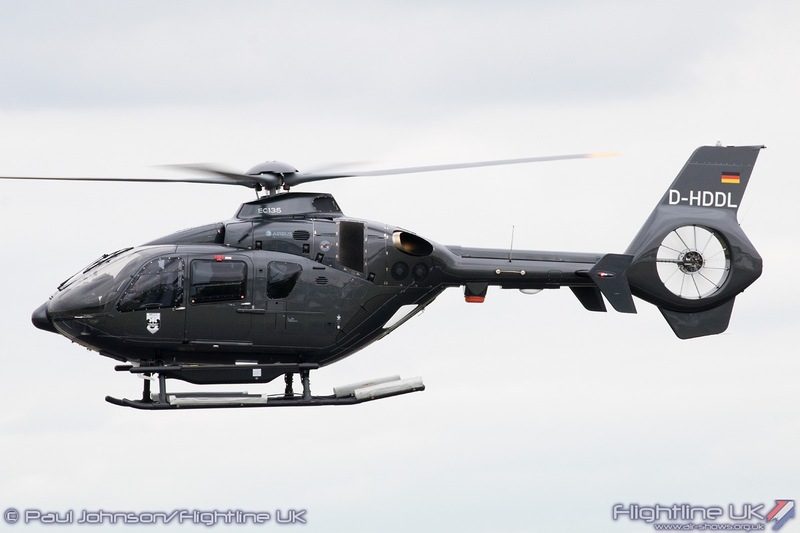 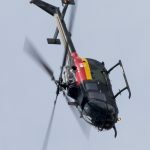 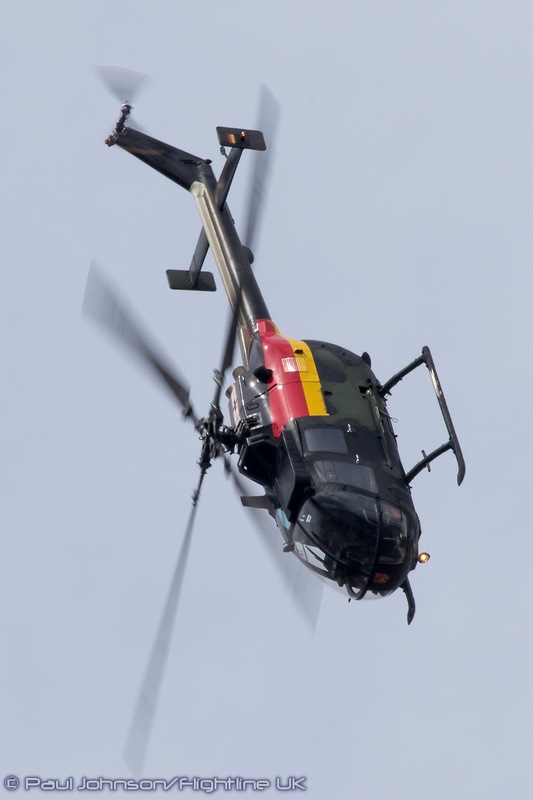 More startling helicopter aerobatics came from the German Army MBB Bo105P1 display which was making its final RIAT appearance as the type is slowly withdrawn. 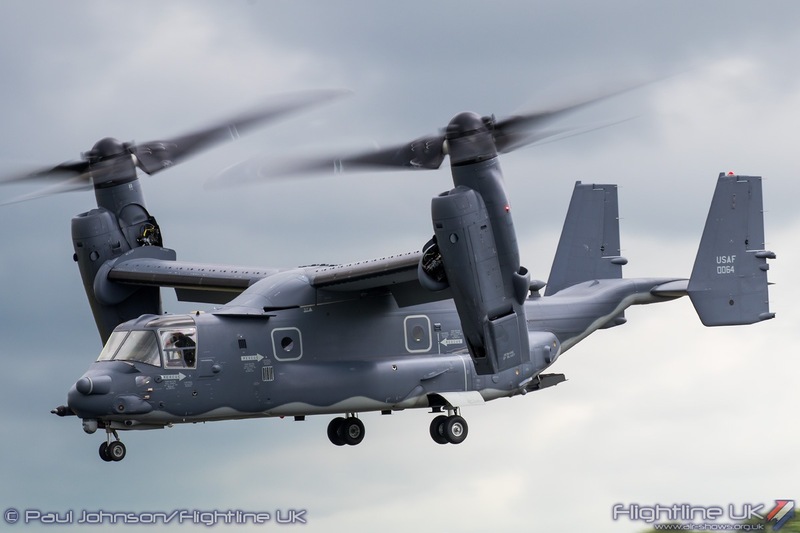 Completing the rotary line-up was Bell/Boeing CV-22B Osprey from the 352nd Special Operations Group at RAF Mildenhall. 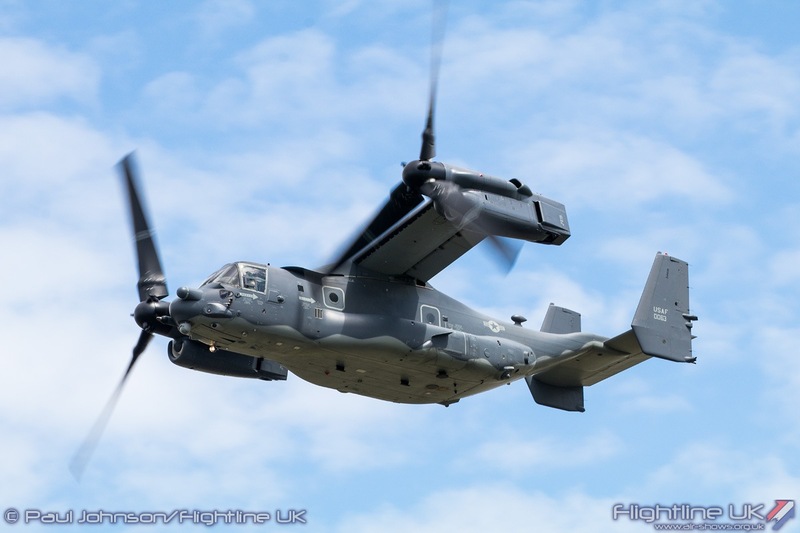 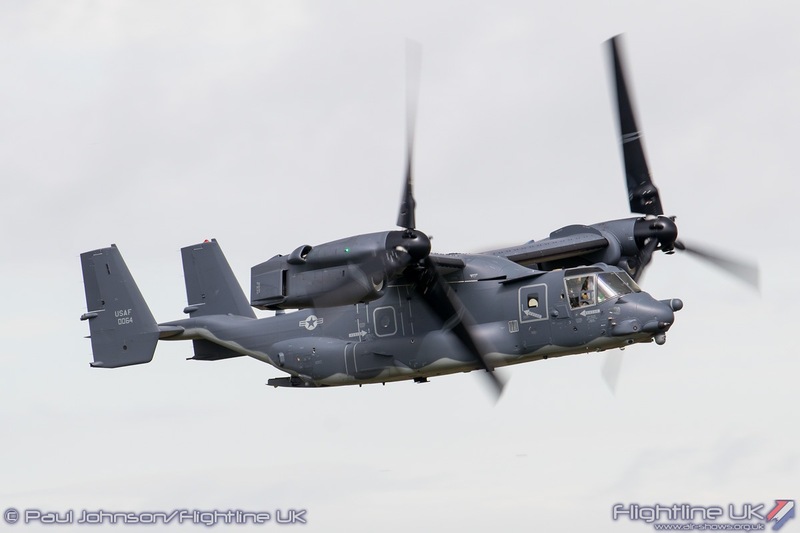 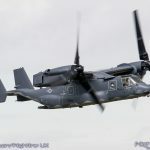 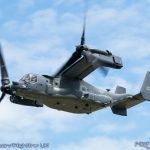 The Tilt-Rotor Osprey performed a very spirited low-level role-demonstration of all the characteristics is needs as the USAF’s Combat Search and Rescue aircraft of choice for the European theatre. 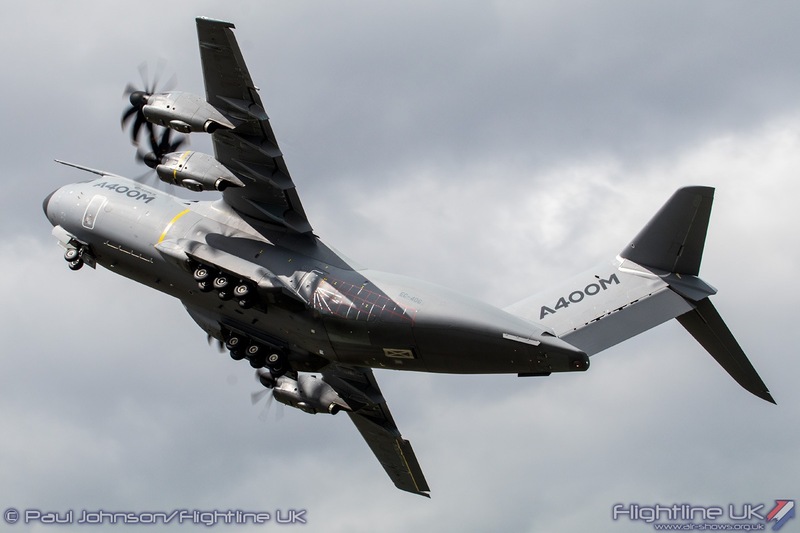 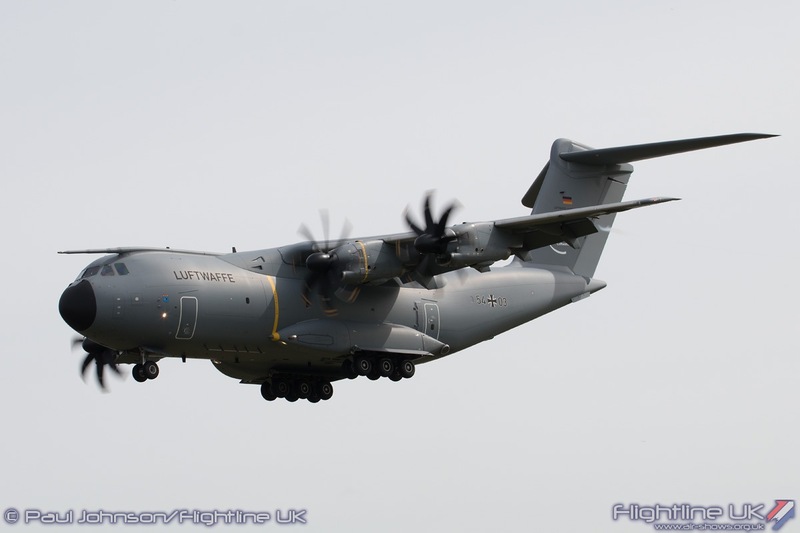 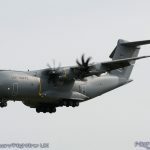 One aircraft that never fails to make a dramatic impression on the crowd is the Airbus DS A400M Atlas. 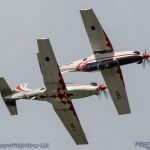 The Airbis test pilots put on routine that seems to defy the aircraft’s sheer size showing off agility that you would think only smaller types could achieve. 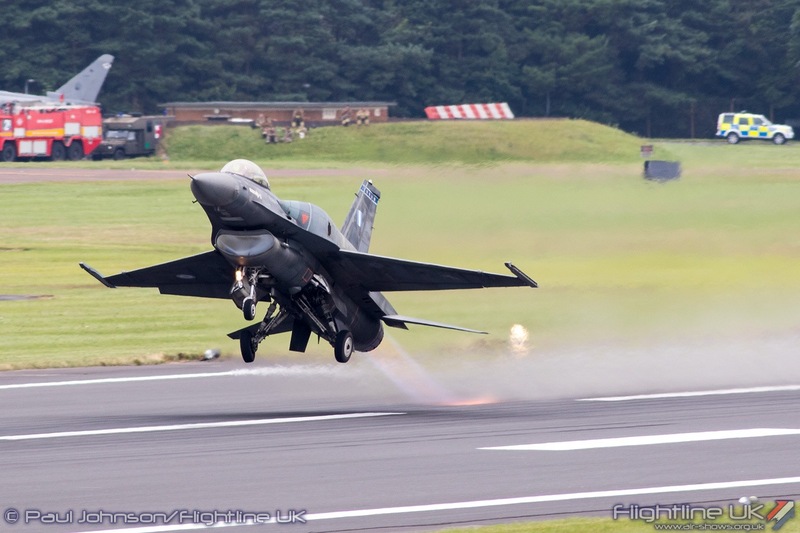 The steep take-off sets the scene with the aircraft climbing away from Fairford before entering a steep descending turn to return to the display line and start its display. 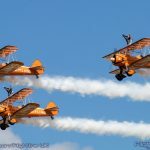 RIAT’s flying display is not just about solo displays – there are some great team displays from civilian and military performers. 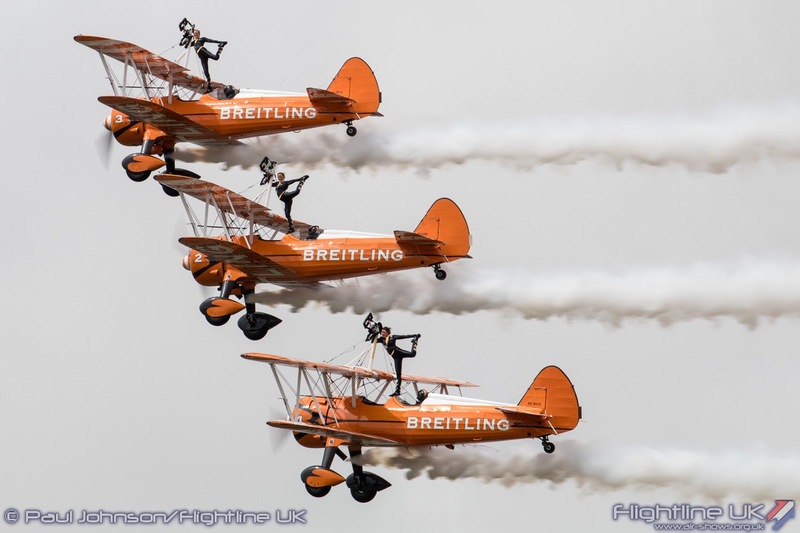 Show sponsor Breitling always have a package of aircraft at the event. 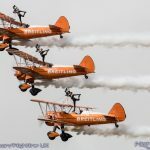 This year they concentrated on the flying with set-piece of flying opening by the Breitling Wingwalkers. 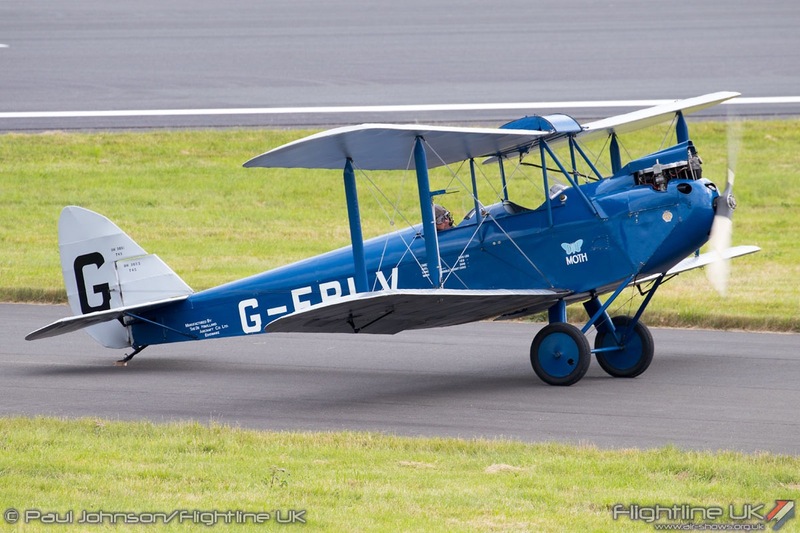 The team are based just a few miles to the north of Fairford at the restored World War One airfield at Rencombe. 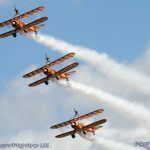 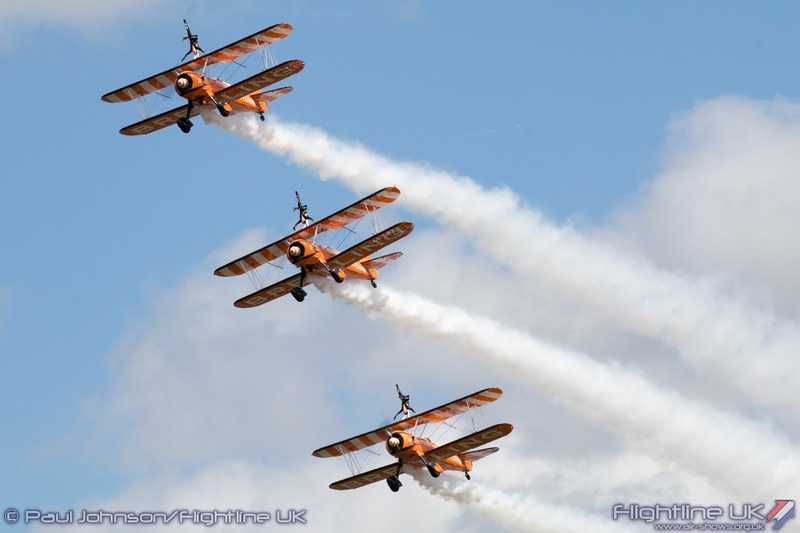 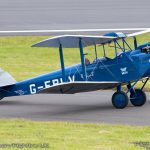 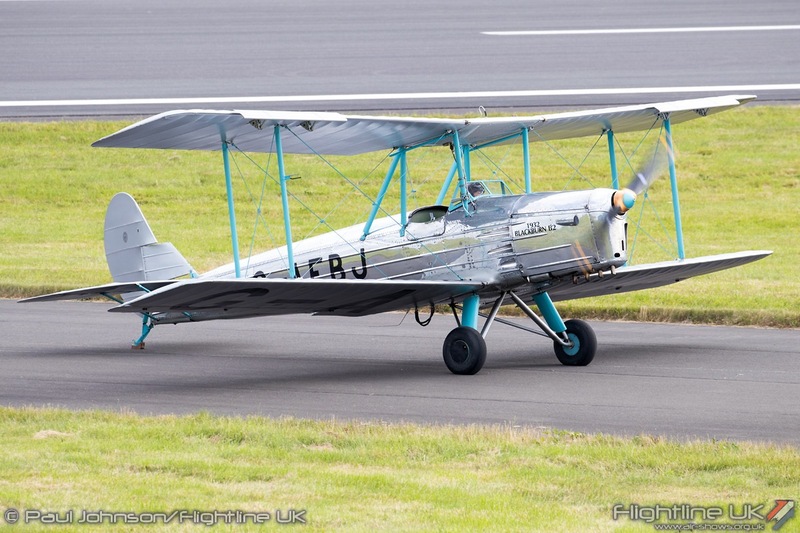 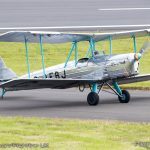 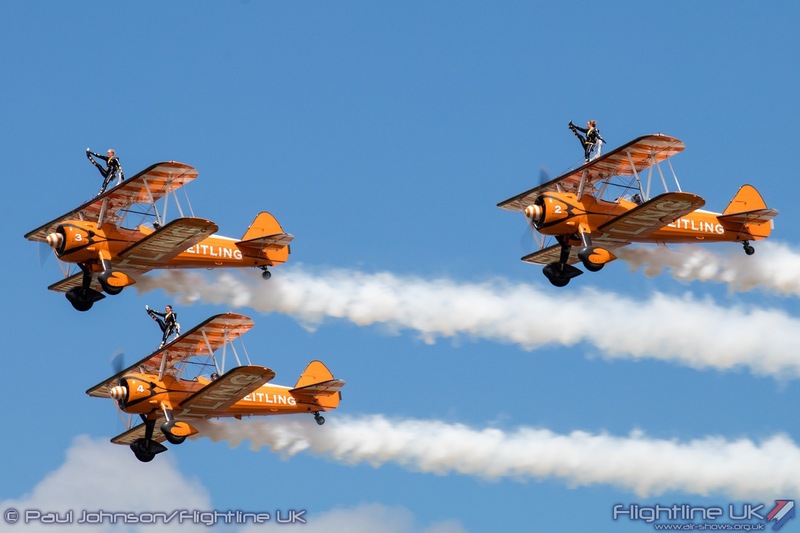 They presented a three-ship display at RIAT with Emily Guilding, Nikita Salmon and Florence Rolleston-Smith on top of the wings with Dave Barrell, Martyn Carrington and Steve Hicks piloting the Boeing Stearman biplanes. 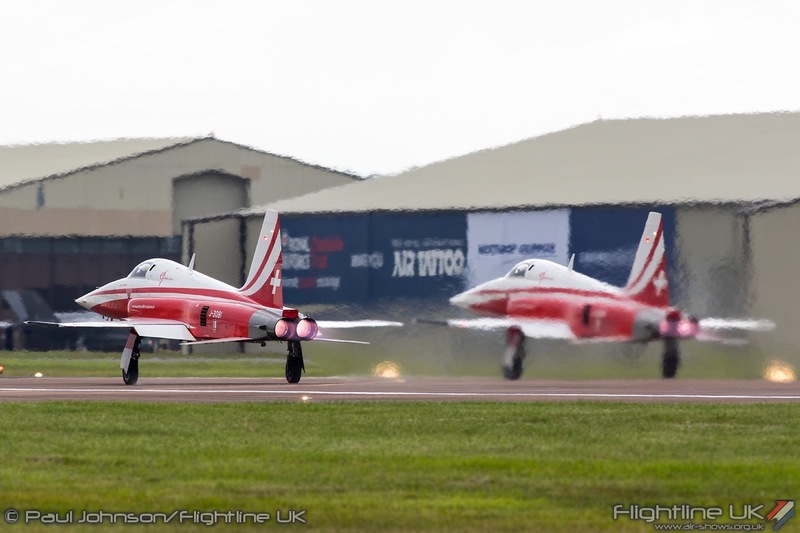 They were following by one of Breitling’s latest recruits, Aude Lemordant flying her Extra 330SC. 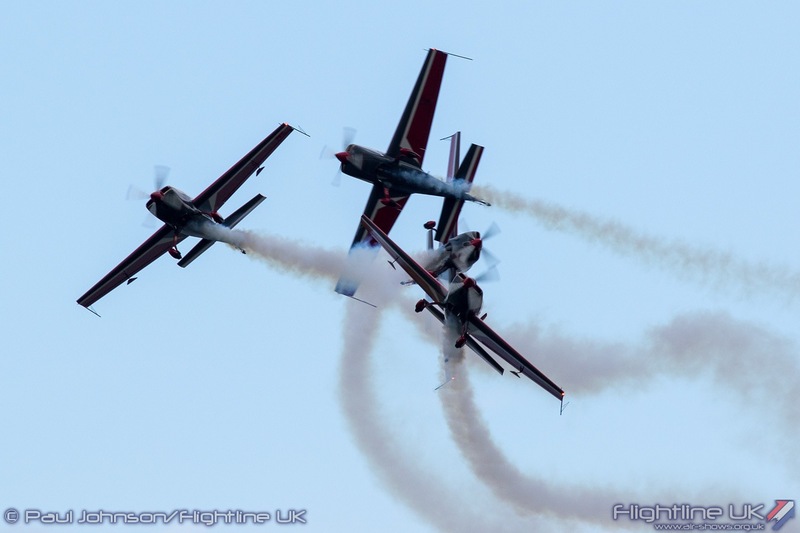 Aude a multiple aerobatic champion winning the women’s French aerobatic championships between 2011 and 2014 and World champion in 2013 and 2015. 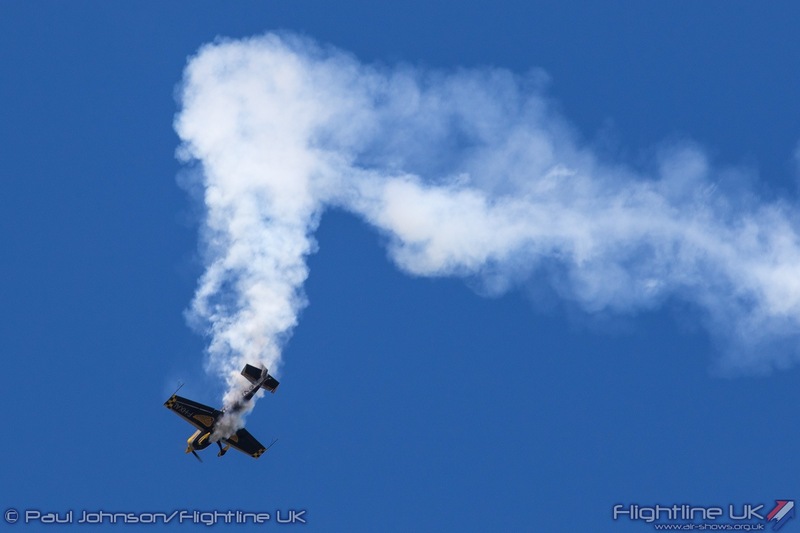 Her display, if a little distant, highlighted Aude’s very precise aerobatics that have won her so many competitions. 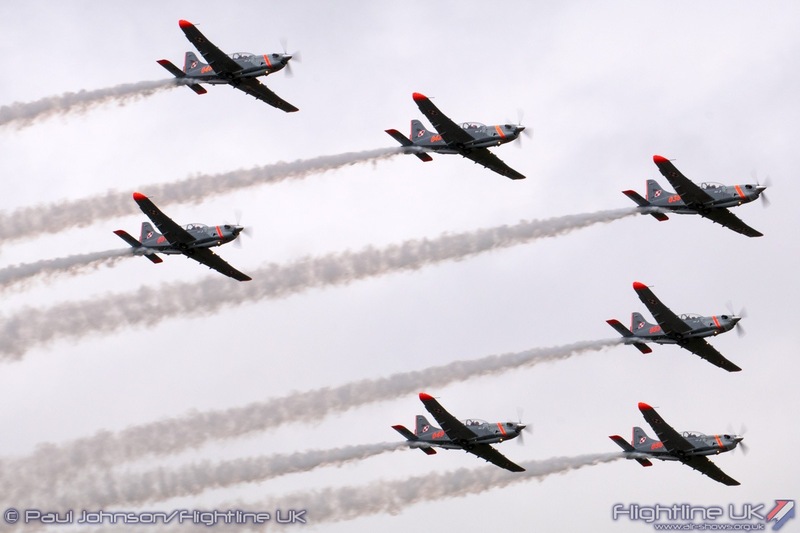 National aerobatic team are always a major part of any Air Tattoo. 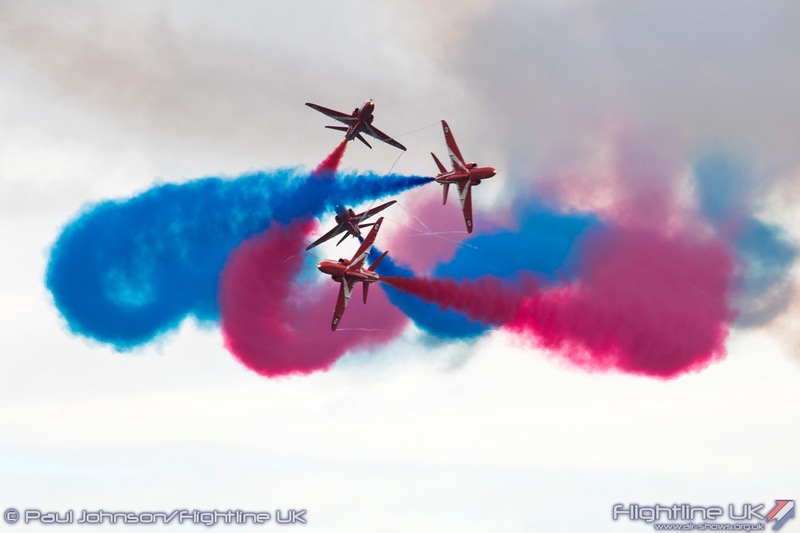 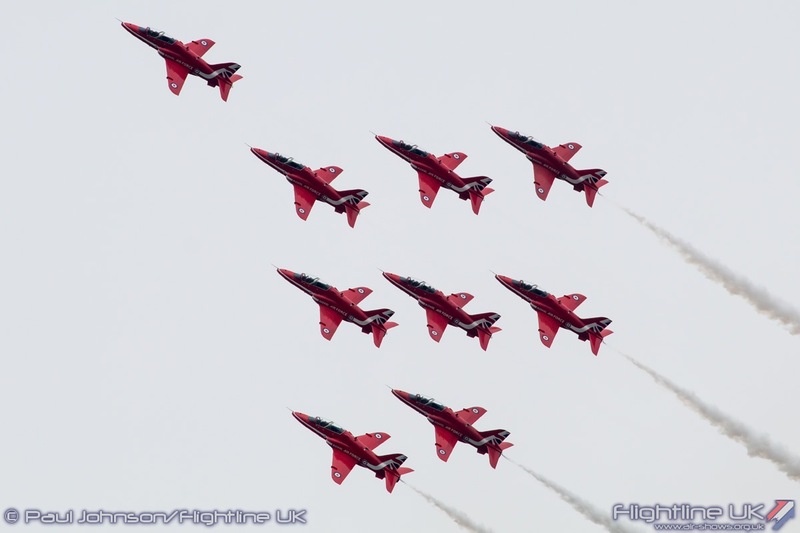 The Royal Air Force’s own Red Arrows were naturally part of the incredible line up of teams. 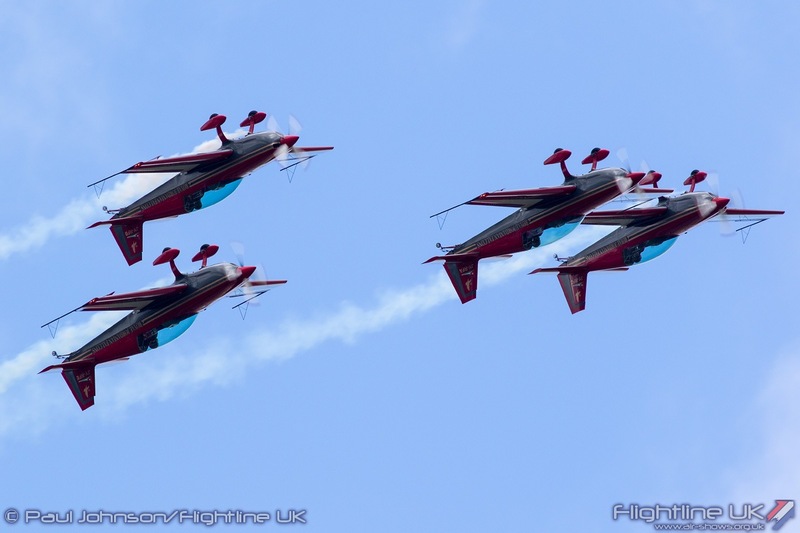 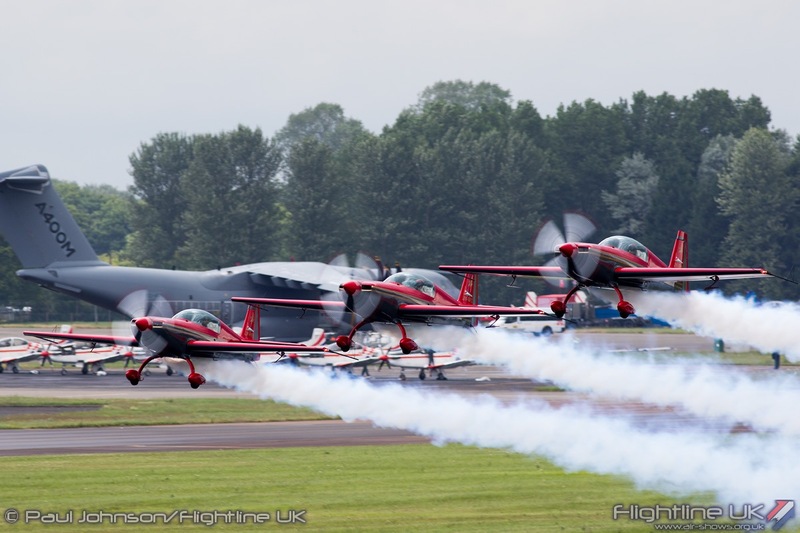 The Royal Jordanian Falcons are also regular participants flying their four Extra 300Ls. 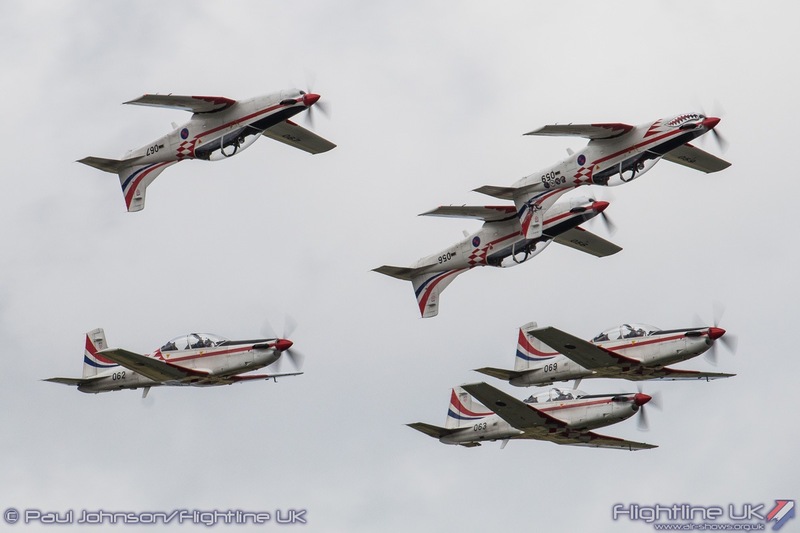 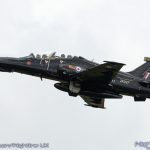 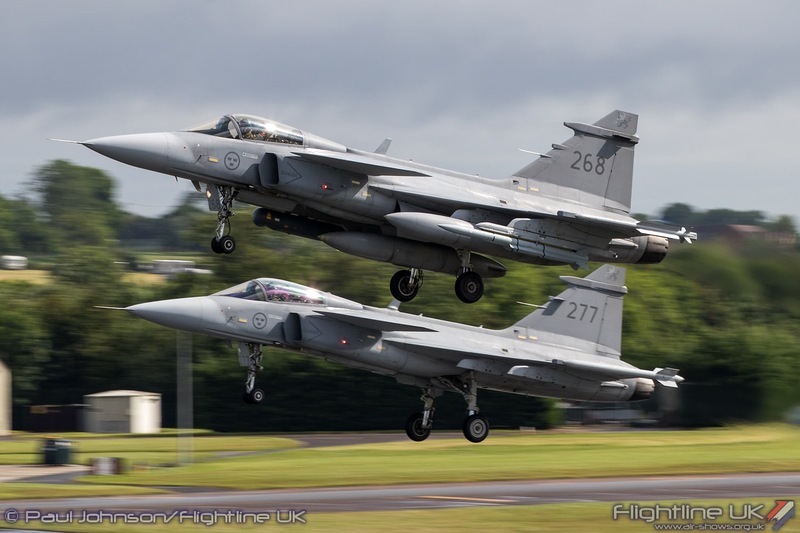 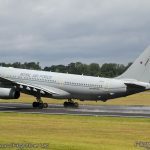 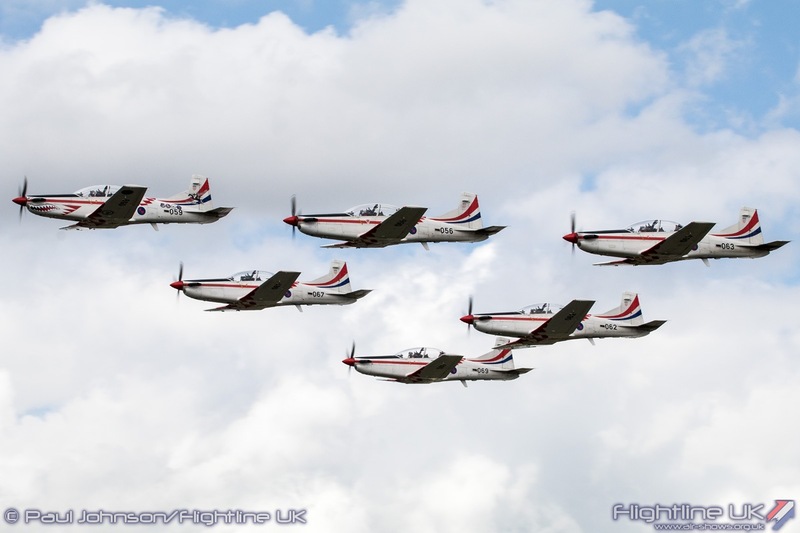 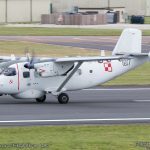 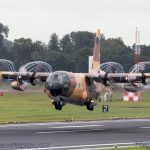 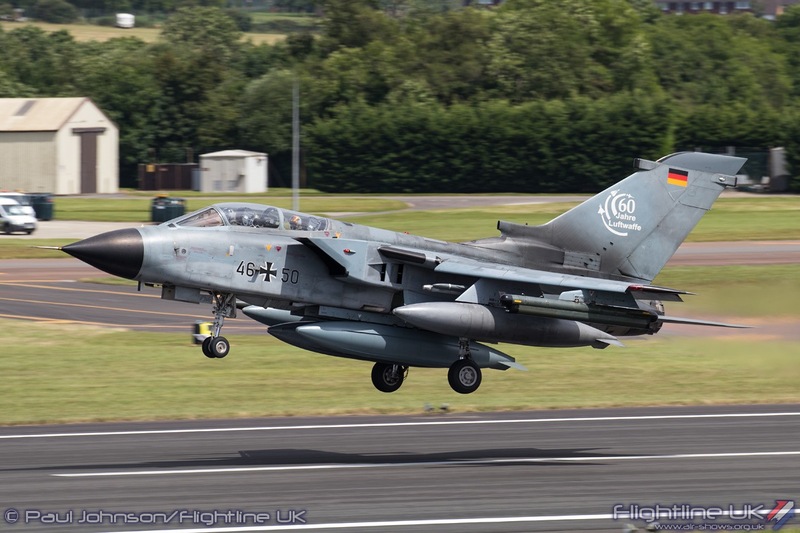 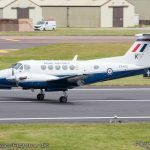 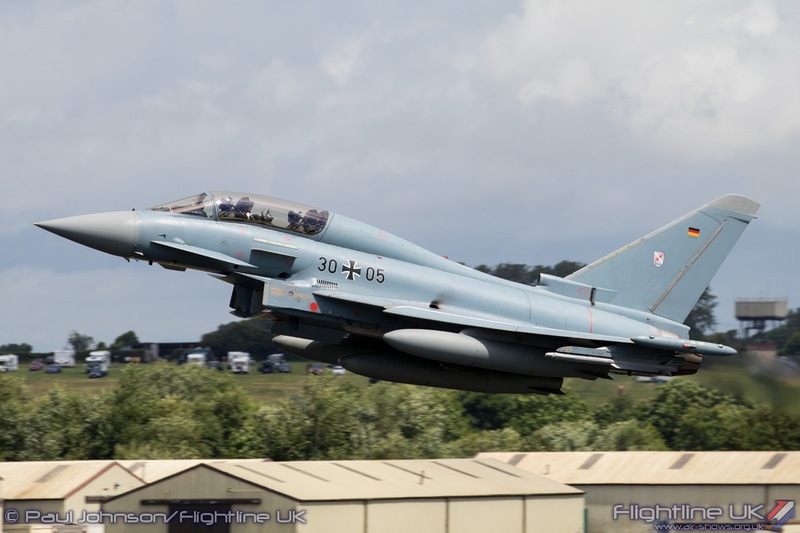 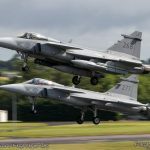 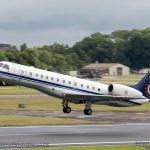 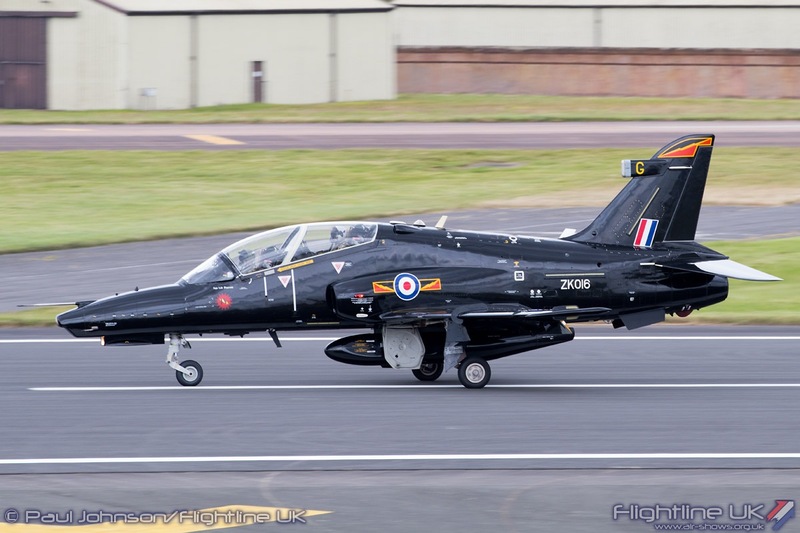 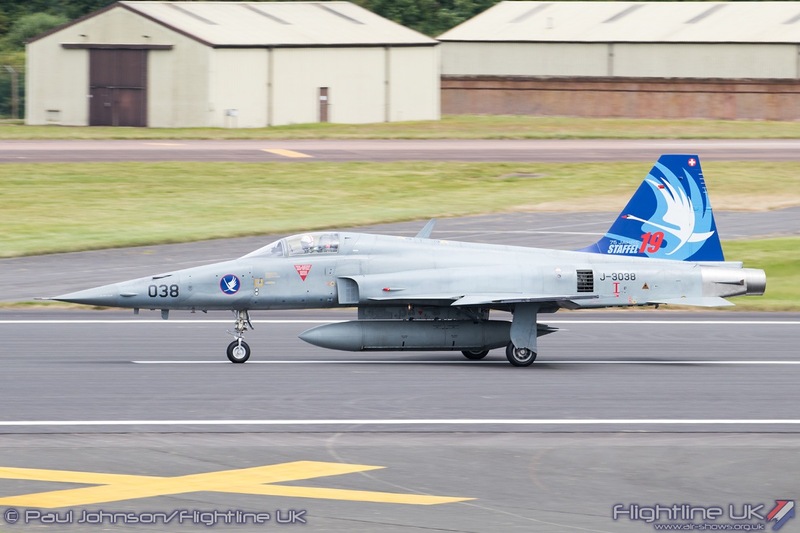 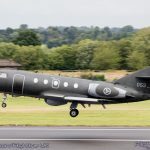 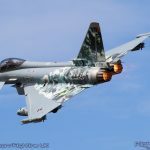 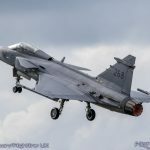 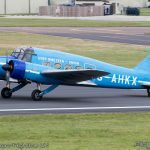 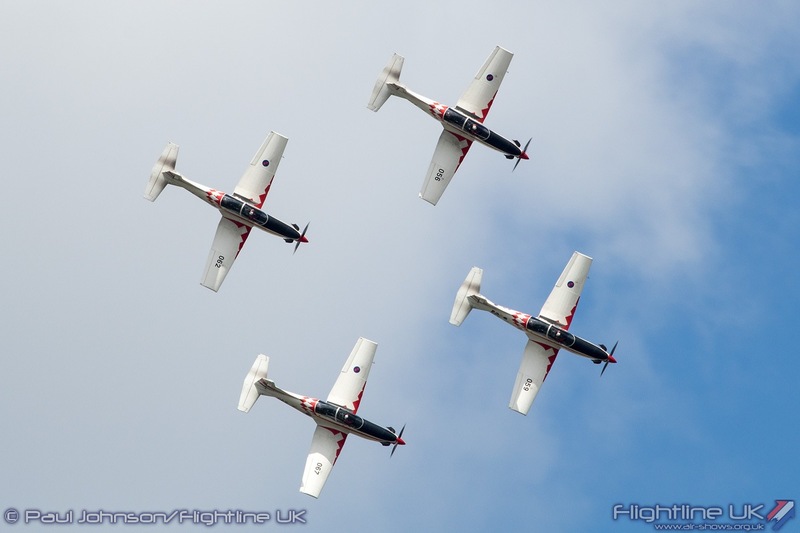 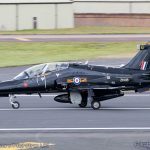 For 2016 they were joined by the Polish Air Force Team Orliky who were completing a mini-UK tour having taken in the RNAS Yeovilton International Air Day the week before. 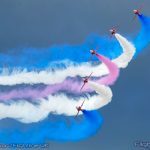 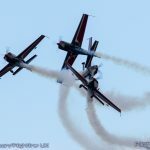 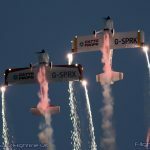 They have been infrequent visitors to the Air Tattoo, but have steadily improved their display into a very pleasing aerial ballet of formation, synchronised and solo aerobatics. 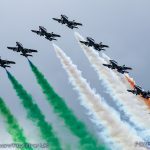 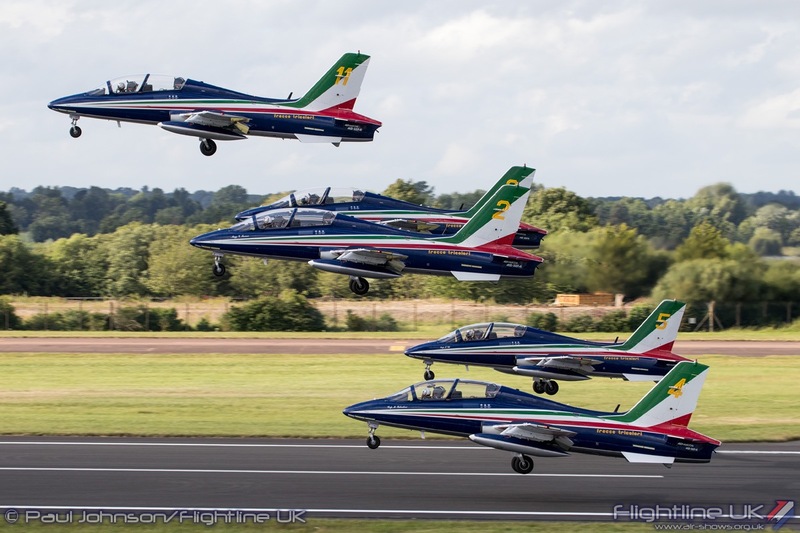 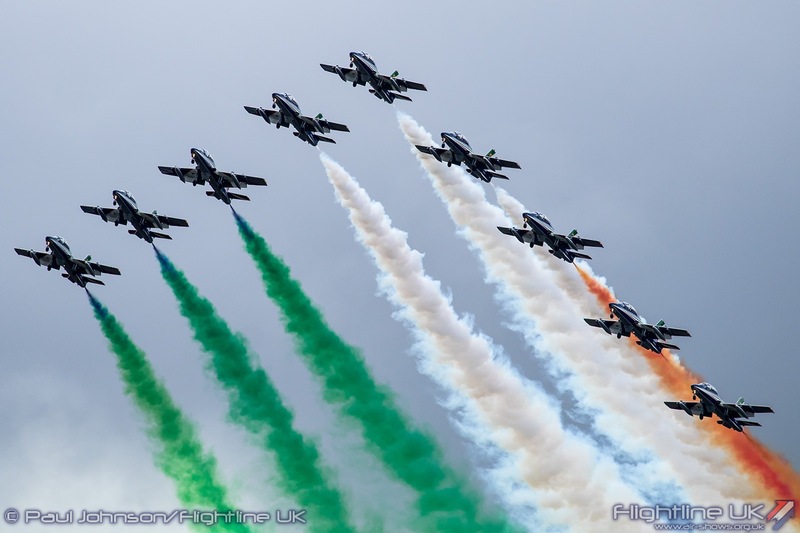 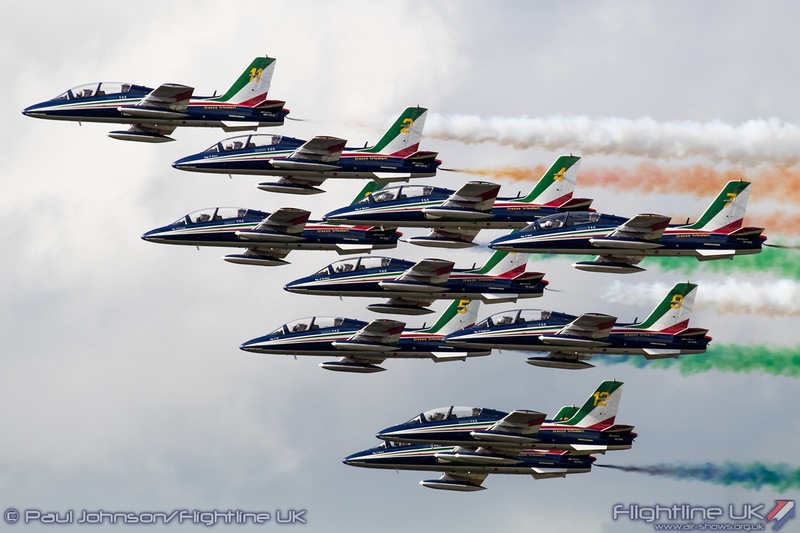 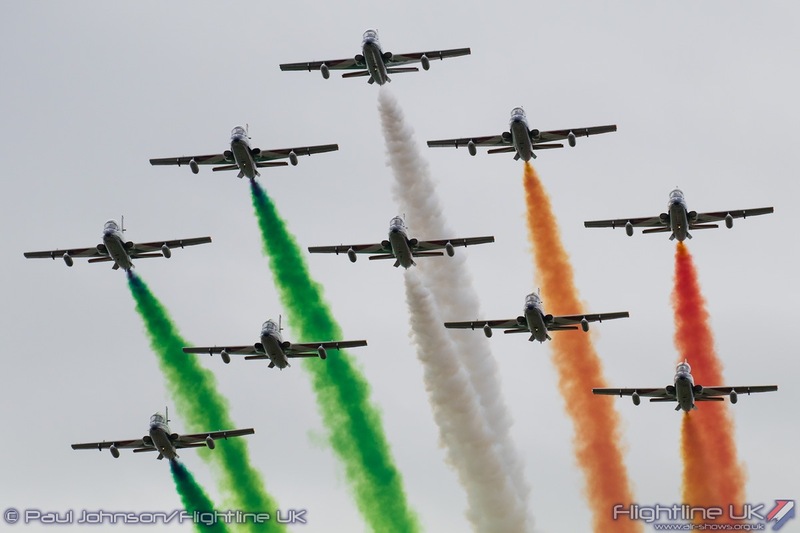 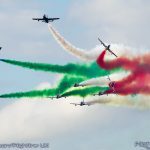 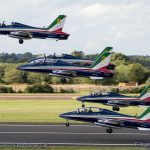 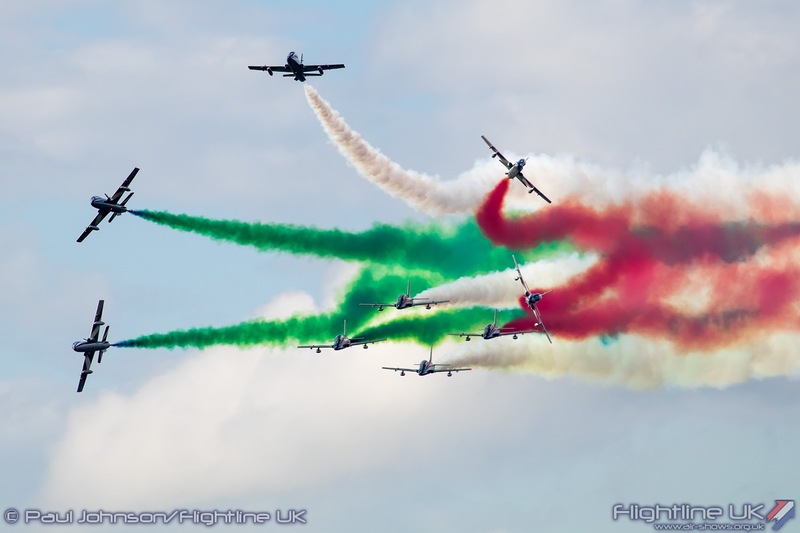 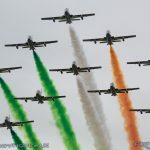 The honour of closing the Air Tattoo went to the Italian Air Force’s Il Frecce Tricolori flying their ten Aermacchi AT-339PAN jets. 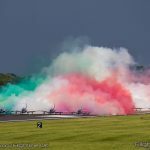 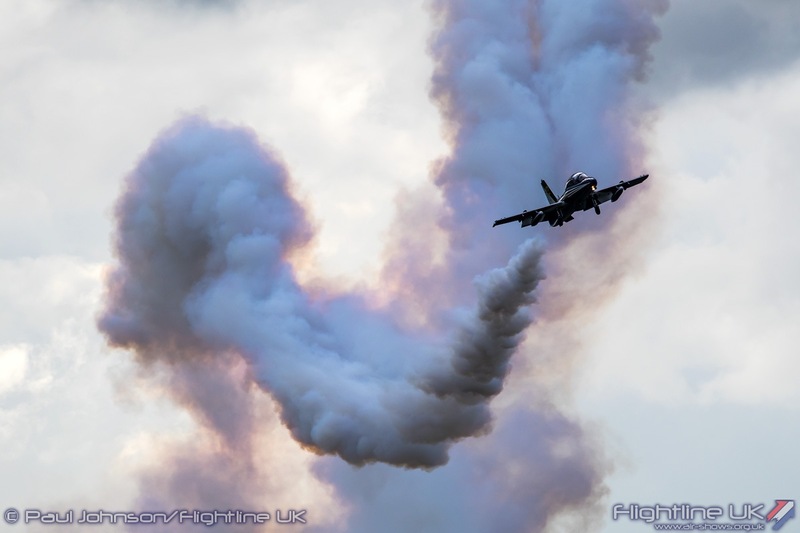 While Saturday’s cloud cover prevented their full routine, the team had just a big enough gap in the clouds at the end of Sunday’s display to allow them to present their incredible full show – there is no finer way to close a display at Fairford! 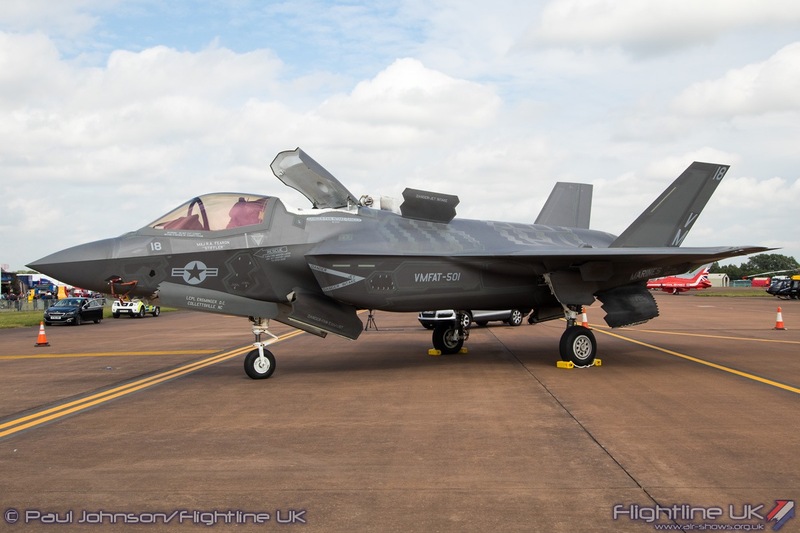 The big headline at the Air Tattoo was however the first appearance in the UK of the Lockheed Martin F-35 Lightning II 5th Generation Fighter. 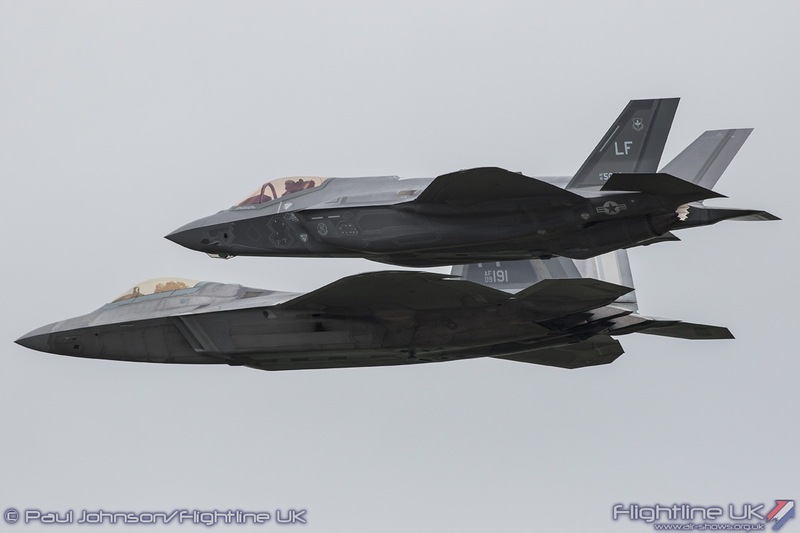 In all, six F-35s crossed the Atlantic for the Air Tattoo, three F-35As from the United States Air Force, two F-35B from the United States Marine Corp and one UK F-35B supported by both Royal Air Force and Royal Navy personnel. 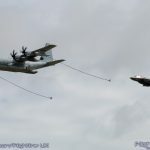 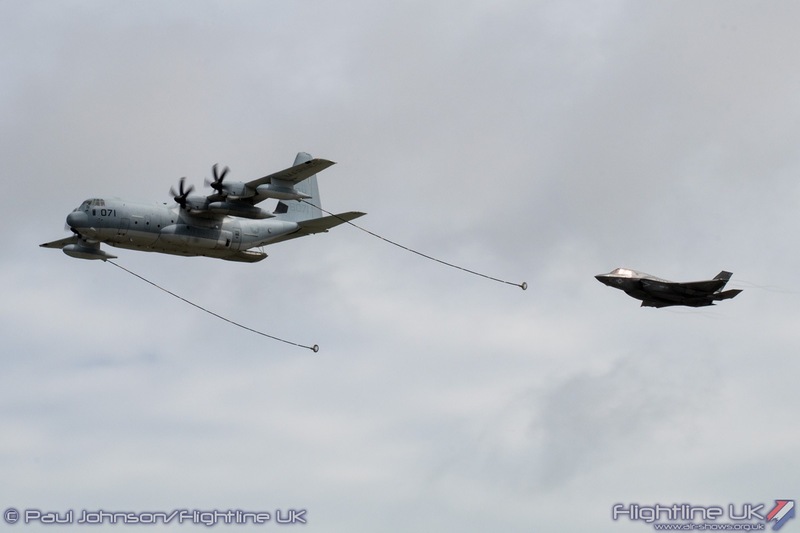 Friday’s display opened with the first public appearance by the F-35B Lightning II from the USMC when it performed a brief aerial refuelling role demonstration flypast with a USMC Lockheed Martin KC-130J Hercules II. 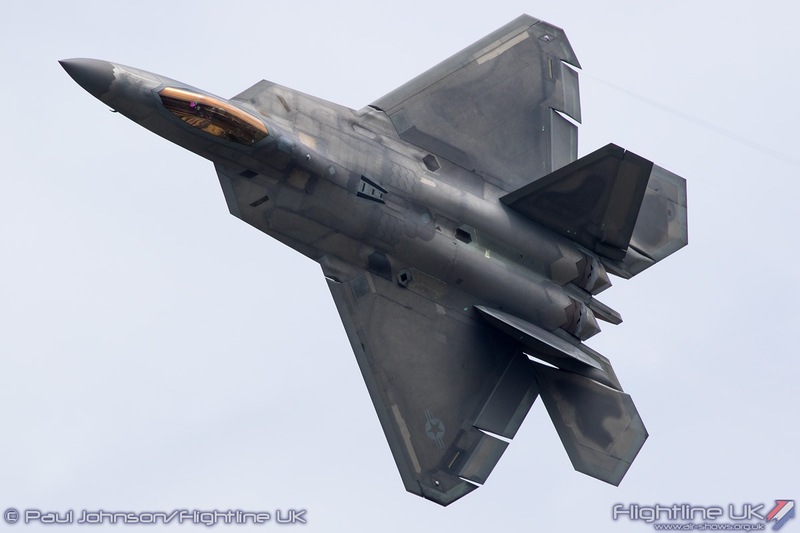 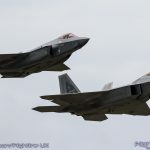 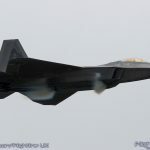 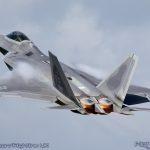 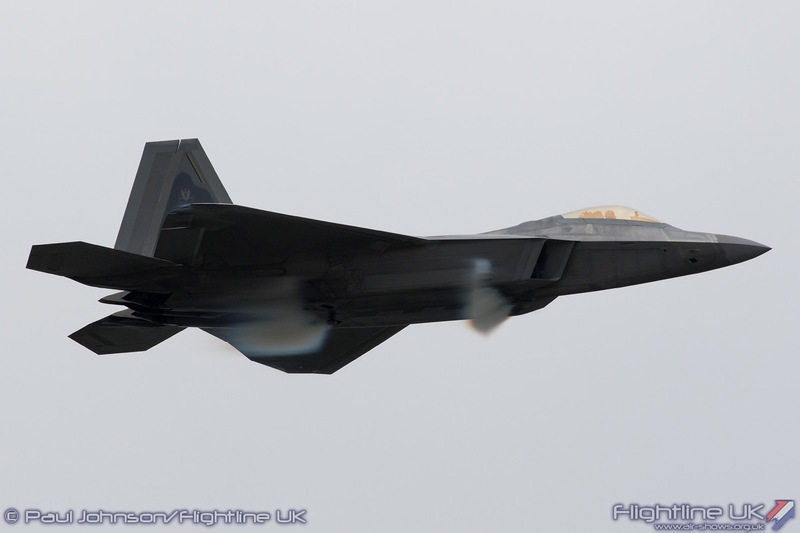 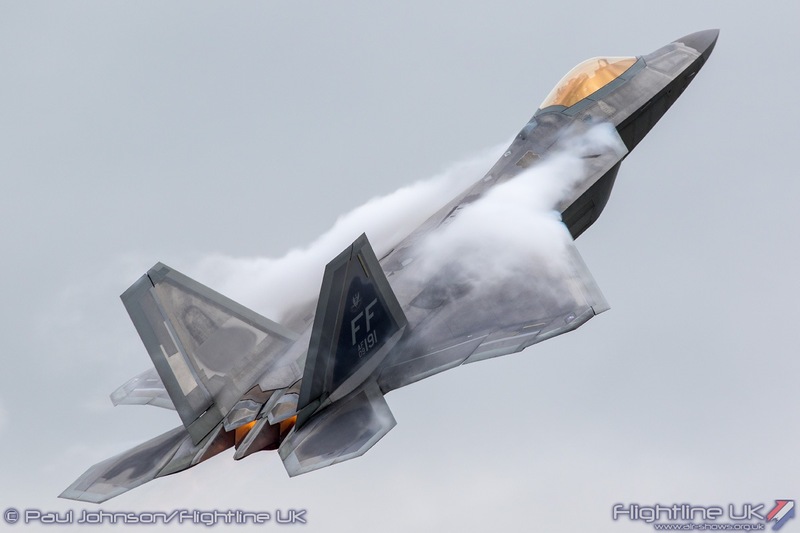 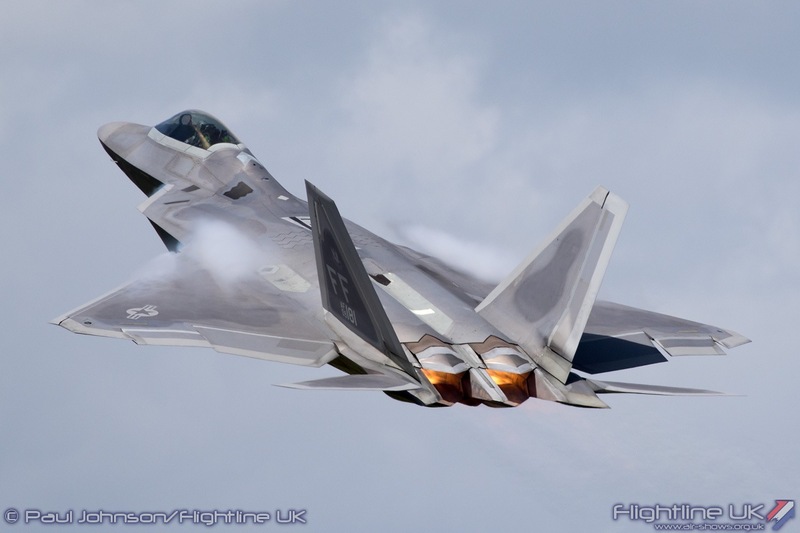 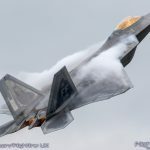 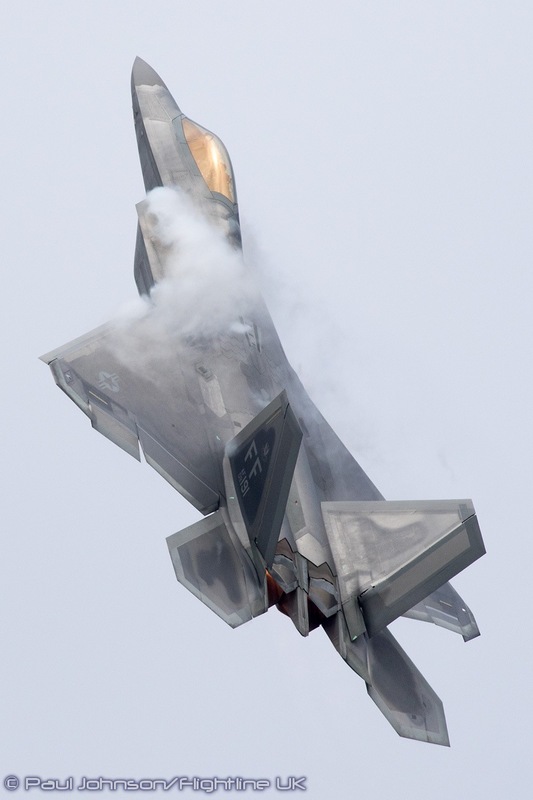 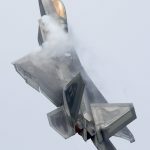 Once the F-22 had completed its display, it was time for the Heritage Flight. 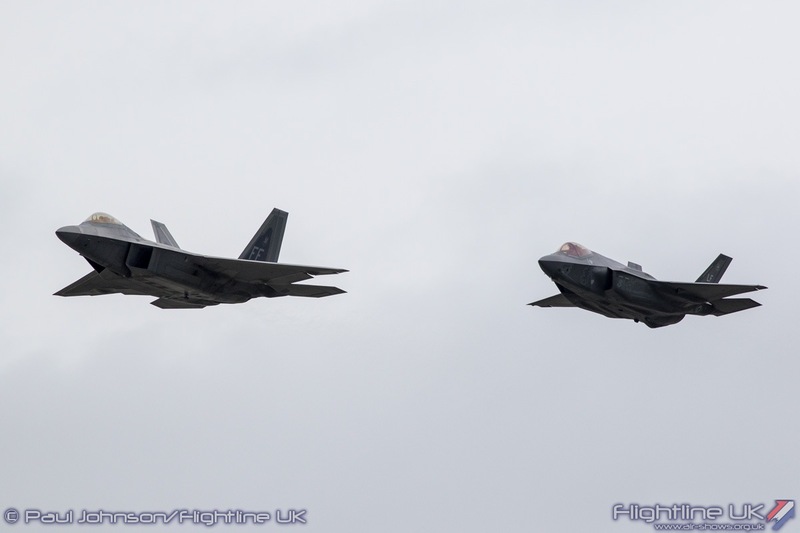 For the Friday and Saturday, weather prevented the North American P-51D Mustang ‘Miss Helen’ from reaching RAF Fairford leaving the formation to just the pair F-22A and F-35A. 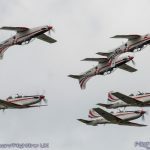 The flypasts were certainly a statement by the United States Air Force of its current and future abilities on the world stage. 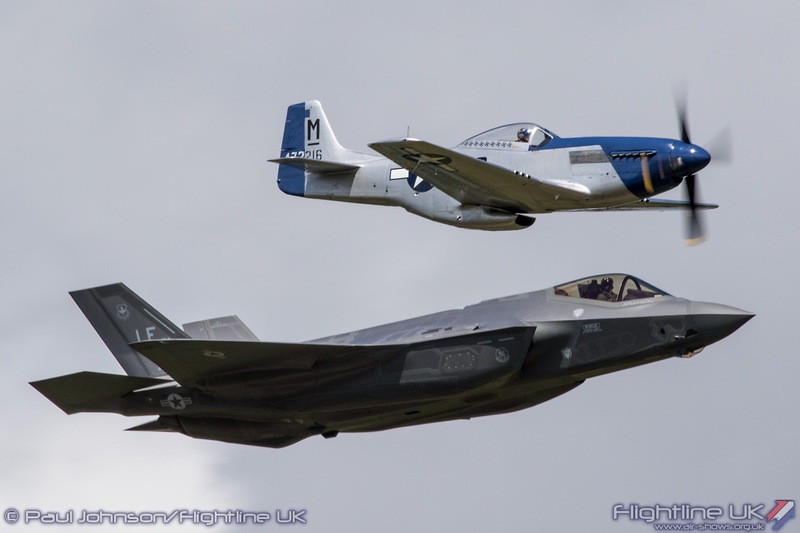 Sunday however did see the Mustang make it to Fairford in the hands of Dan Friedkin. 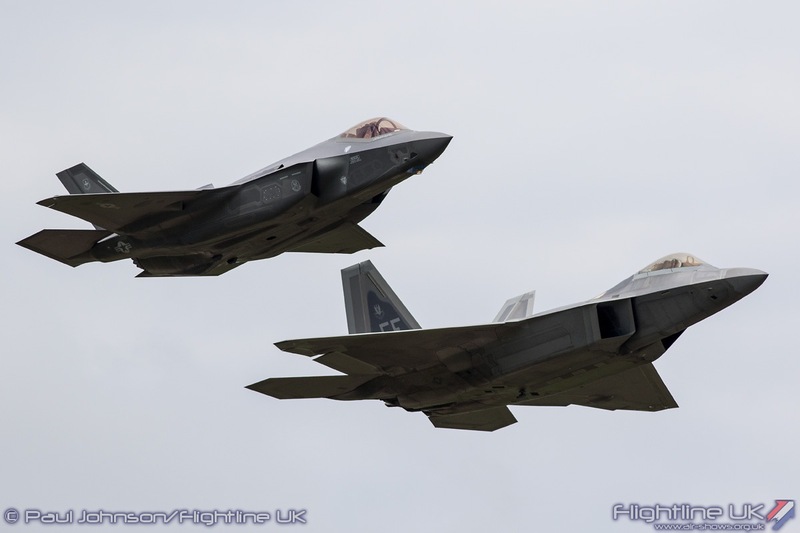 Sadly on this occasion the F-22 suffered technical issues so it left to just the F-35A and P-51D to flying the Heritage Flight routine fittingly marking over 70 years of fighter development. 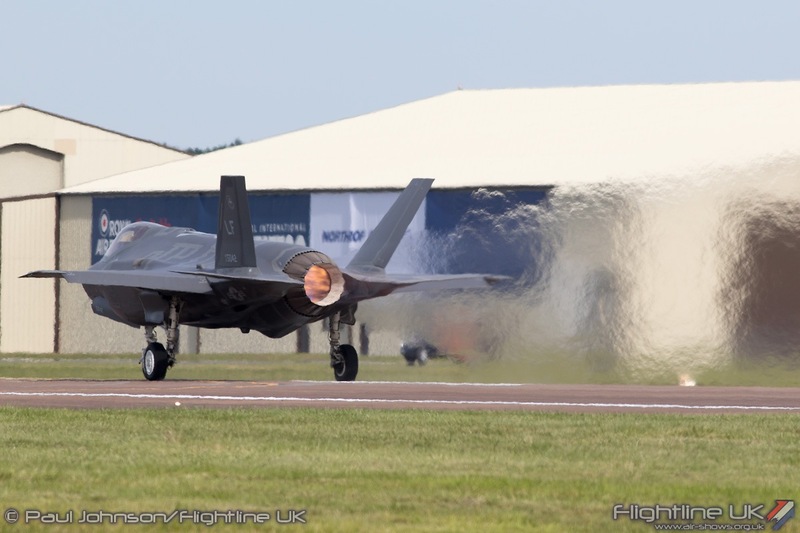 Most important to the UK however is the F-35B which provided the headline set-piece of the whole Air Tattoo display. 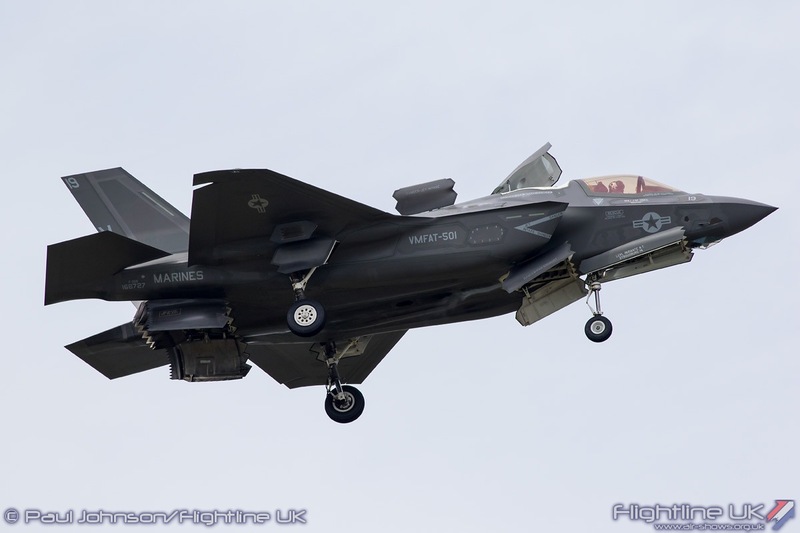 All the aircraft came from the USMC operational unit VMFAT-501 based at MCAS Beaufort with further support from the USMC testing unit, VMX-1. 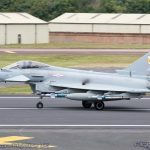 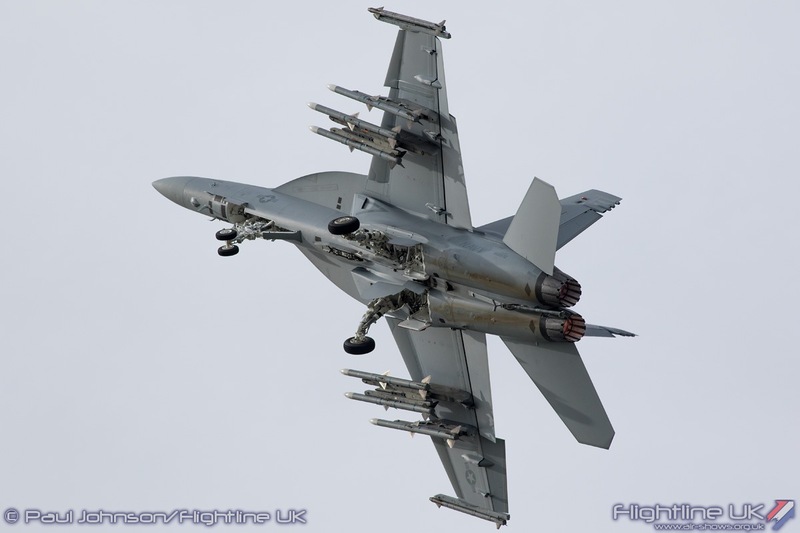 VMFAT-501 has RAF and Royal Navy personnel embedded within it plus one UK Machine (BK-3) to learn with the Marine Corps how to maintain and operate the new fighters. 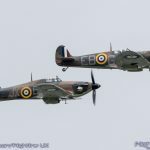 Displaying the aircraft in the air were Sqn Ldr Hugh Nichols (RAF) and Lt. Col Richard Rusnok (USMC) who shared the flying duties throughout RIAT and Farnborough. 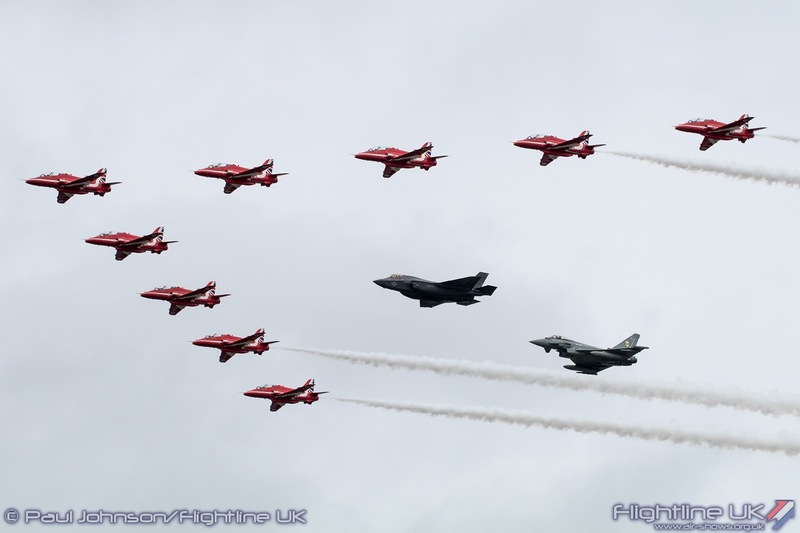 Opening the F-35B Lighting II set-piece was a special Royal Air Force formation which saw the Red Arrows leading a formation of F-35B and two Typhoon FGR4s from No 1[F] Squadron. 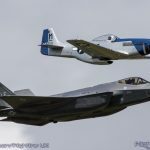 Like the USAF Heritage Flight, this was a memorable public showing of the RAF’s future air power capabilities for the decades ahead. 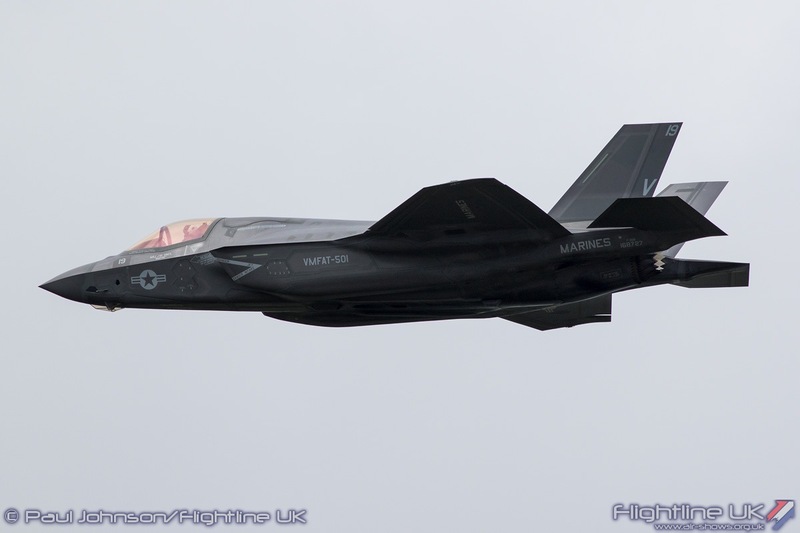 Flypast complete, the F-35B returned for its role demonstration. 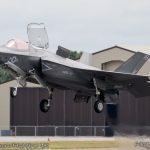 Almost all in-service F-35s are still flying with interim software, so the routine was slightly restricted. 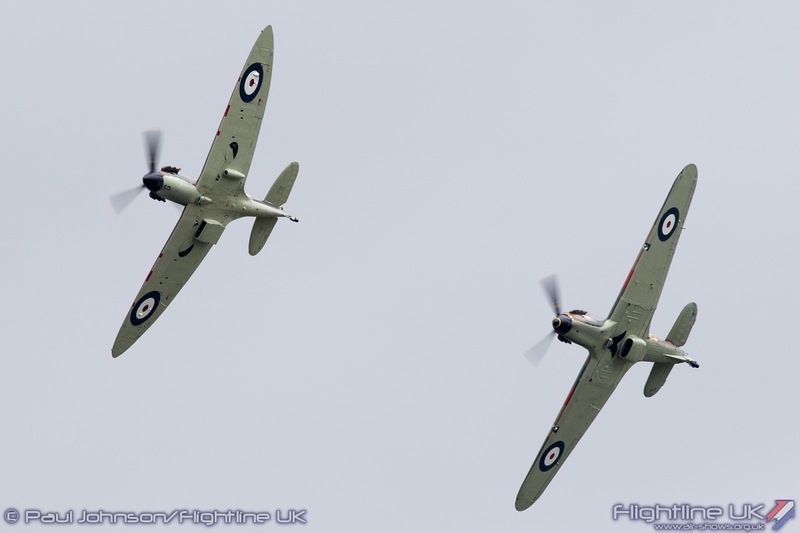 Both pilots also flew exactly the same profile on all days. 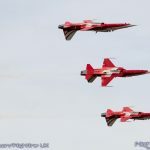 It opened with two high speed runs up and down the crowdline before high speed 360° turn at crowd centre and a slower speed curving pass to show the top surfaces of the aircraft off ahead of the real party-piece of the display = hovering! 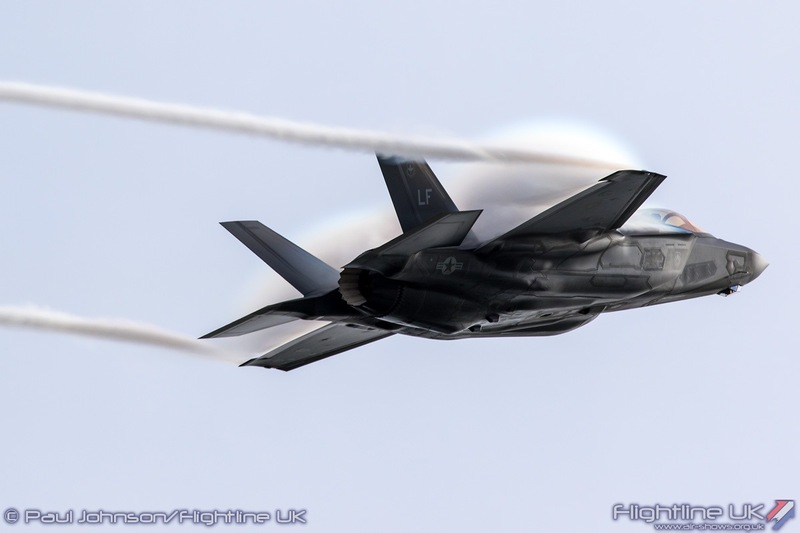 The F-35B is regarded as the pinnacle of the whole program as it is the first jet to bring together Short Take Off and Vertical Landing capability with Supersonic Flight and Stealth. 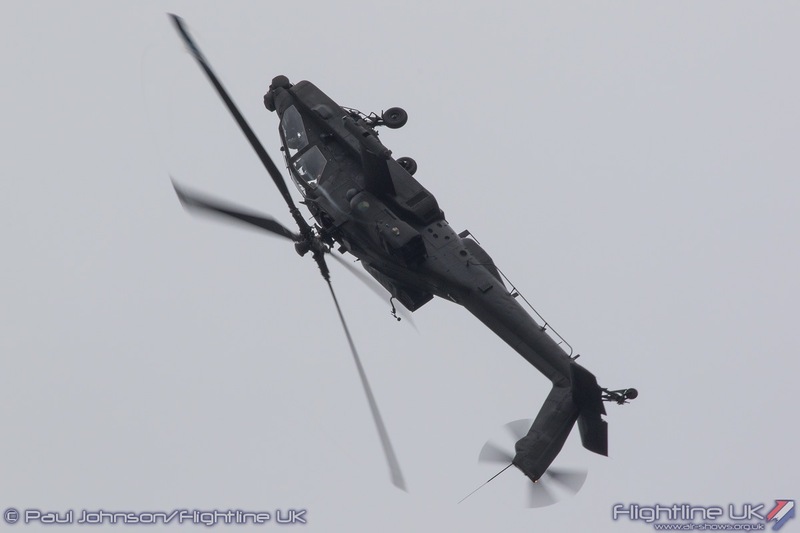 Therefore, to see this aircraft hover is just a bit special. 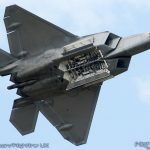 With all the doors opening, it looks an incredibly complex process but it is a simple one of the pilot. 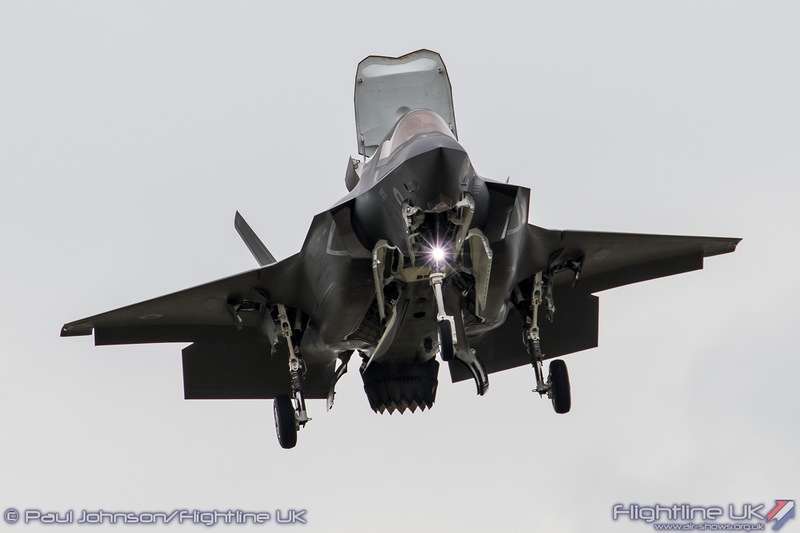 In the Harrier, hovering was an intensive time for the pilot juggling nozzle levers, throttles and the controls but the F-35B has automated almost everything. 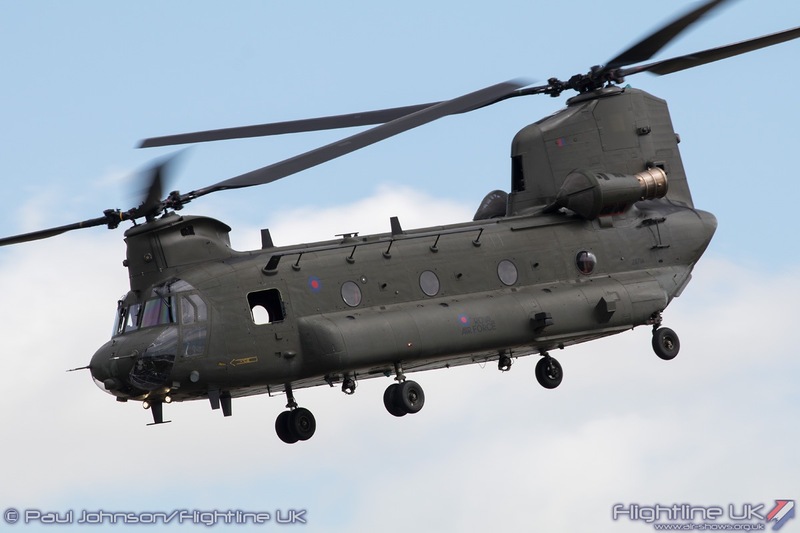 The result is an amazingly stable hover. 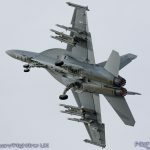 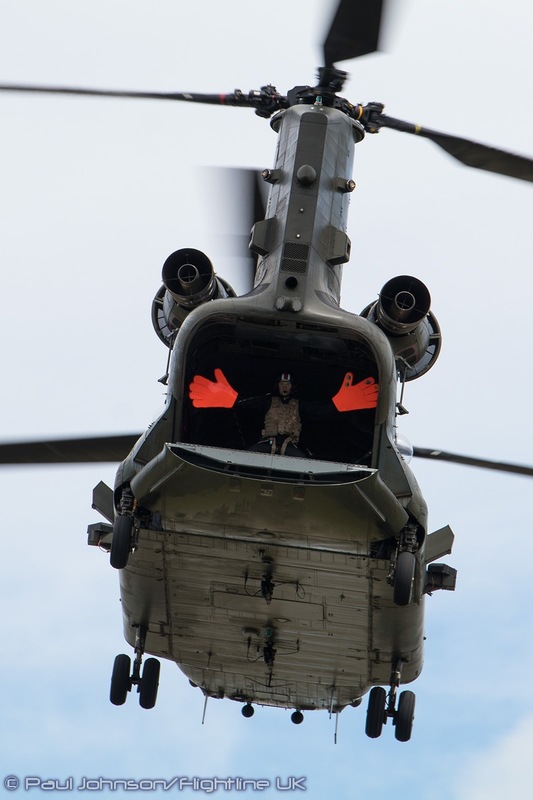 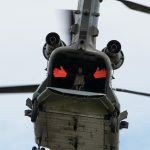 Also demonstrated at RIAT was the Vertical landing capability thanks to the special pad constructed by the US Marines and Royal Engineers on Fairford’s northside. 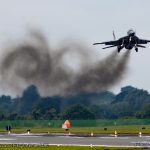 During the rehearsals on Wednesday before the show, the landings caused one enormous dust storm which “FOD’ed” and closed the runway and taxiway for 30 minutes afterwards! 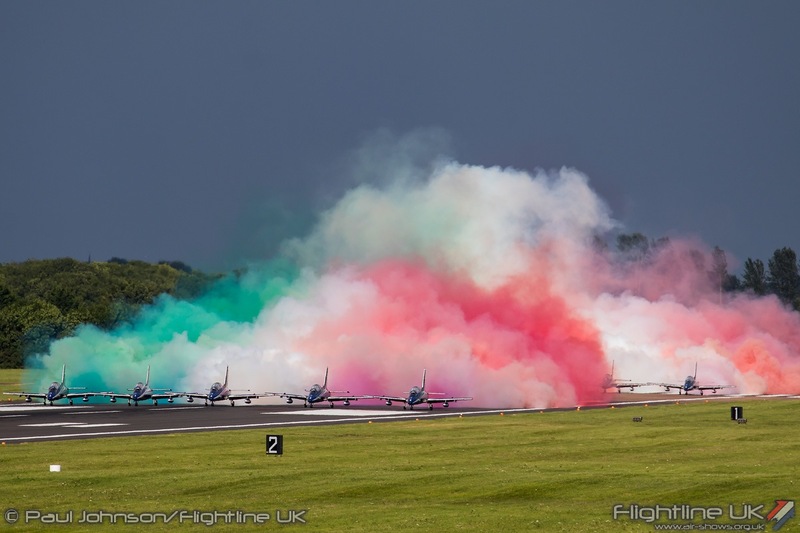 For the show days, fire crews soaked the ground around the pad to ensure there wasn’t a repeat! 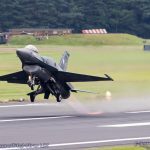 Like the hover, the aircraft just looked so stable landing on the pad and provided a fantastic finale to its debut display. 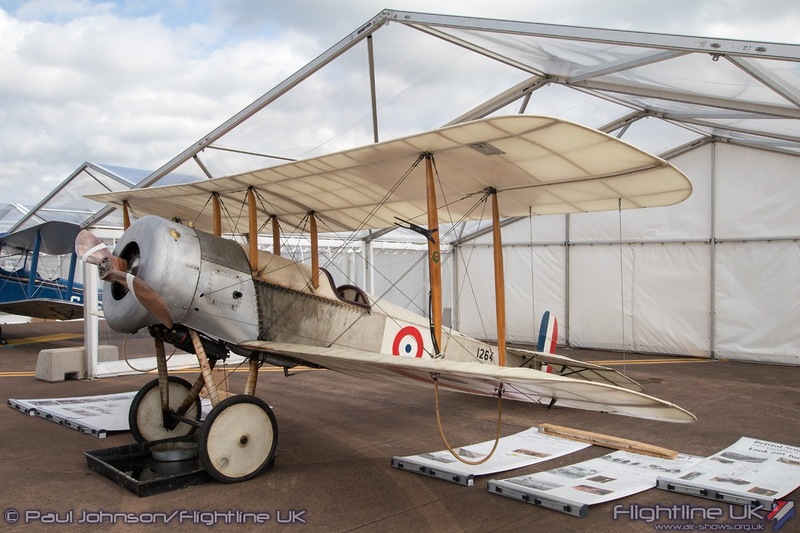 The display certainly impressed and did a great deal to promote the aircraft to the UK public. 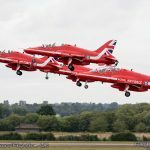 The Royal International Air Tattoo 2016 will certainly go down in the record books as one of the most memorable with some great flying and entertainment on the ground. 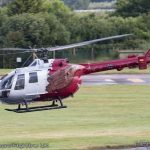 After the show Andy Armstrong said: “Our 2,000-plus volunteers and small team of permanent staff deserve a huge pat on the back for delivering such an outstanding event. 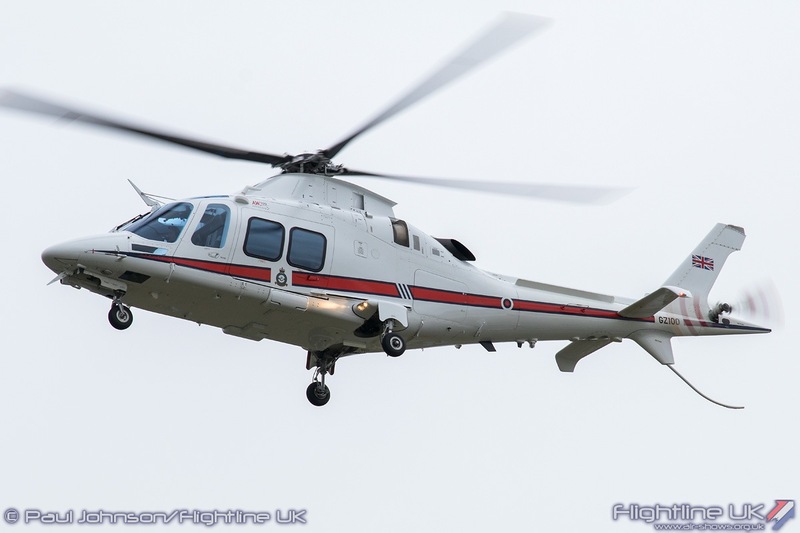 The icing on the cake was the visit on Friday by the Duke and Duchess of Cambridge and their son Prince George. 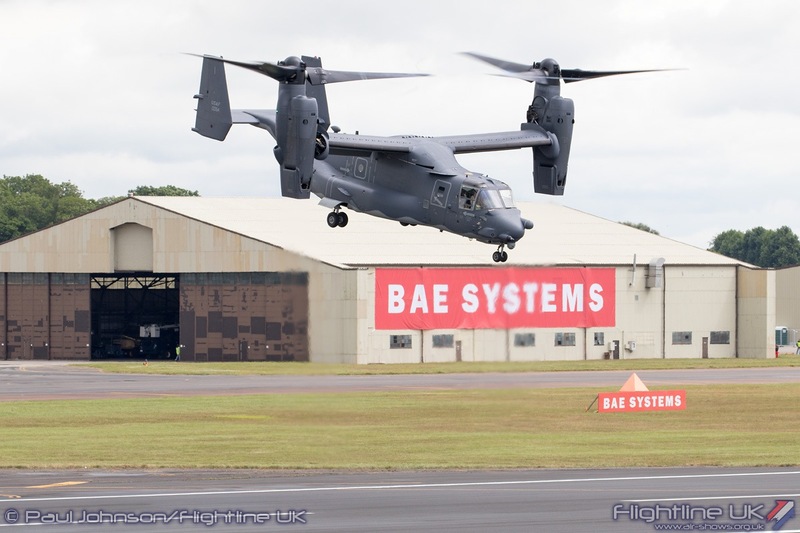 My thanks go to all our sponsors, in particular BAE Systems and all the participating air arms including the US Air Force, who allow us to stage the event at RAF Fairford and the Royal Air Force for all its support. 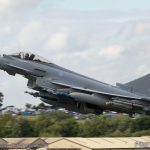 Once again, the Air Tattoo has performed an important defence diplomacy role not only in showcasing some of the world’s most exciting aircraft but also by offering the RAF a platform on which to demonstrate its current – and future – capabilities. 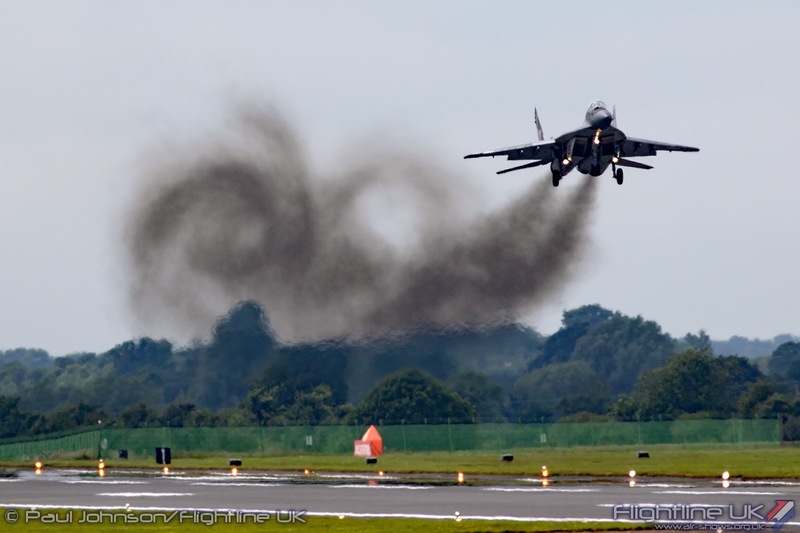 Certainly we can agree with all that even if there were a few niggles and hiccups here and there. 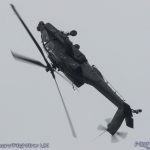 Traffic was an issue on the Sunday evening thanks to an accident on the M4, the lack of UK military helicopters because of Joint Helicopter Command’s bizarre attitude to airshows and perhaps eight flying displays conducted by just two aircraft types may have felt a little repetitive by Sunday if we are being honest. 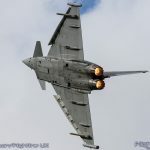 But, this really is a very well organised show that does an awful lot of good for the UK Armed Services, Charity and Industry. 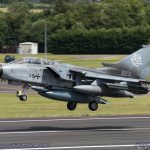 It is something the organisers, the volunteers and the public should be very proud of as there is no other event quite like the Air Tattoo.